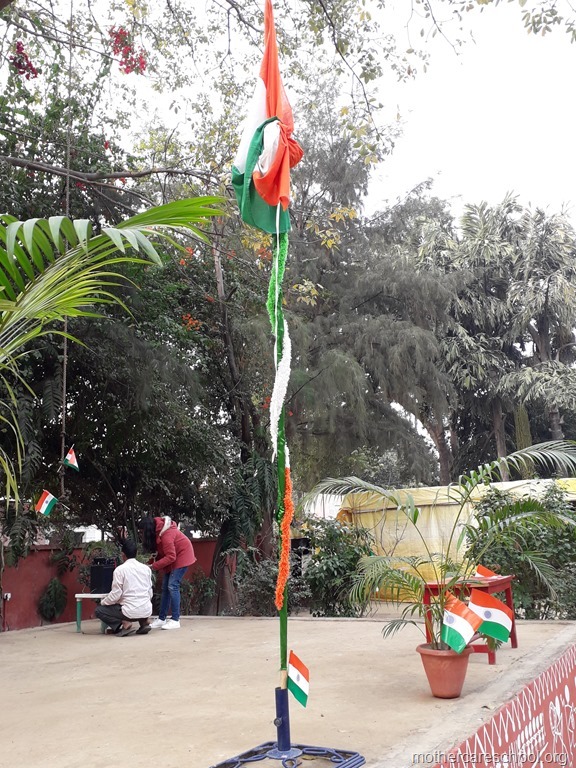 Sector C, Aliganj, Next to Aliganj Post Office, Lucknow-226024, UP, India. 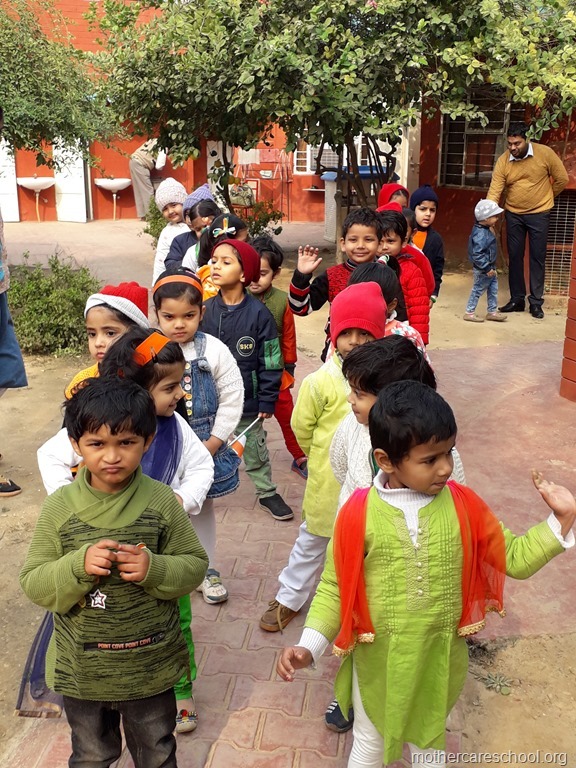 Winter 9.30 a.m. to 12.30 p.m.
Summer 8.30 a.m. to 11.30 a.m.
We as parents are very grateful to the teachers and principal in inculcating healthy habits of yoga and pranayam in our children. 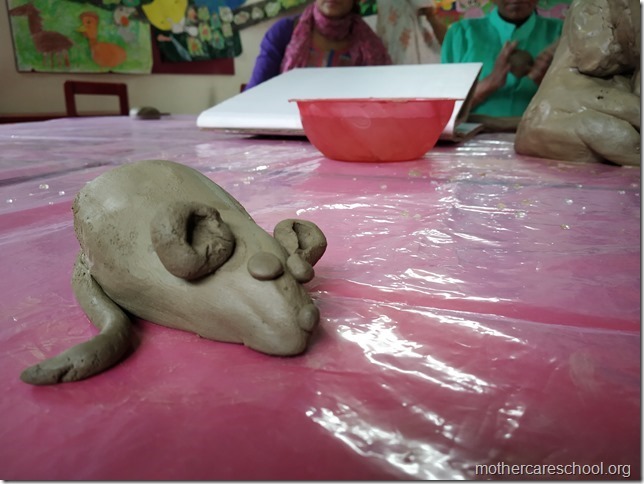 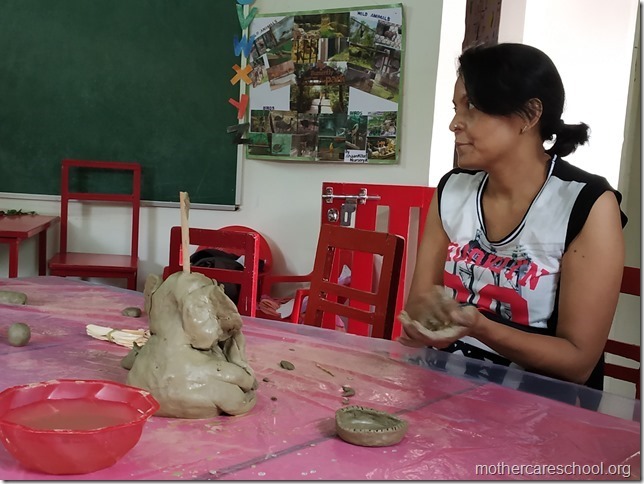 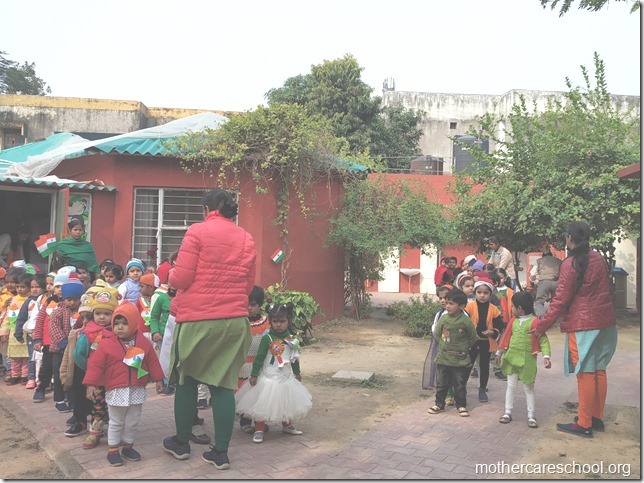 Mothercare has made a wonderful impact in my daughter's life. 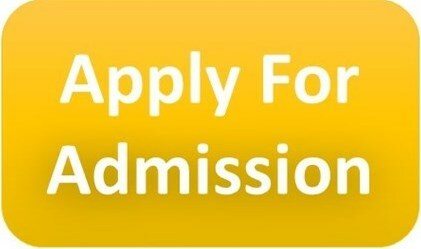 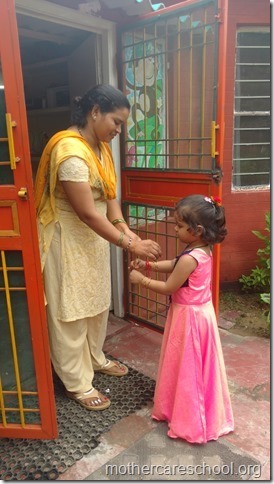 She has developed confidence and good communication skills. 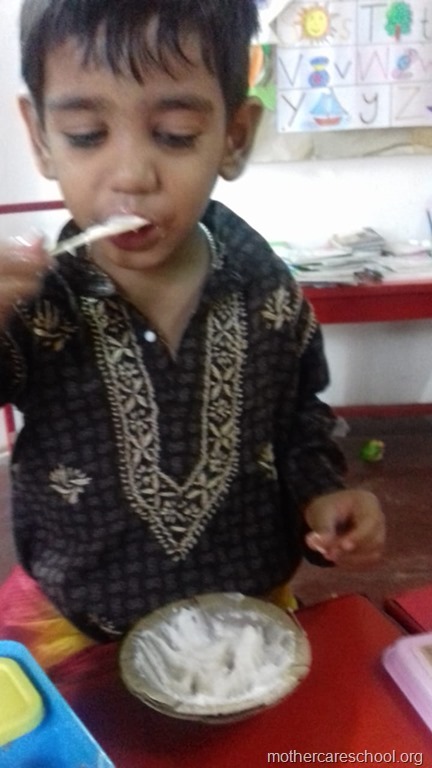 My child has developed a lot in this span of time. 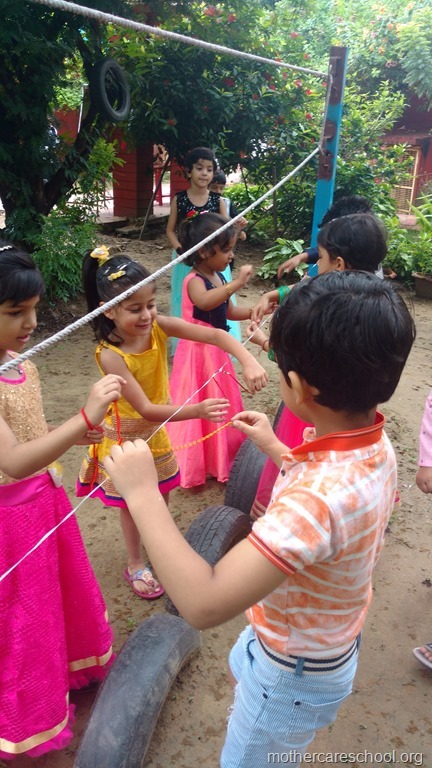 Beautiful and simple co-ordination has made learning so easy. 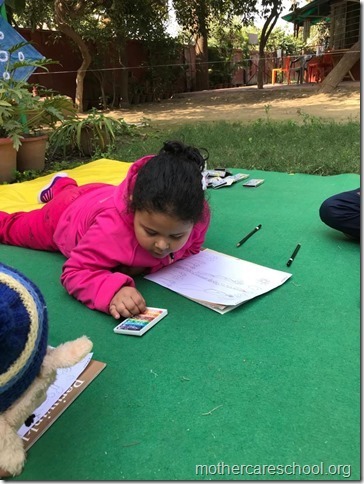 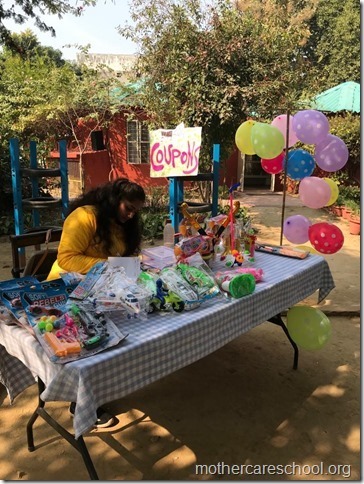 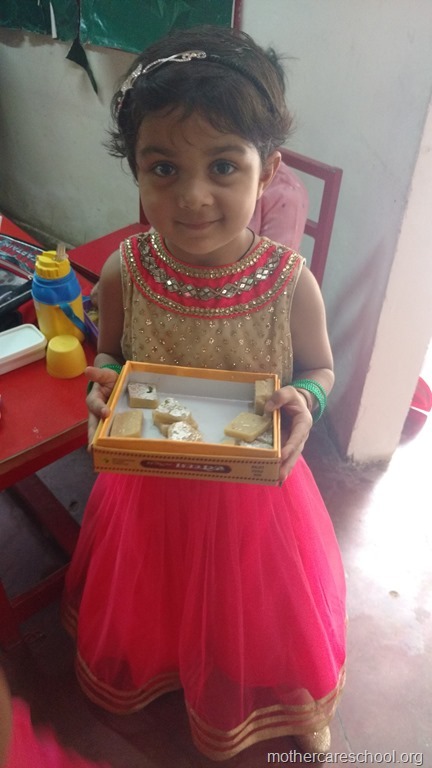 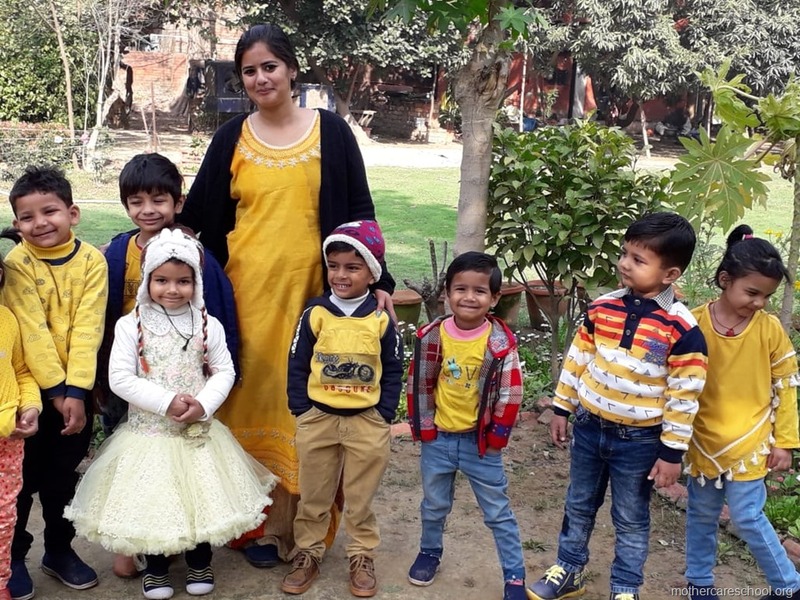 Thanks to my daughter's class teacher, Gurpreet Ma’am for her efforts and patience and for taking such good care of the children. 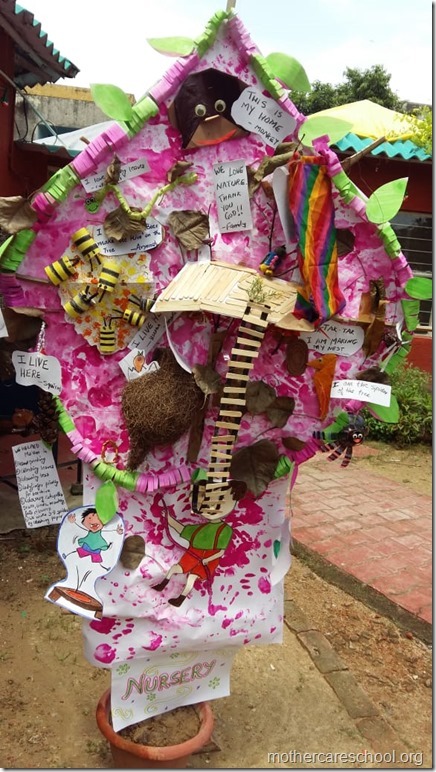 The concept based nature of the programme, I really appreciated. I want to especially thank the entire school staff. 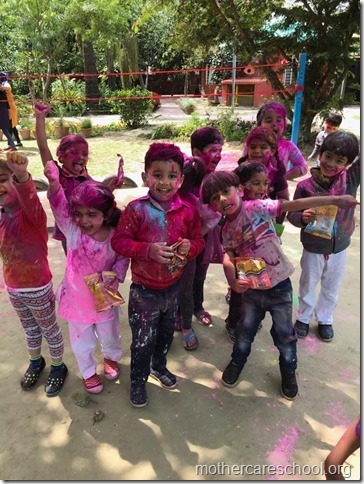 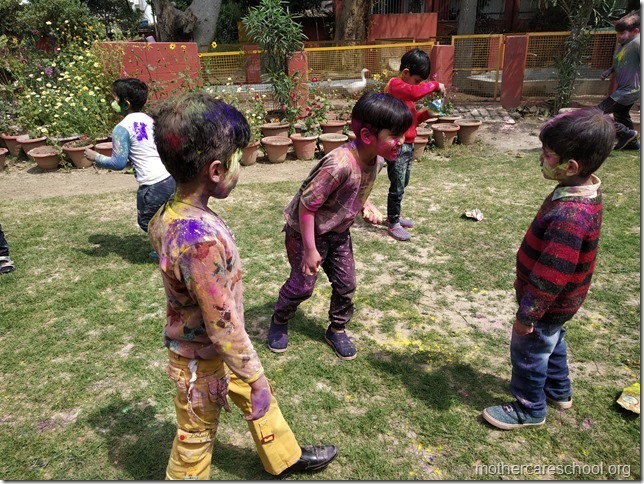 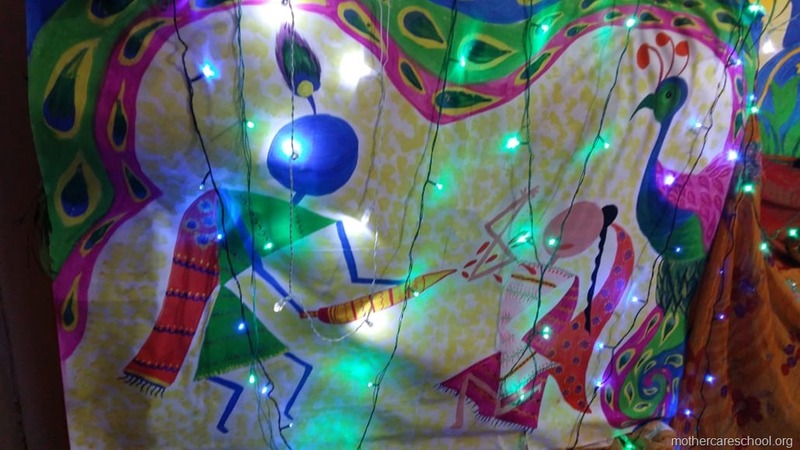 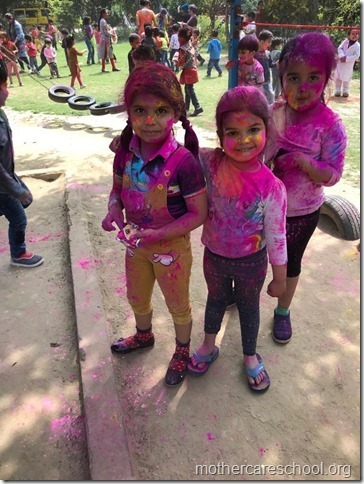 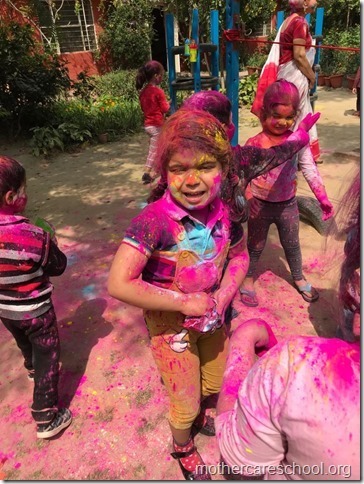 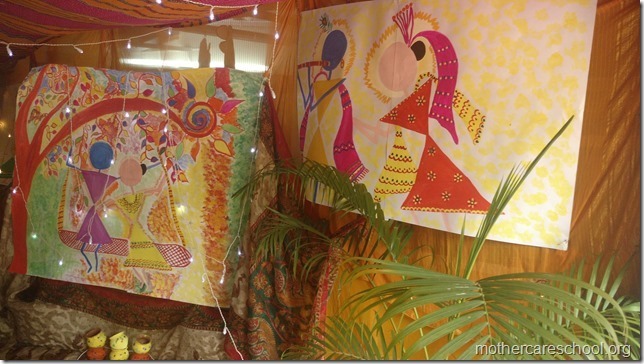 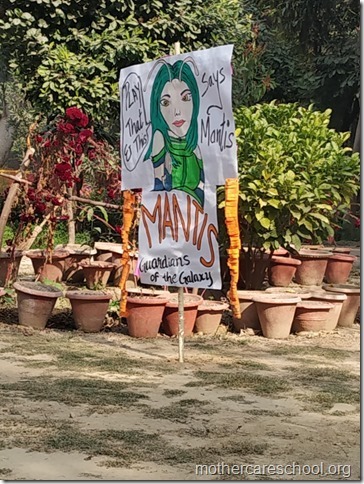 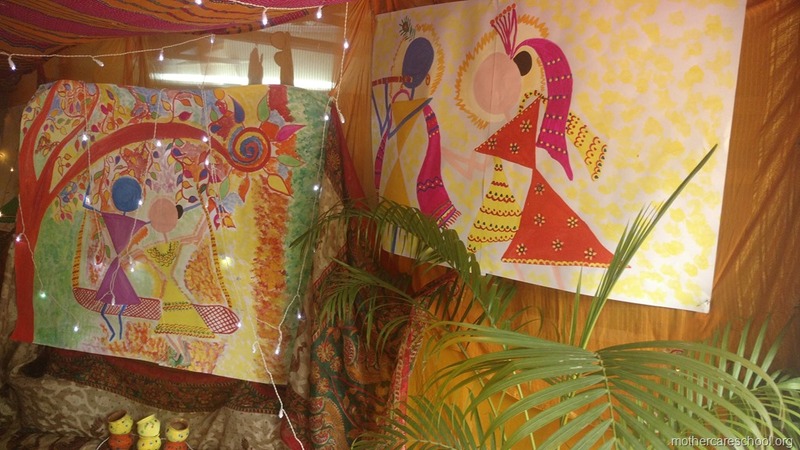 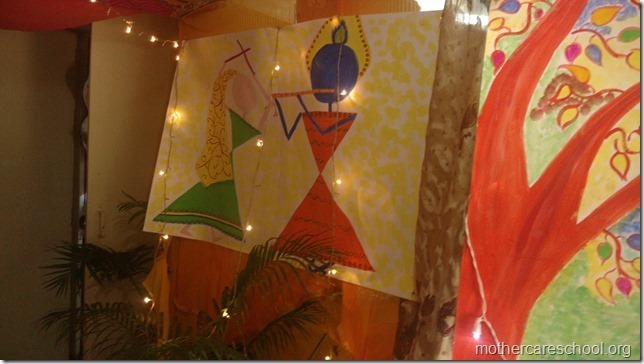 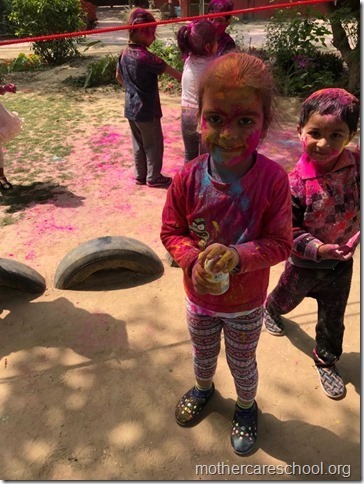 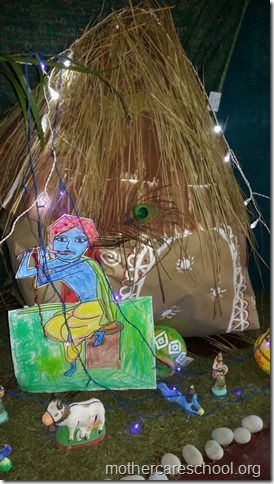 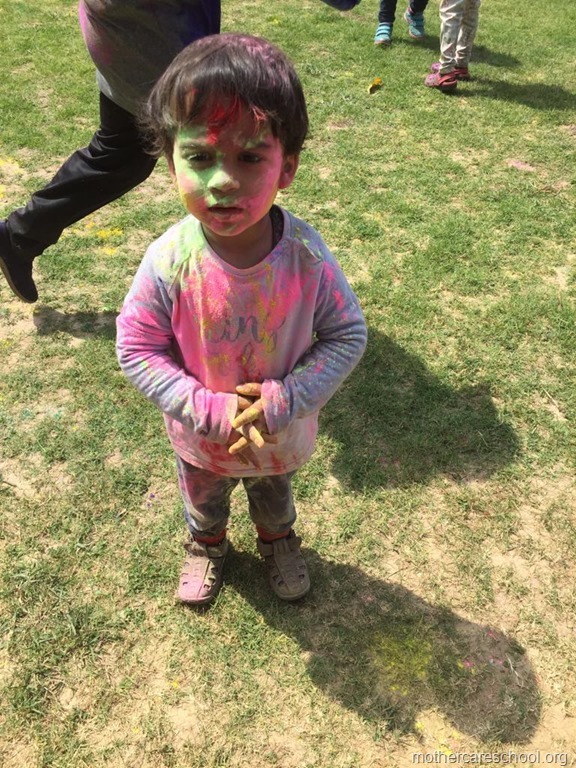 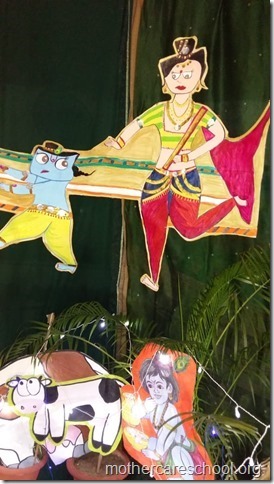 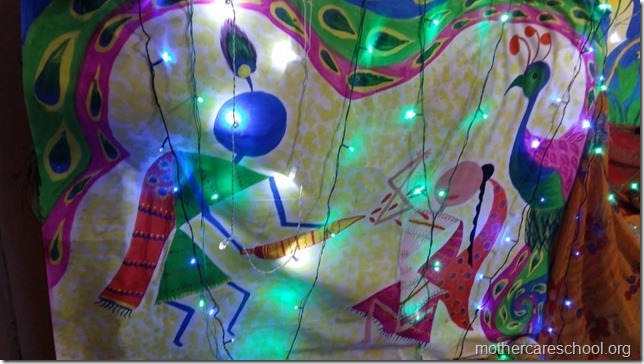 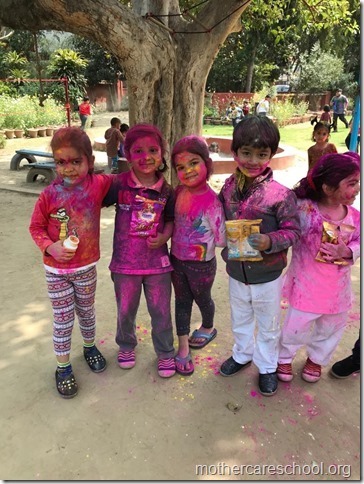 “Aayi re holi'” Get set go…. Rangat alag alag…harkat alag alag…What fun?! 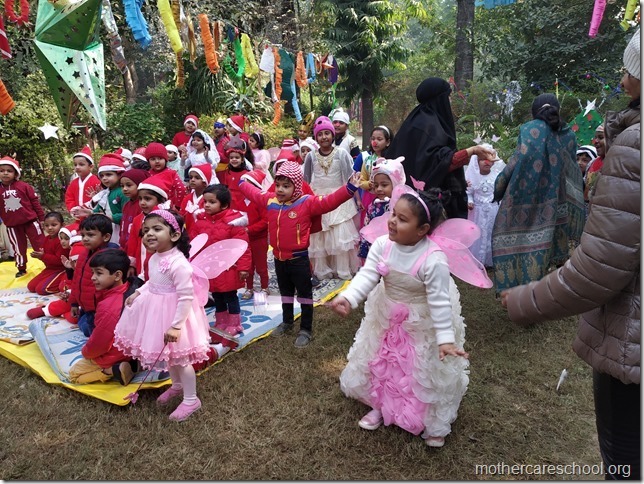 Flame of the forest in full bloom at Mothercare. 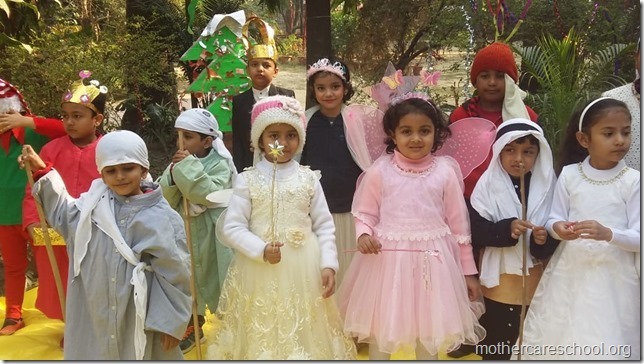 Announcing the advent of Easter at Mothercare School with two little goslings to begin with. 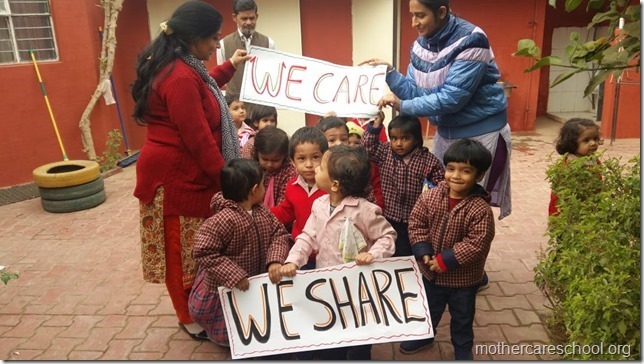 About happy family, caring, sharing, growing in a secure environment. We can express anything through our drawings. 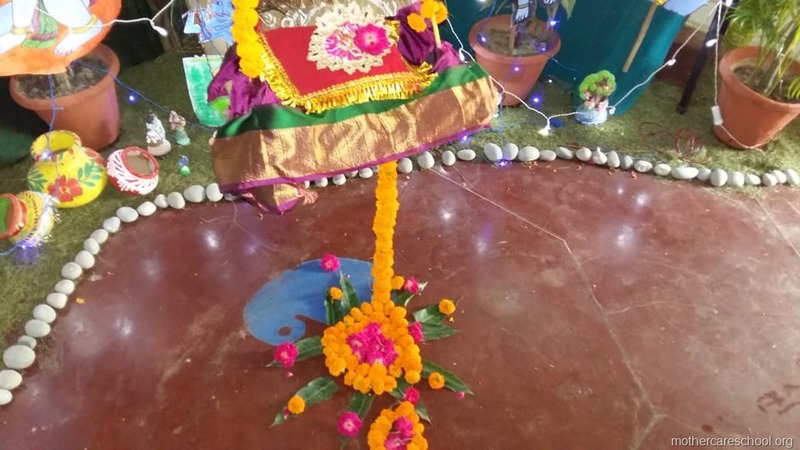 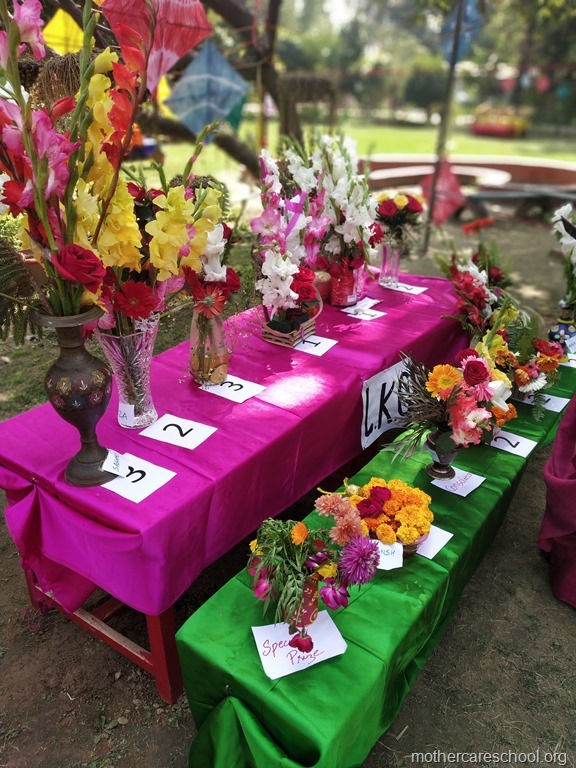 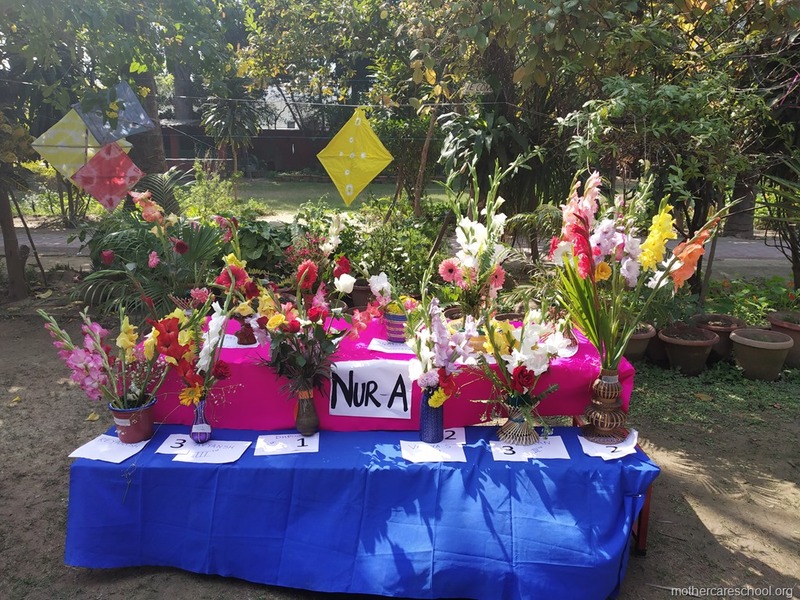 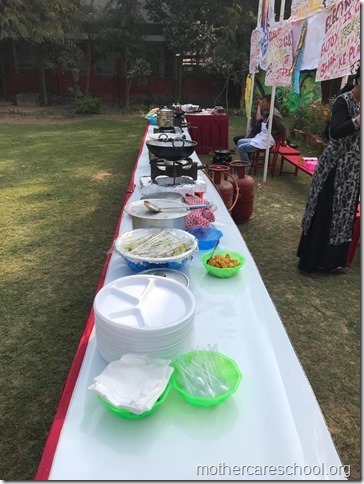 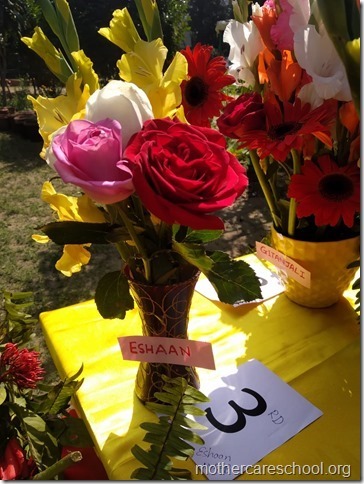 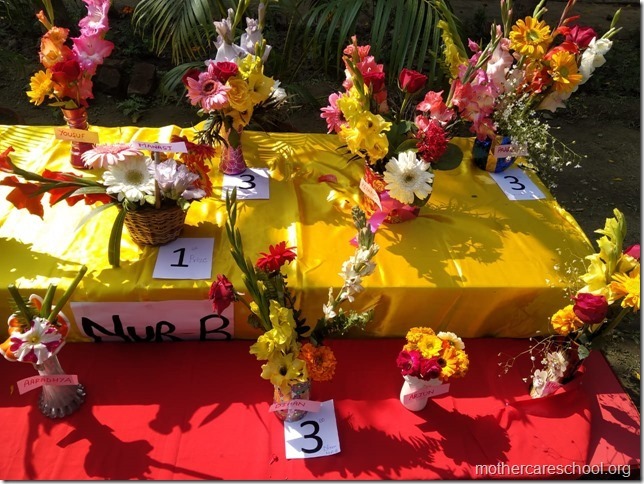 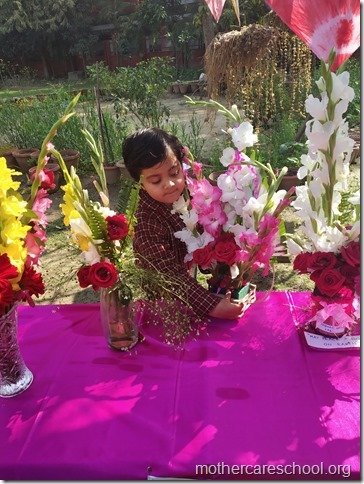 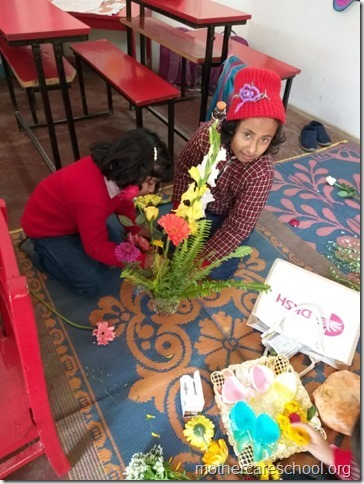 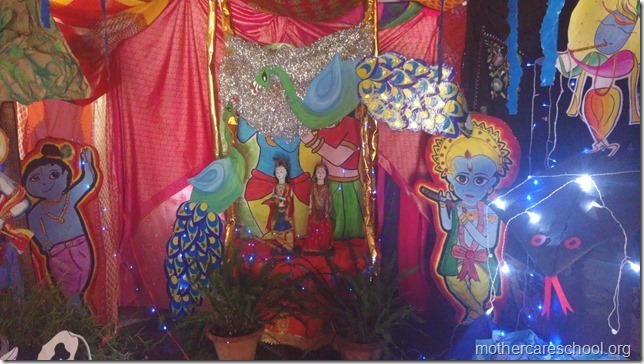 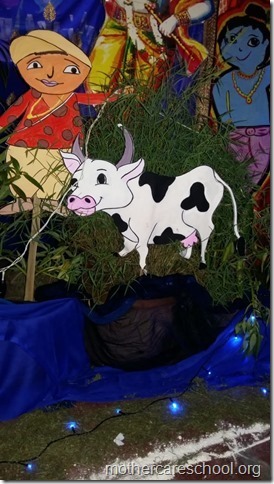 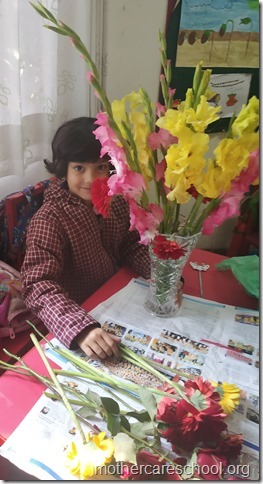 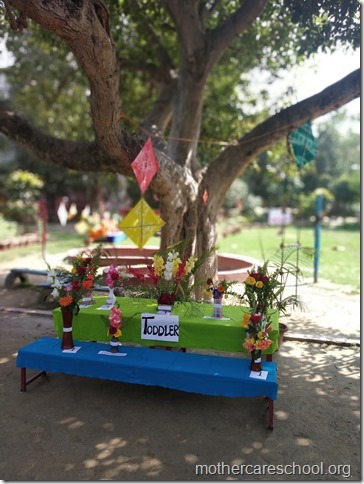 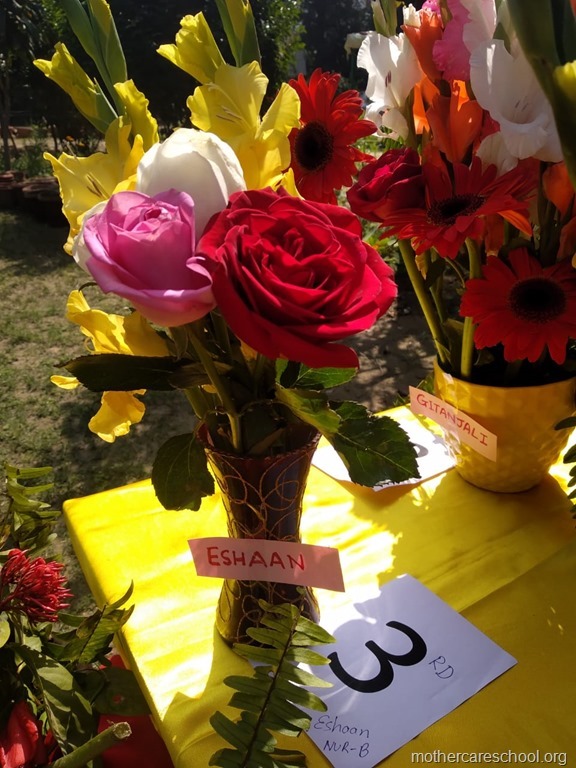 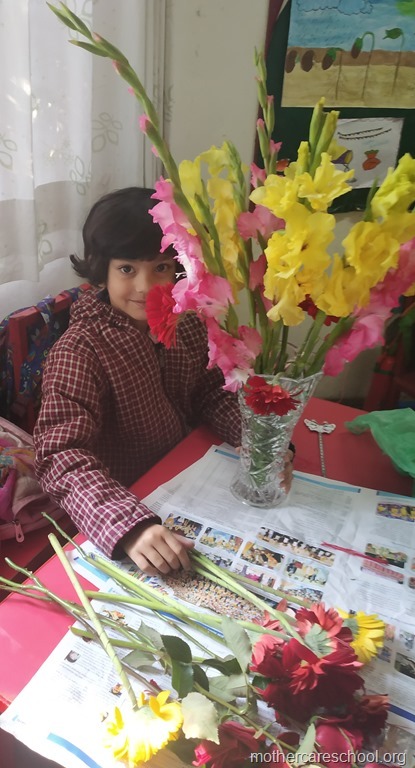 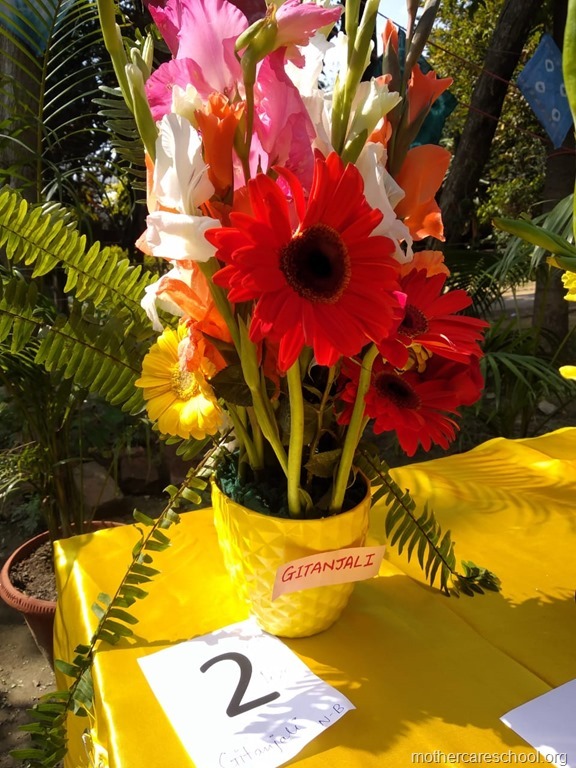 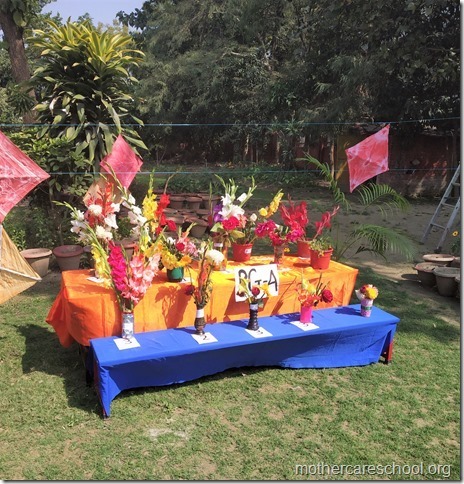 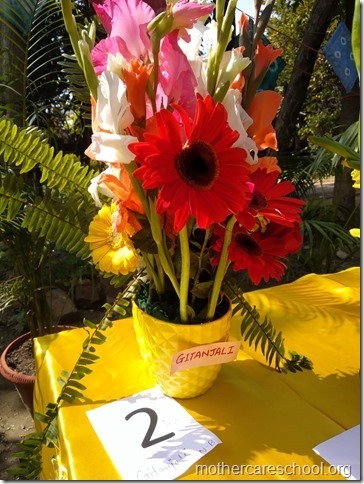 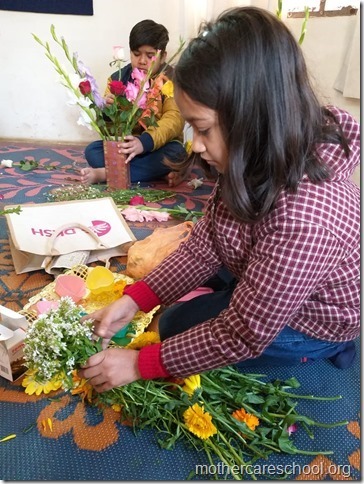 Stage set to welcome the kids flower arrangements…. 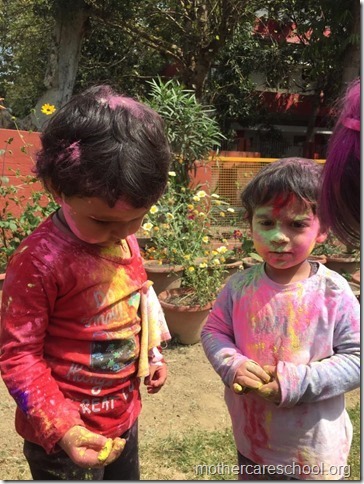 The play with colours goes on this spring…. 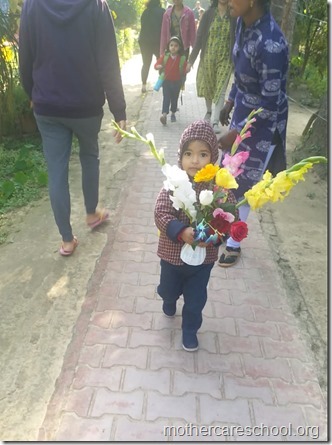 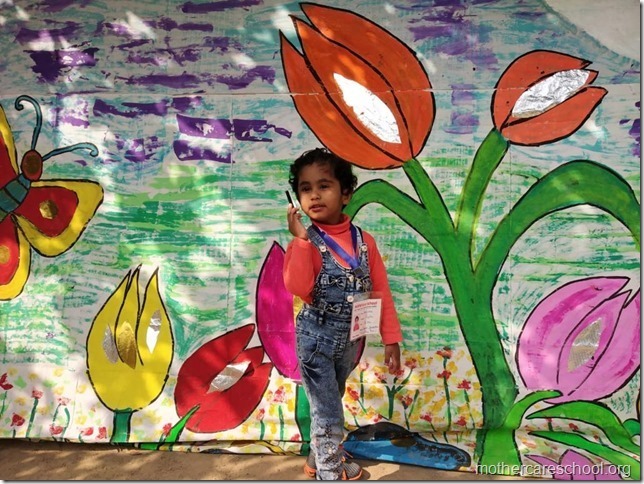 A marching we do come….a marching we do come…with an arm full of flowers…. 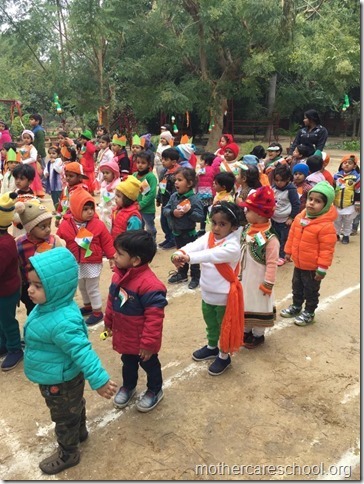 a marching we do come…! I see and I learn. 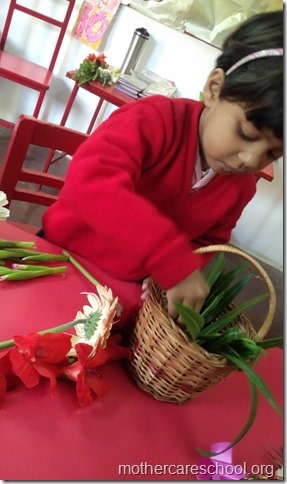 I do and I learn better! 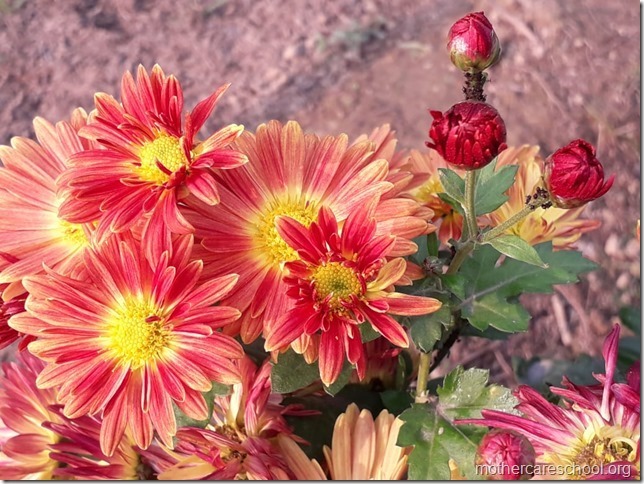 Inspired by my mamas arrangements at home…. 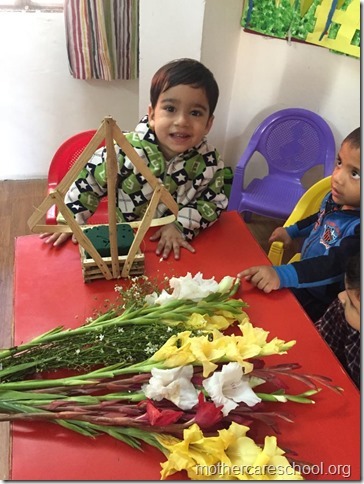 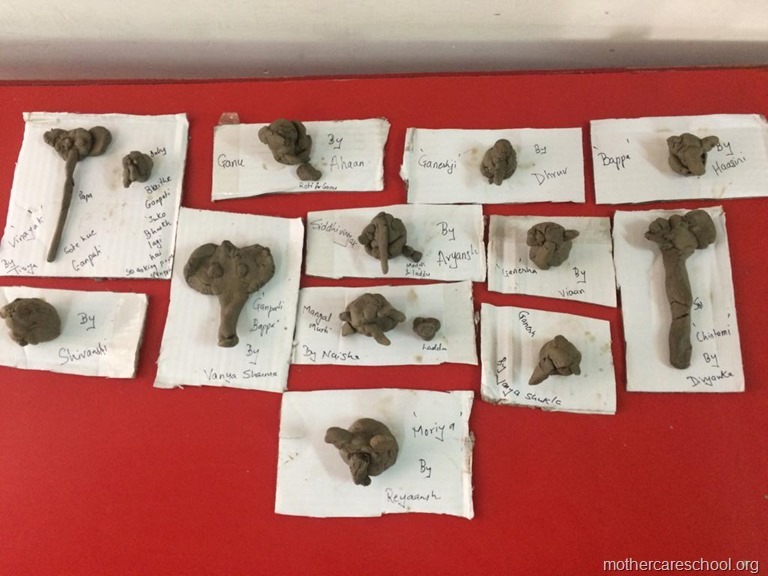 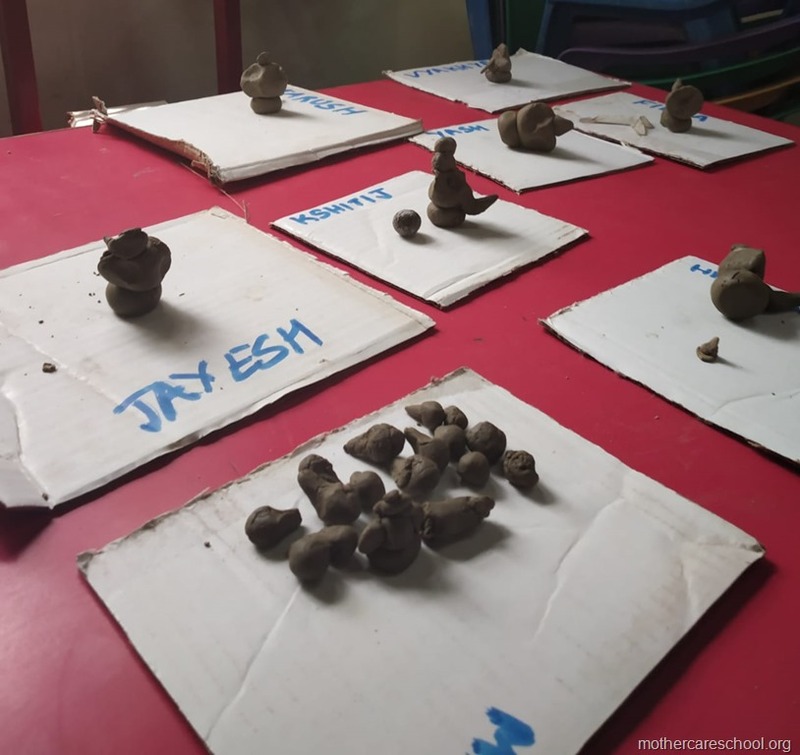 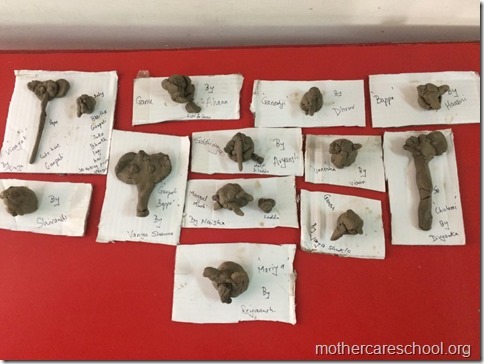 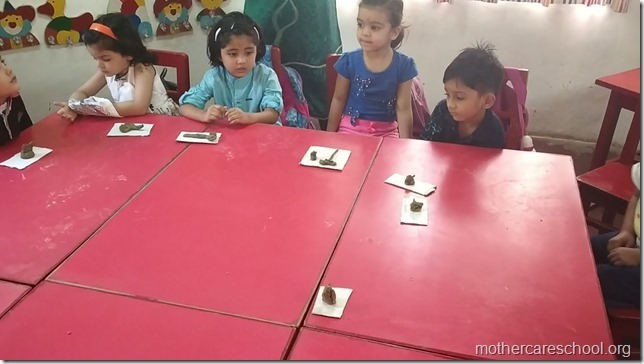 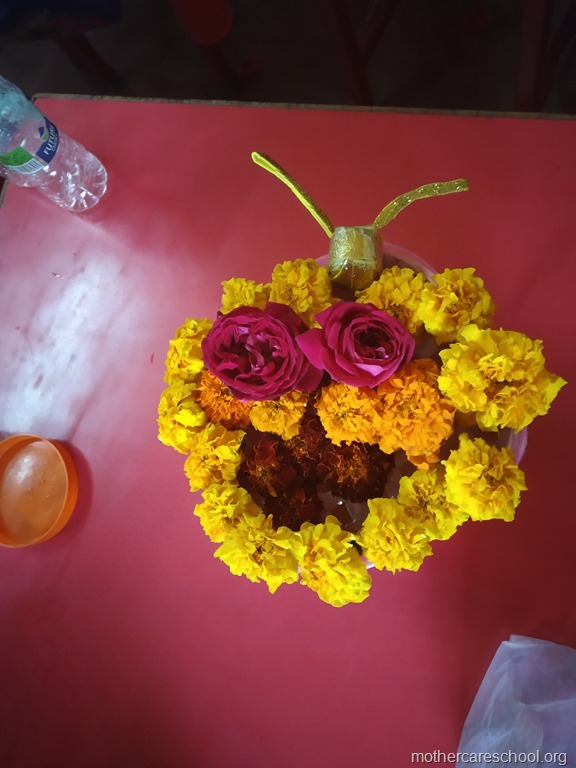 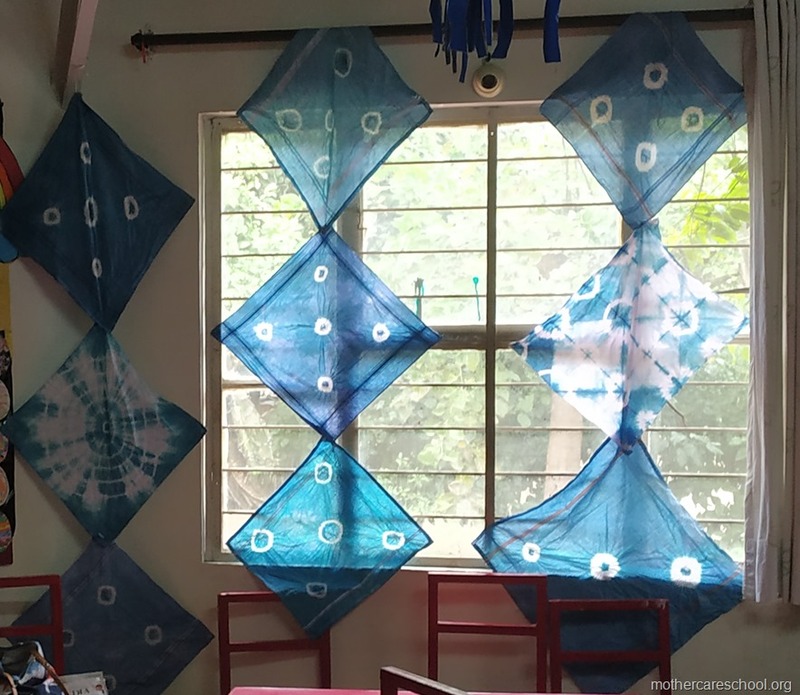 inspired by my teachers arrangements in school…. 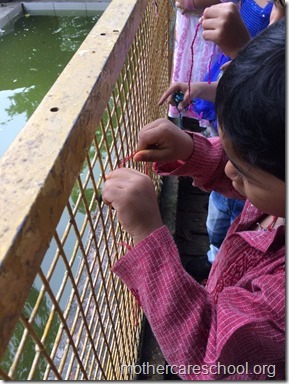 I learn by seeing, I learn by doing…. 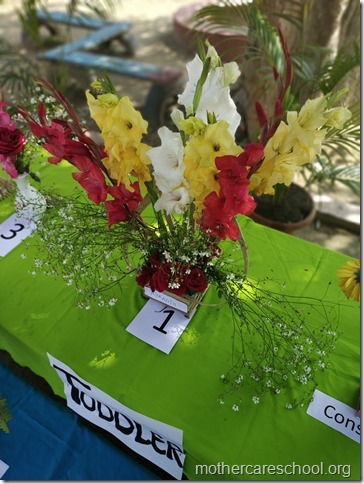 I don’t care about the first, second, third….I just had fun..
Judging sure is difficult...Shobha ma’am. 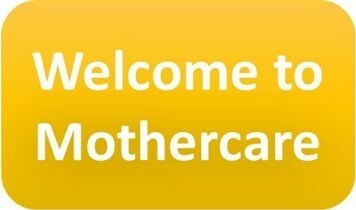 What if we’ve just joined…we are part of the Mothercare family and all its activities.. 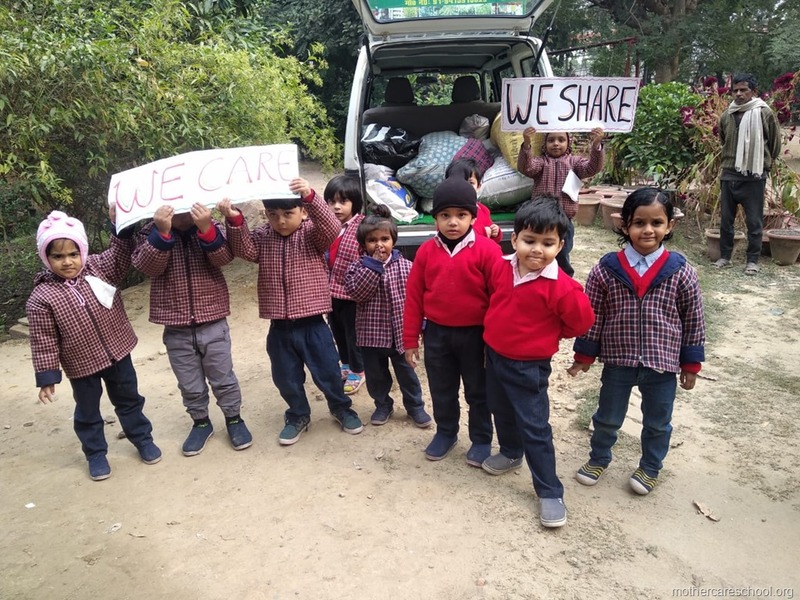 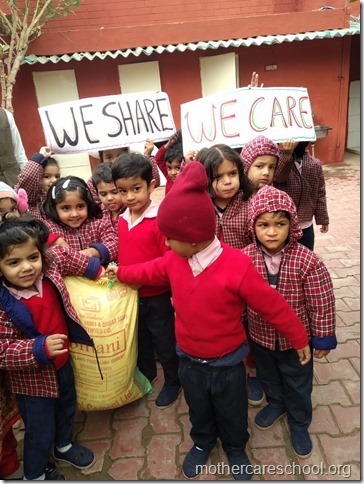 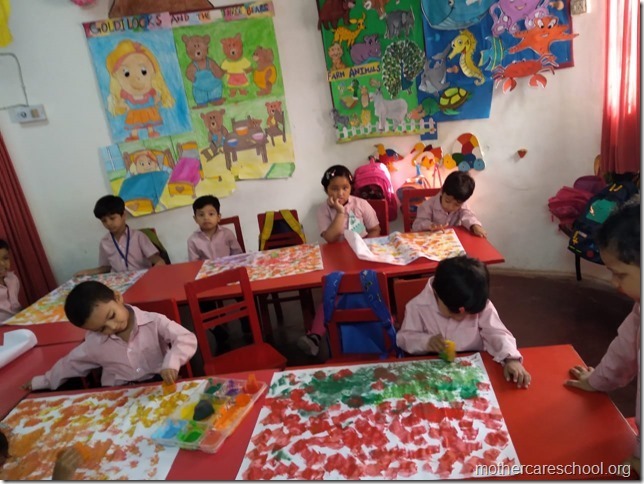 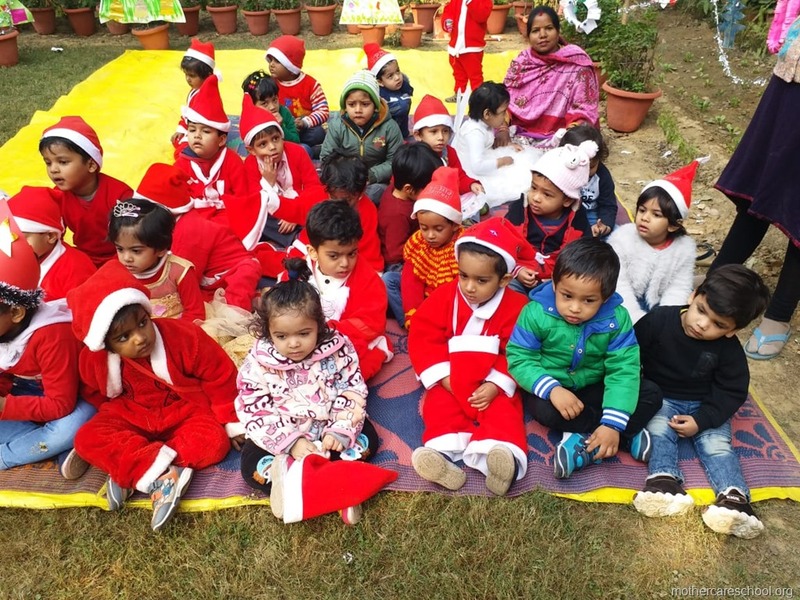 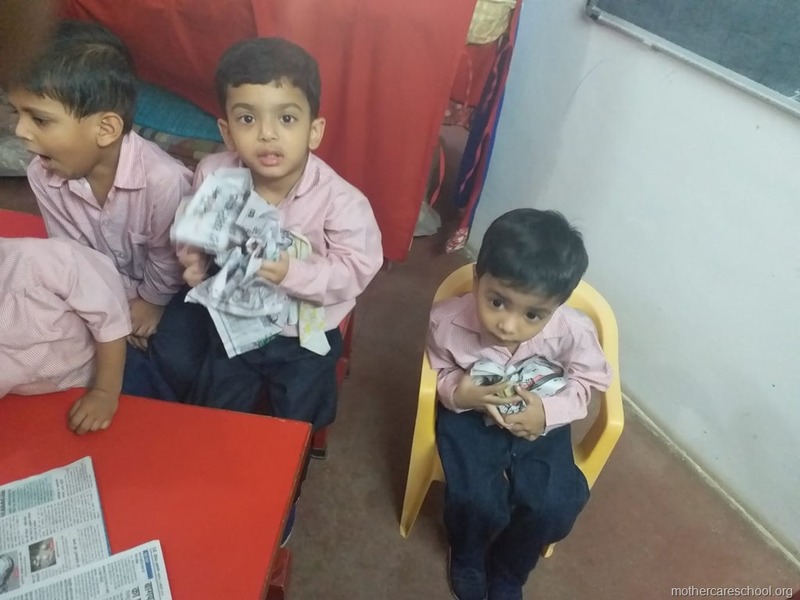 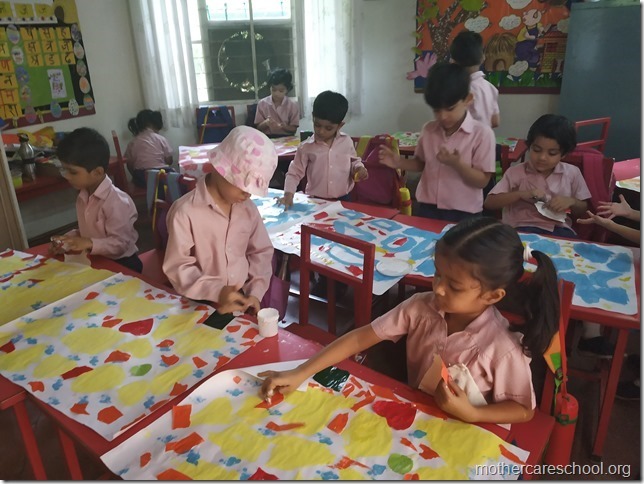 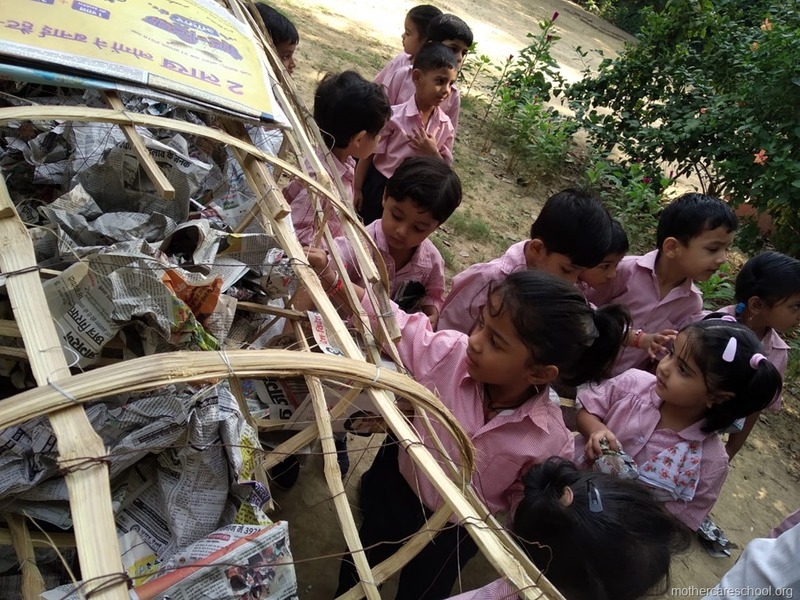 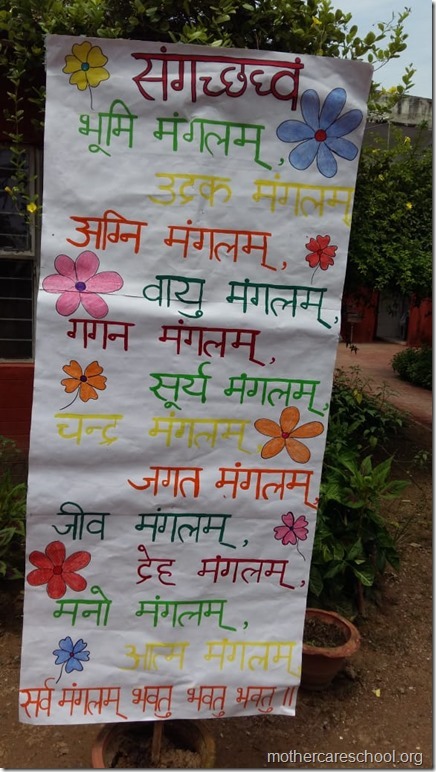 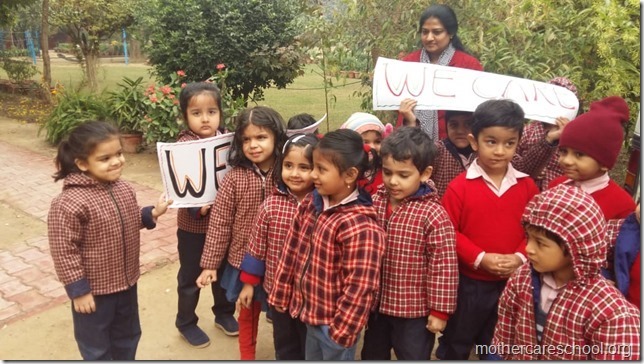 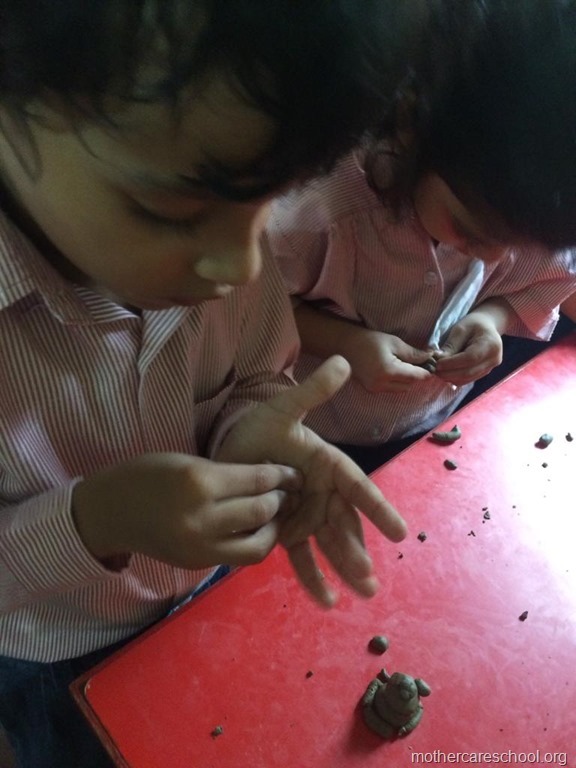 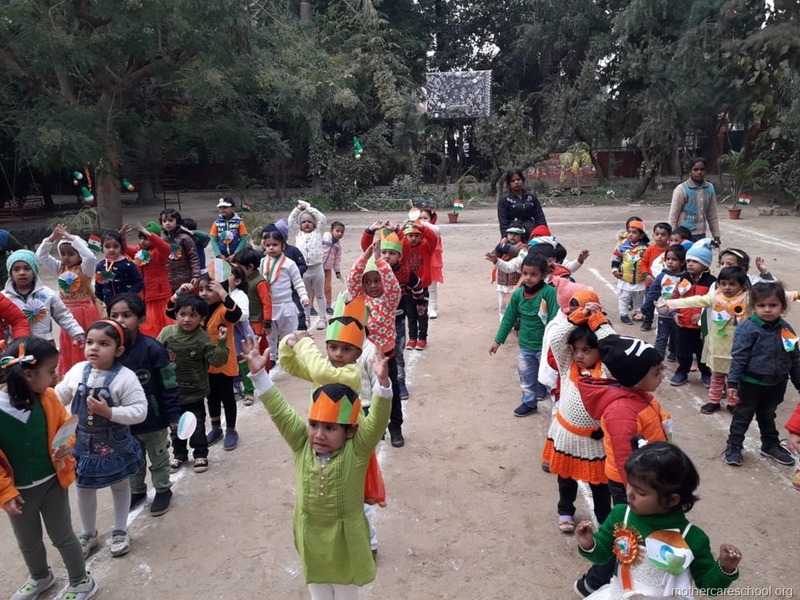 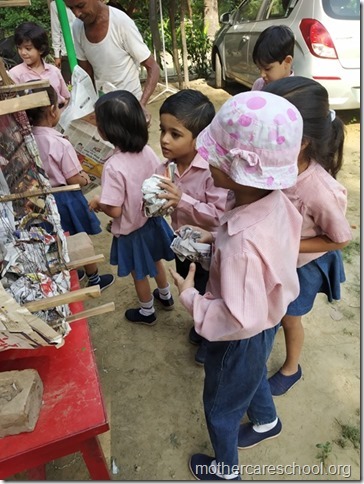 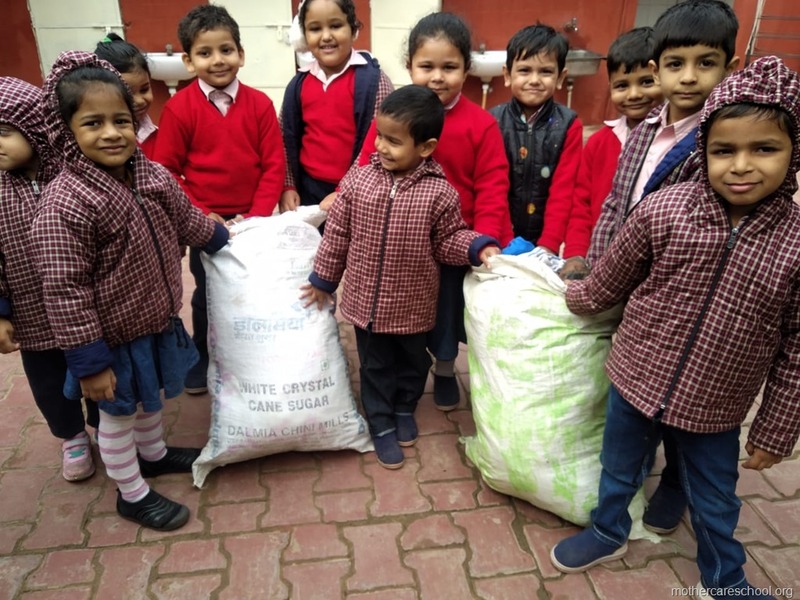 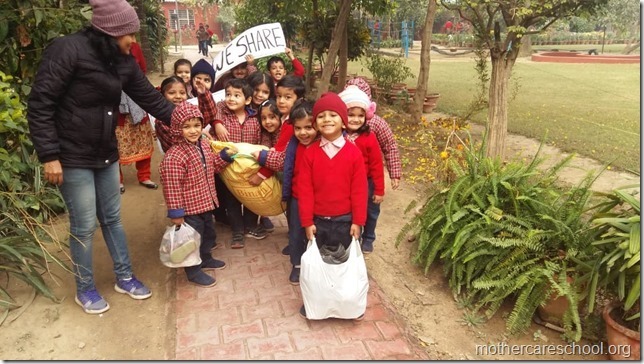 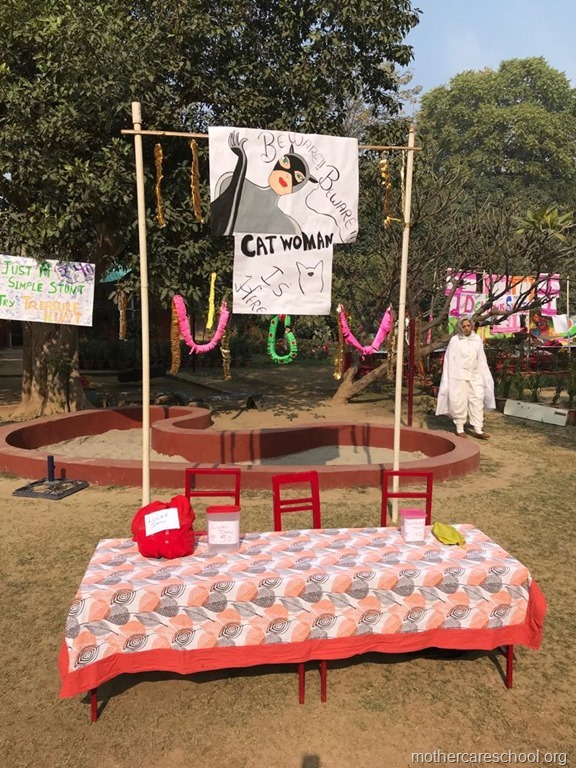 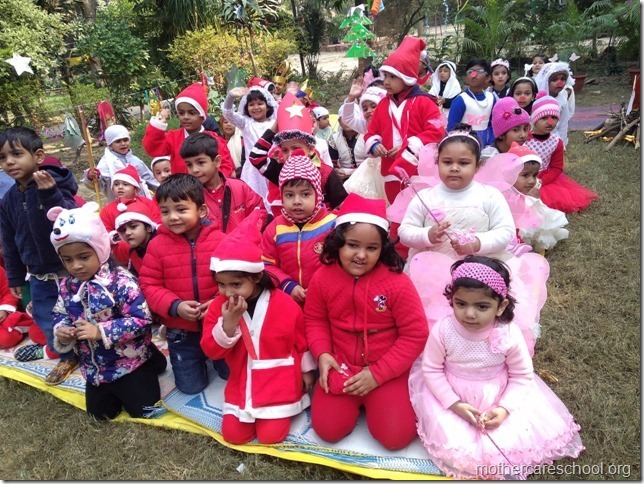 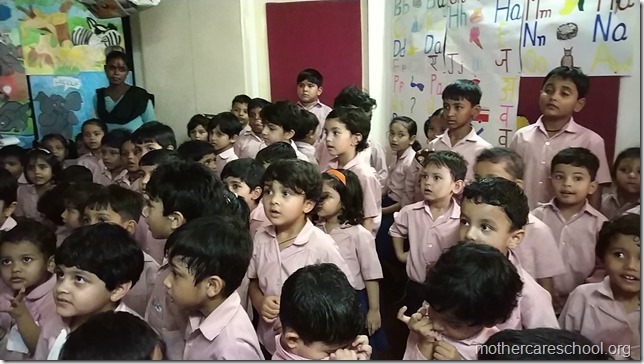 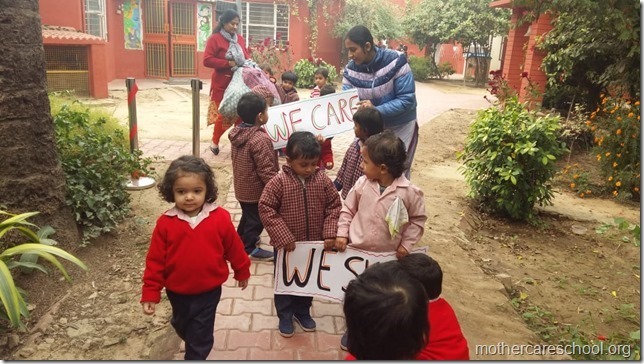 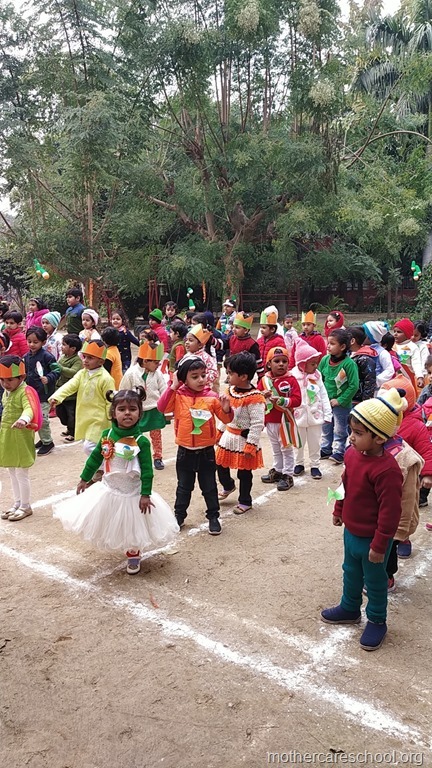 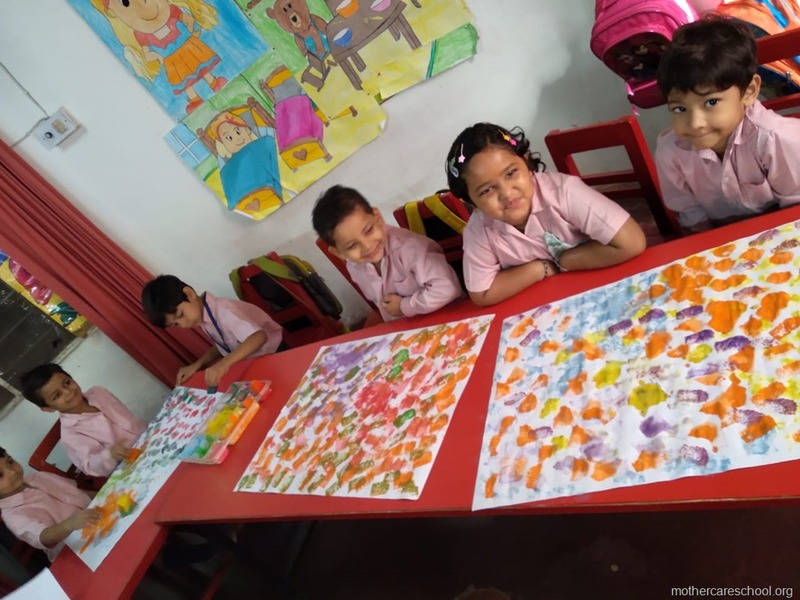 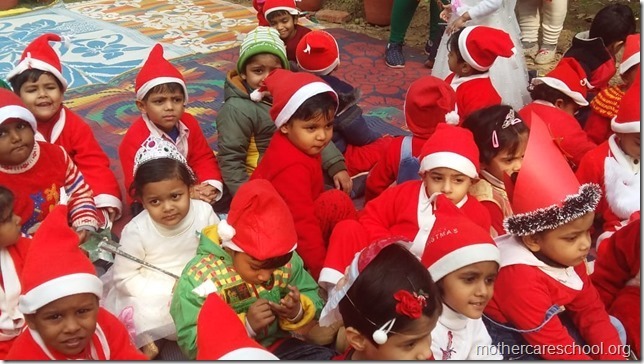 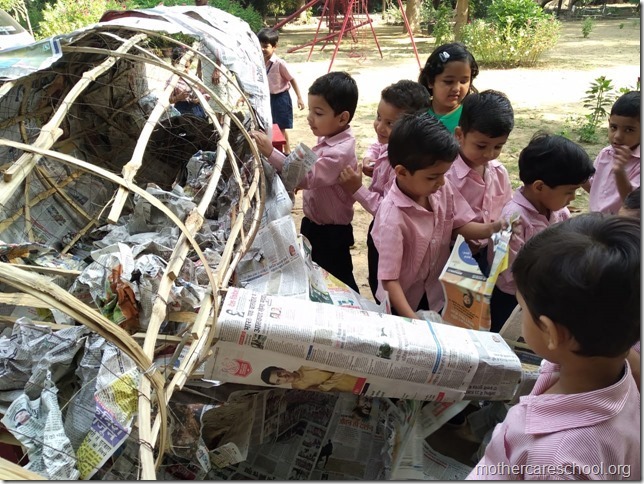 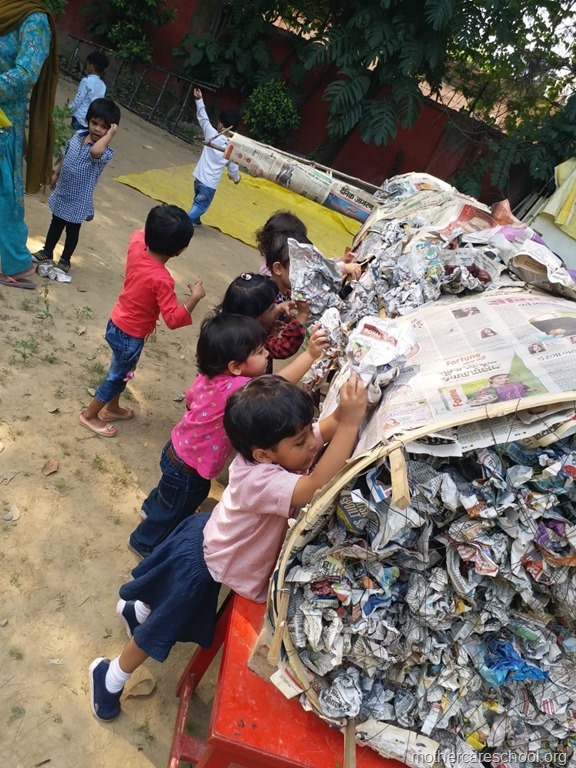 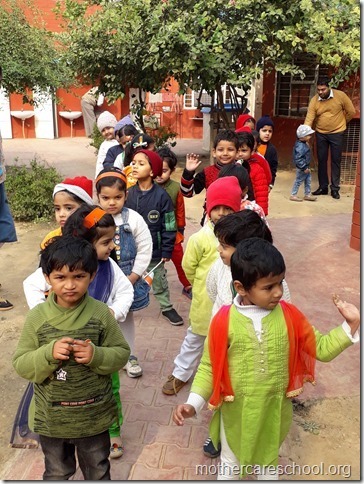 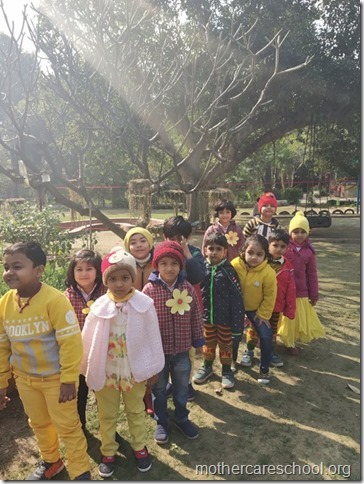 Proud of my class Nursery A.
Ek se badh kar ek…. 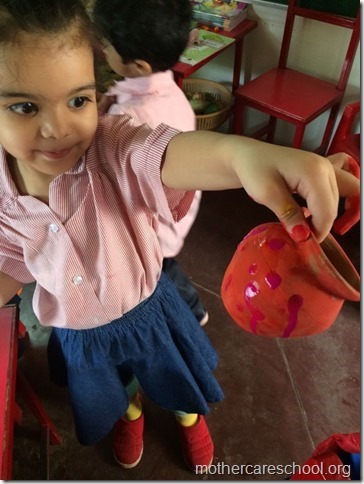 Stunned, shocked, aghast…happily so, on seeing their children’s creativity, sense of aesthetics, fine motor control. 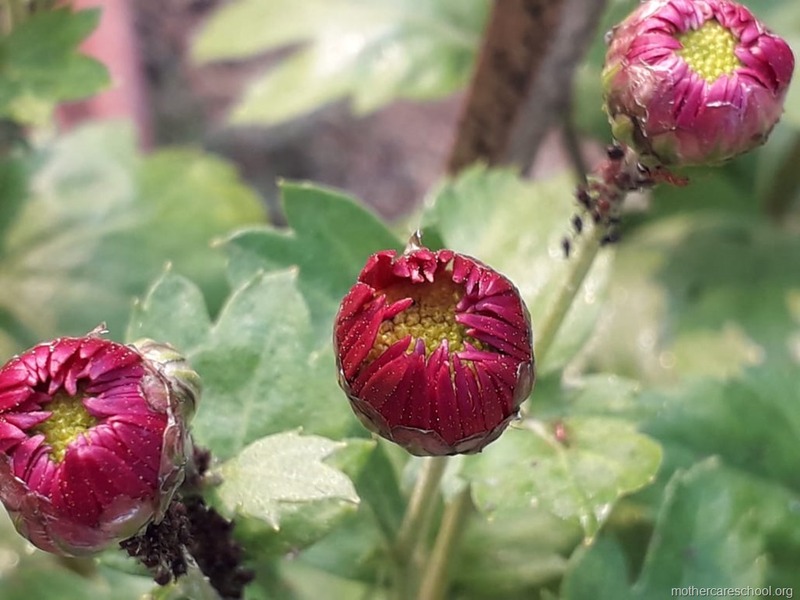 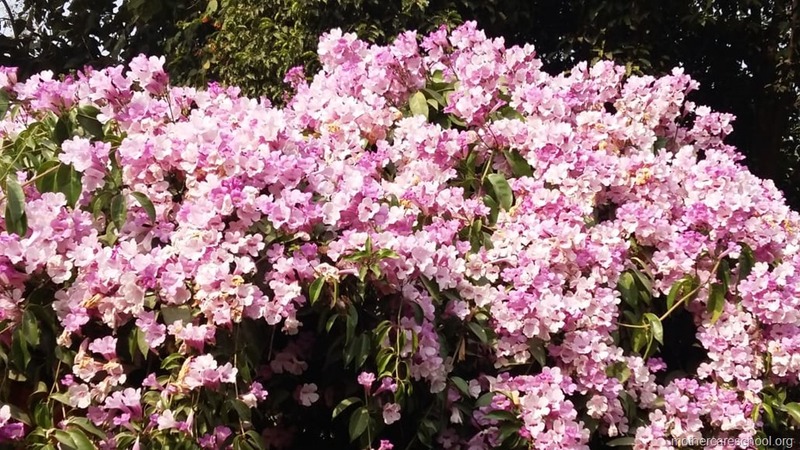 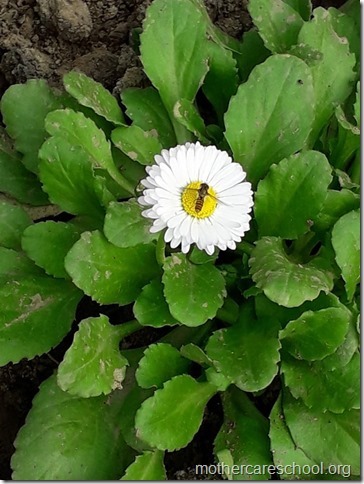 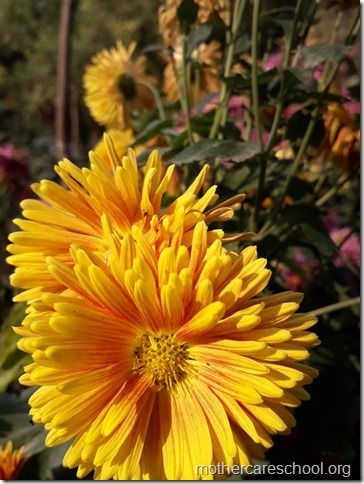 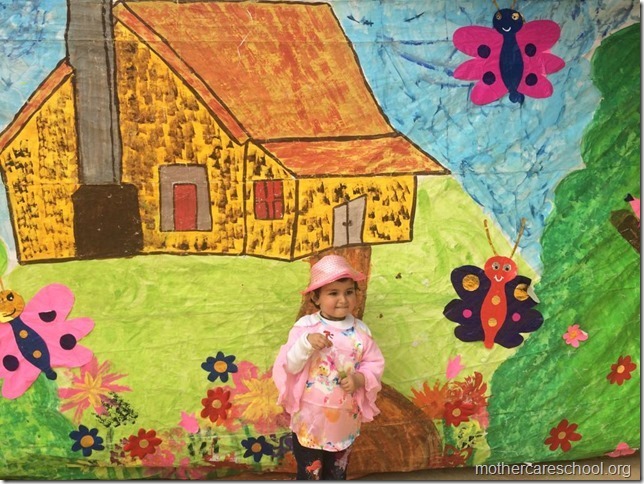 Blooming flower in our Mothercare Garden…. 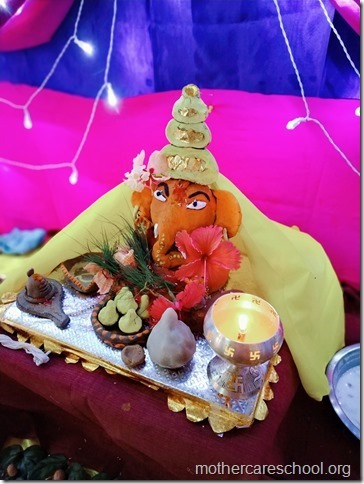 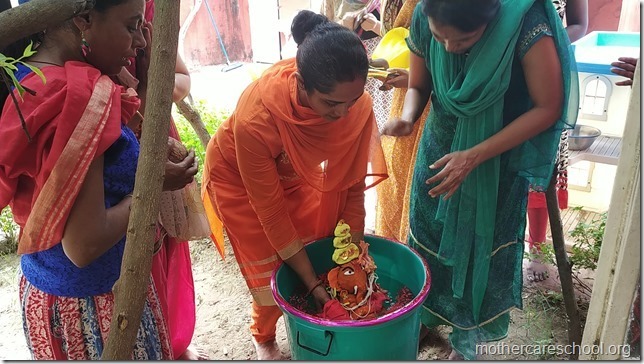 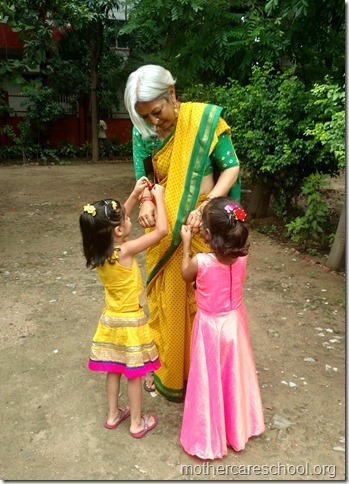 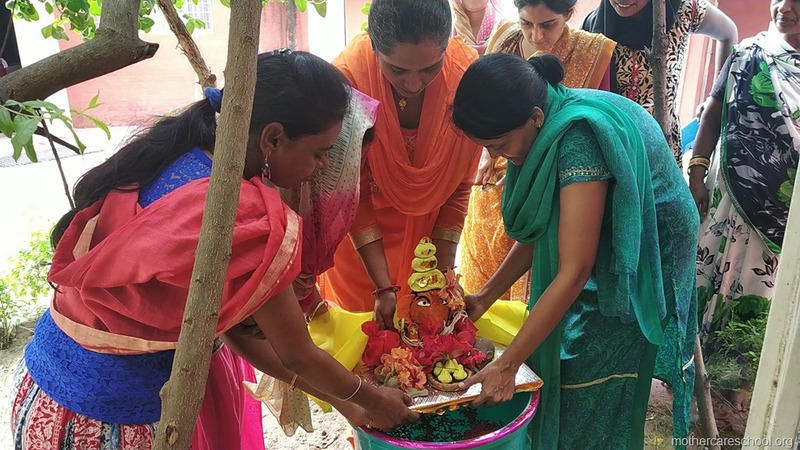 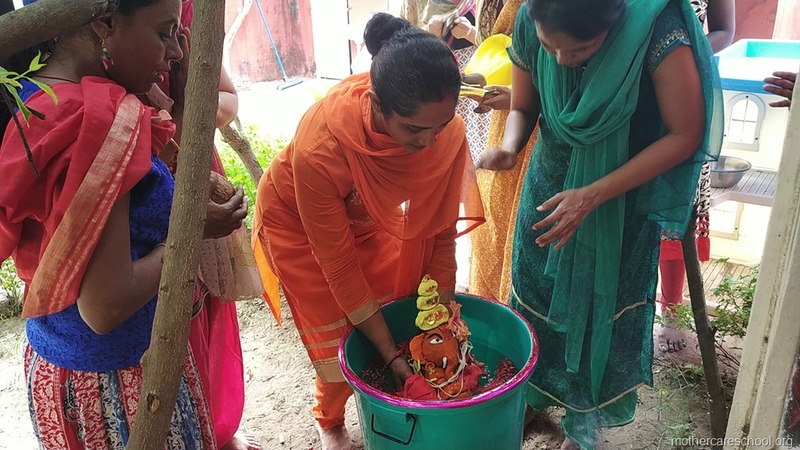 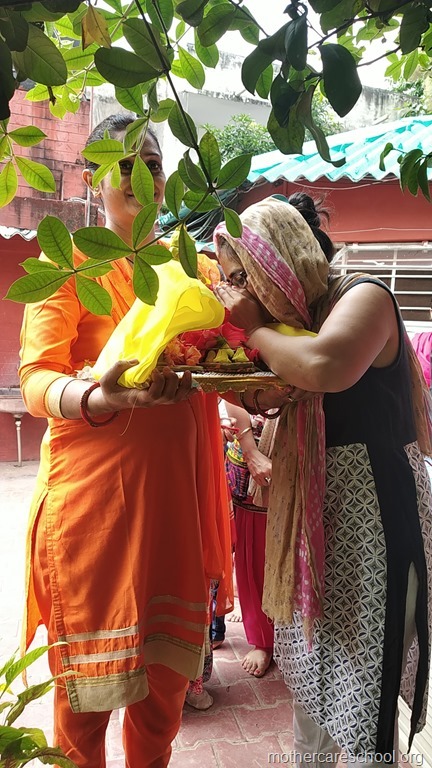 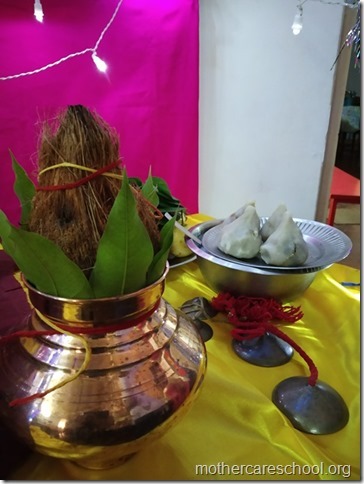 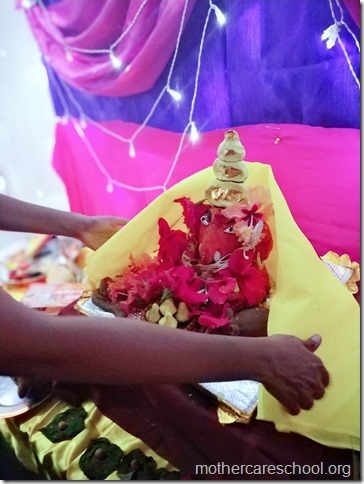 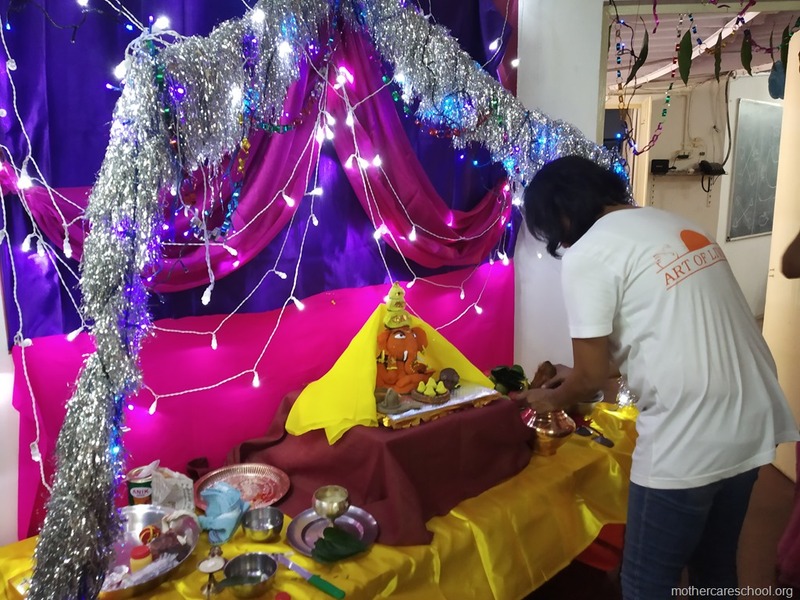 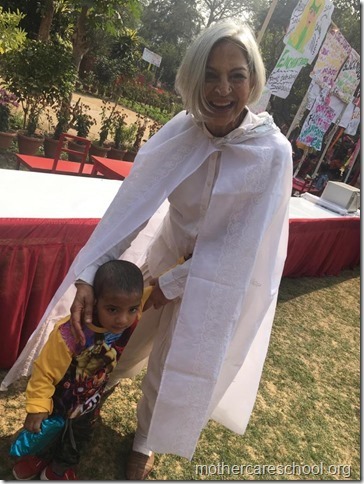 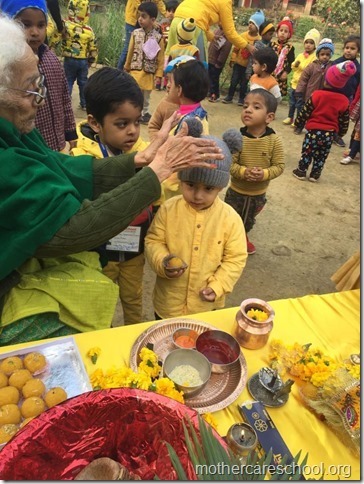 Gratitude, thankyou and seeking blessings…. All set for tie and dye…. 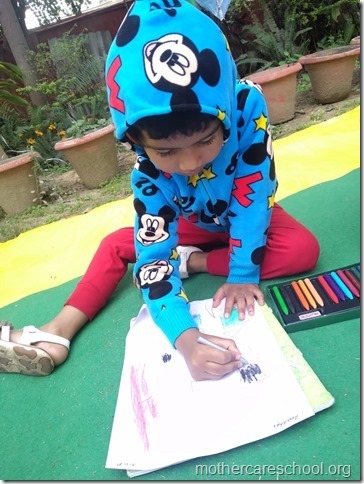 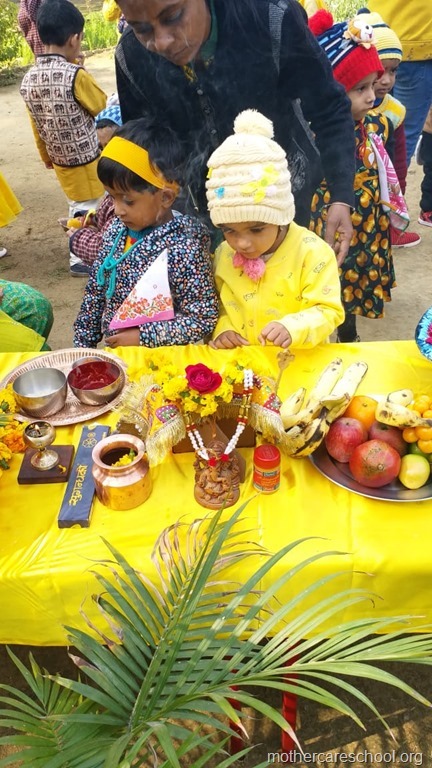 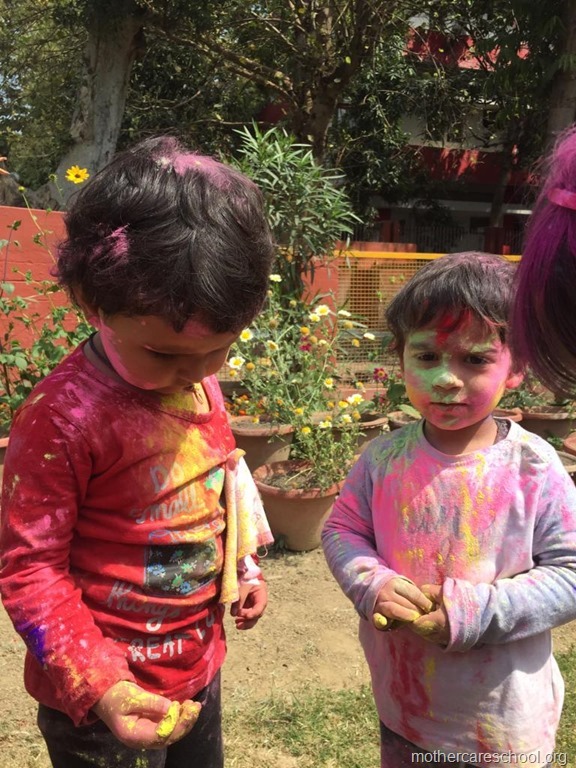 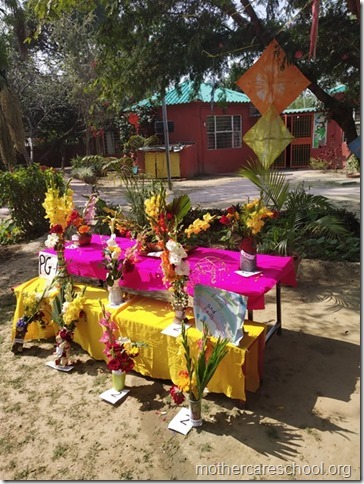 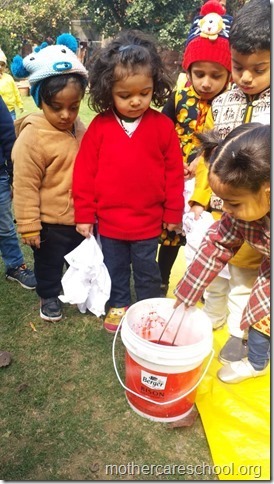 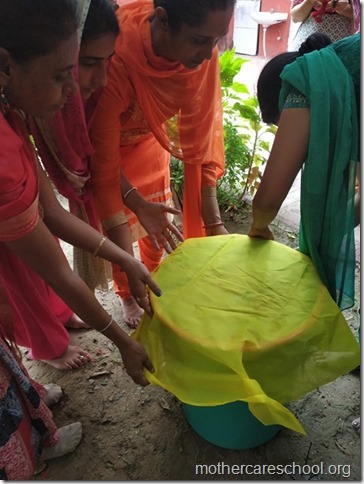 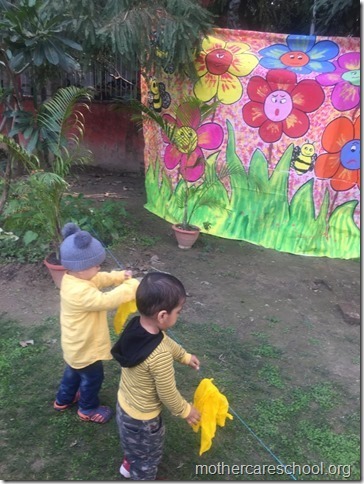 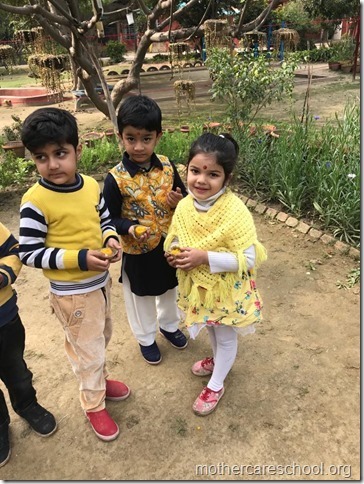 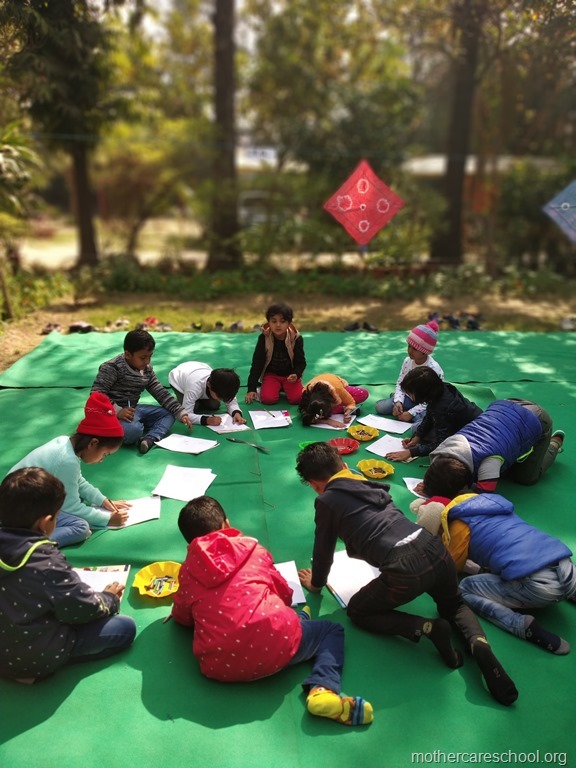 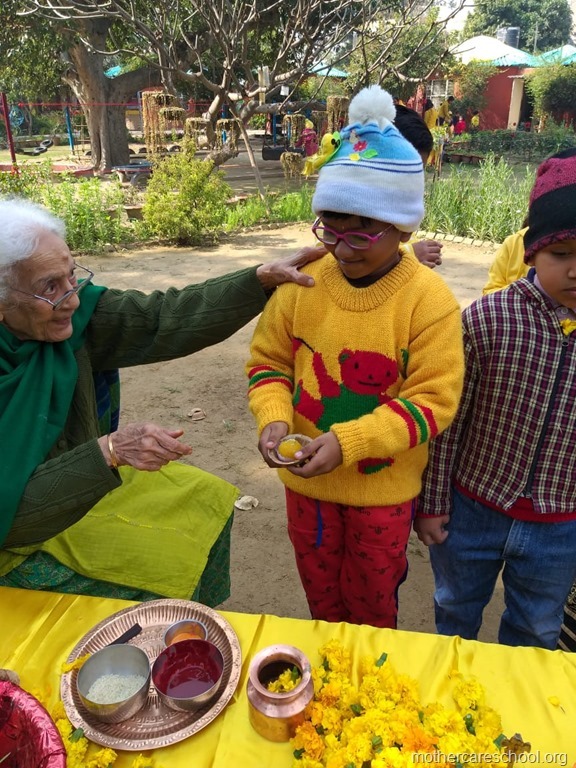 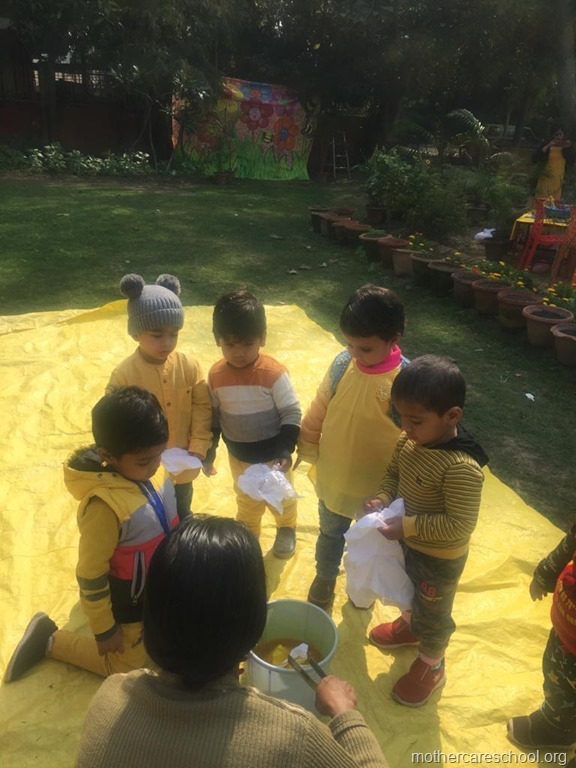 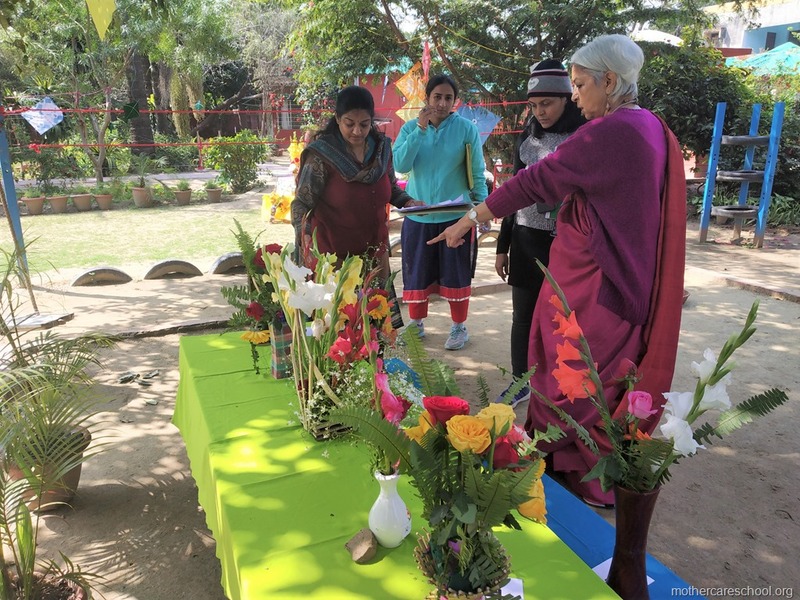 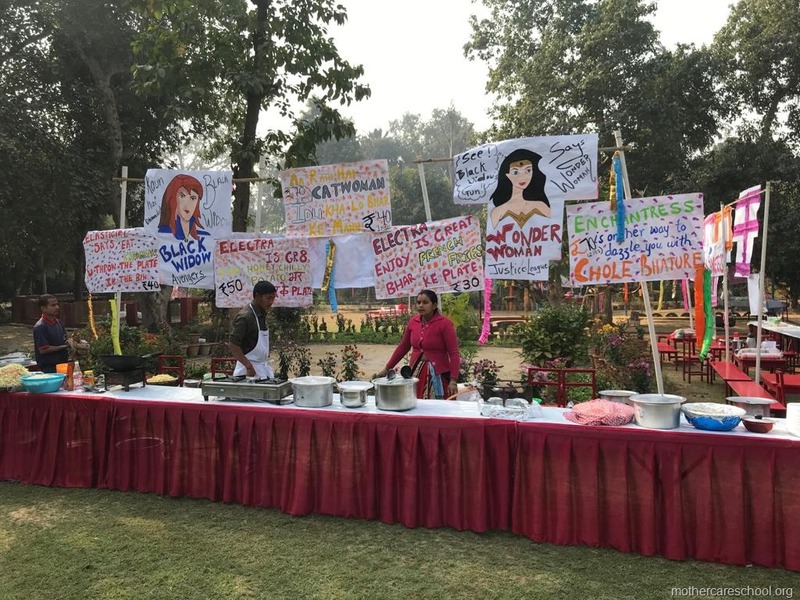 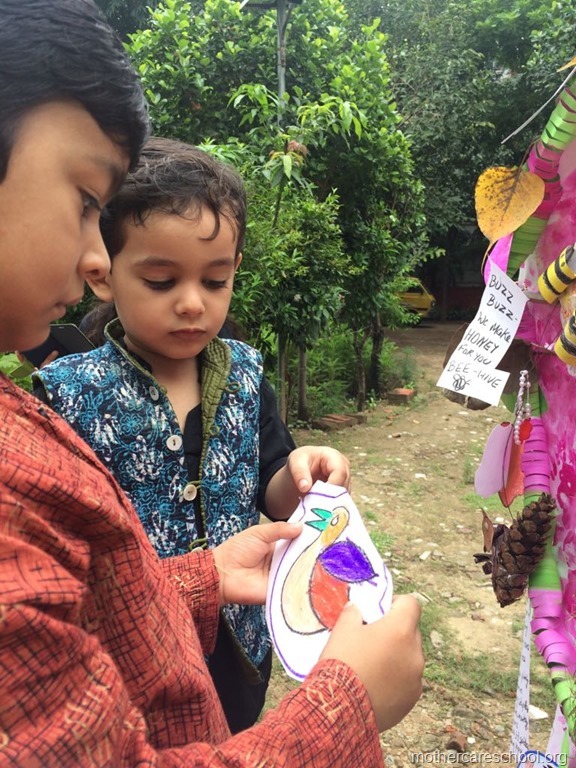 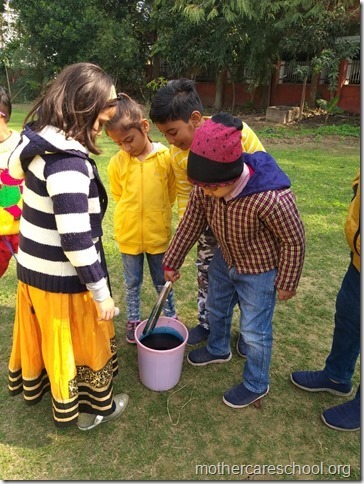 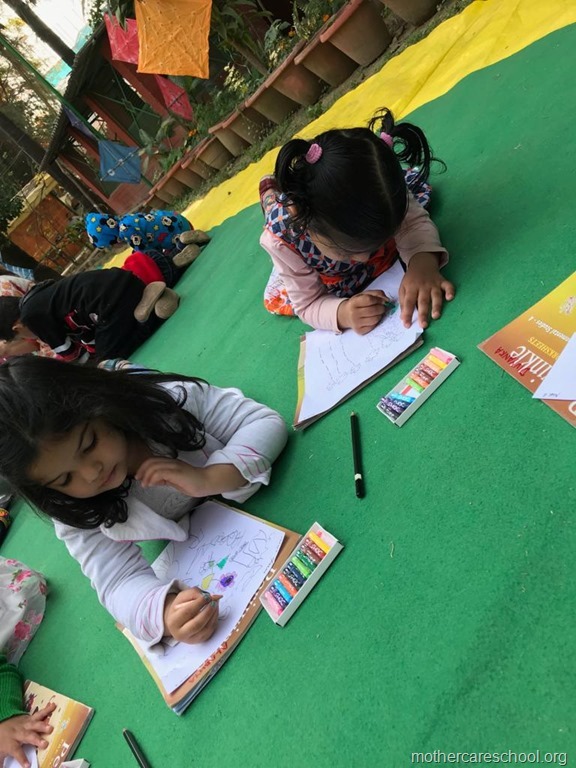 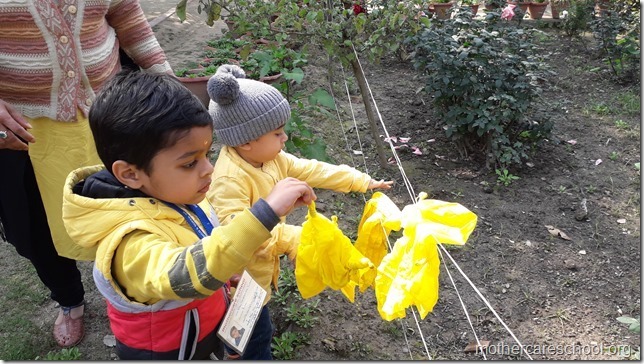 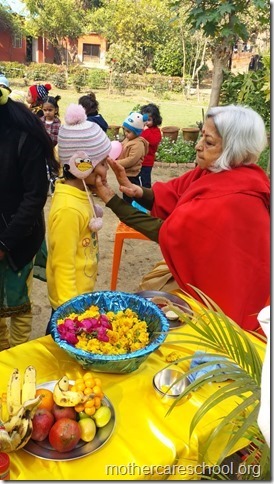 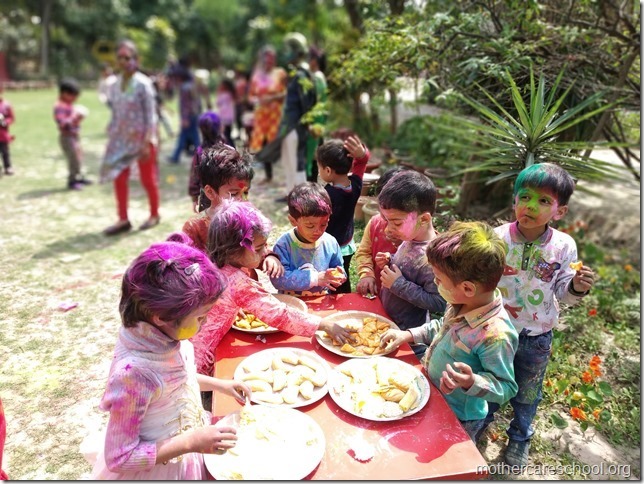 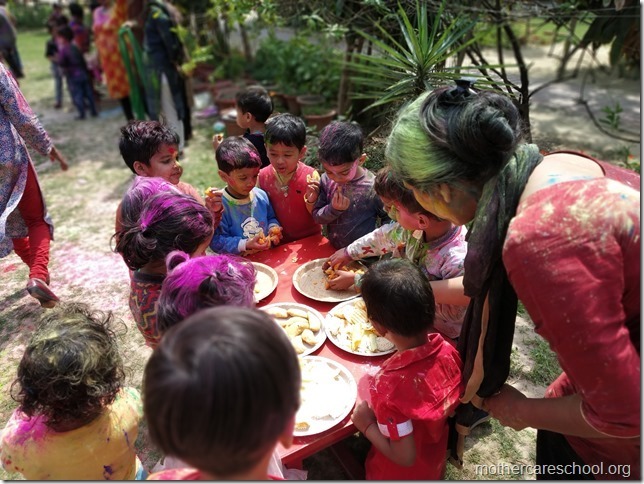 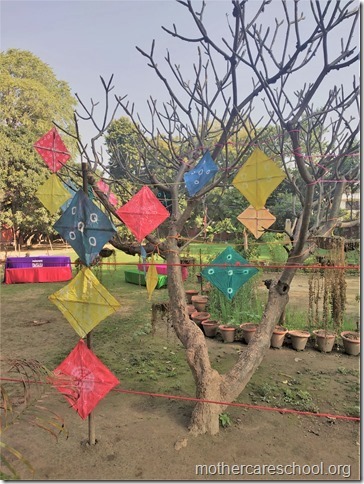 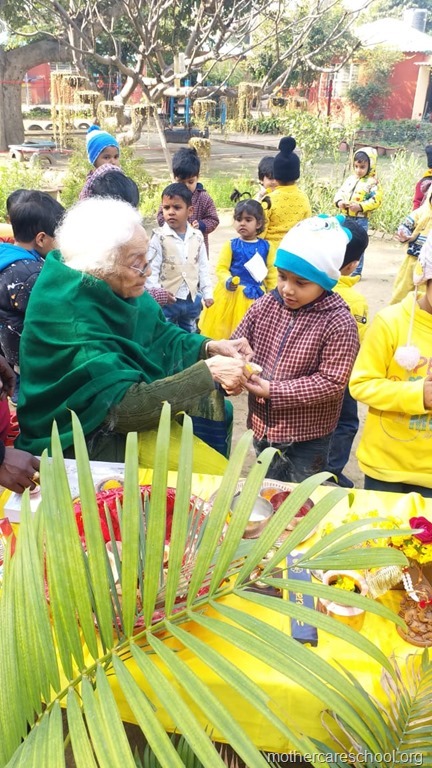 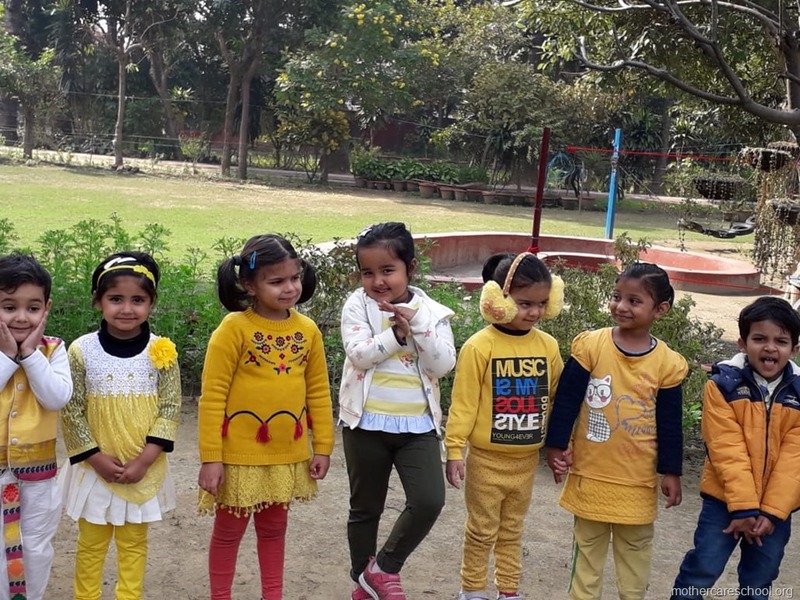 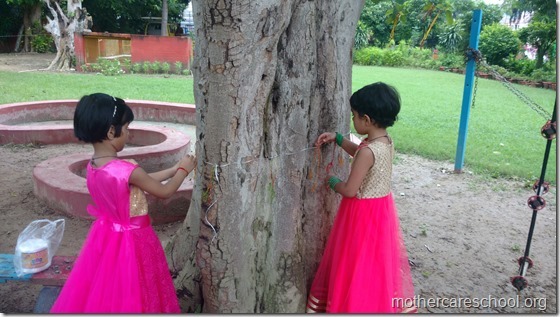 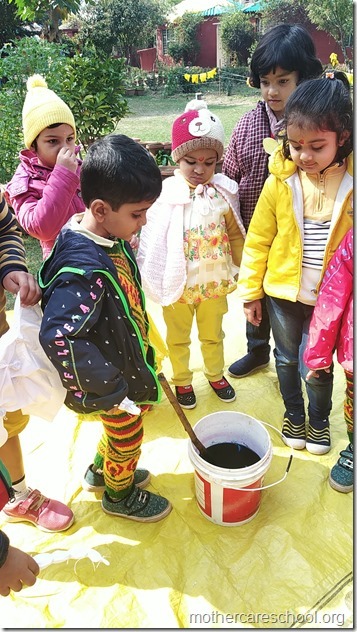 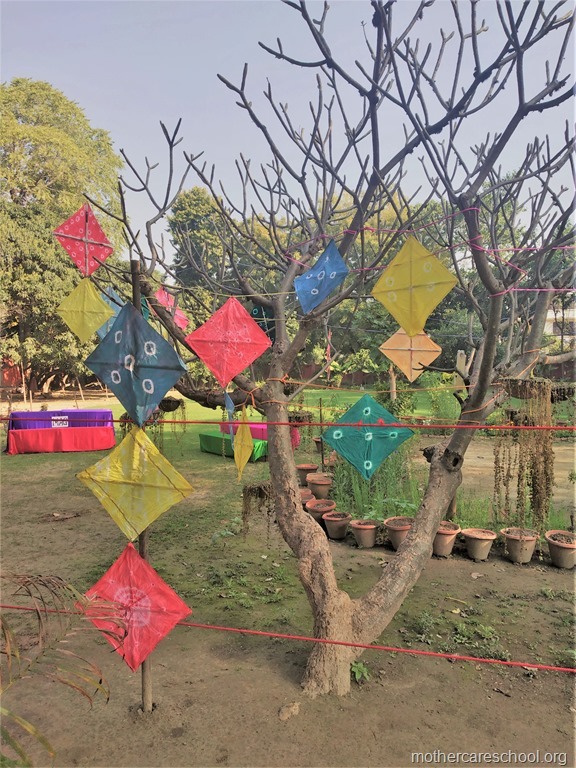 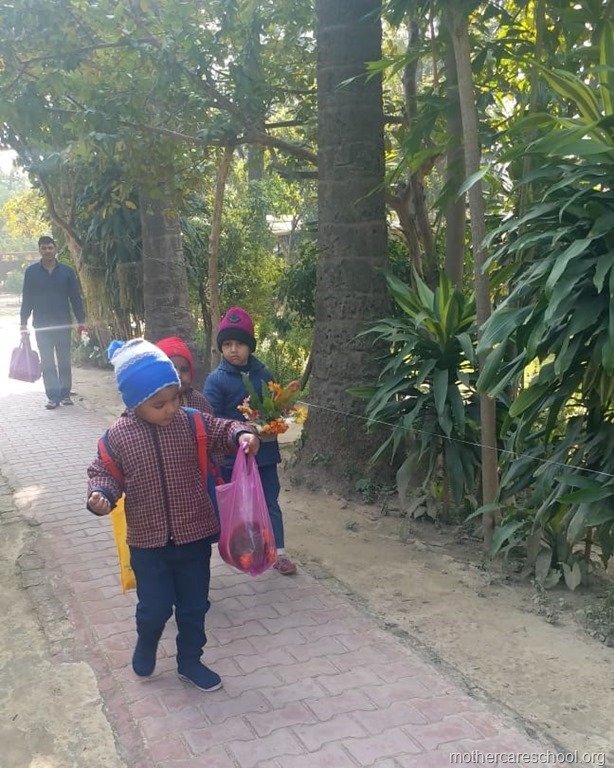 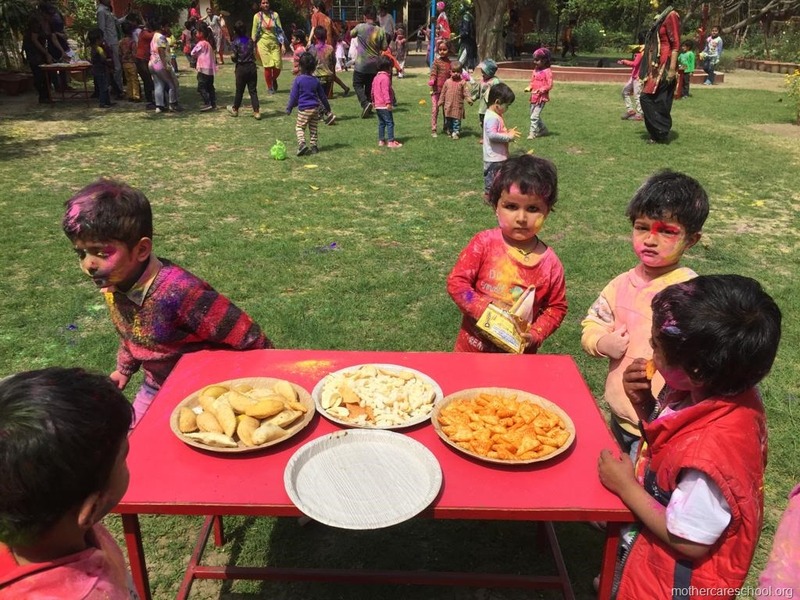 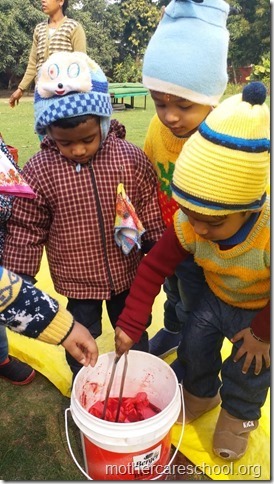 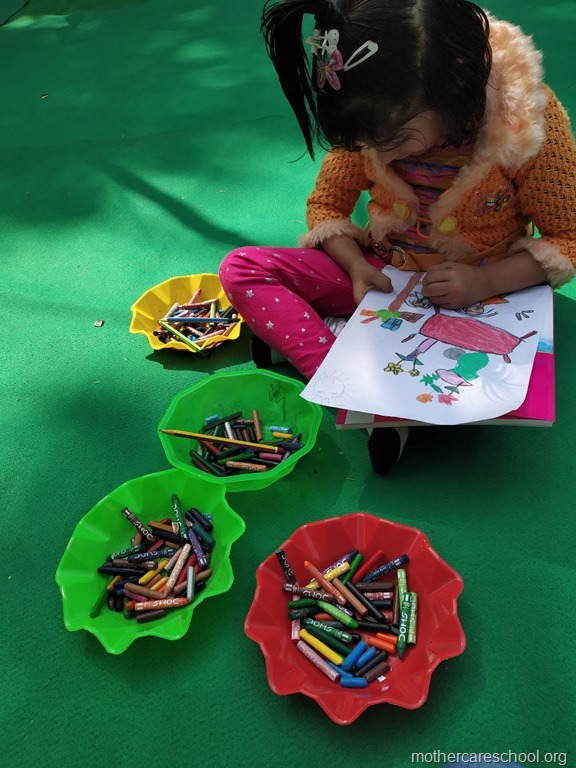 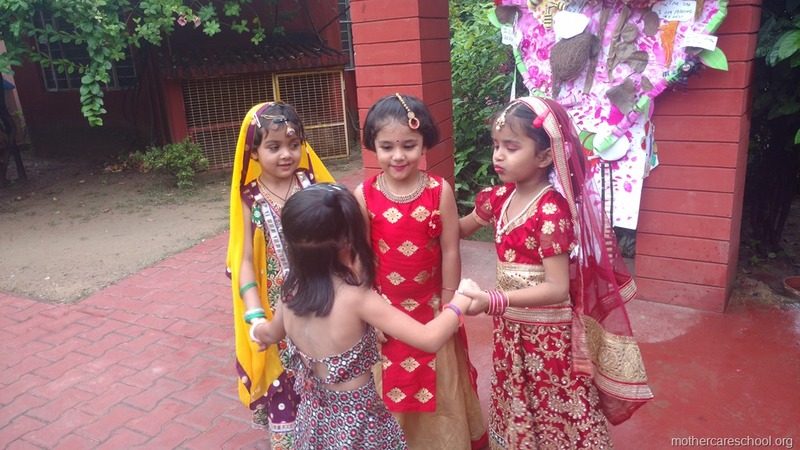 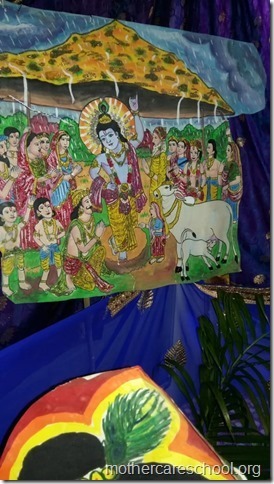 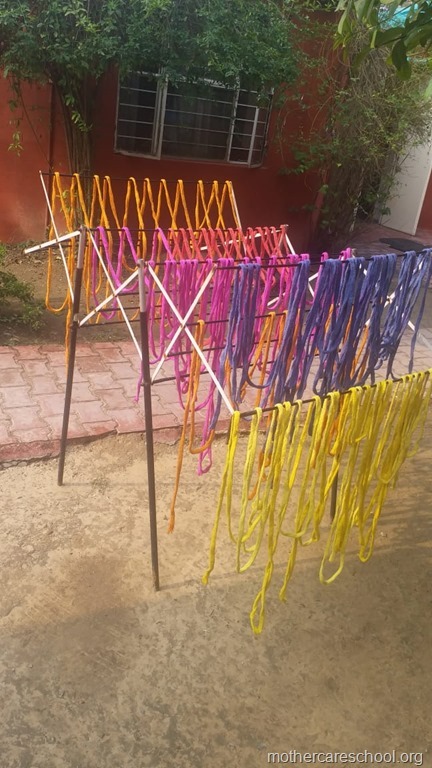 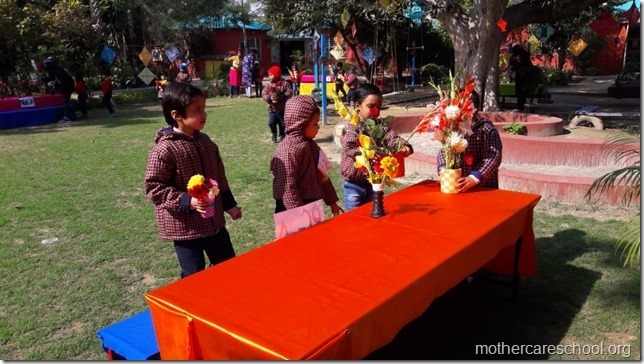 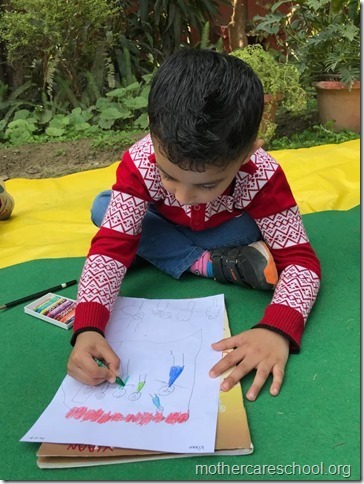 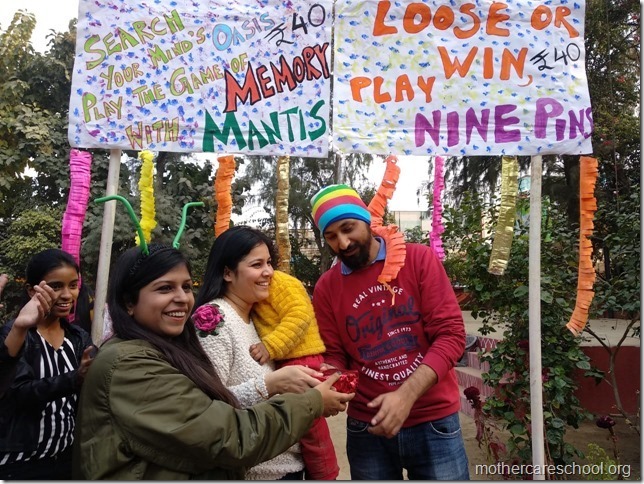 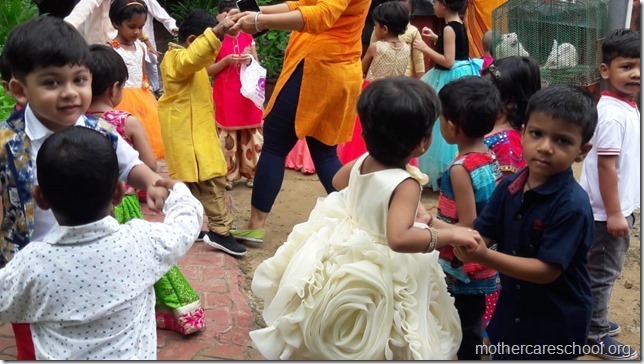 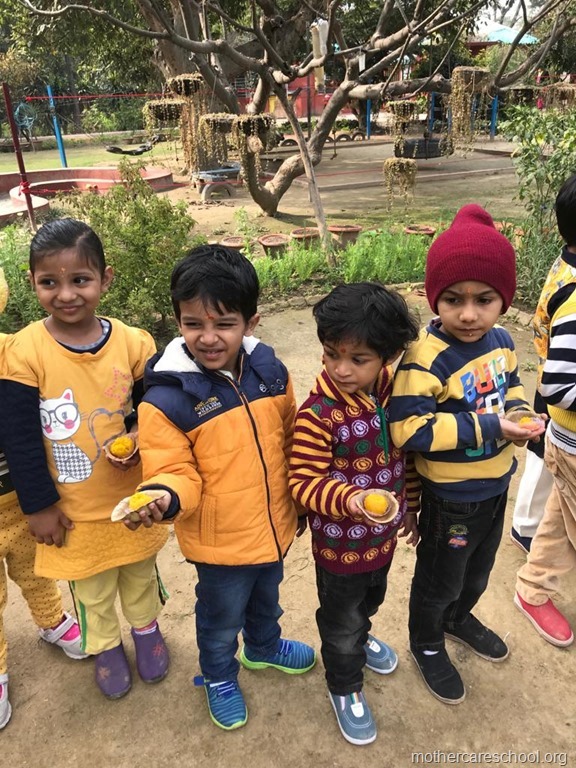 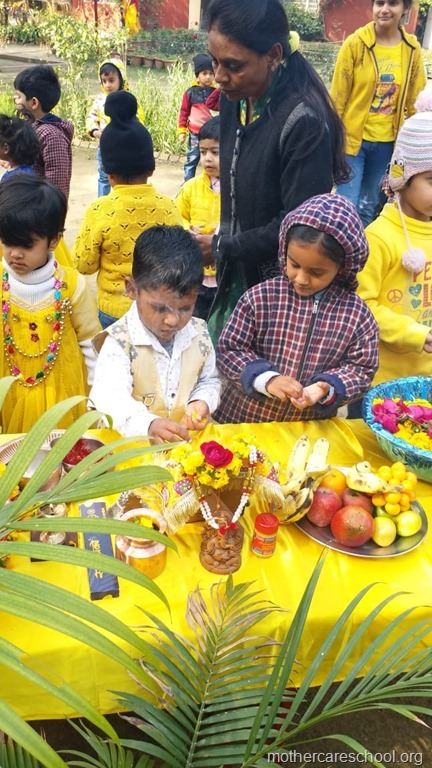 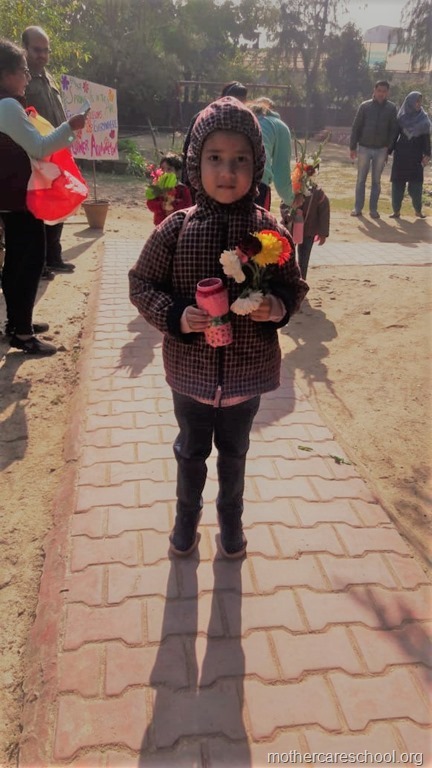 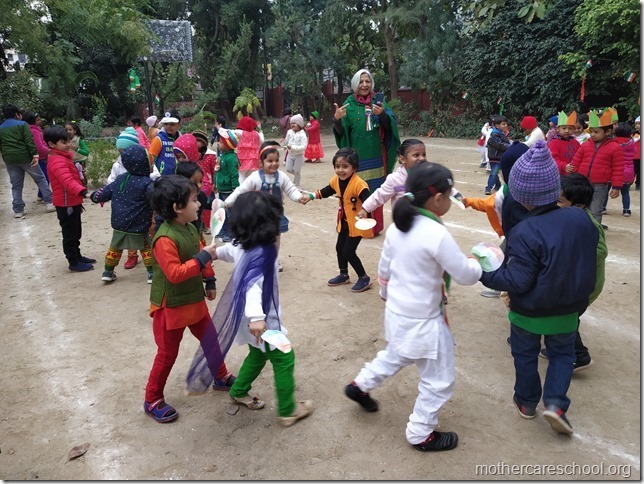 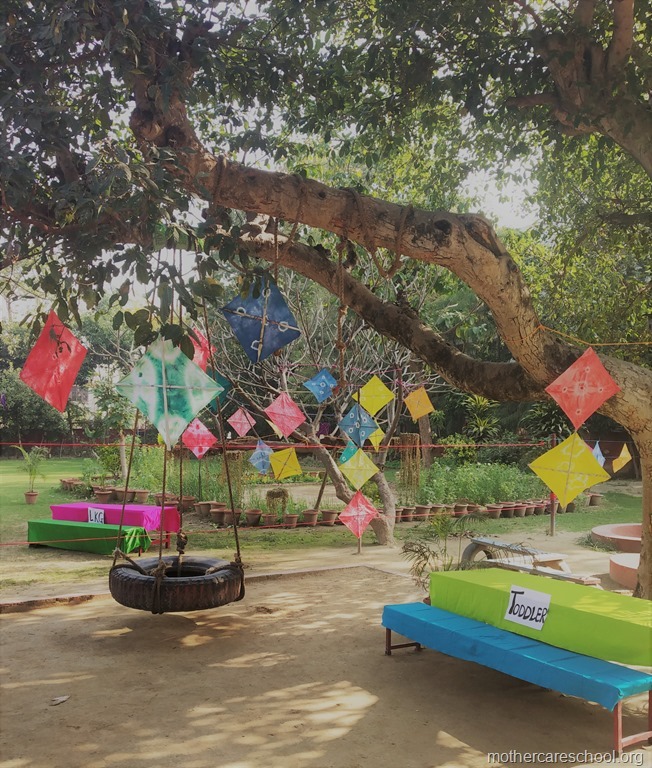 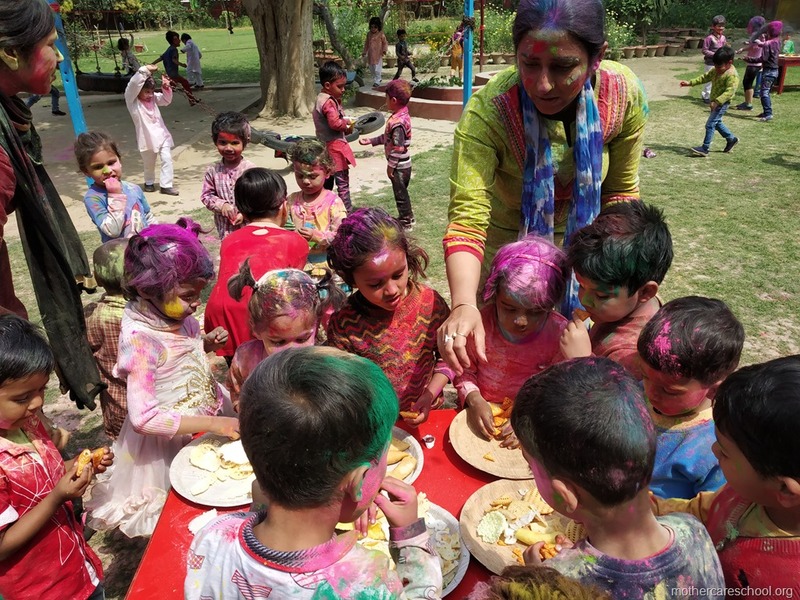 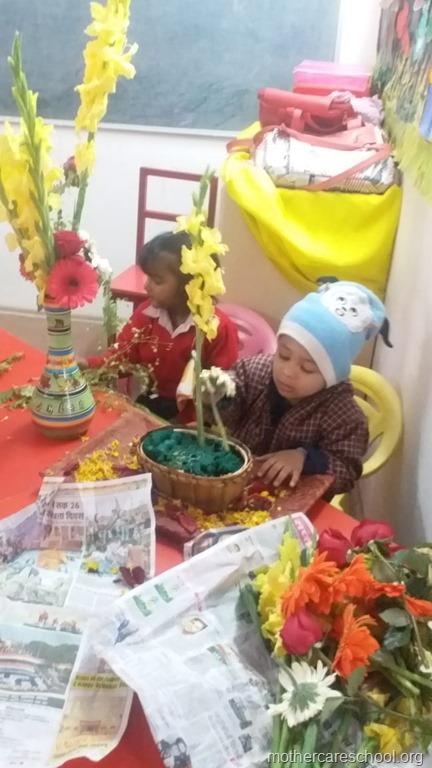 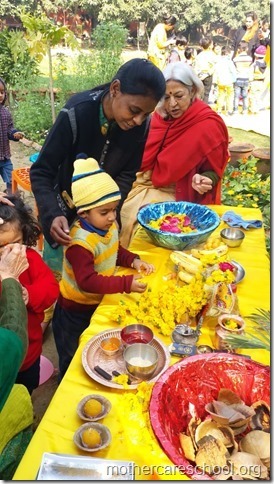 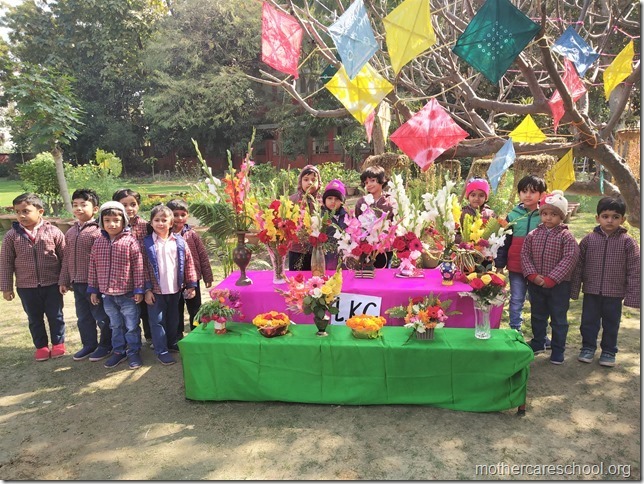 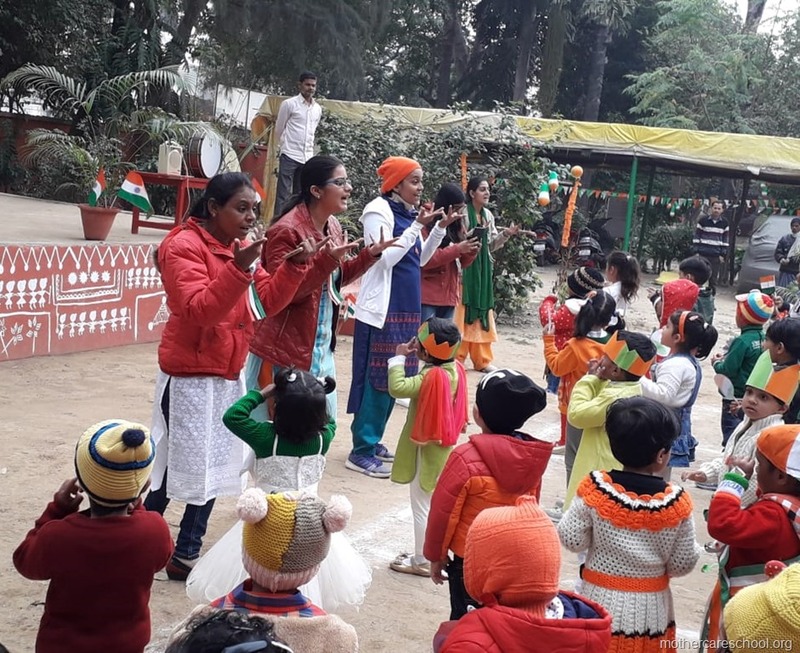 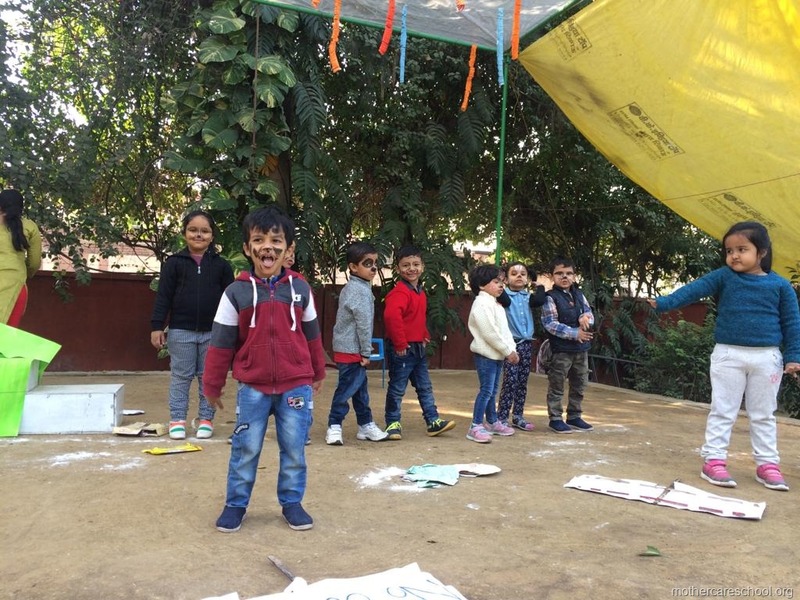 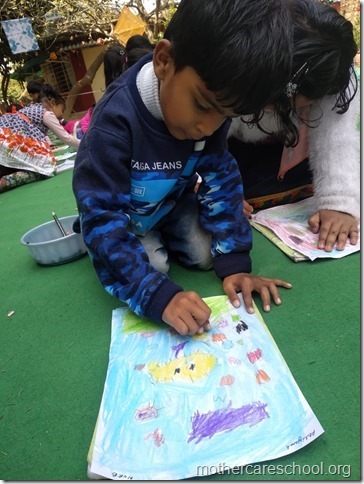 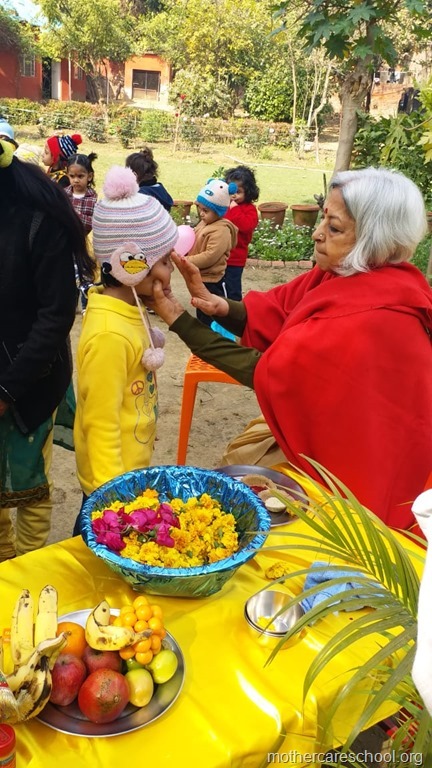 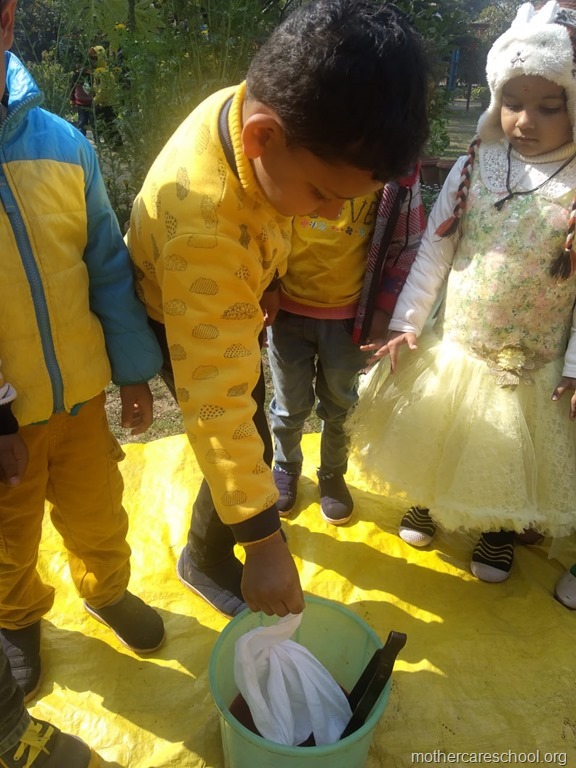 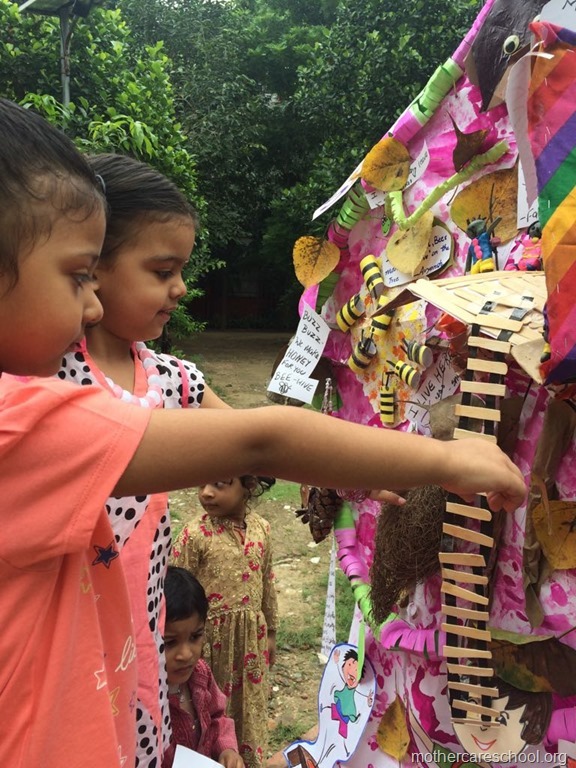 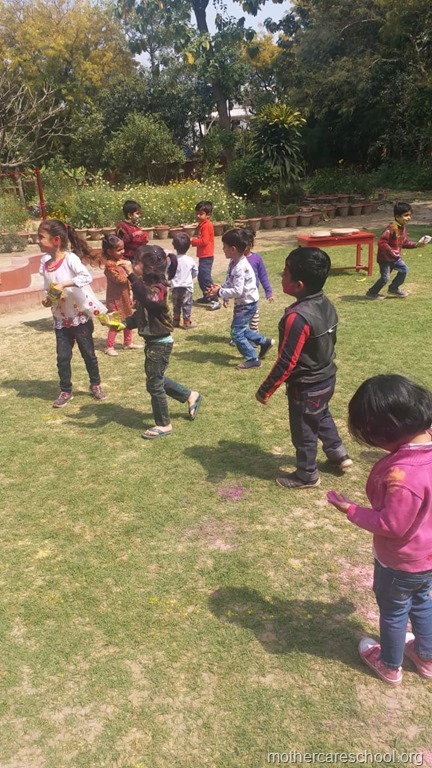 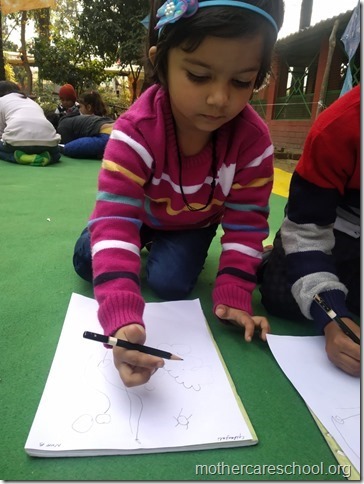 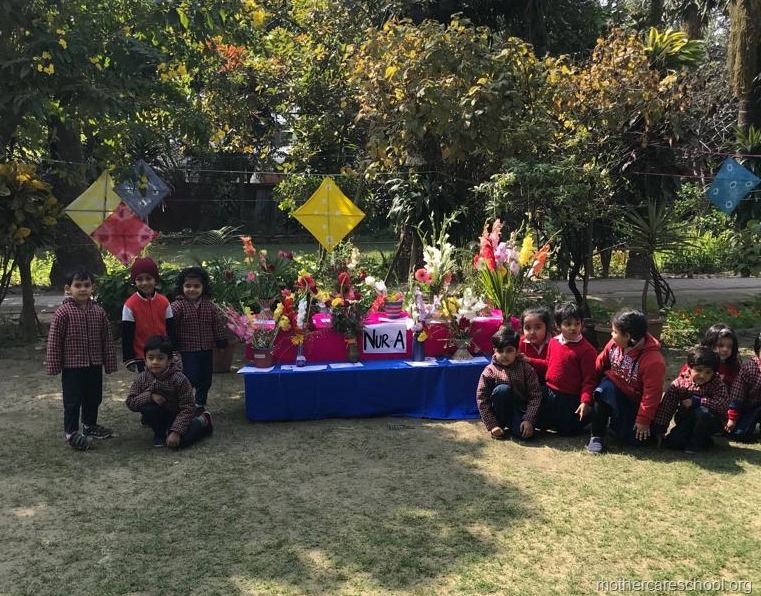 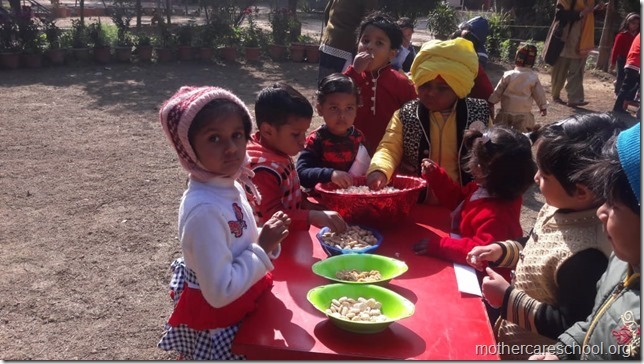 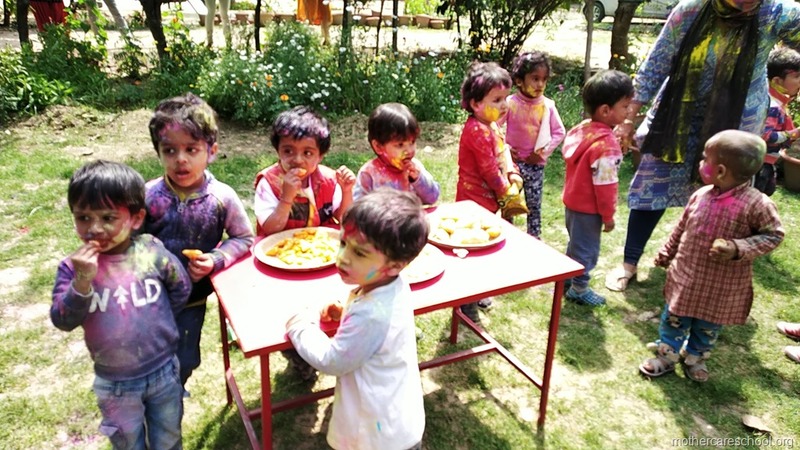 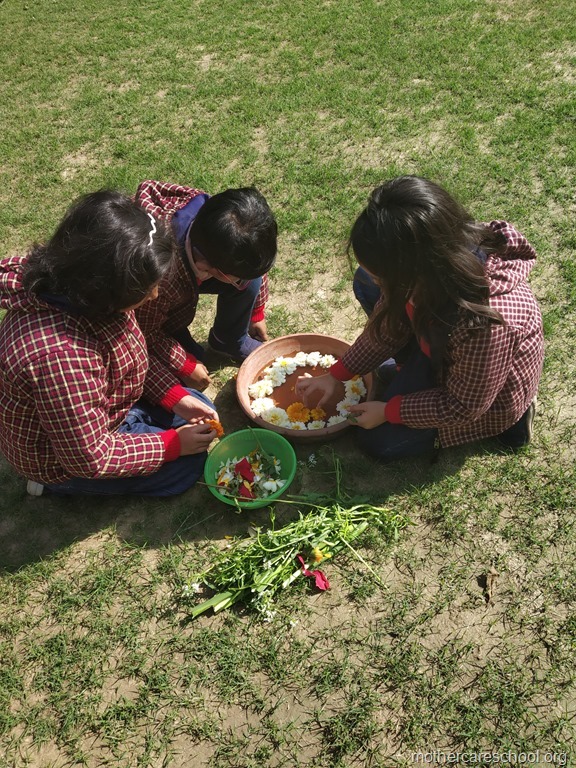 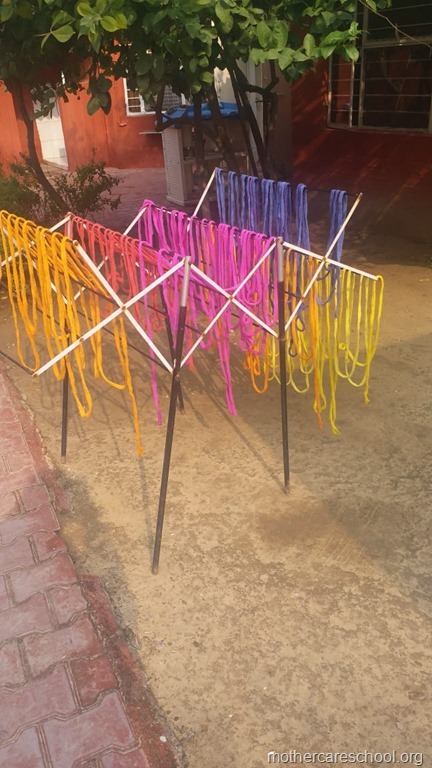 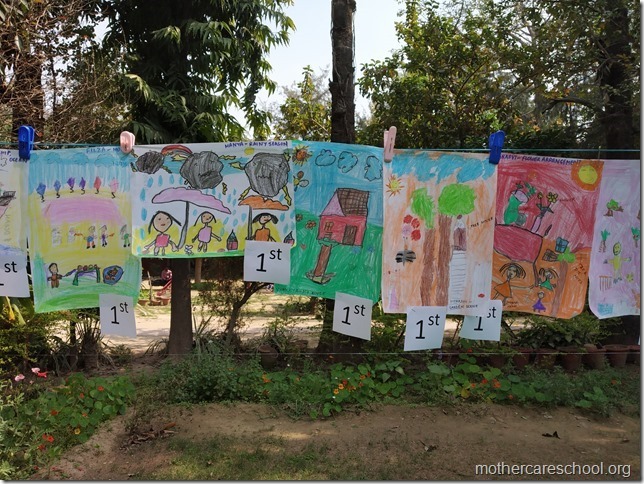 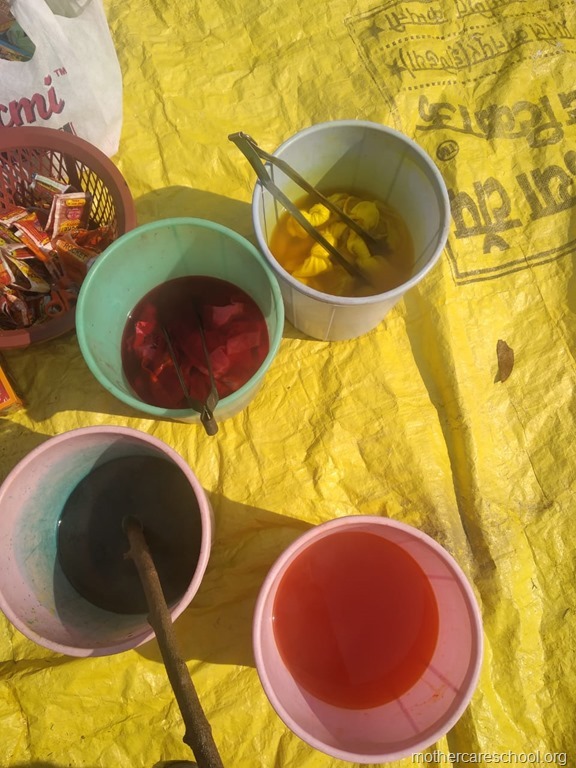 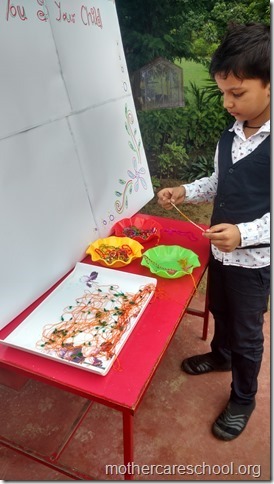 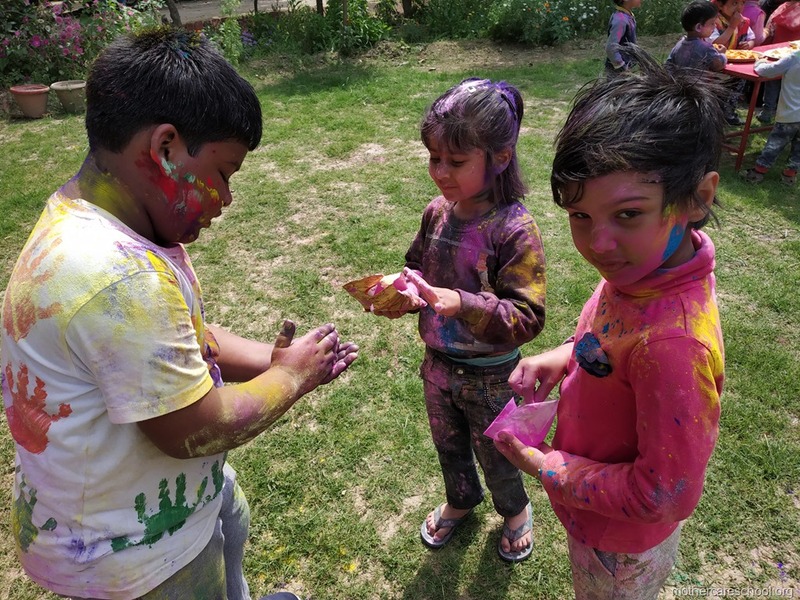 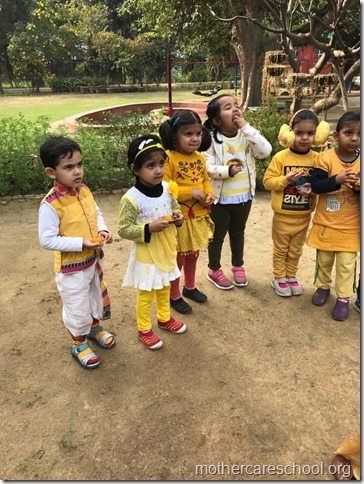 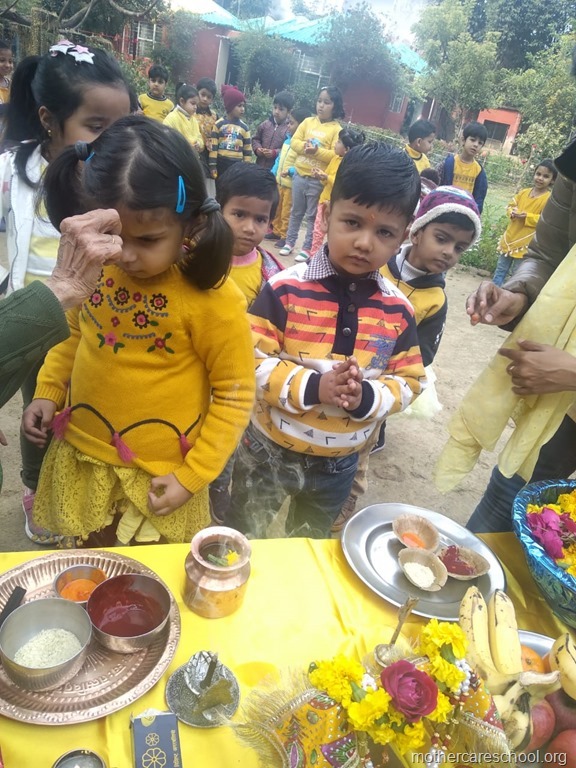 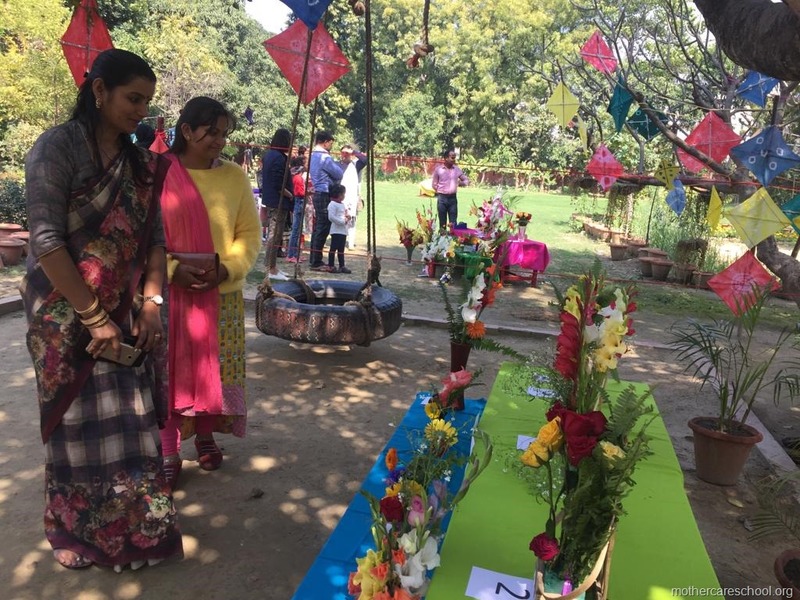 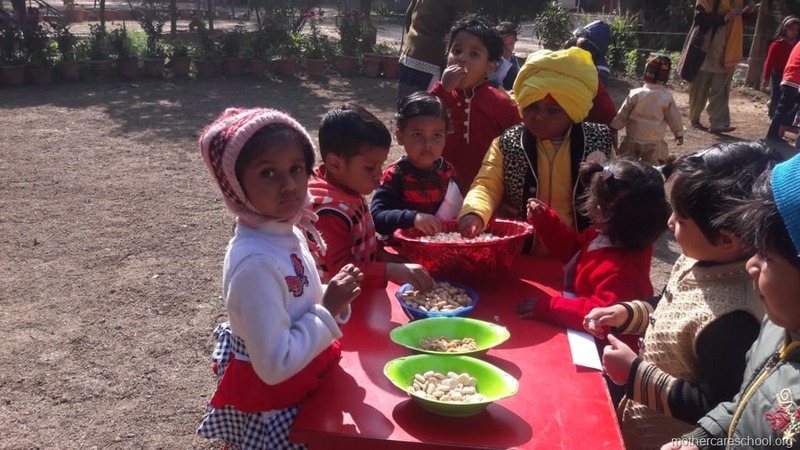 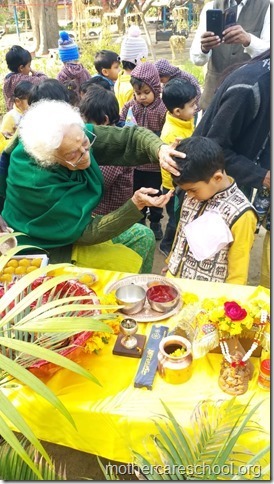 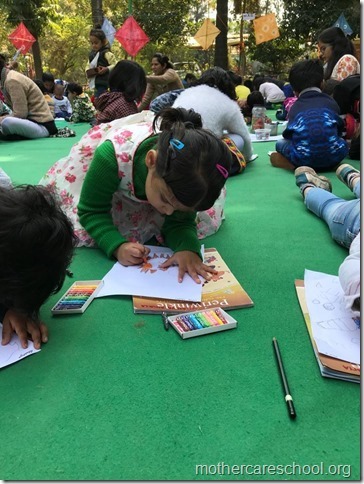 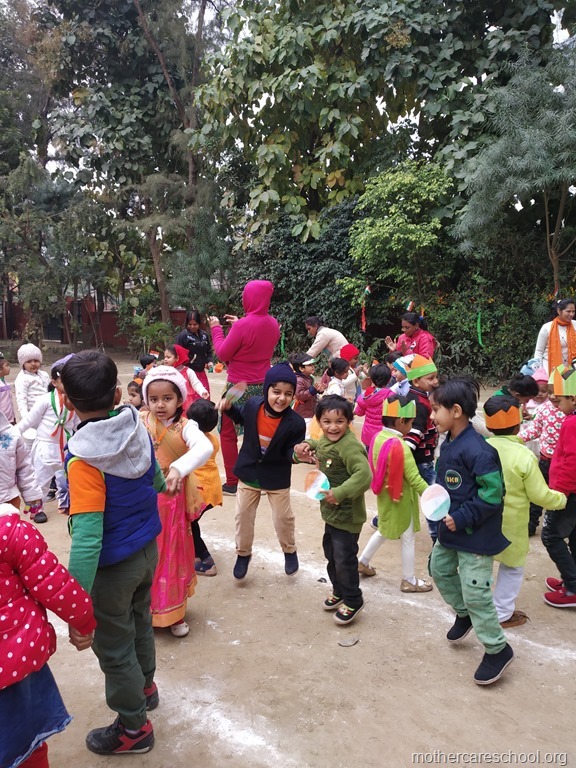 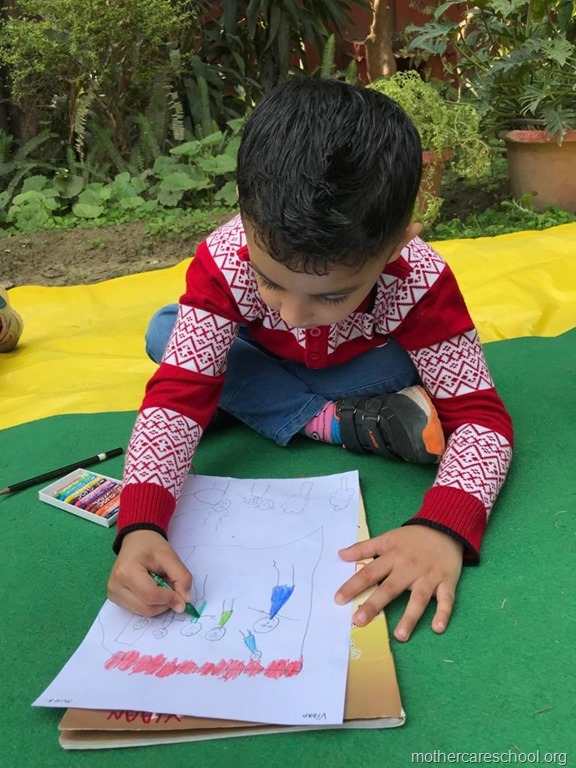 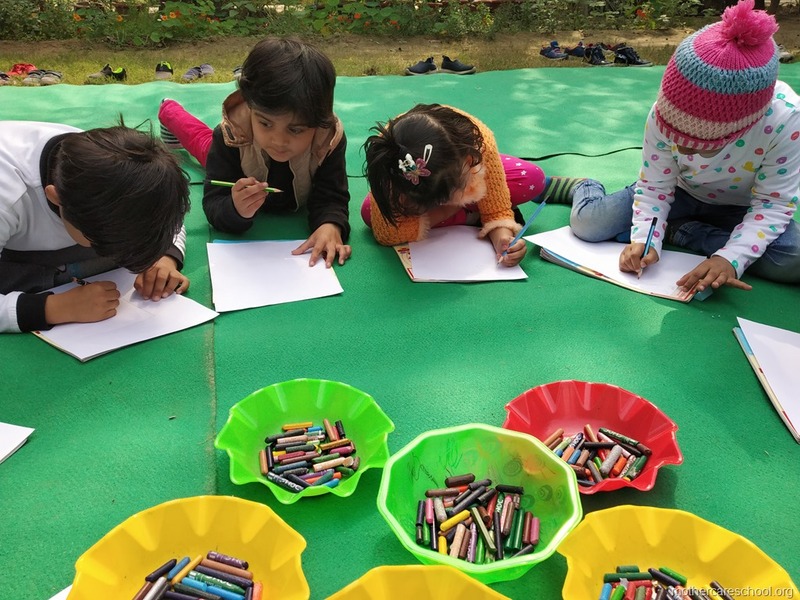 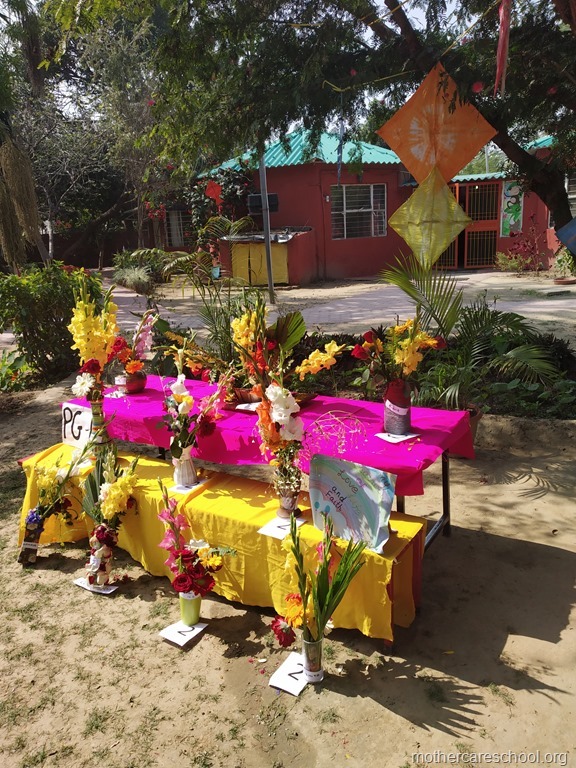 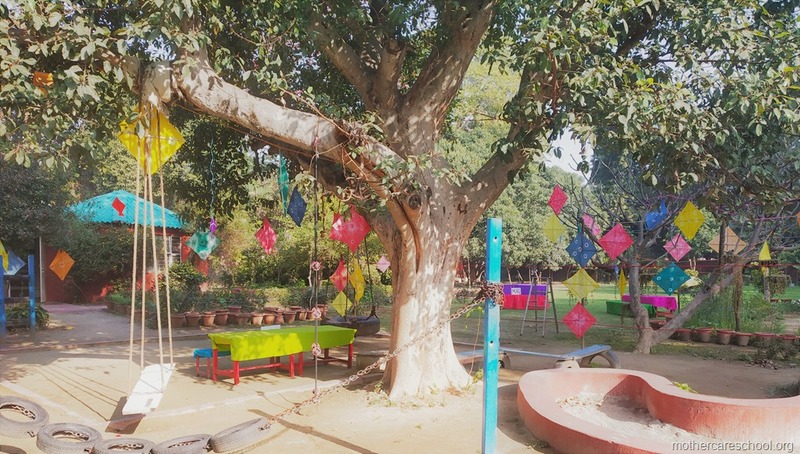 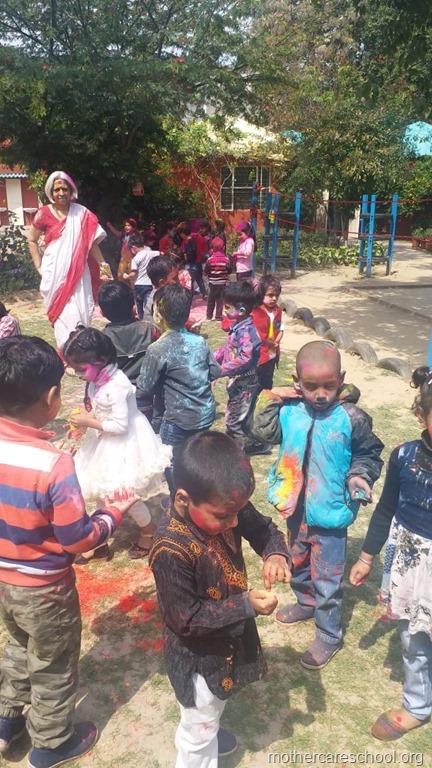 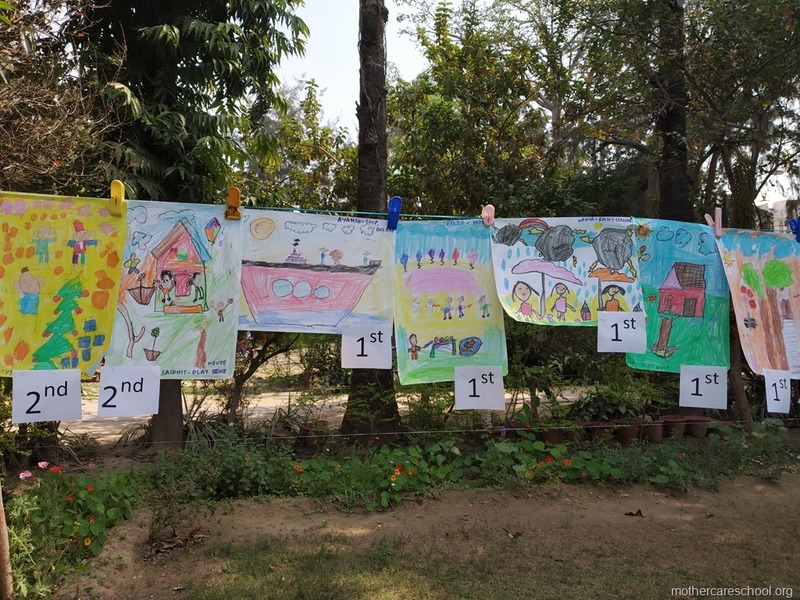 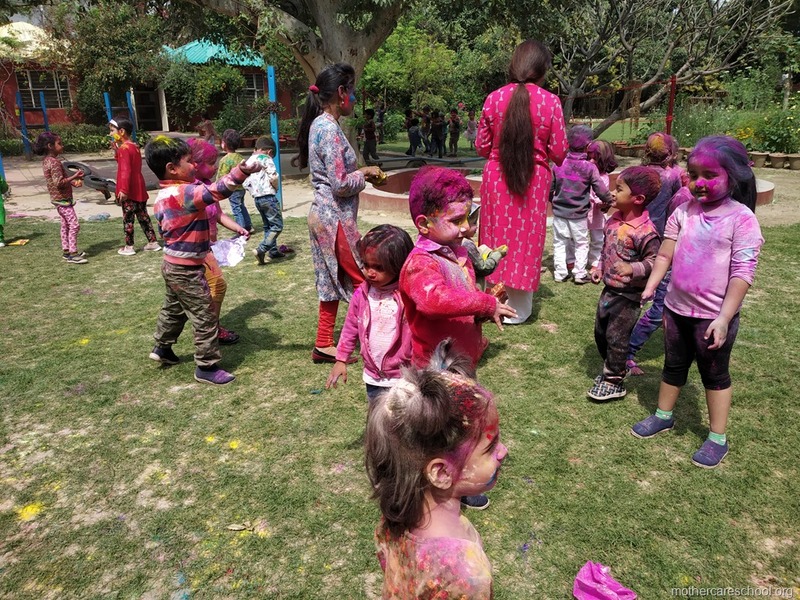 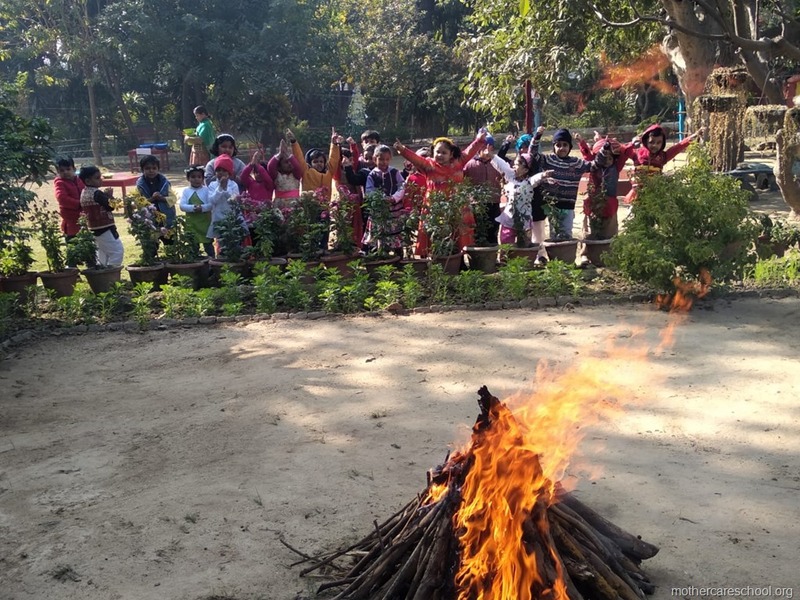 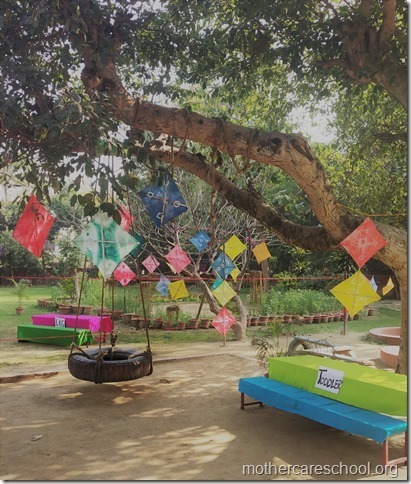 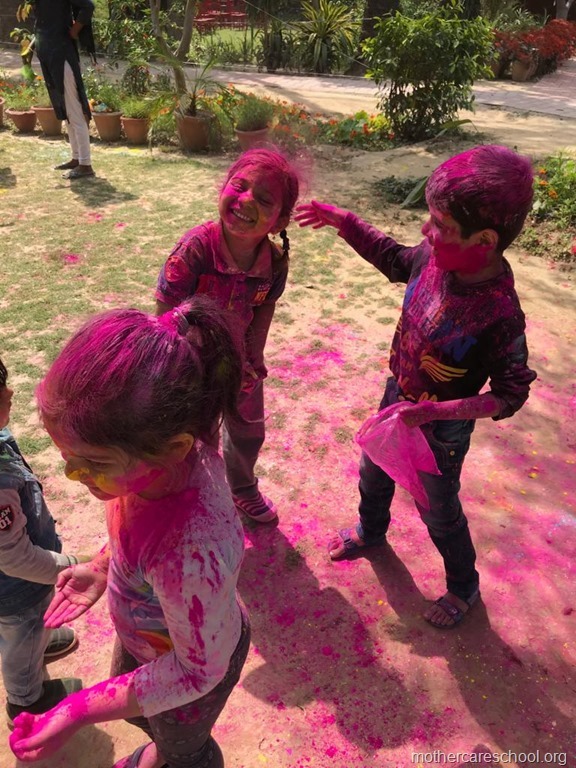 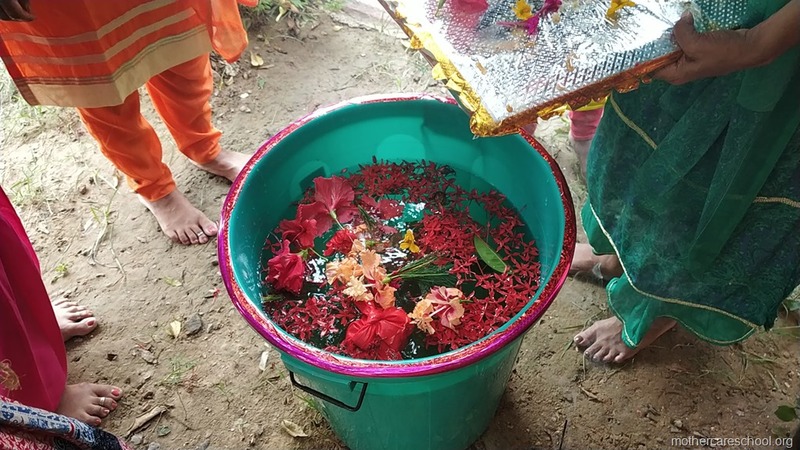 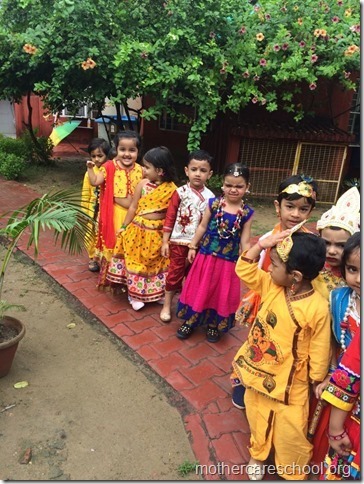 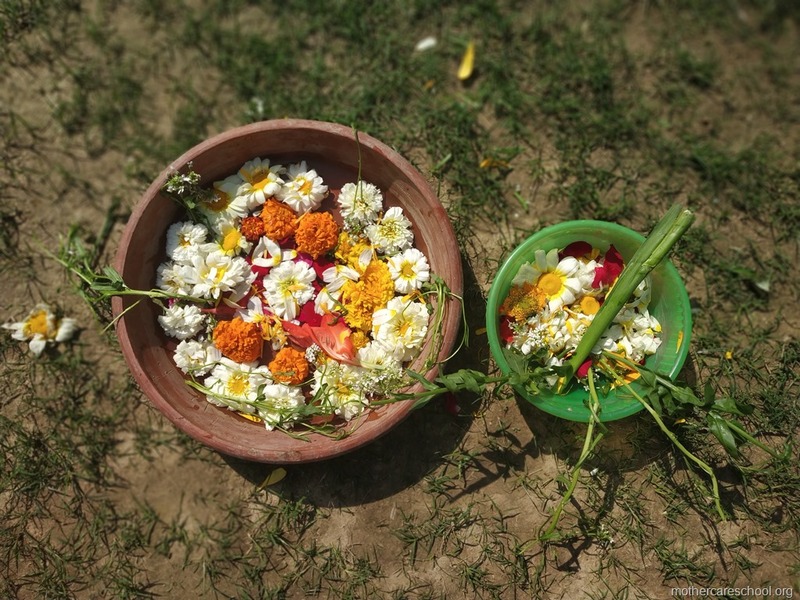 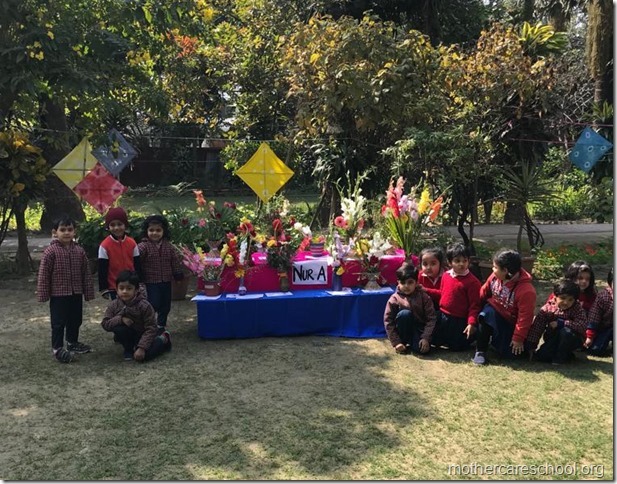 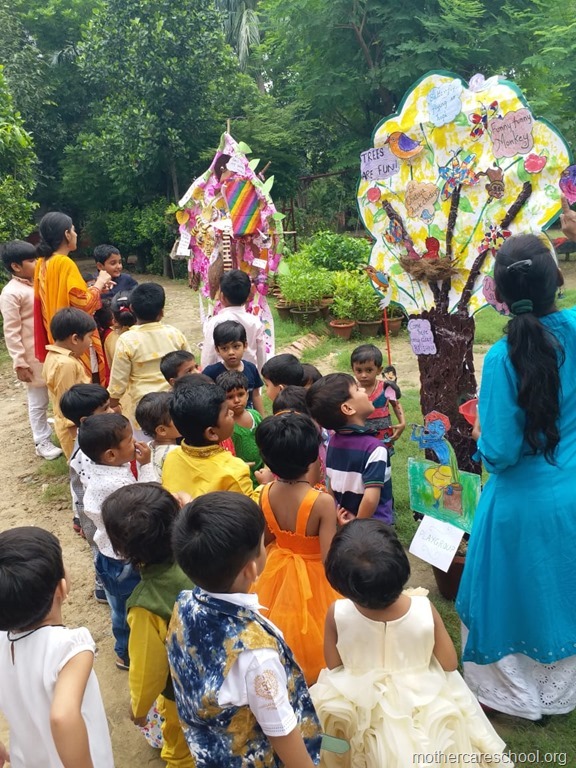 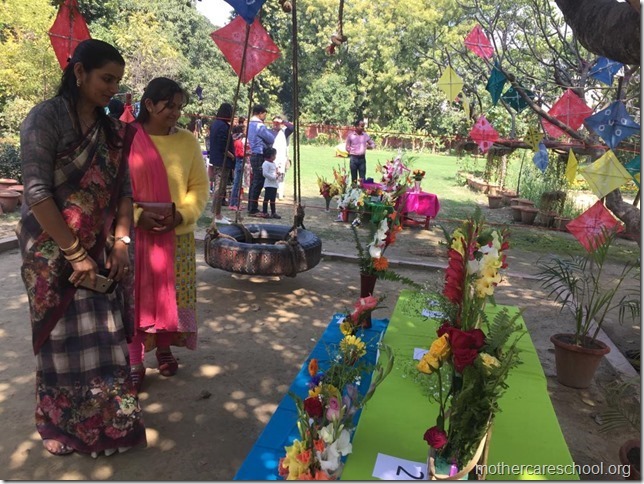 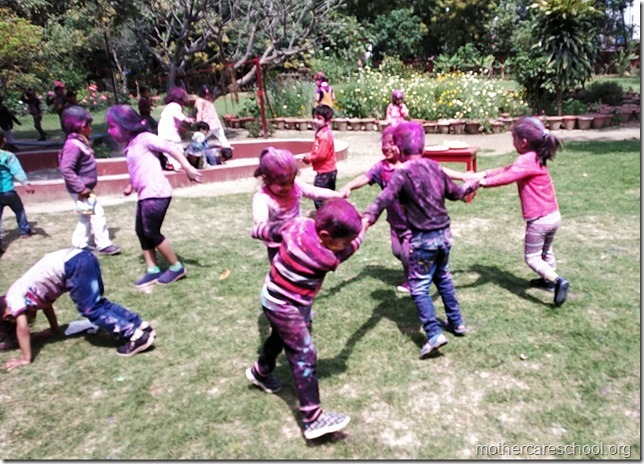 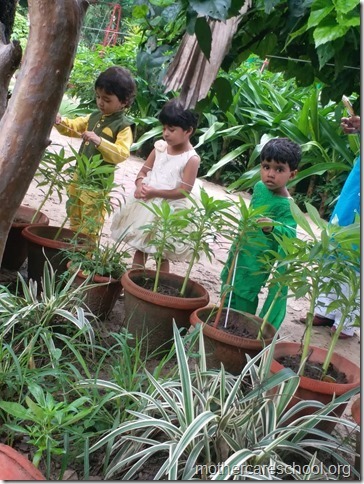 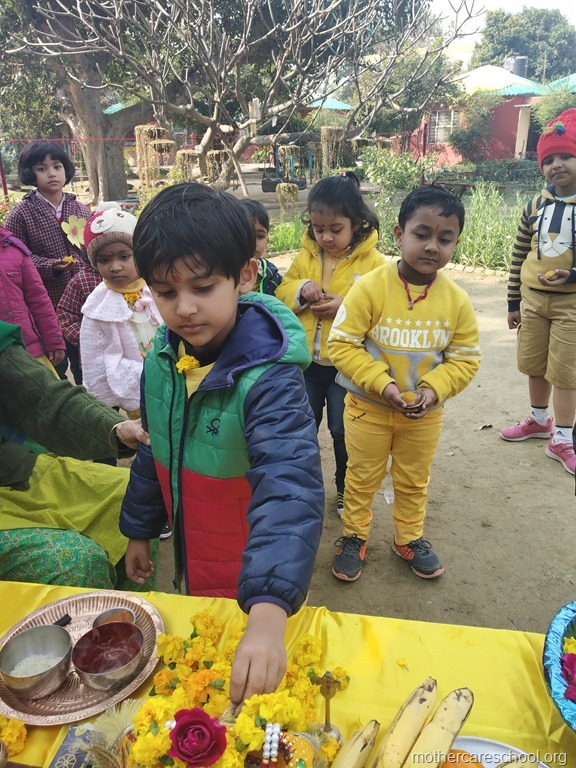 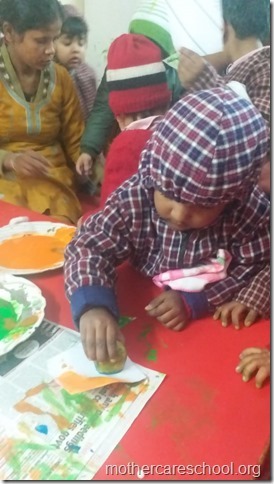 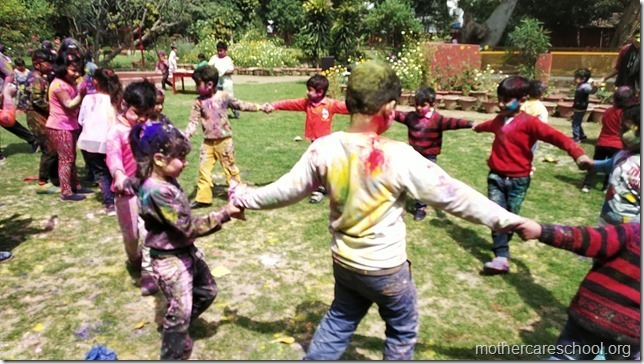 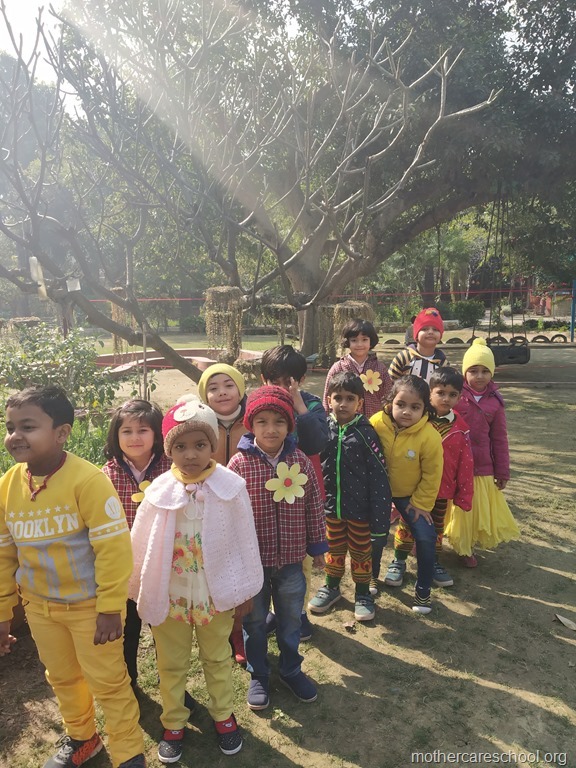 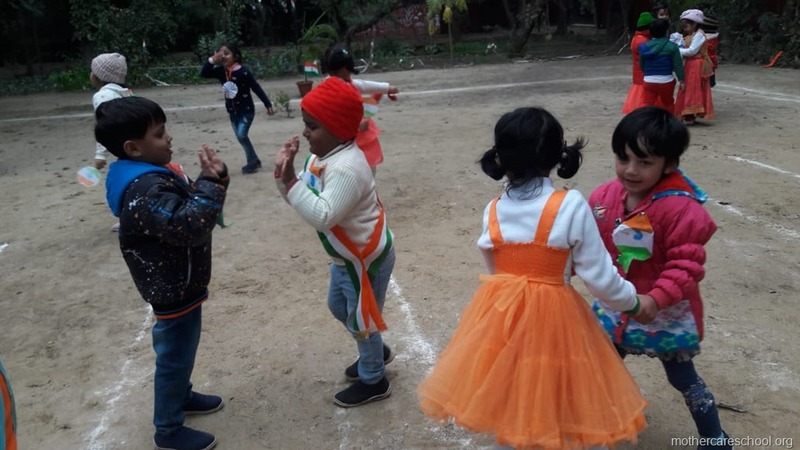 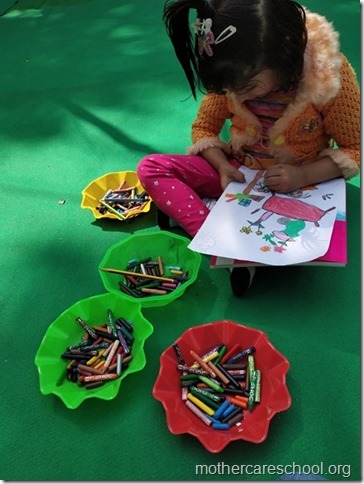 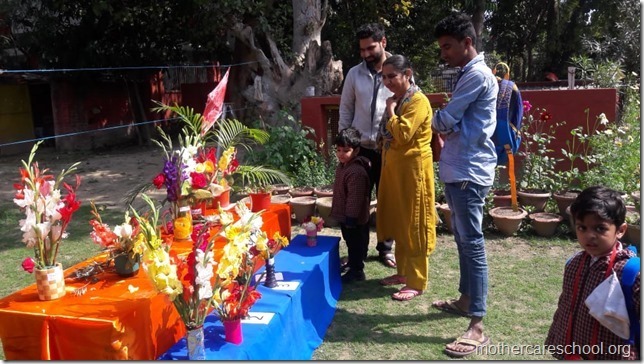 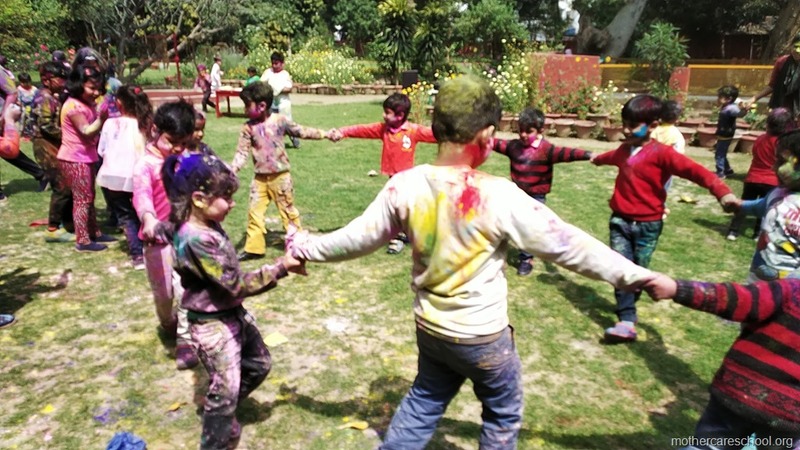 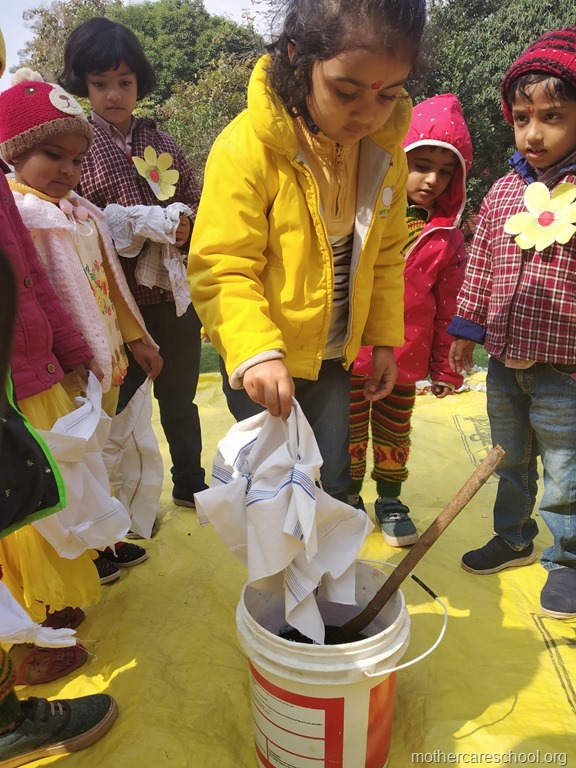 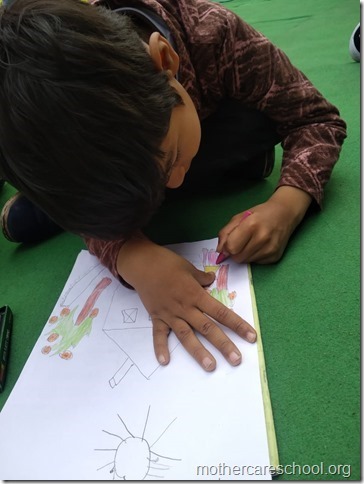 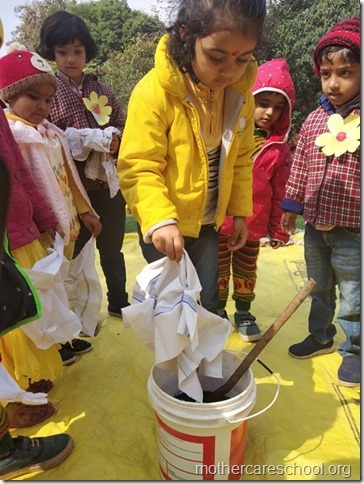 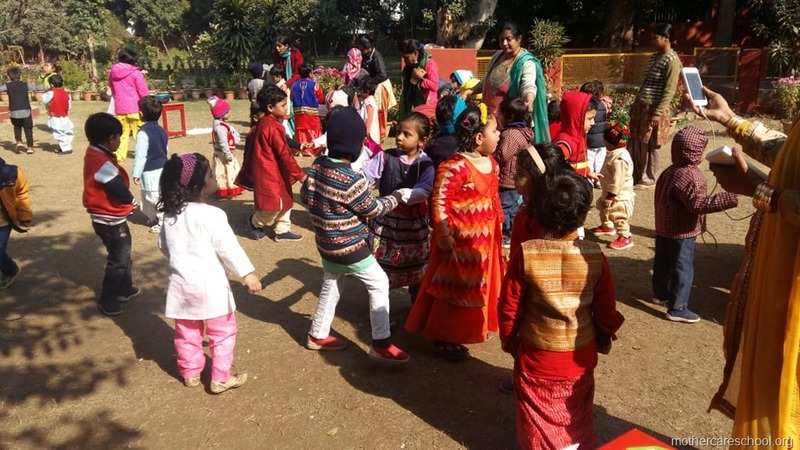 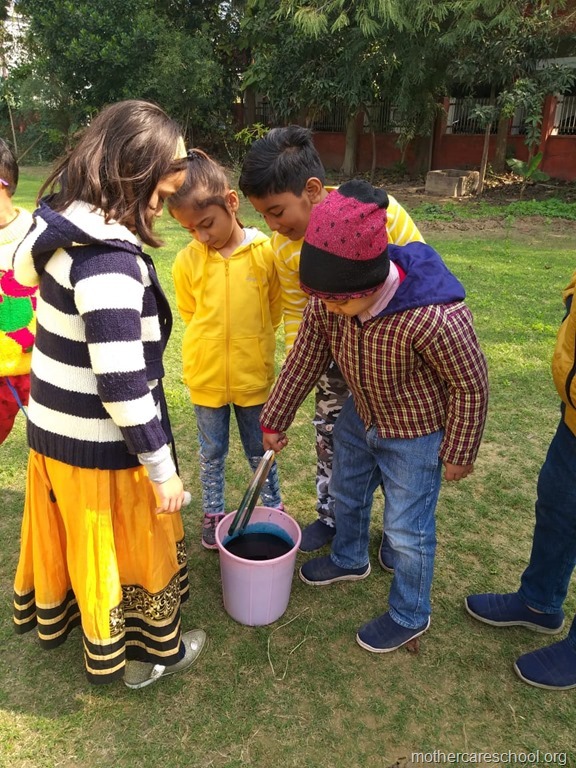 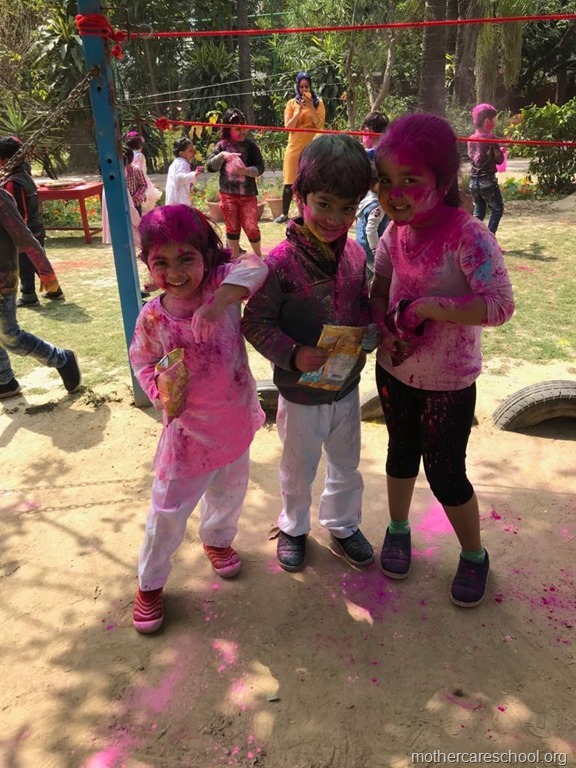 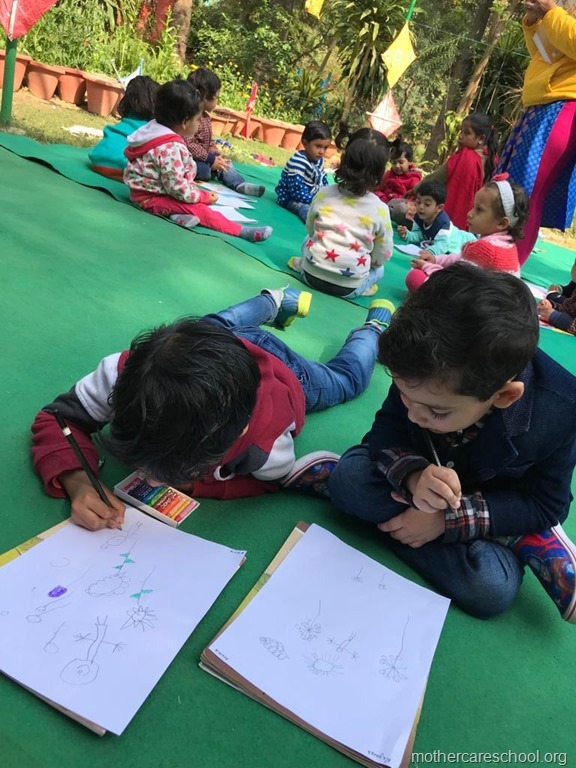 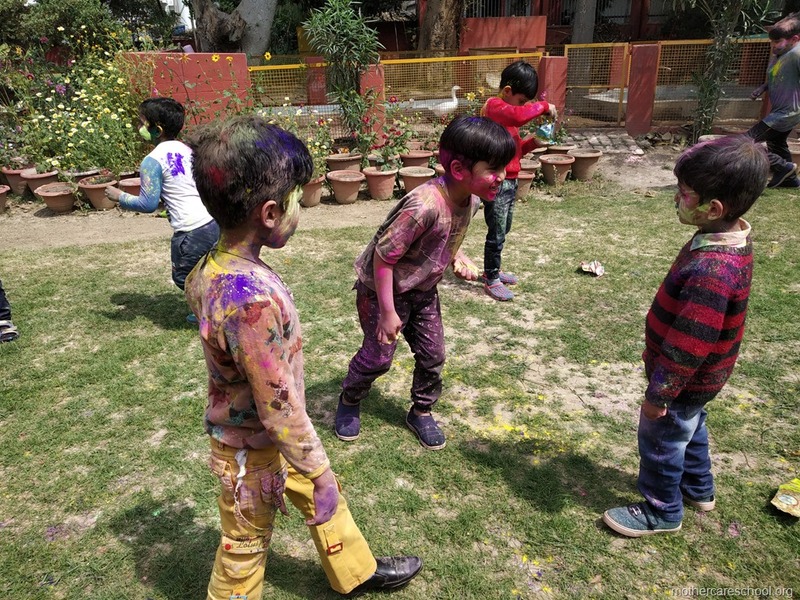 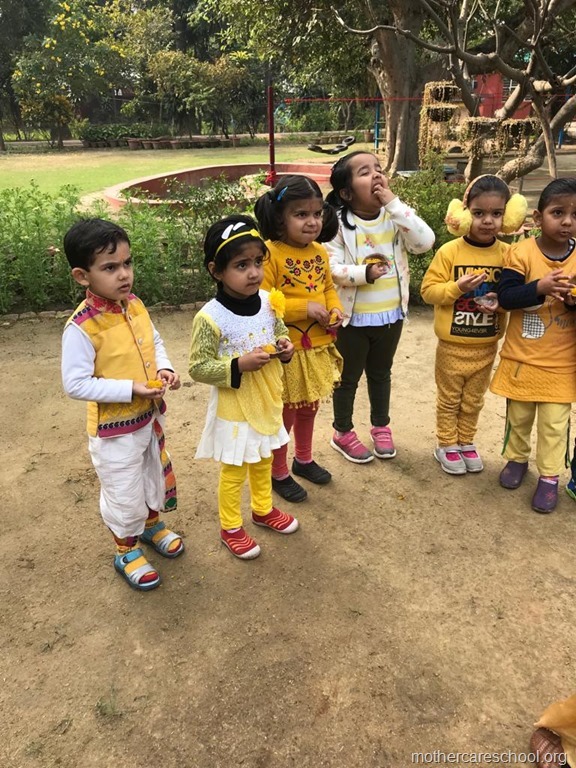 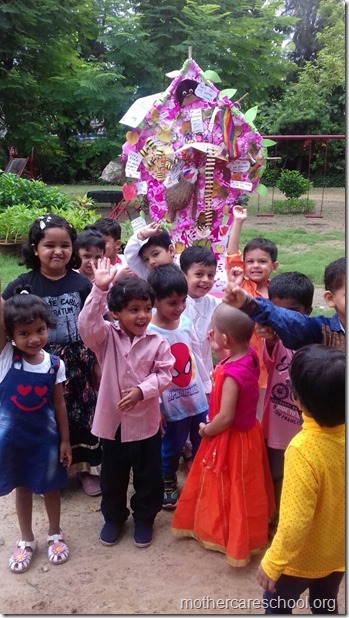 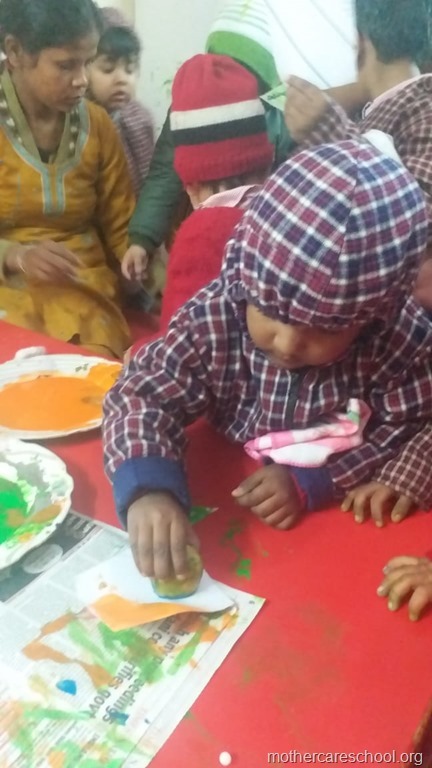 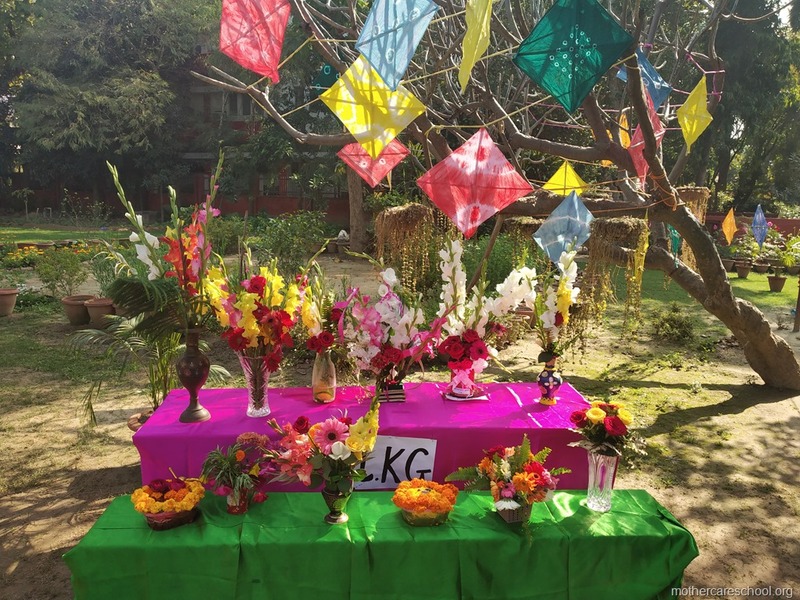 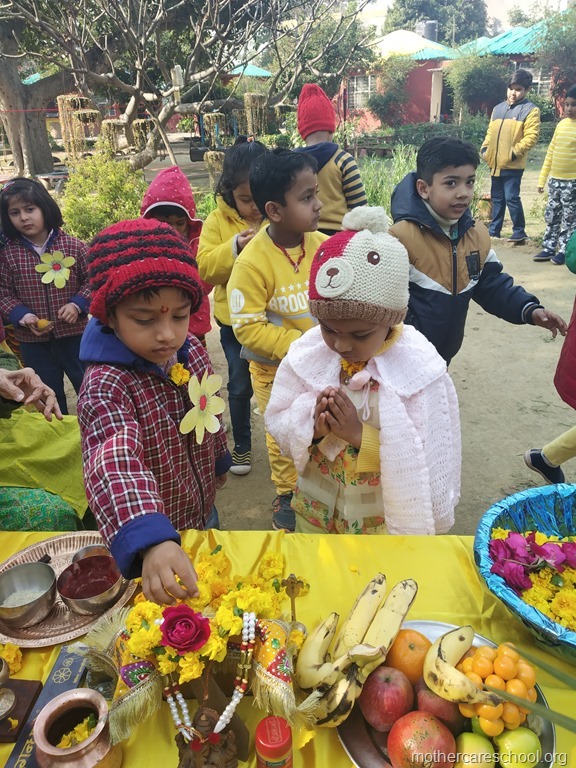 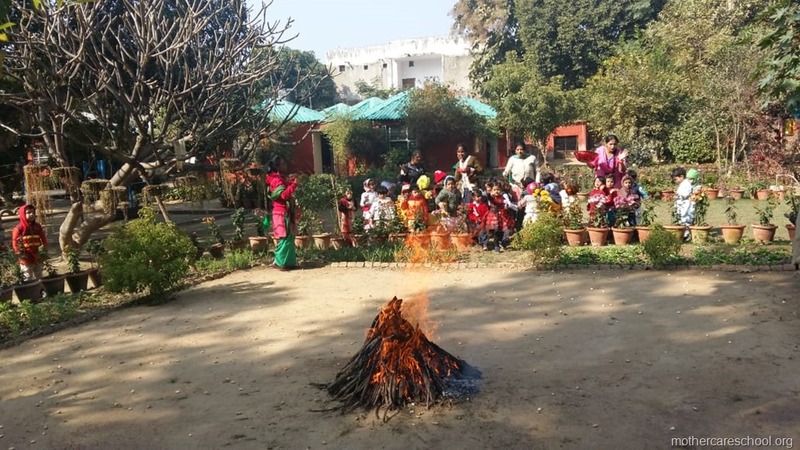 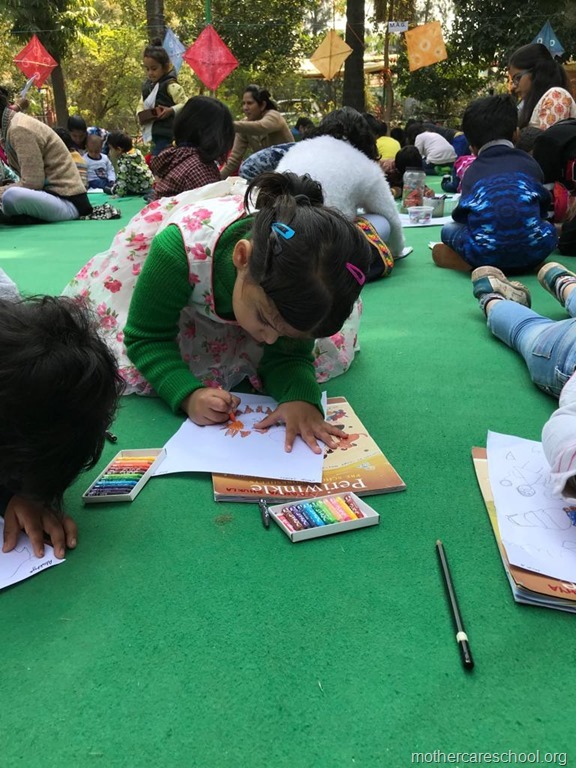 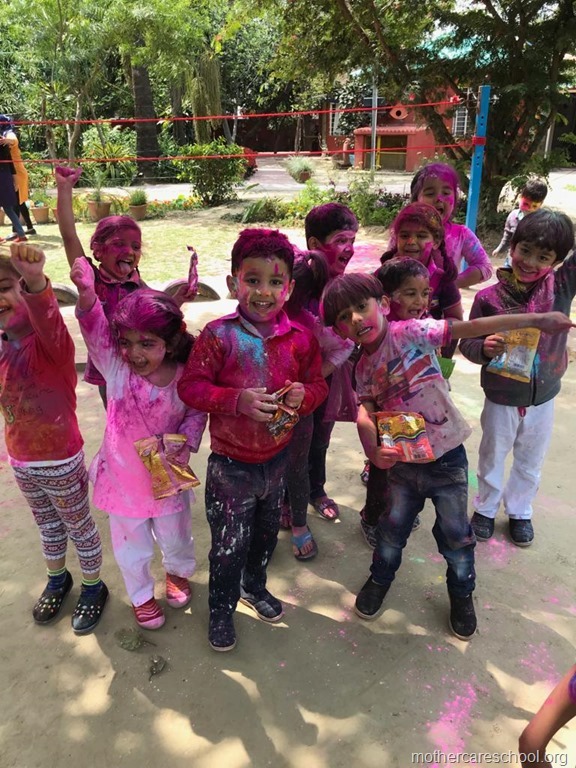 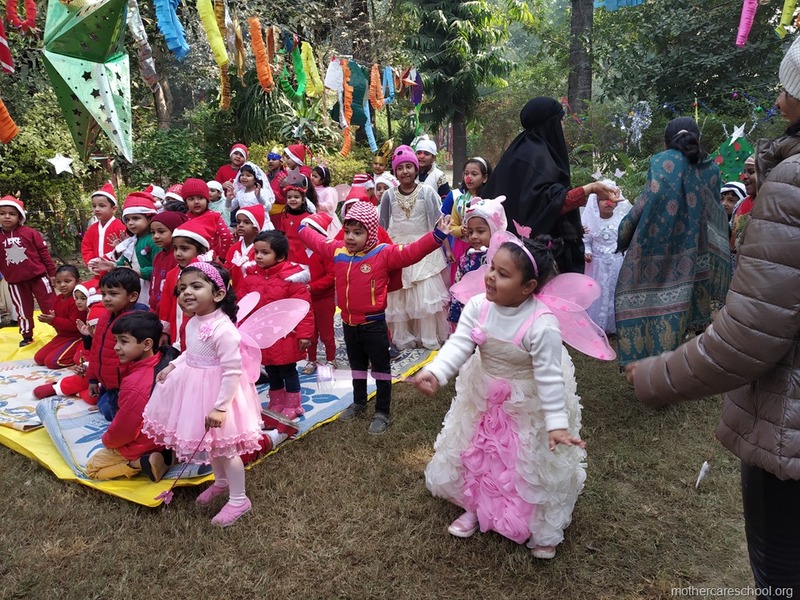 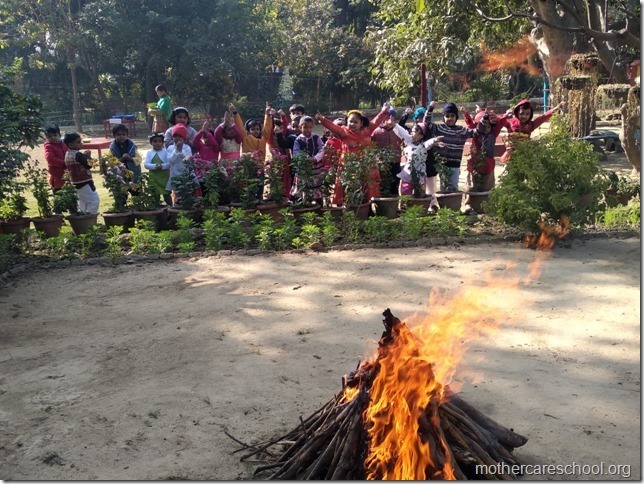 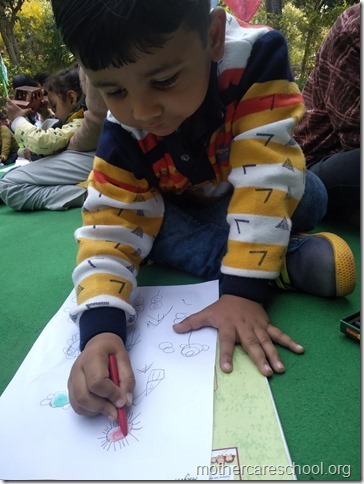 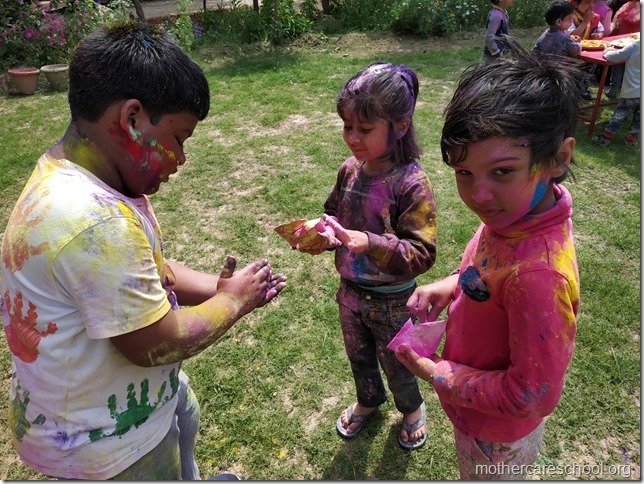 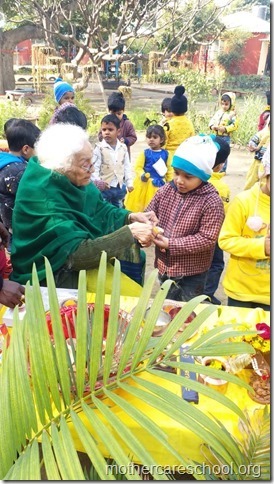 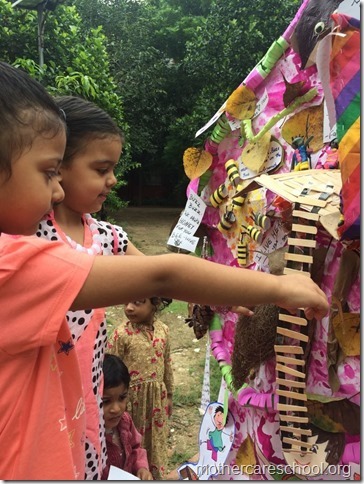 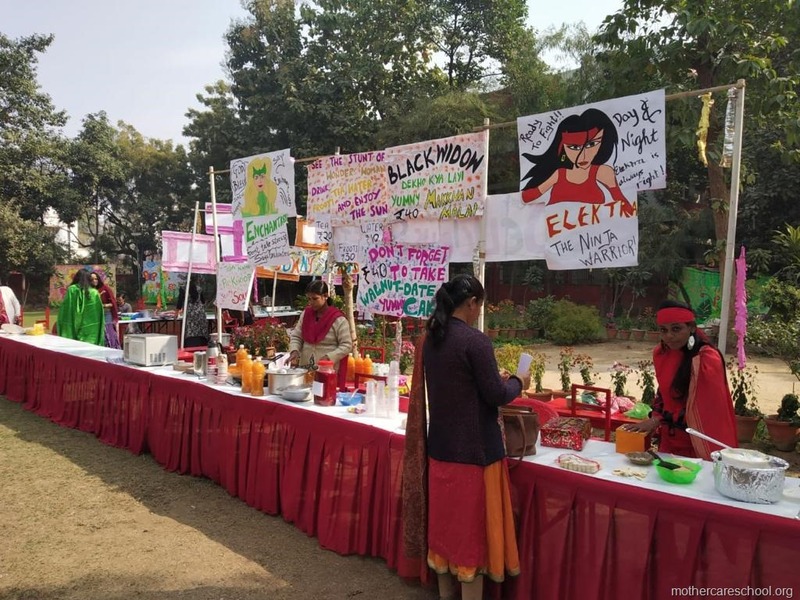 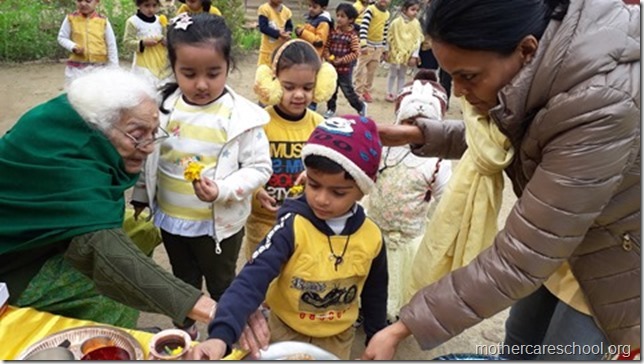 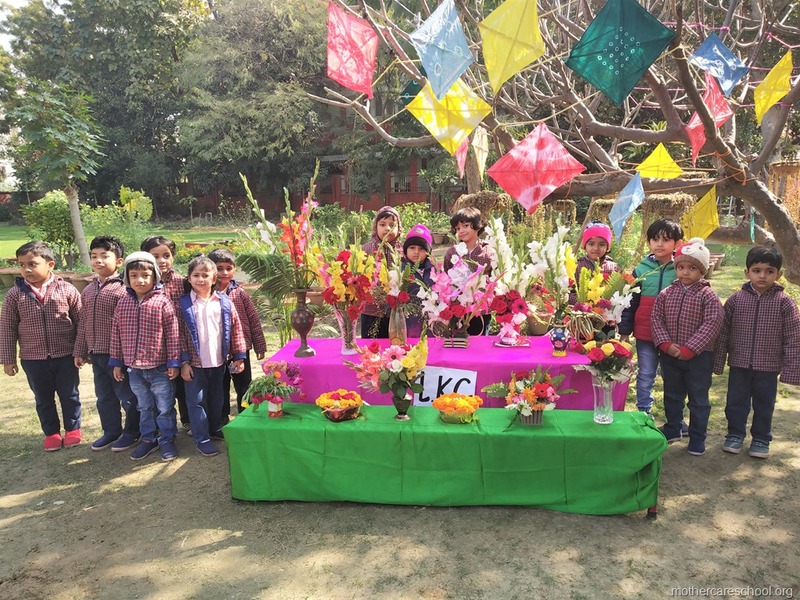 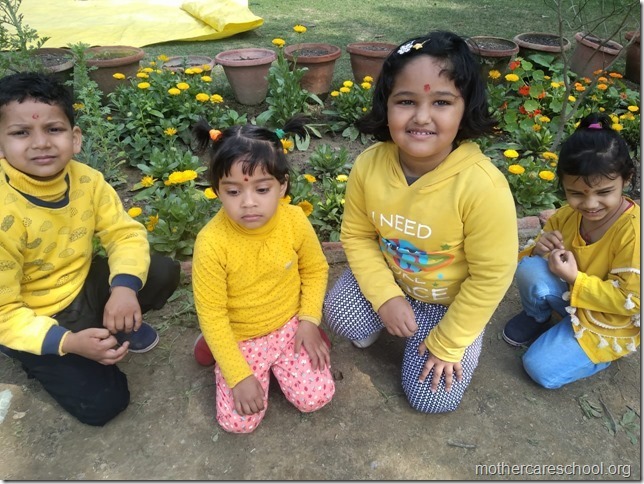 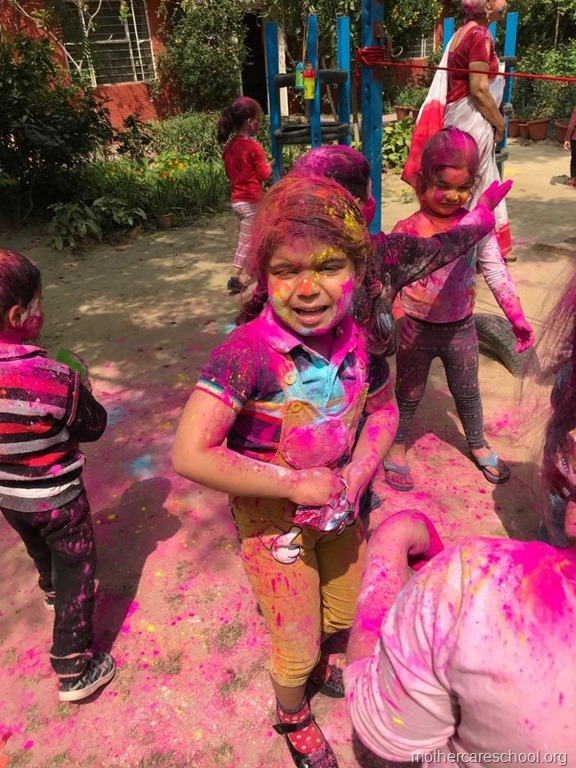 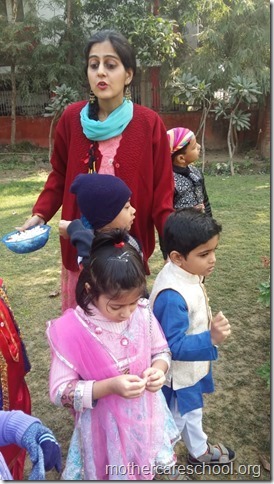 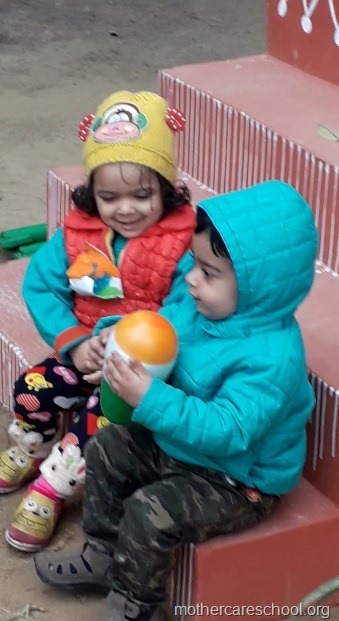 Basant panchmi celebrated with dyeing hankies in bright colours of all the blooming flowers in our Mothercare garden…. 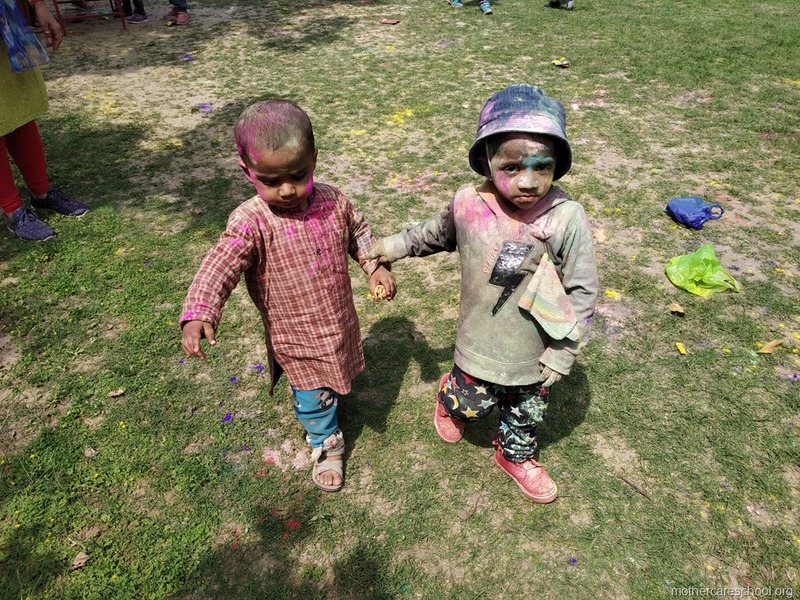 Our love with colours just goes on and on. 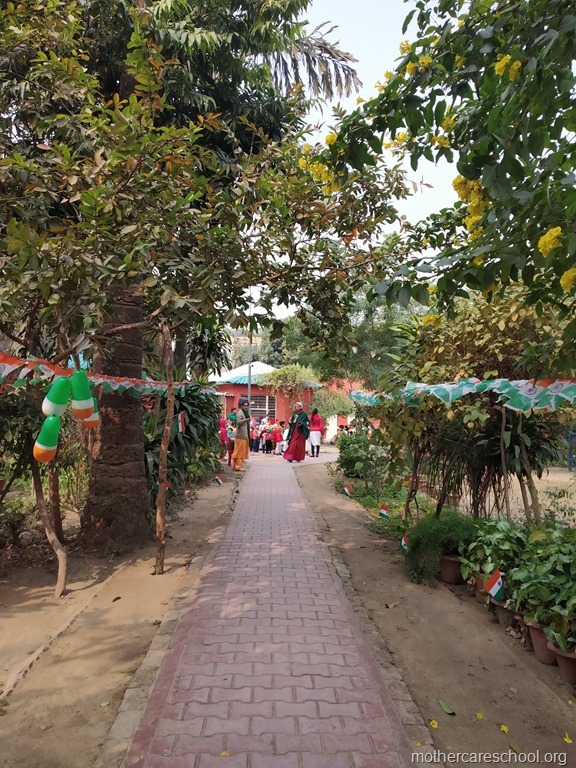 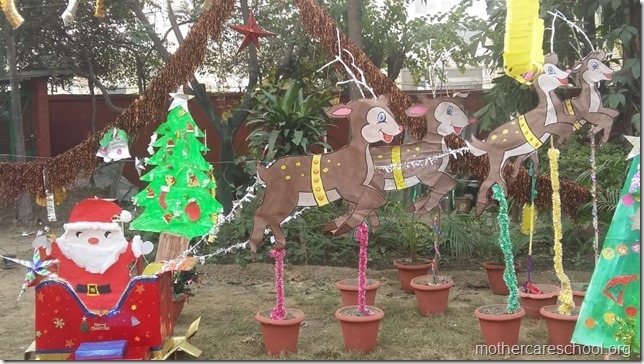 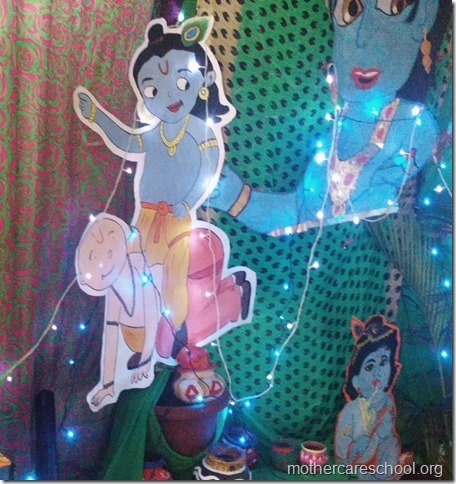 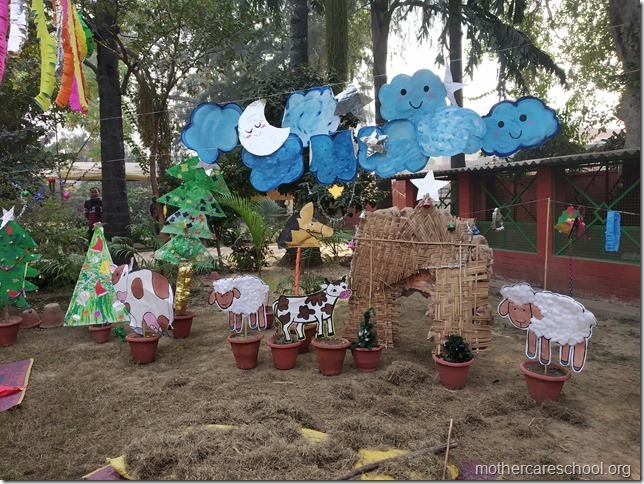 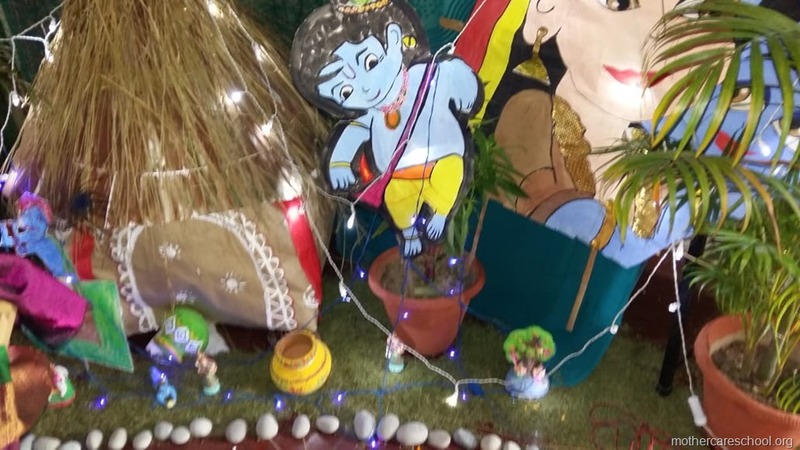 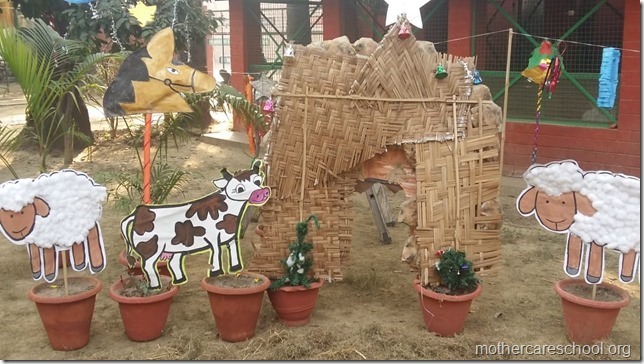 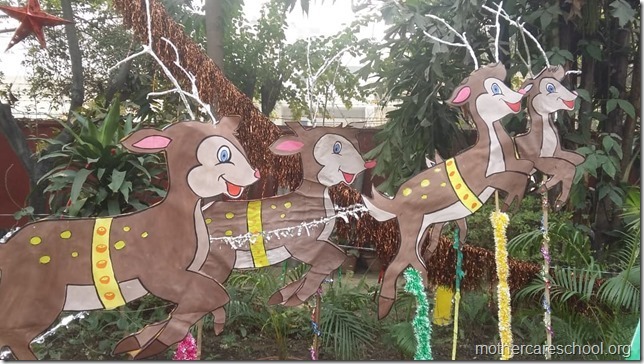 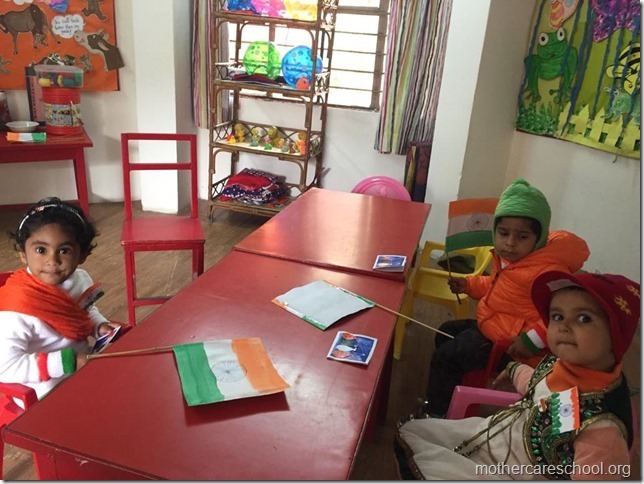 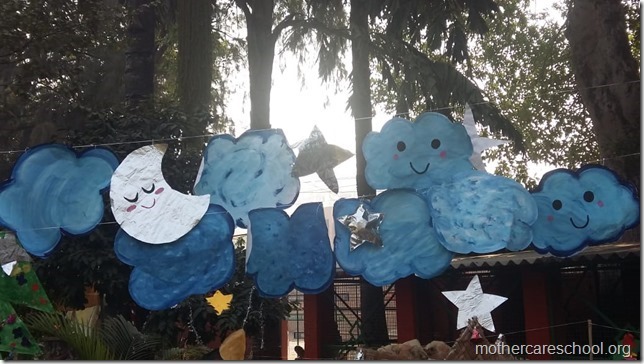 Mothercare school premises all decked up for the occasion. 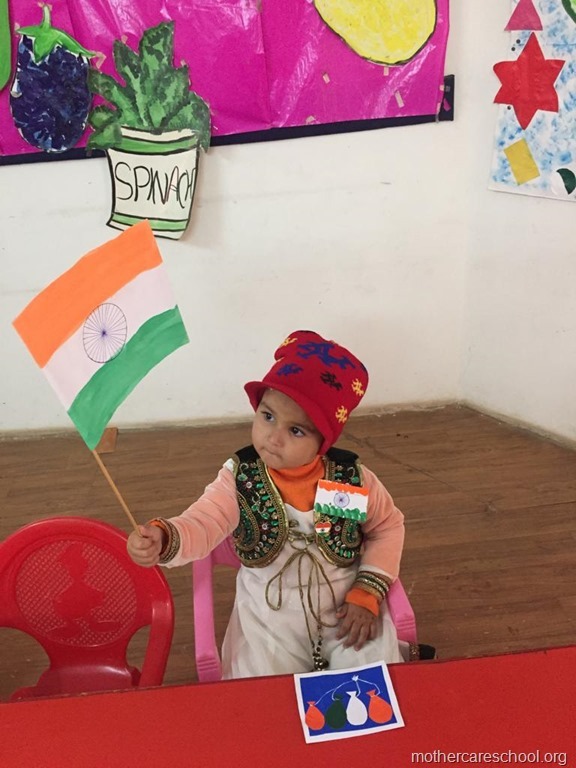 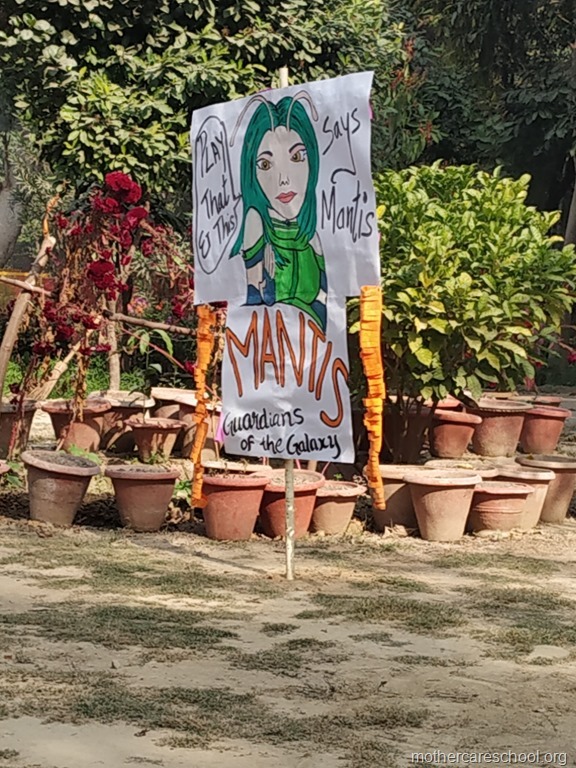 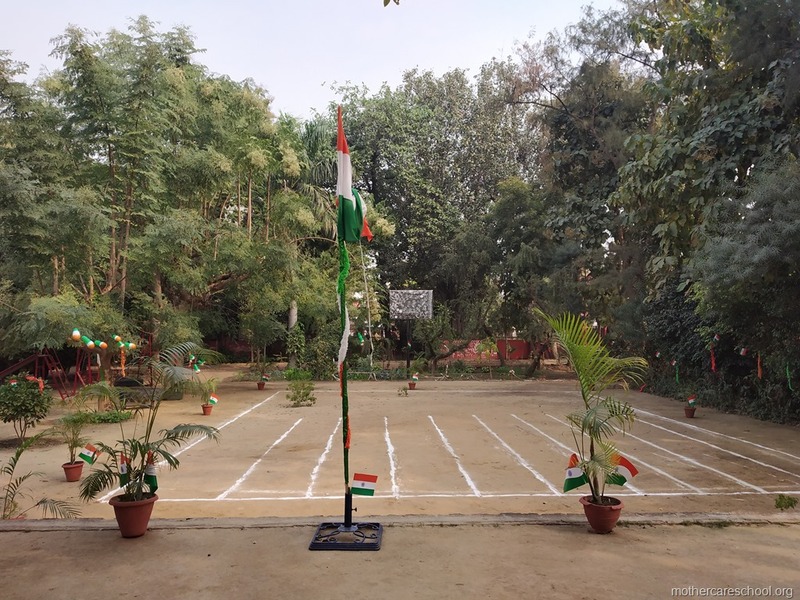 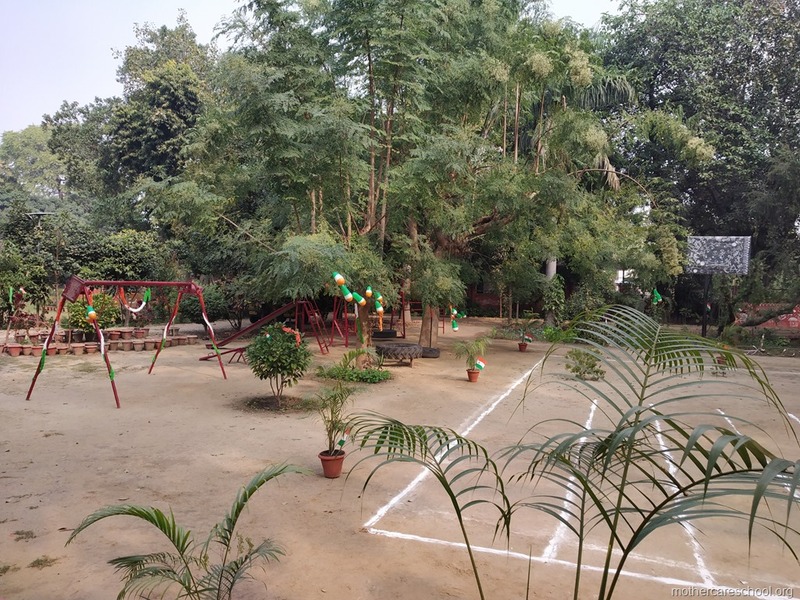 All set to inspire the children to celebrate their Republic Day. The young ones know where and how they have to march and salute their flag. 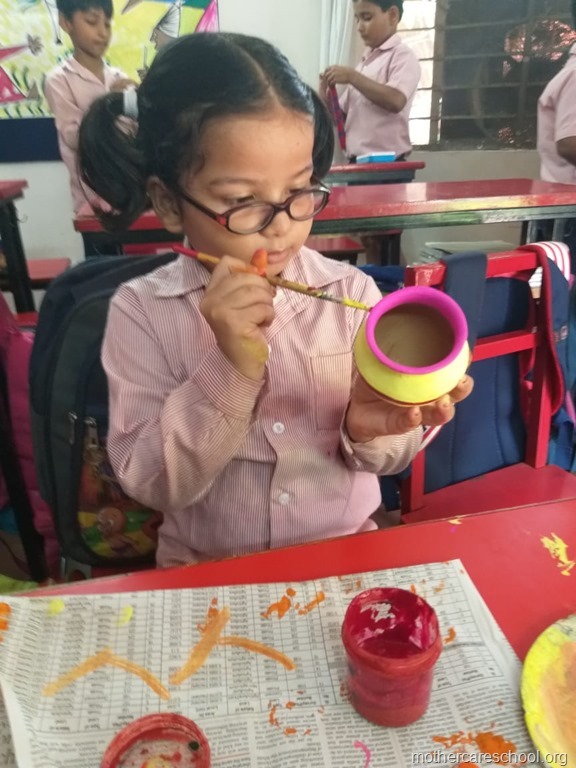 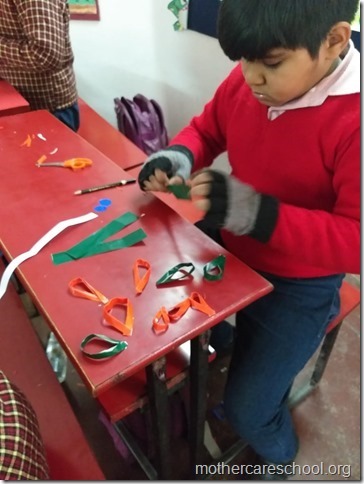 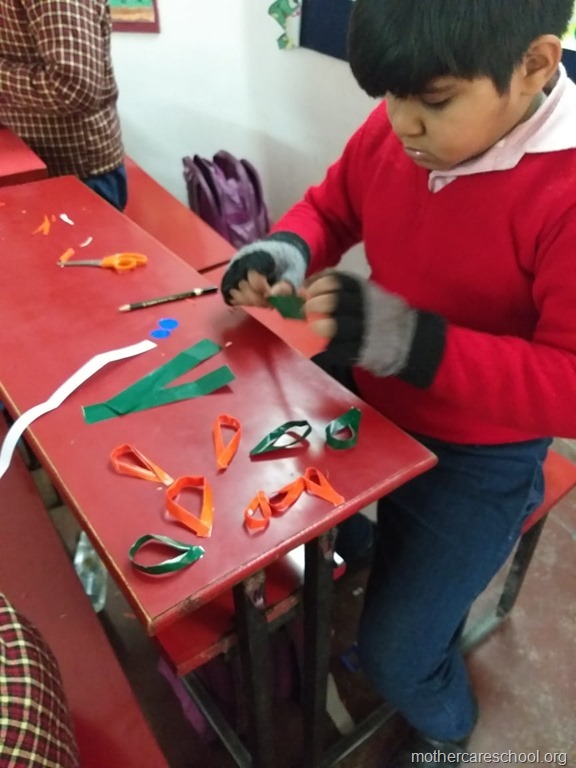 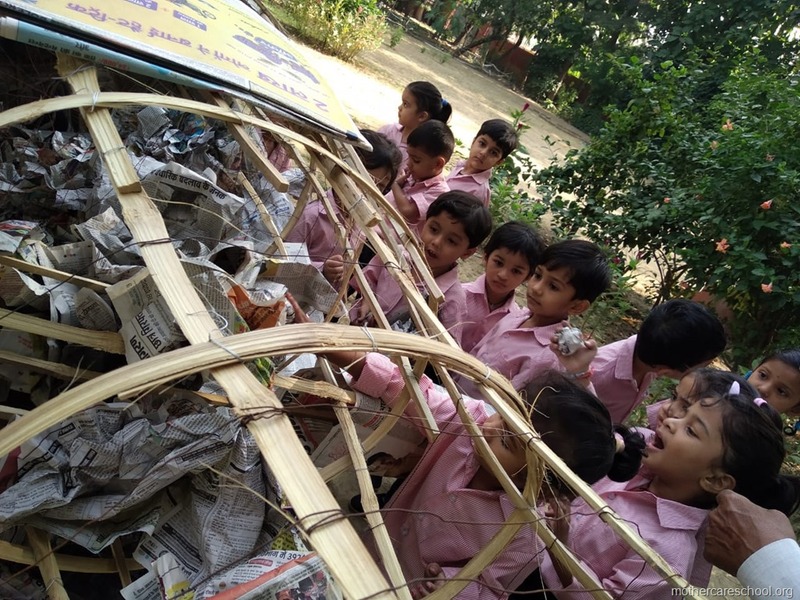 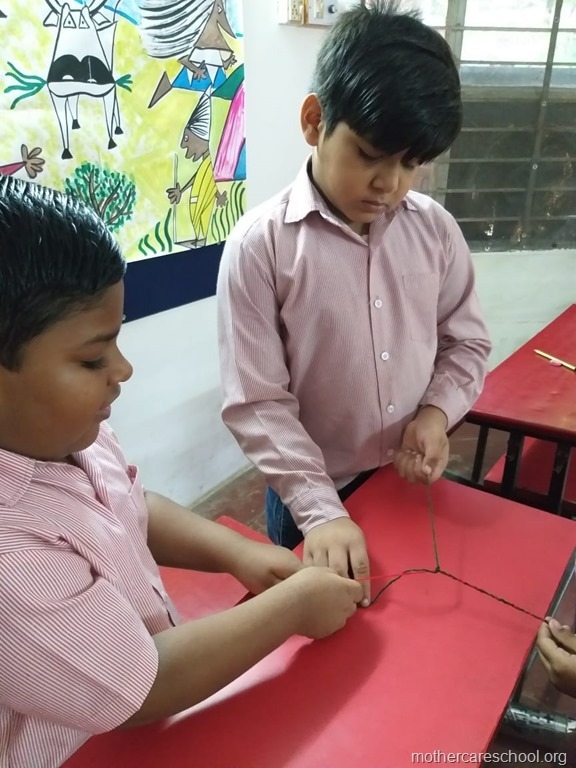 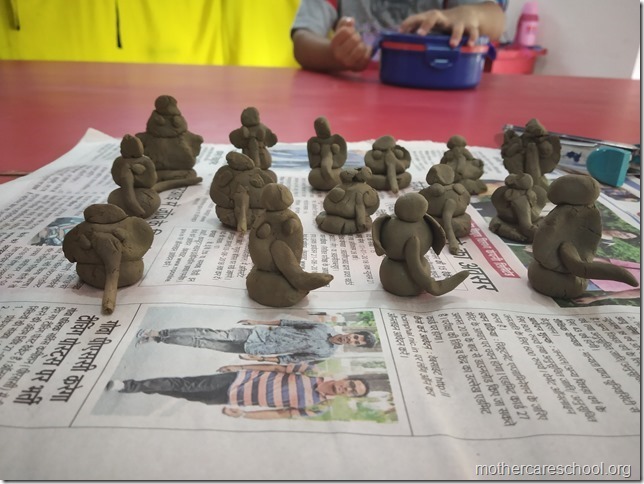 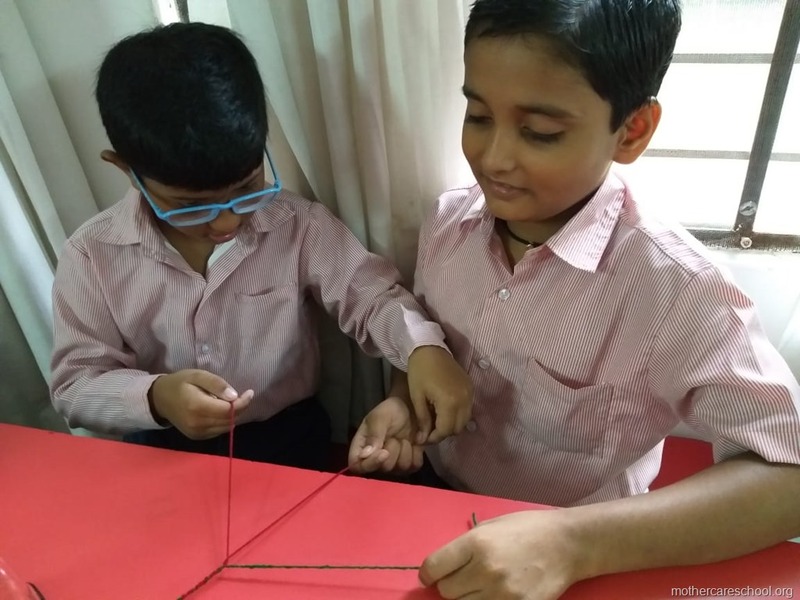 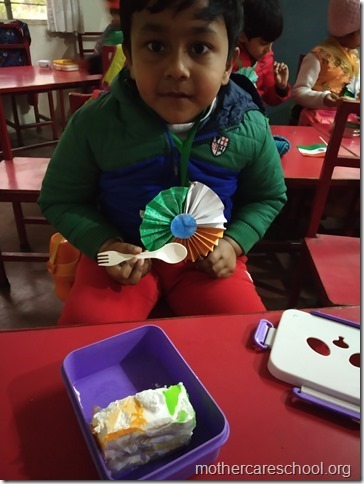 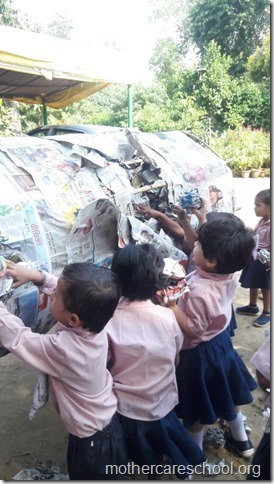 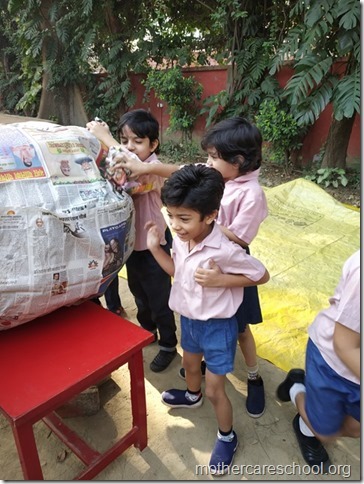 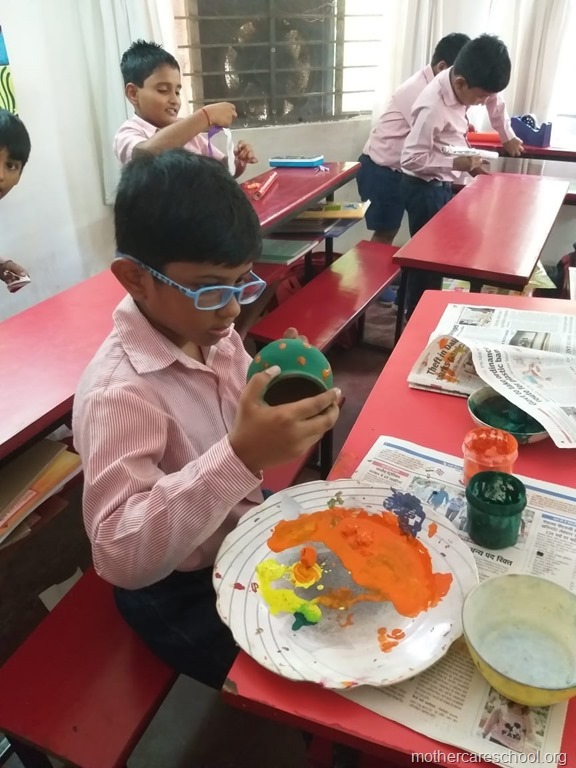 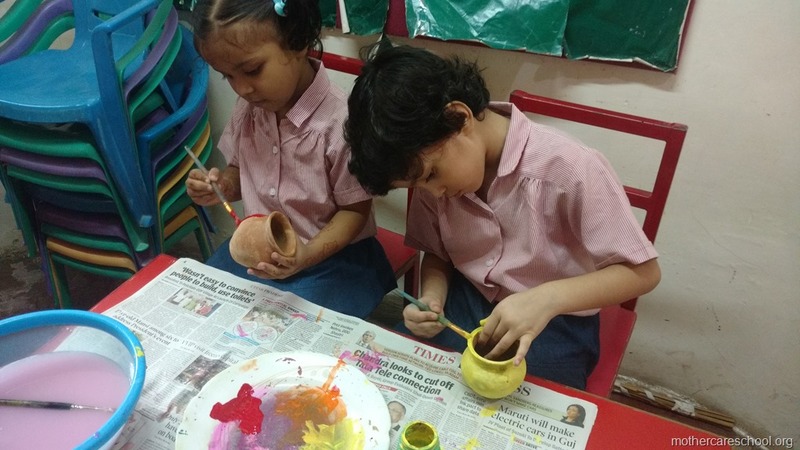 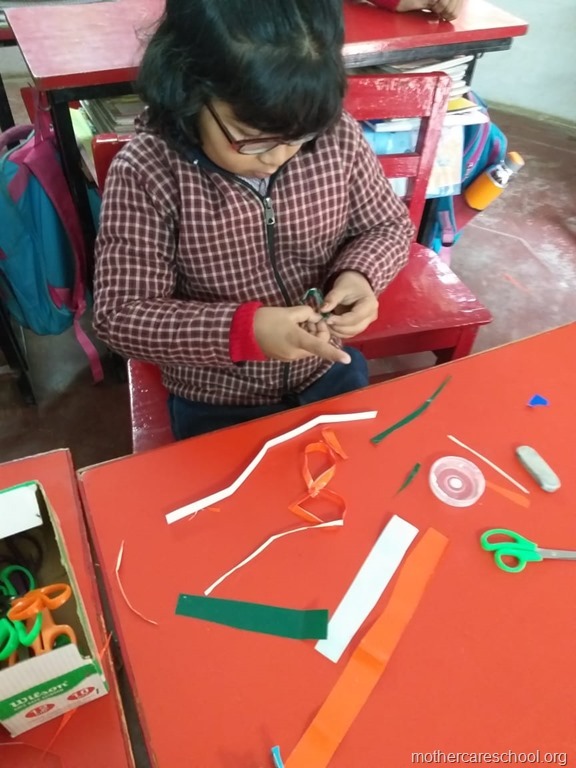 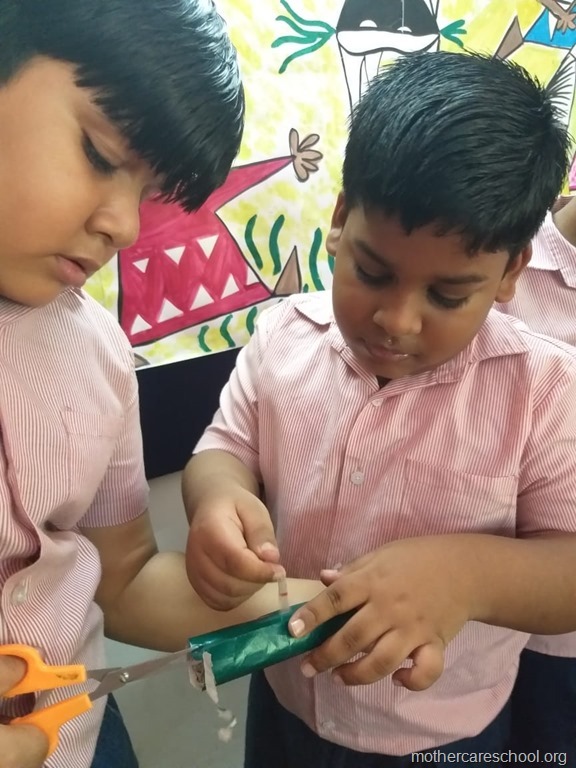 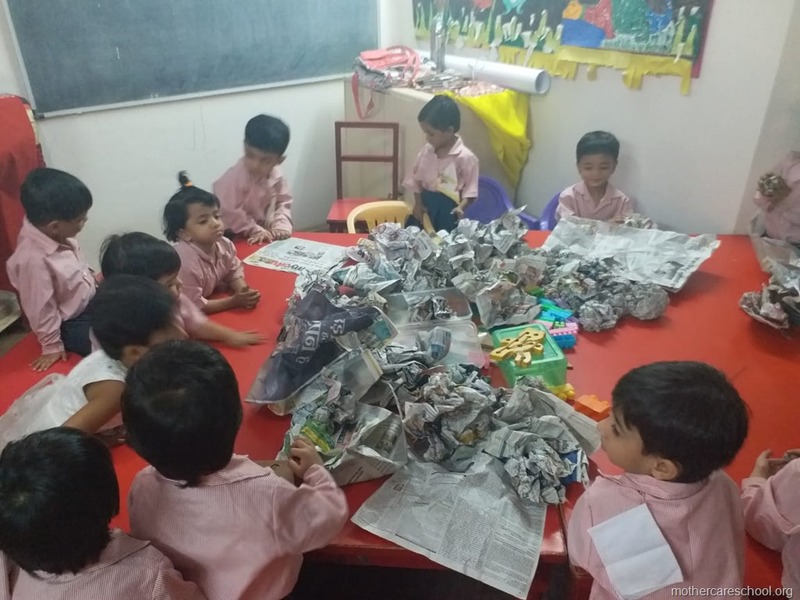 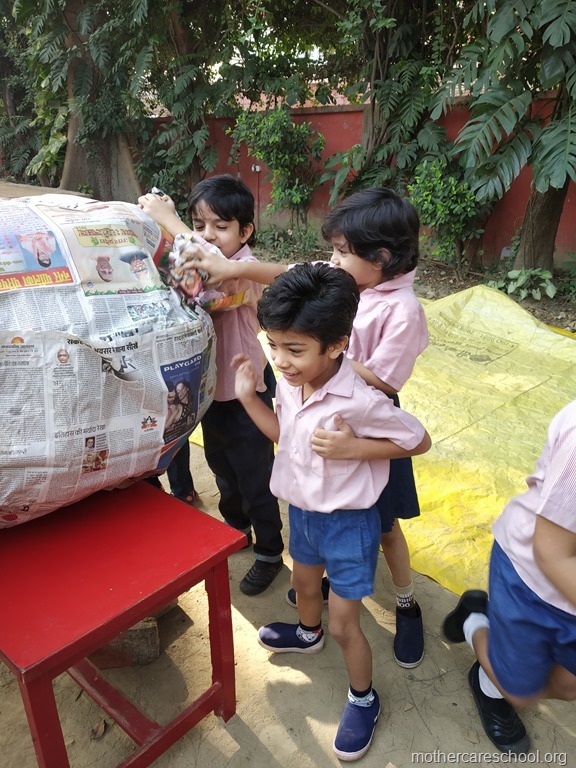 Involved in making their class accessory for Republic Day. 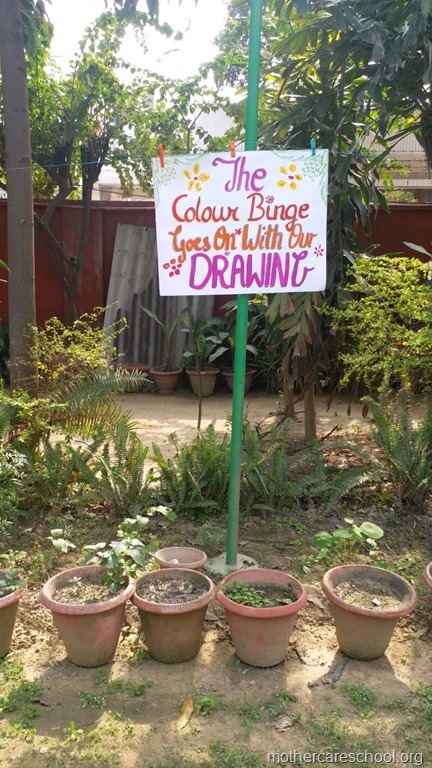 with dabbing, drawings and paintings. 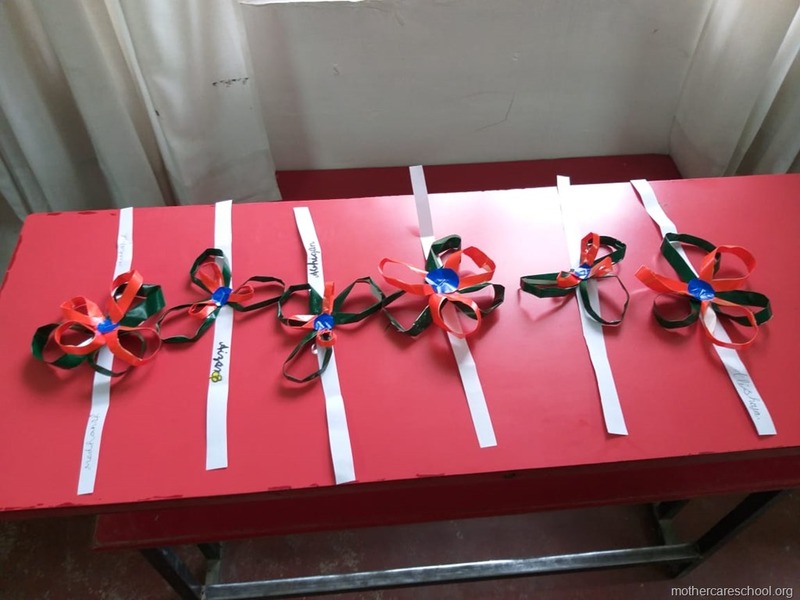 and making these beautiful bracelets…with the flag colours. 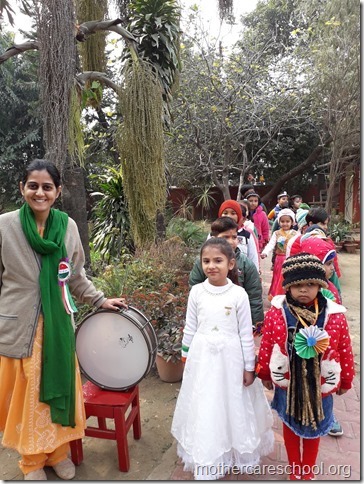 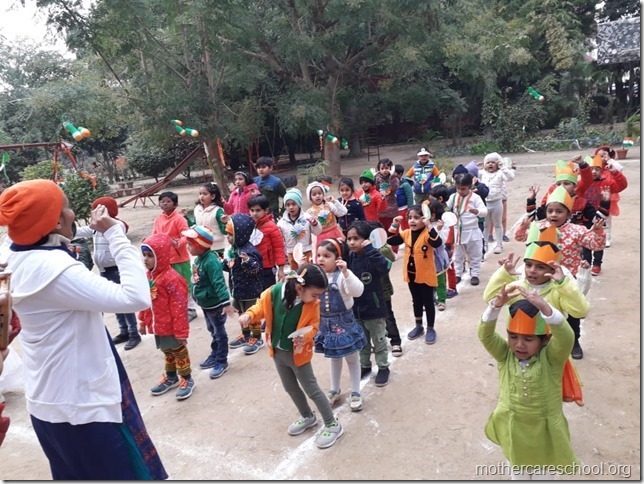 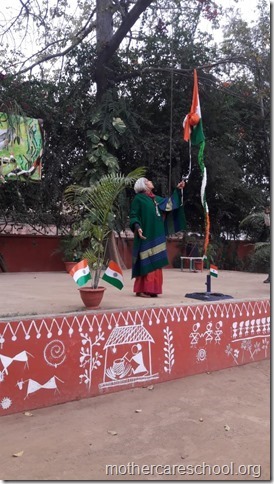 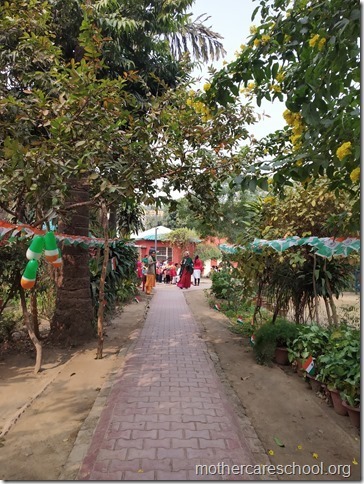 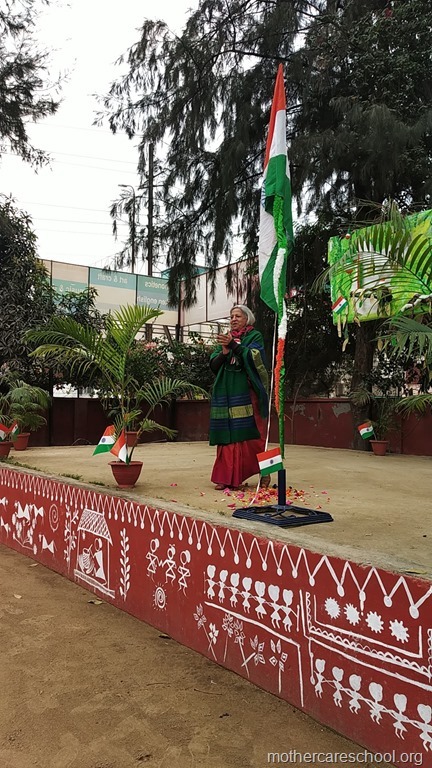 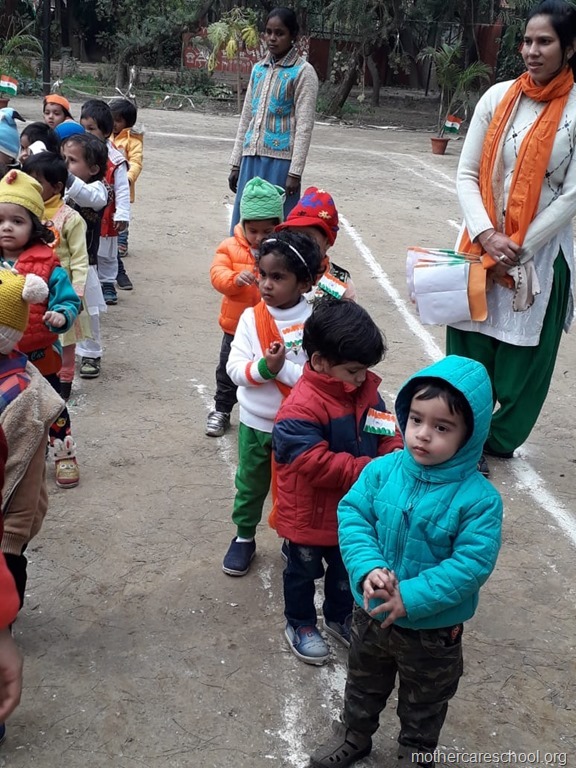 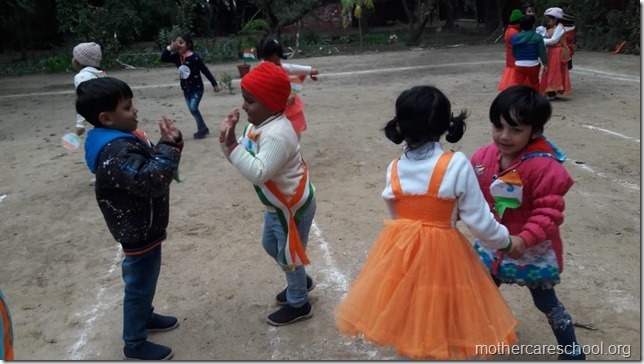 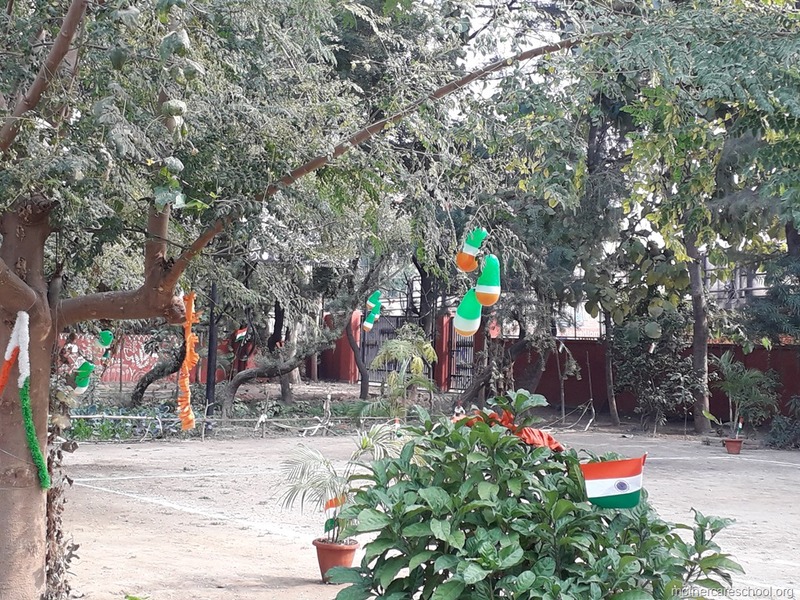 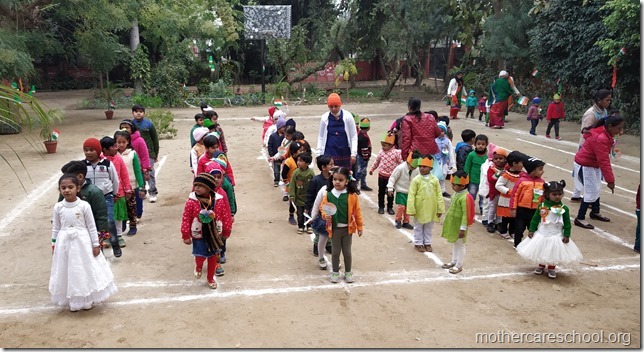 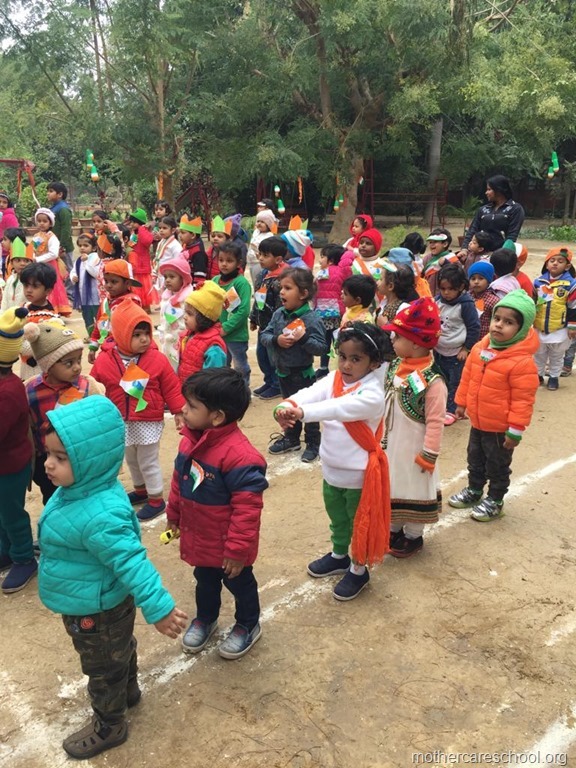 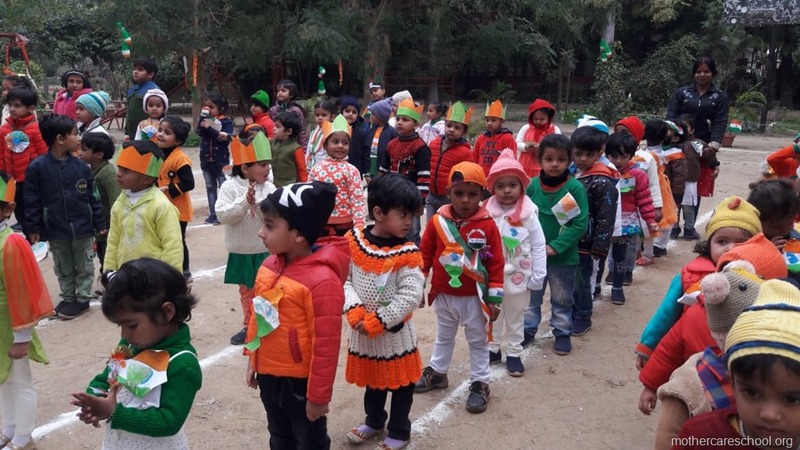 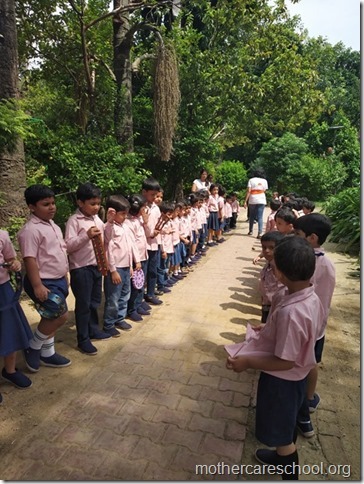 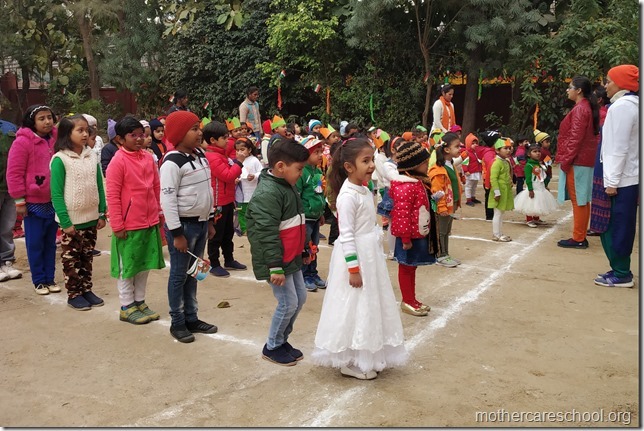 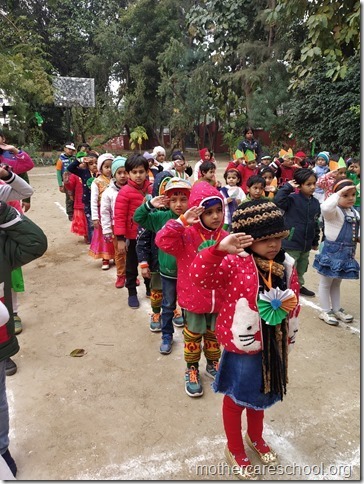 Flag hoisting by Ms. Shobha Dev…..all attired in the tricolours. With their handmade accessories on display. 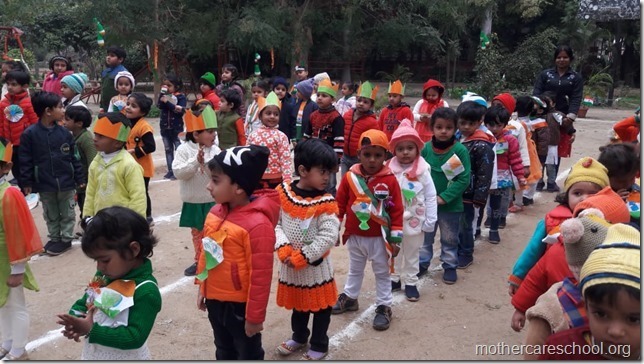 Saare jahan se accha Hindustan humara…. 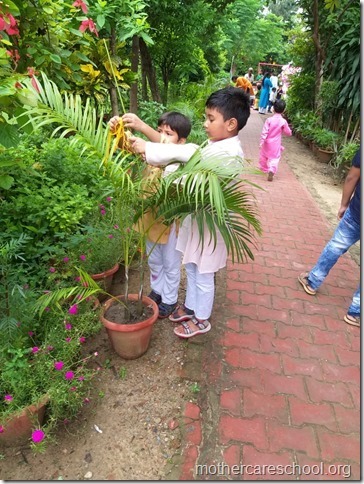 Parvat wo sabse unchaa….humsaya aasman ka…. 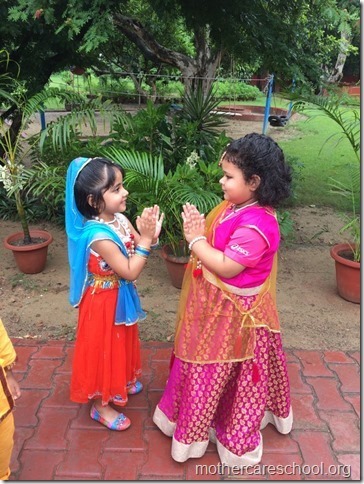 Nannhe Munne Bacche teri mutthi mein kya hai? 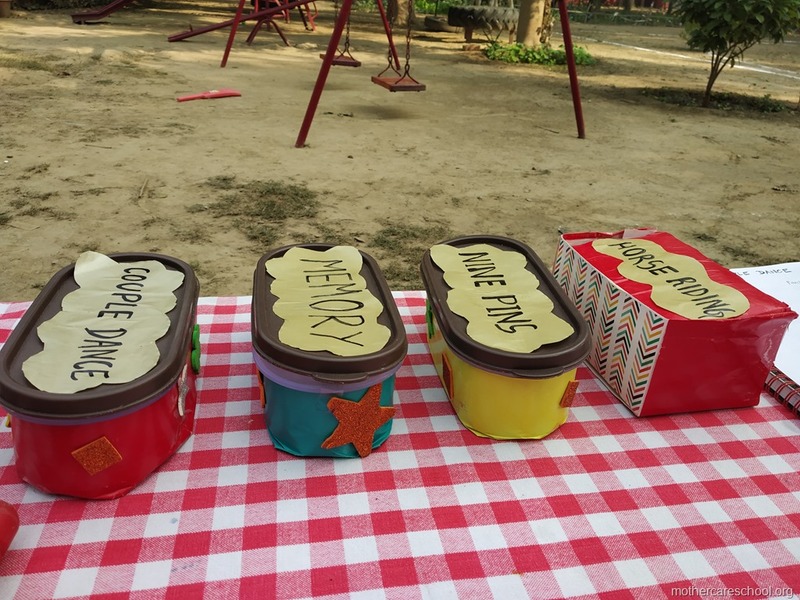 Even the tiffin that we got was in tricolours. 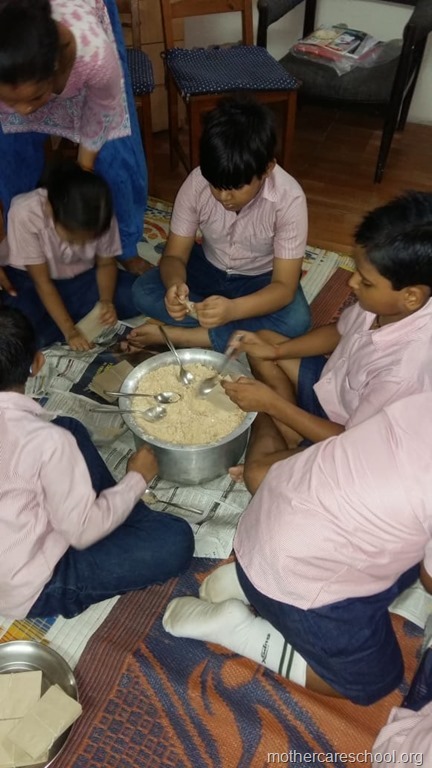 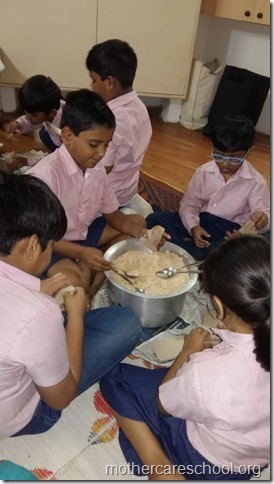 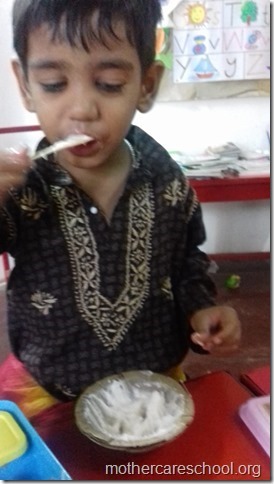 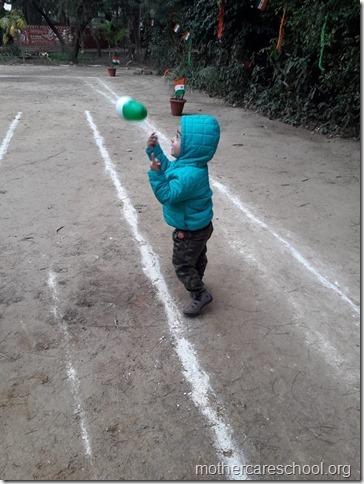 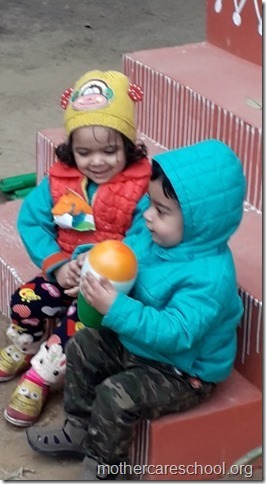 How I Loved my boondi…in the dona…with my lakdi ka chammach…. 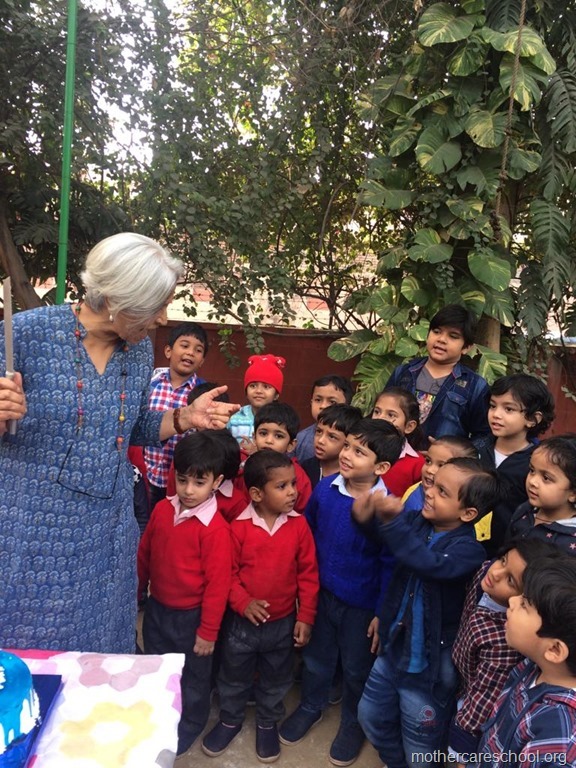 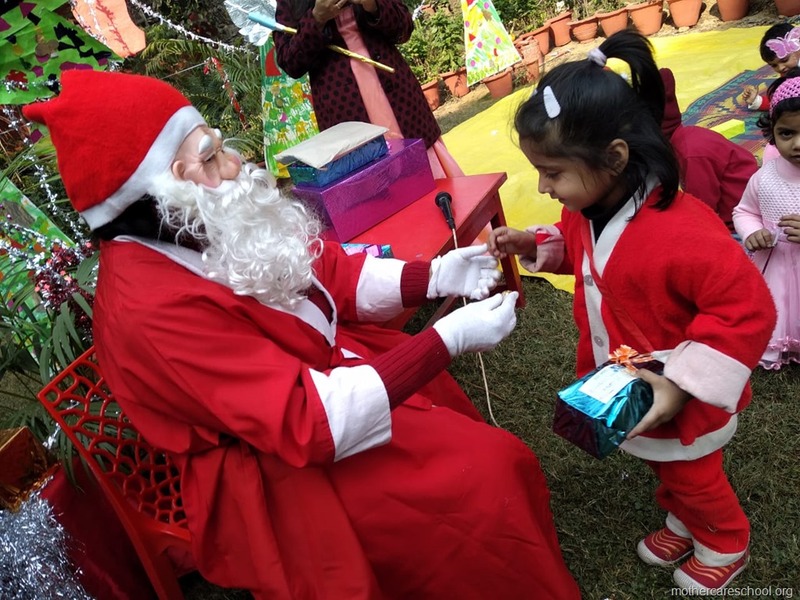 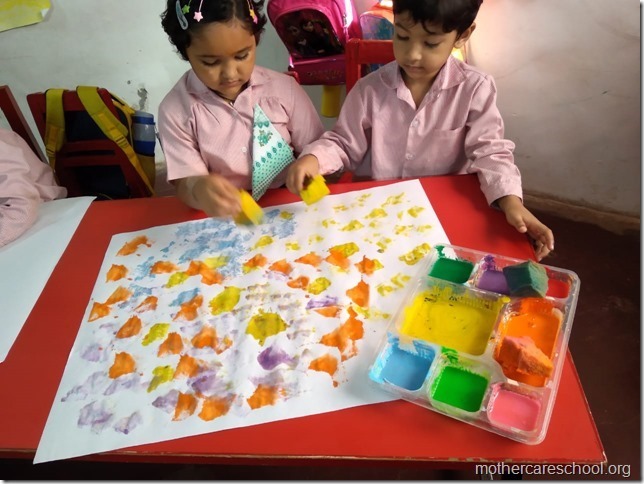 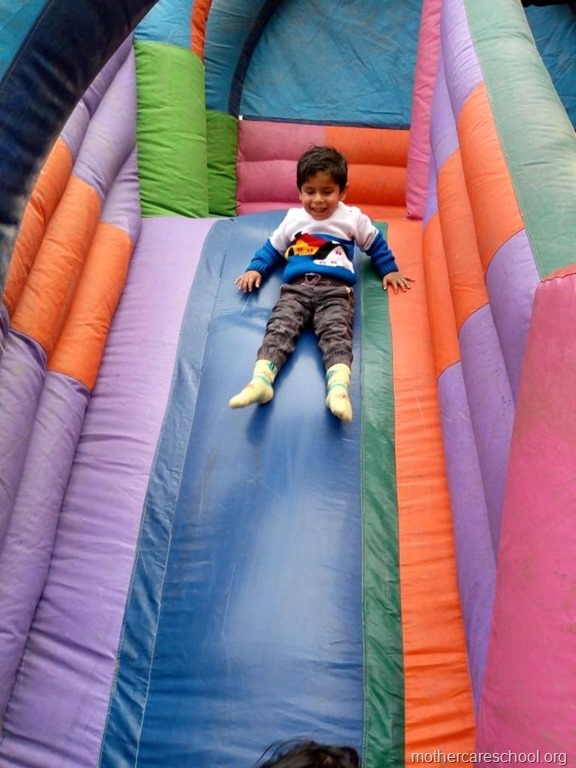 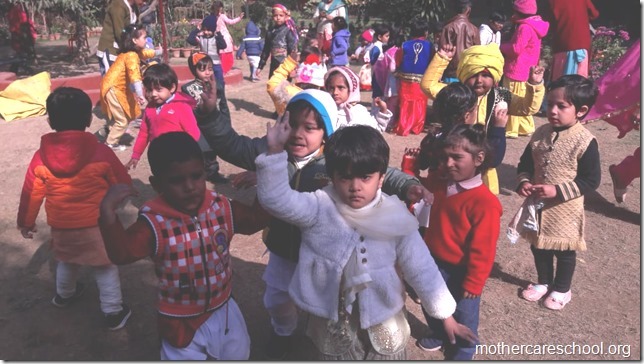 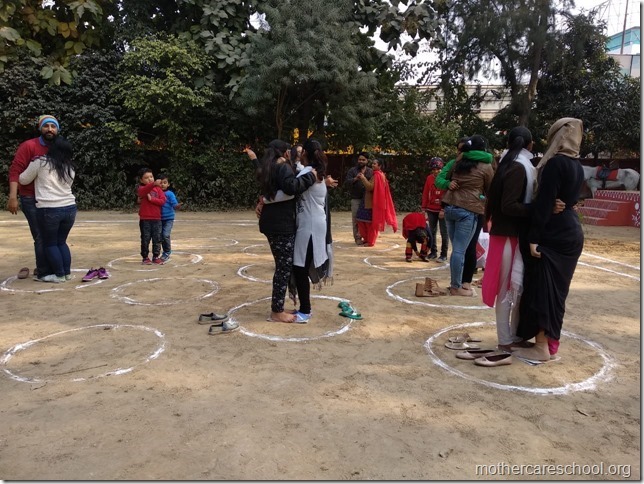 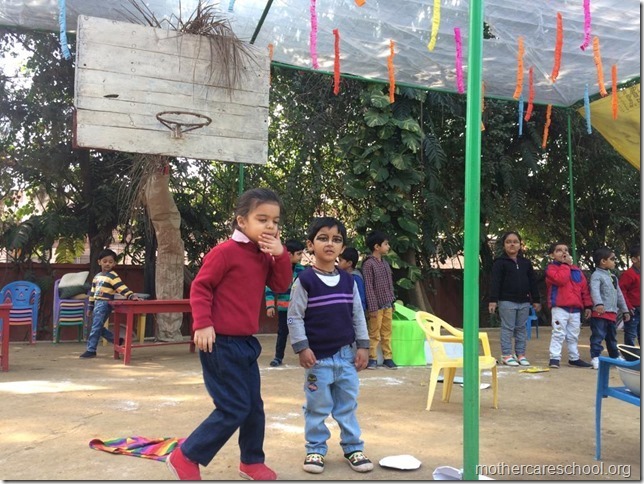 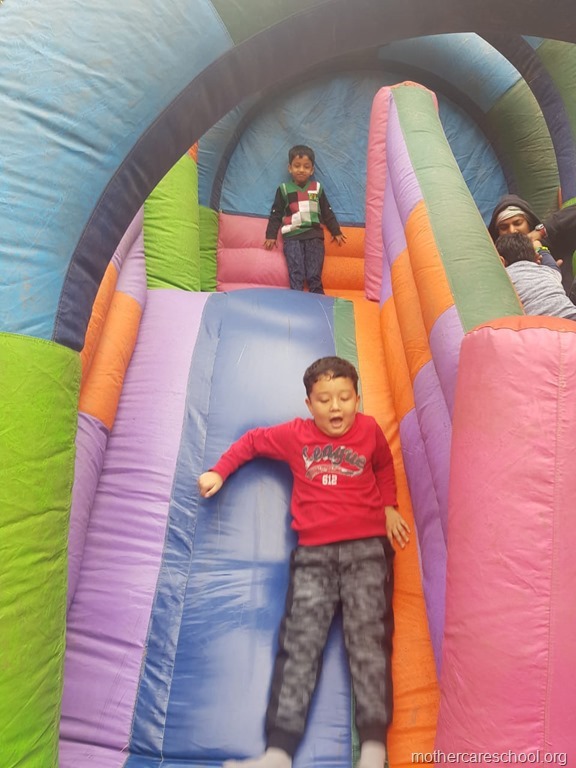 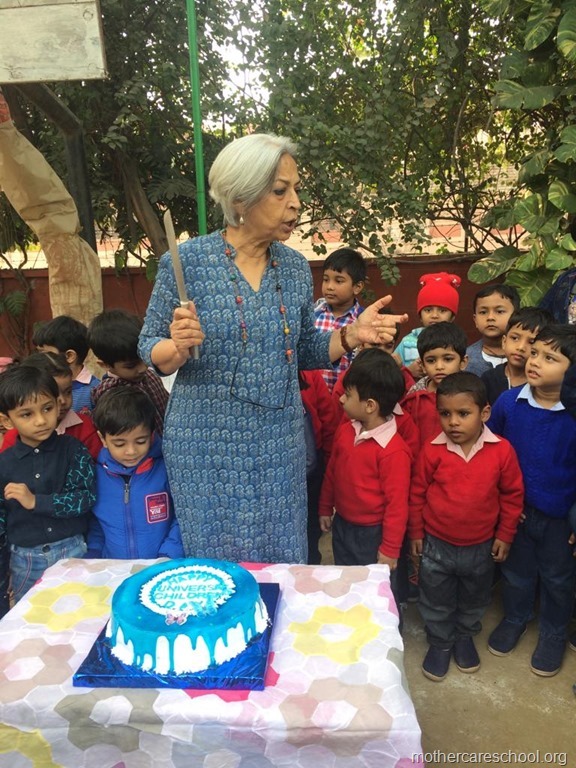 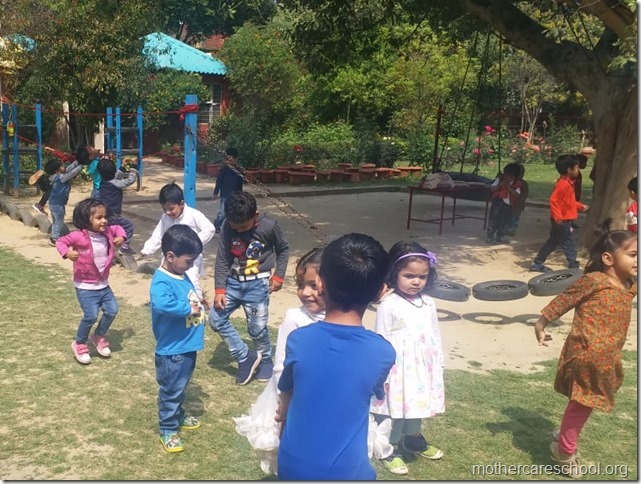 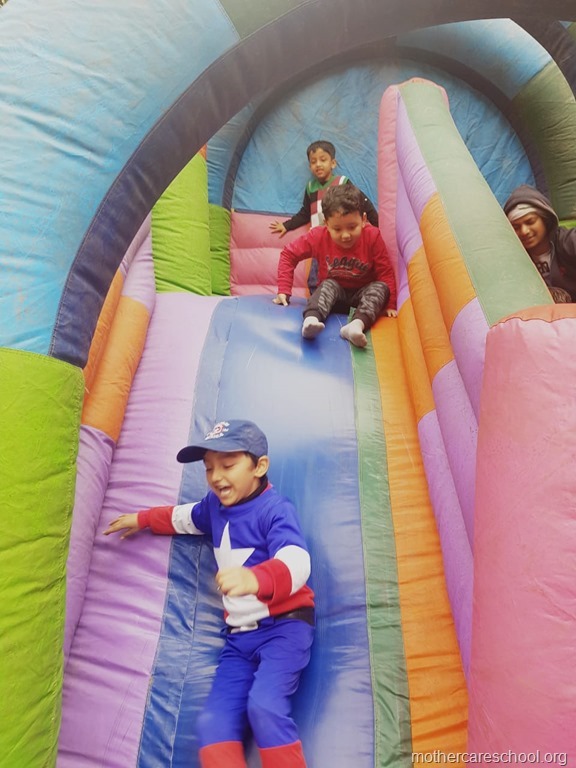 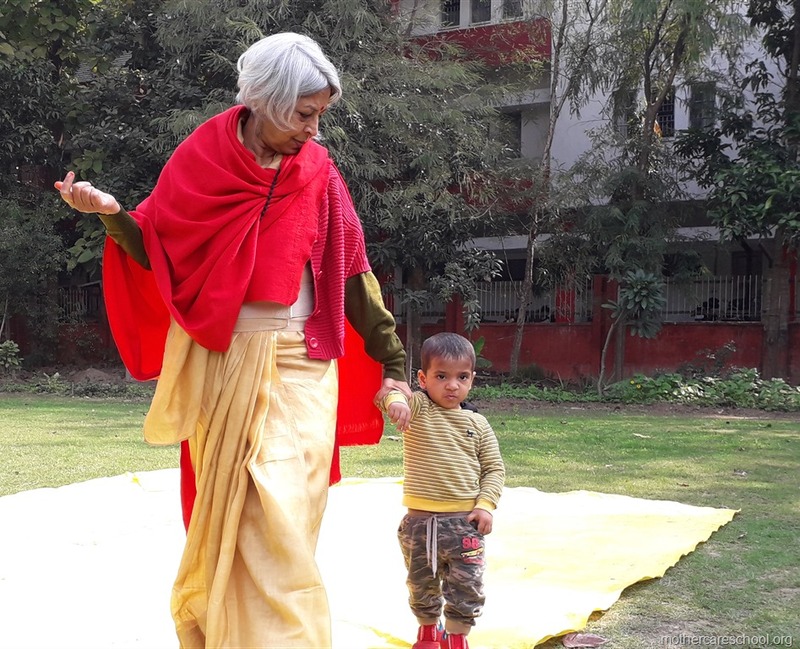 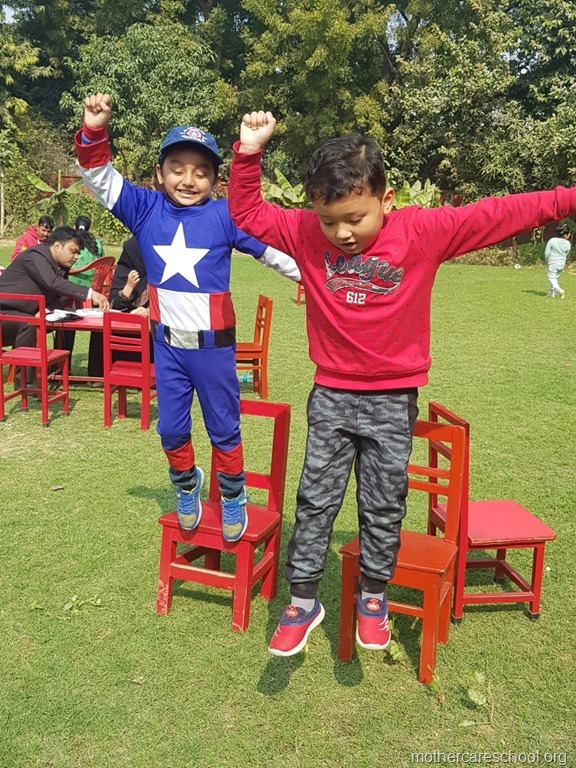 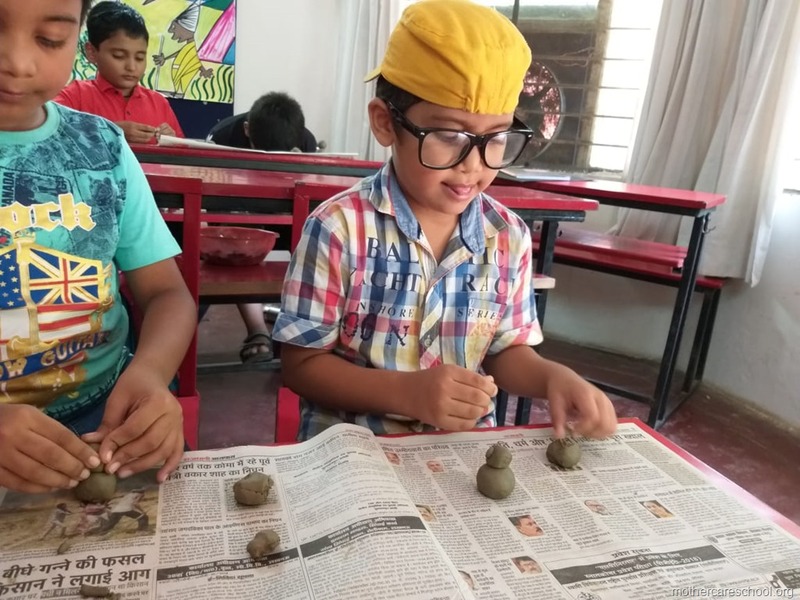 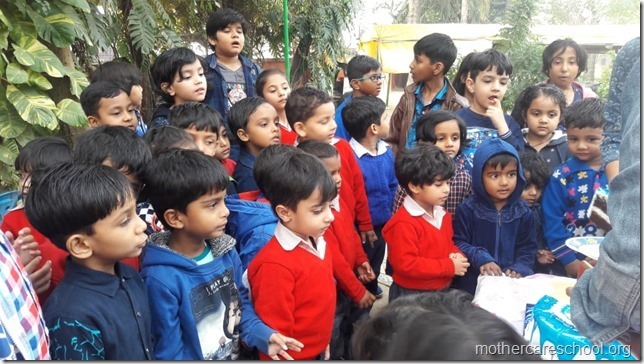 Get set go..with Fun and Games for all ages…..
We at Mothercare School are ready for all…Grandparents, uncles, aunts, cousins, neighbours and friends!! 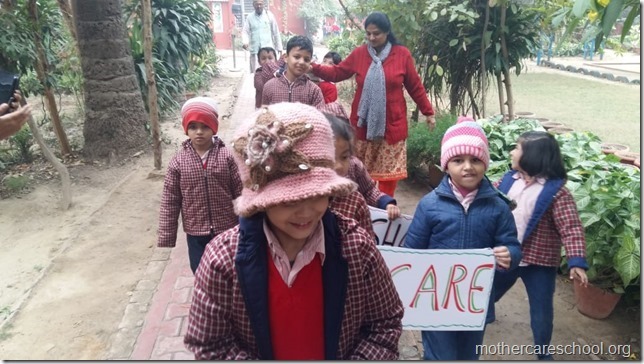 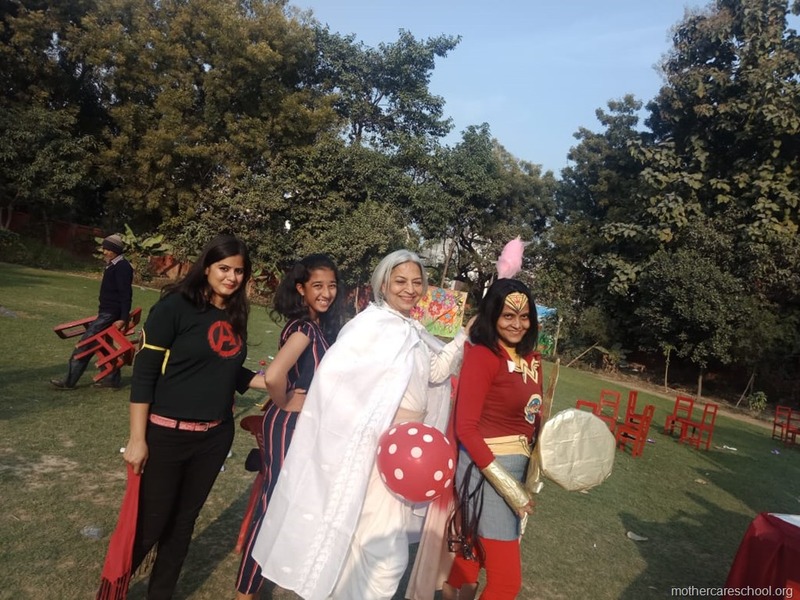 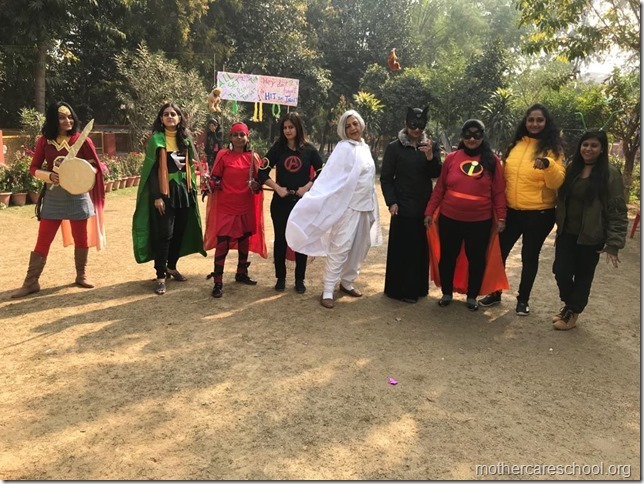 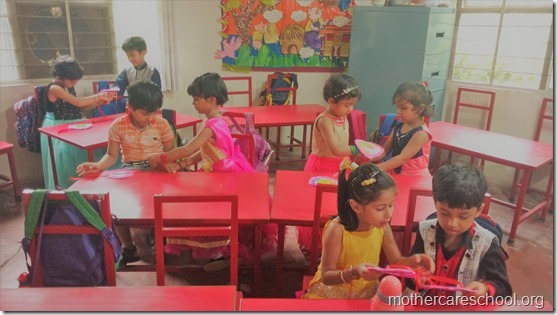 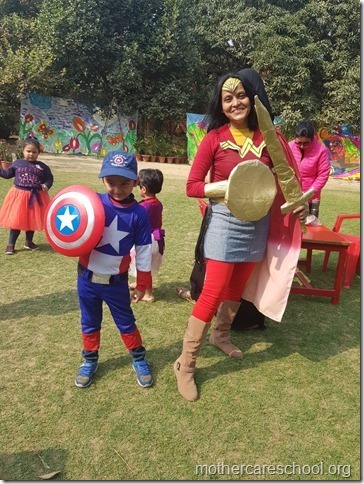 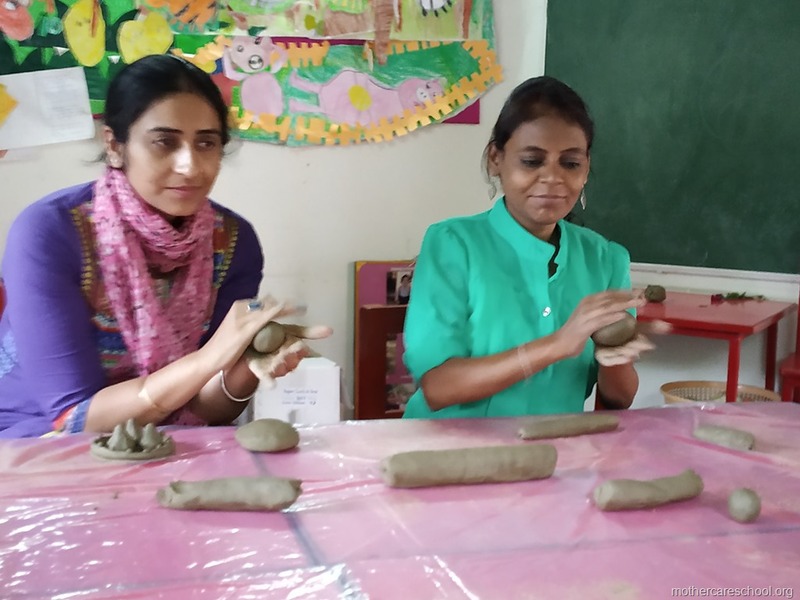 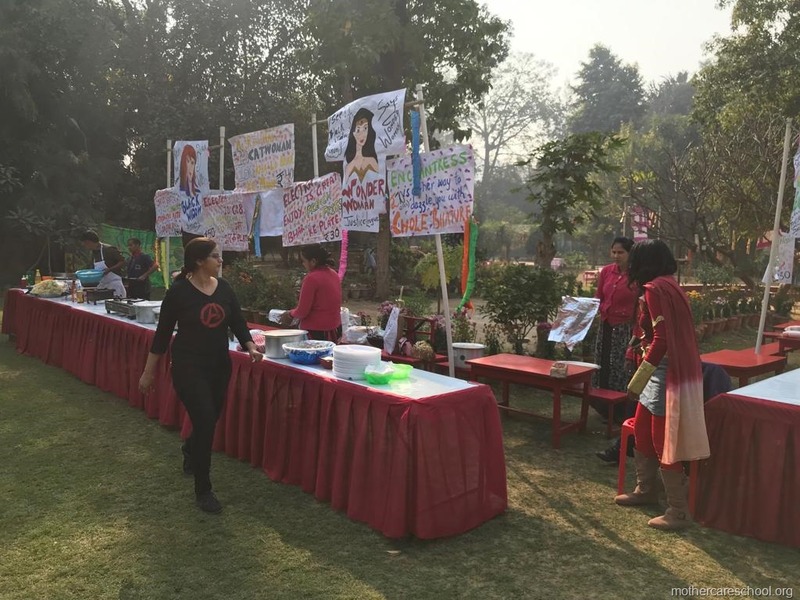 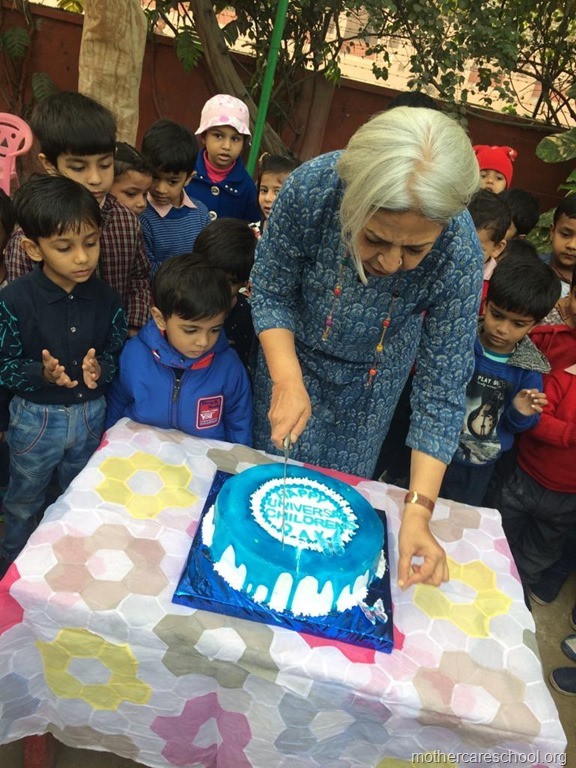 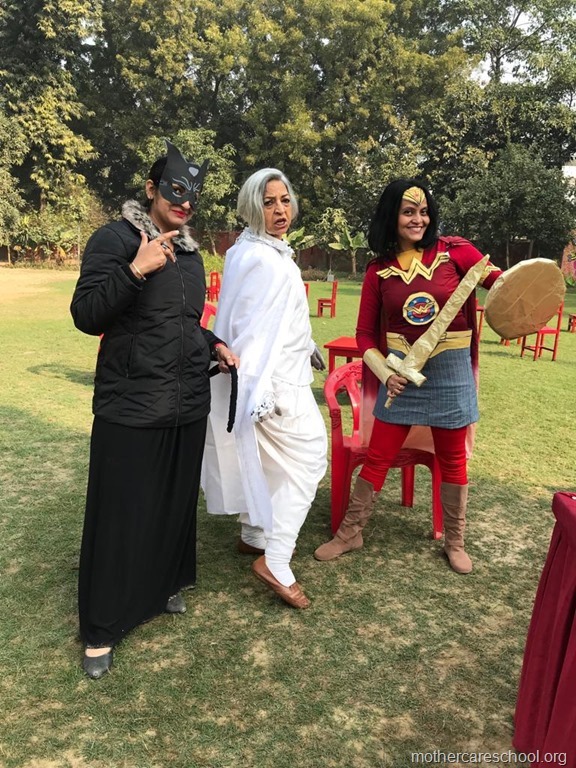 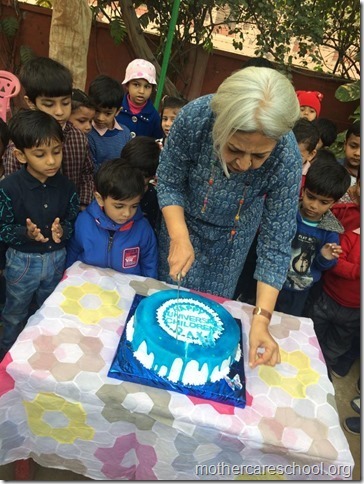 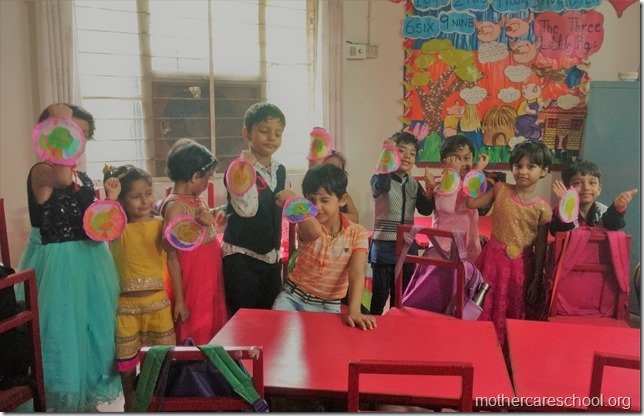 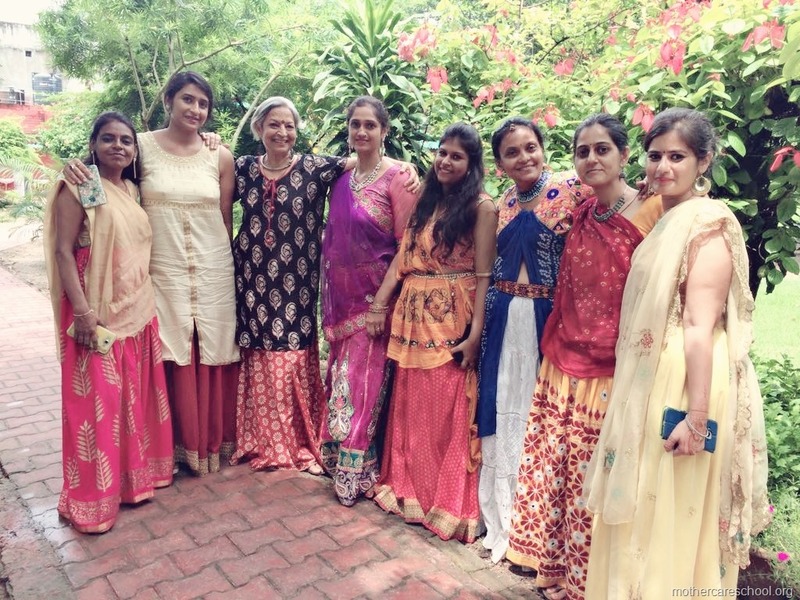 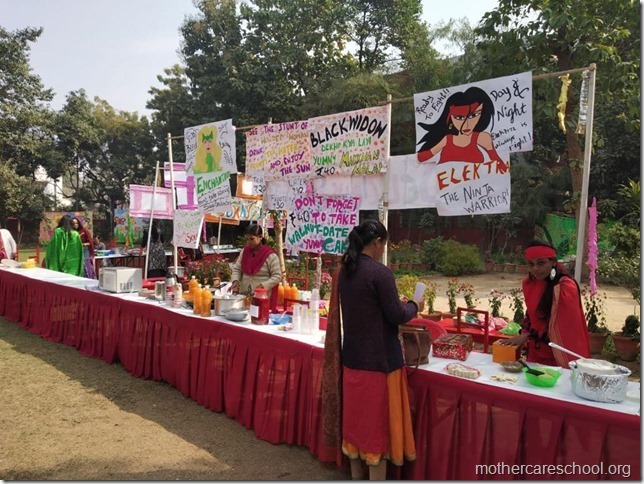 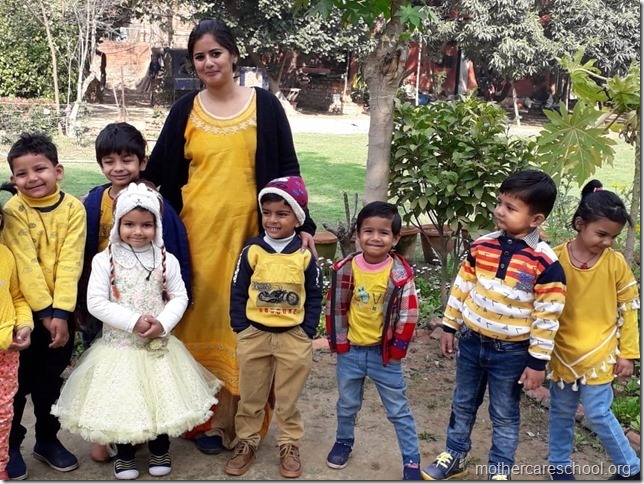 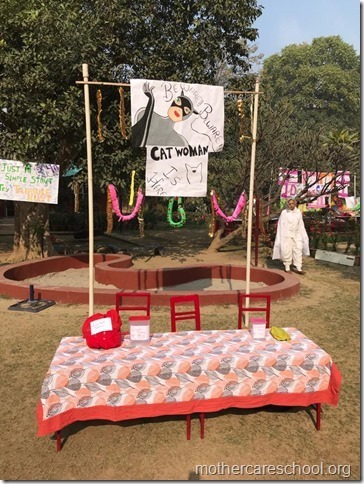 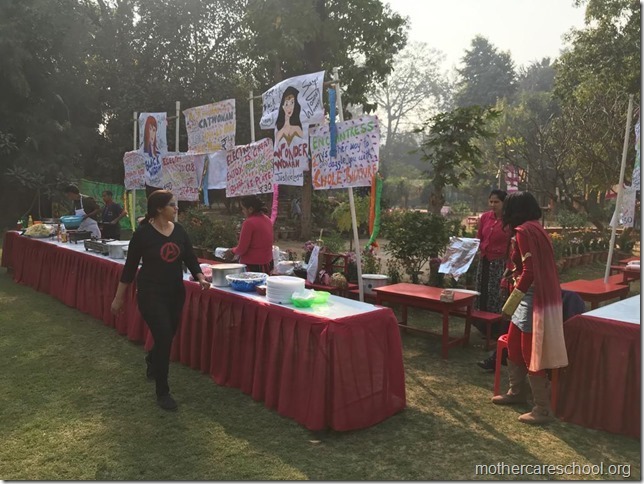 Our Superhero teachers…the pillars of Mothercare School led by our Principal Shobha Dev. 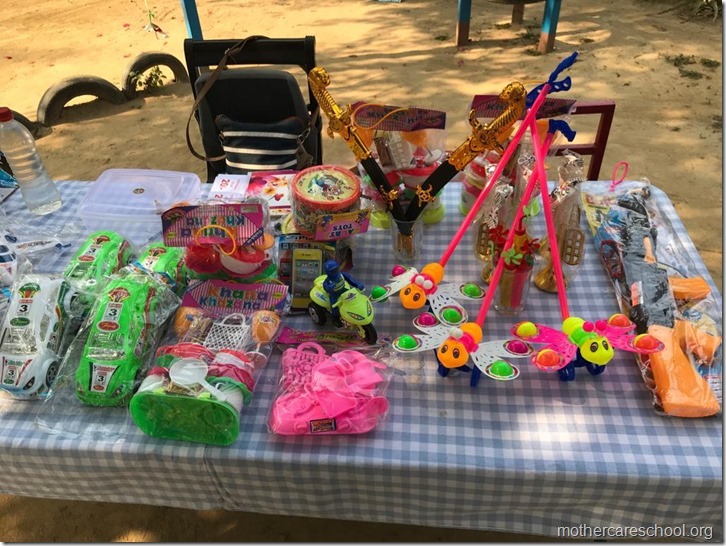 Make some noise…Let’s buy toys!!! 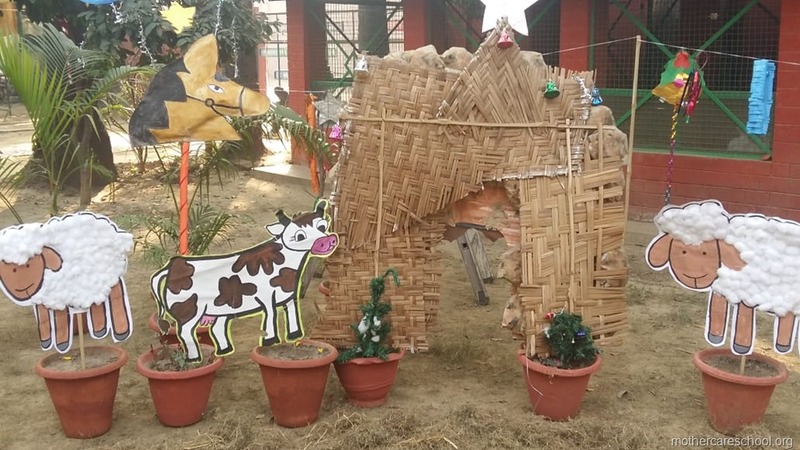 You don’t have any stall for us to take selfies? 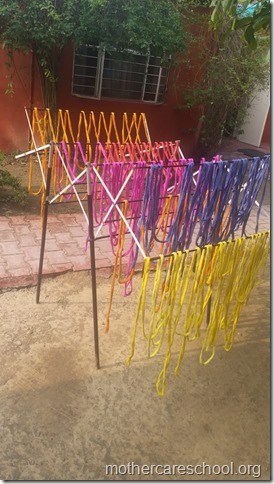 never mind…I’ve made my own!! 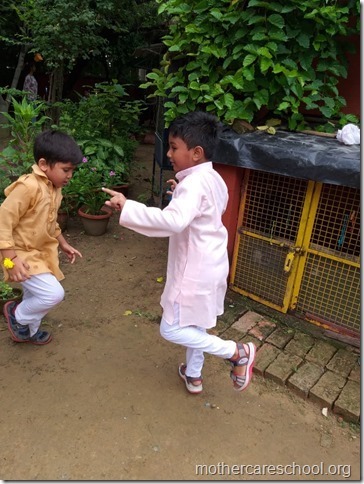 Aao maaro gappe….khao gol gappe!!! 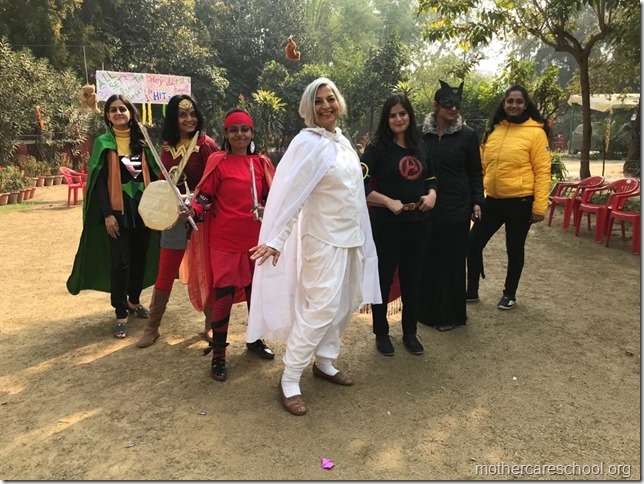 Wonderwoman, Enchantress, Catwoman, Black widow, Elektra……Ready to serve it ALL…!! Dekho dekho aya dauda …humara pyara ghoda!!! 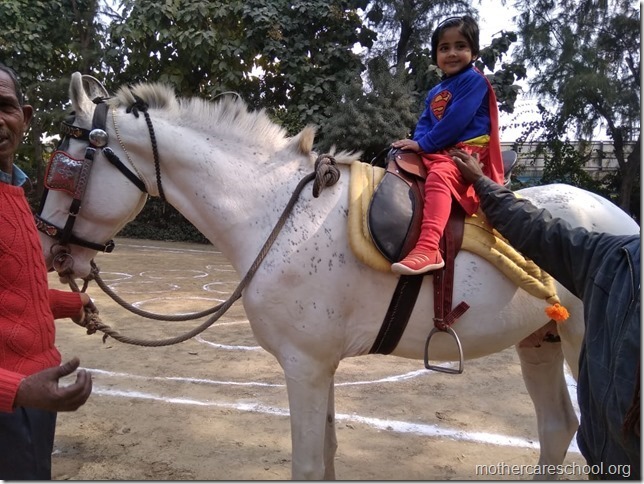 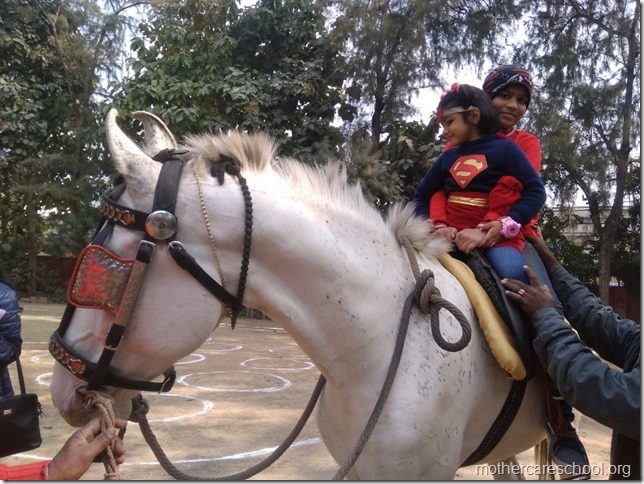 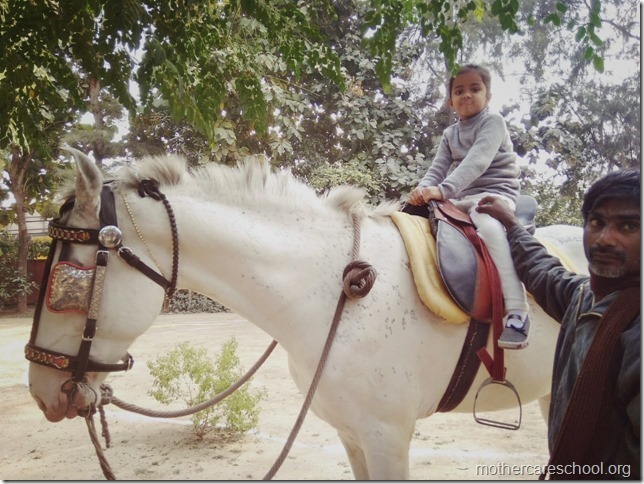 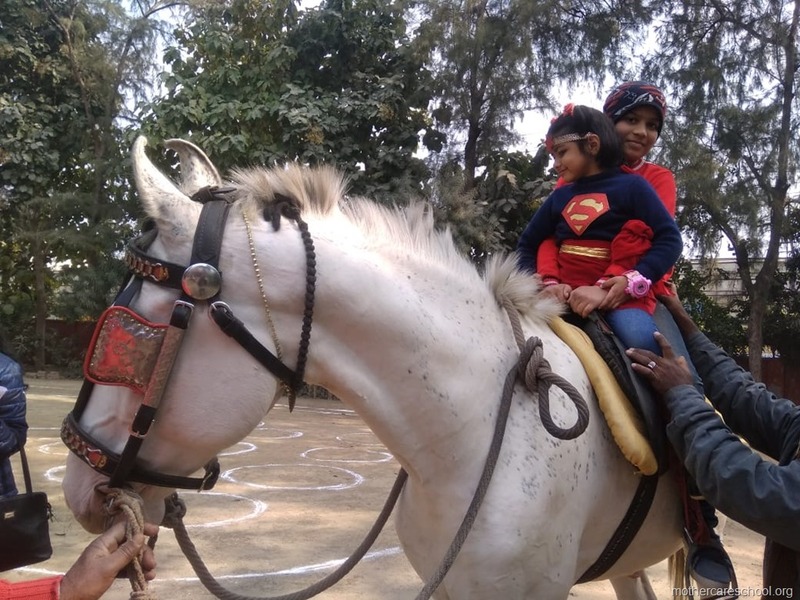 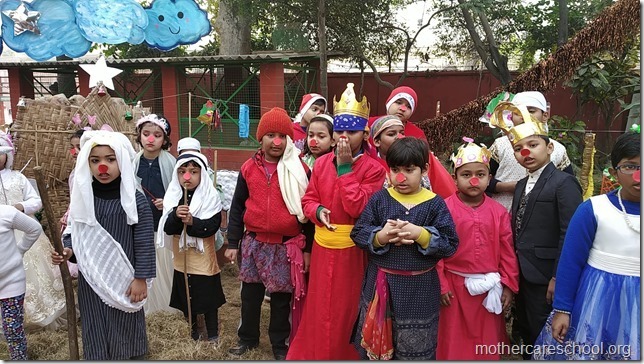 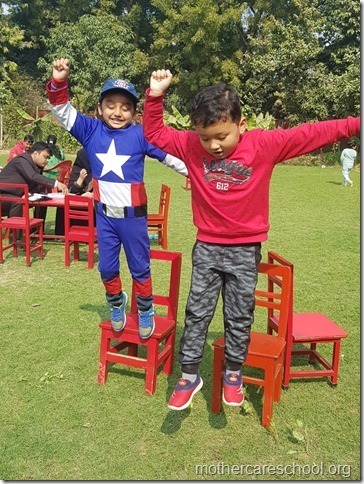 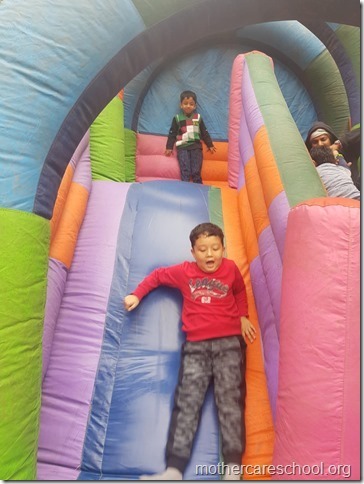 Superhero kids riding the high horse fearlessly…. 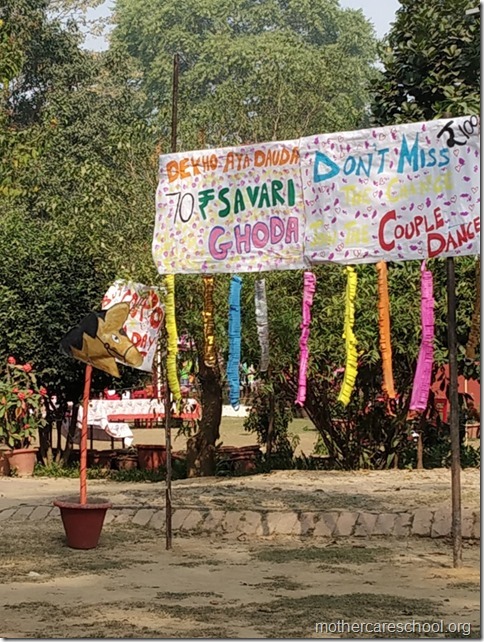 Don’t miss the chance…Lets win the couple dance!!! 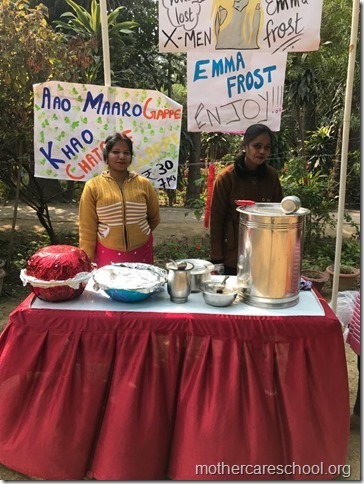 Our very own Emma Frost…Ms. 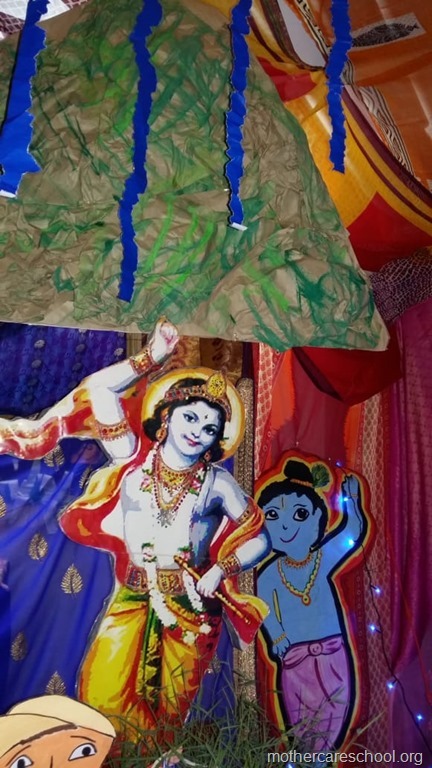 Shobha Dev. Omnipresent? 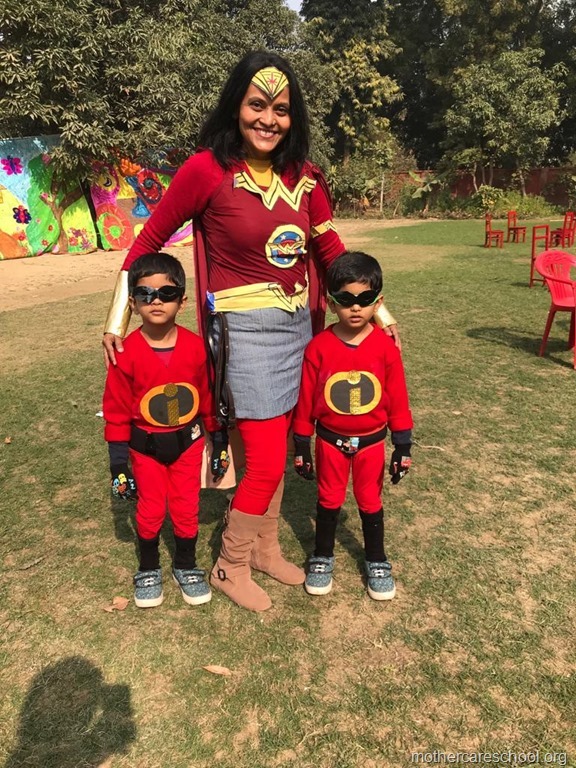 Our very own Wonder Woman with the Elasticboys!! 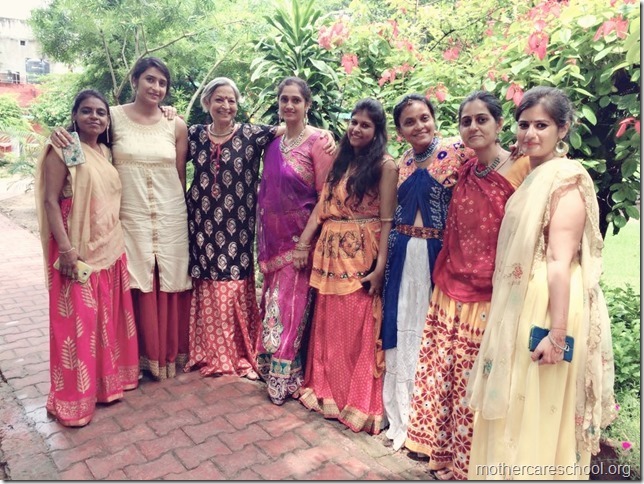 With our Ex-Students….oohh…how we’ve missed Mothercare!!! 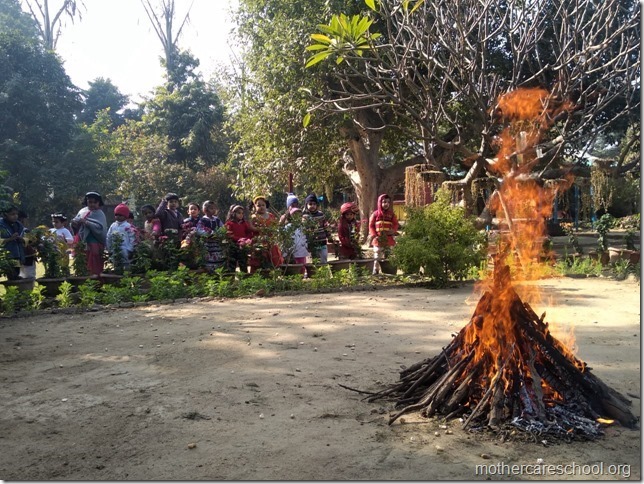 Watching the play of fire. Right, Left, centre, up, Down. 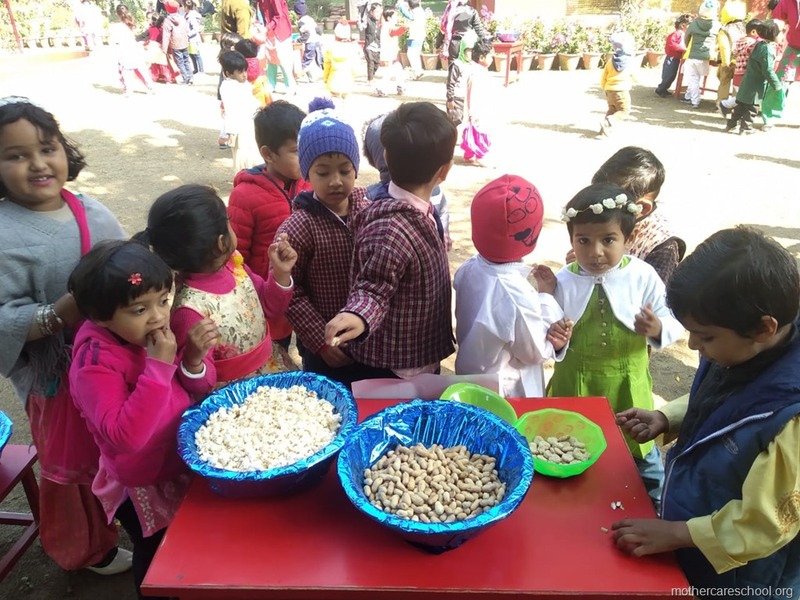 Rewri, popcorn, peanuts, gur, til some to the cordoned off fire and lots for us. 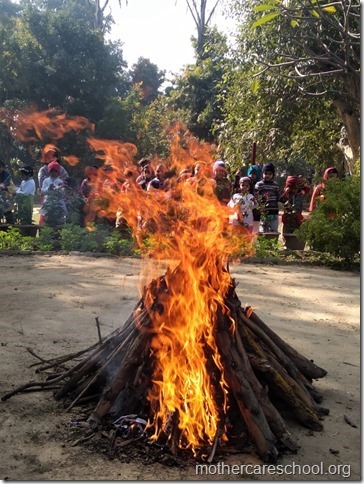 All set for the bhangra..straight from the Lohri land….My Punjab! 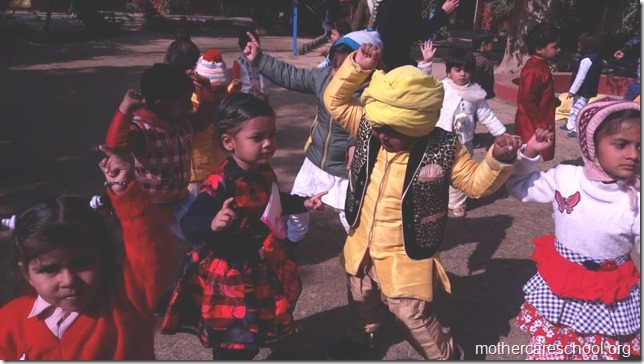 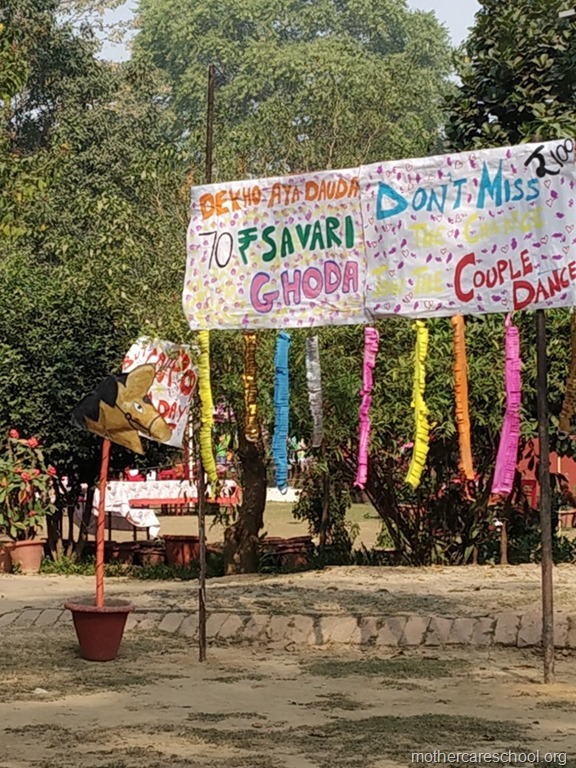 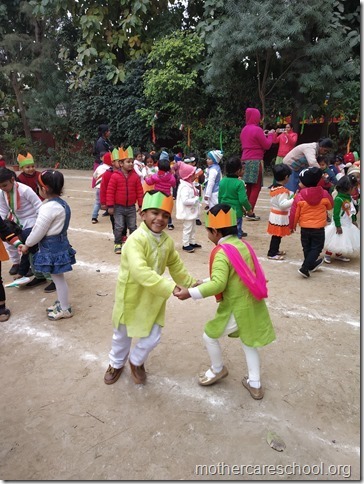 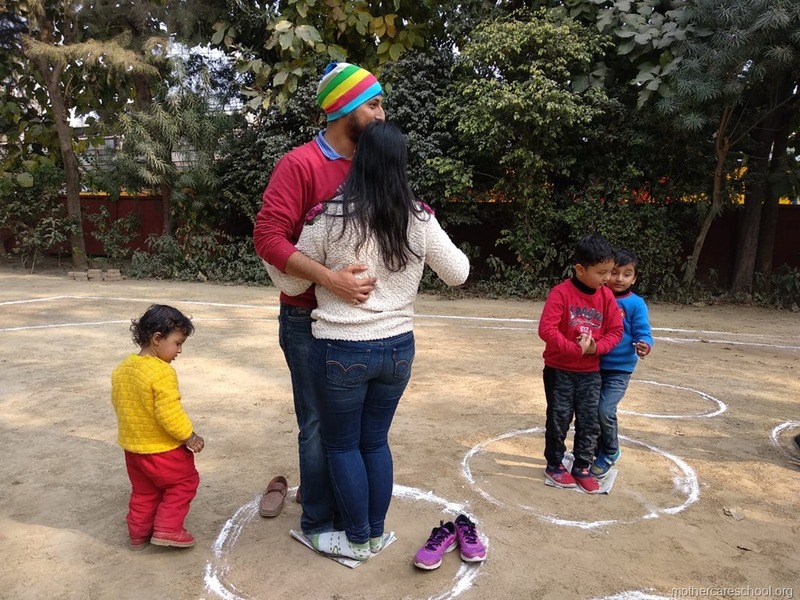 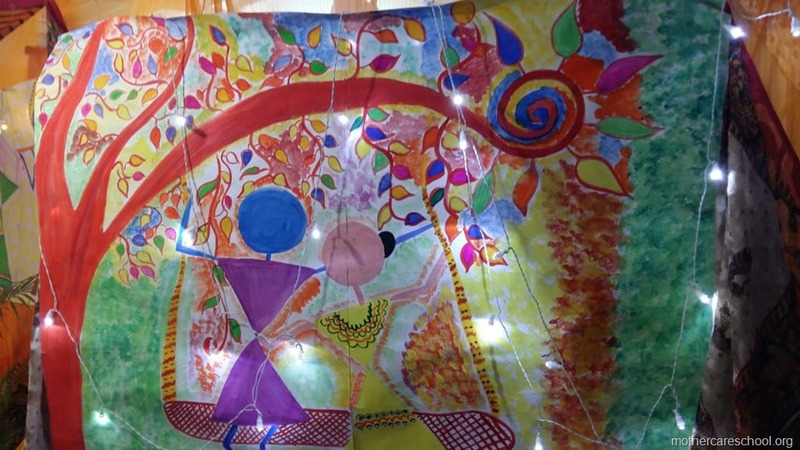 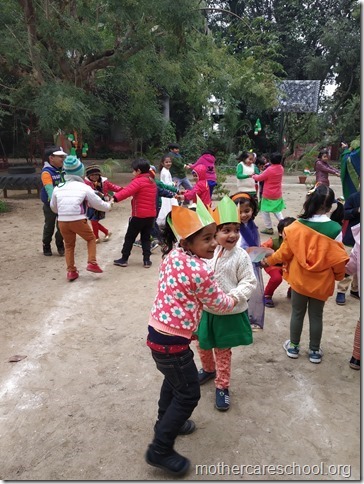 Gidda, Bhangra, dhol with our favourites…our friends, guides, philosophers, teachers. 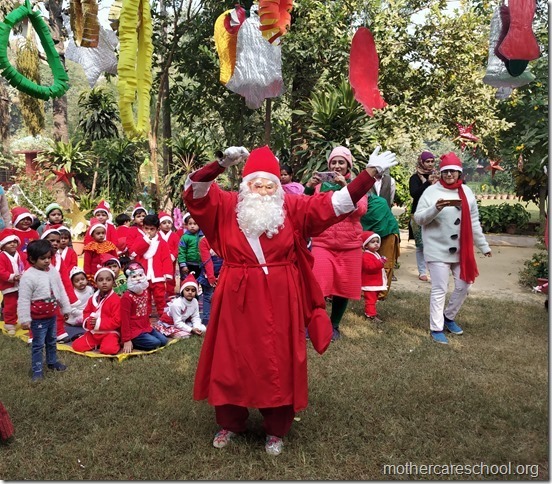 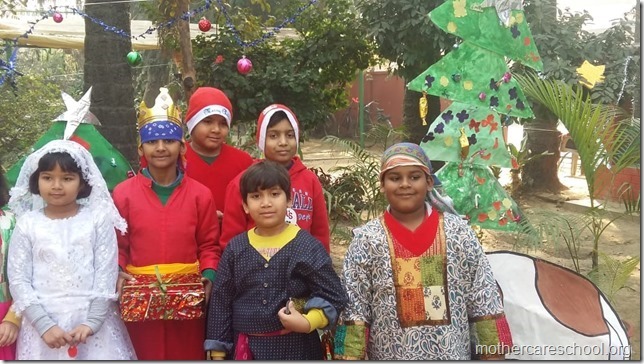 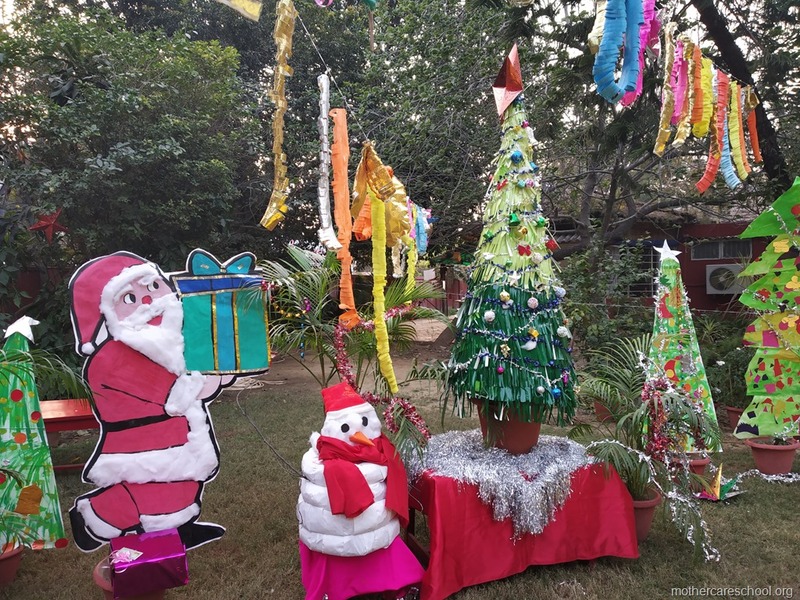 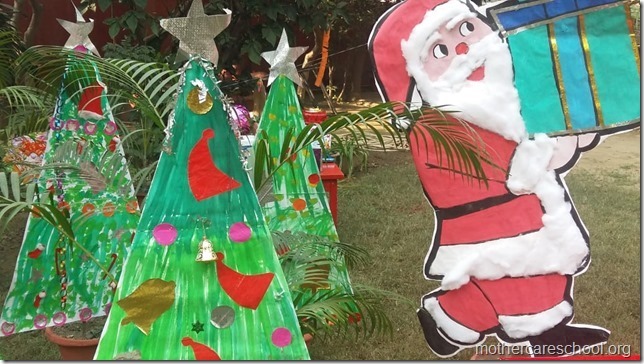 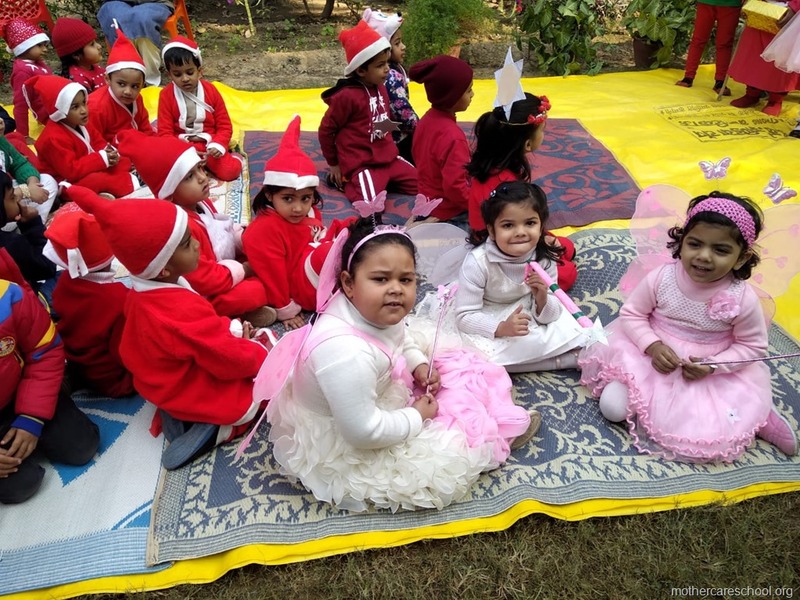 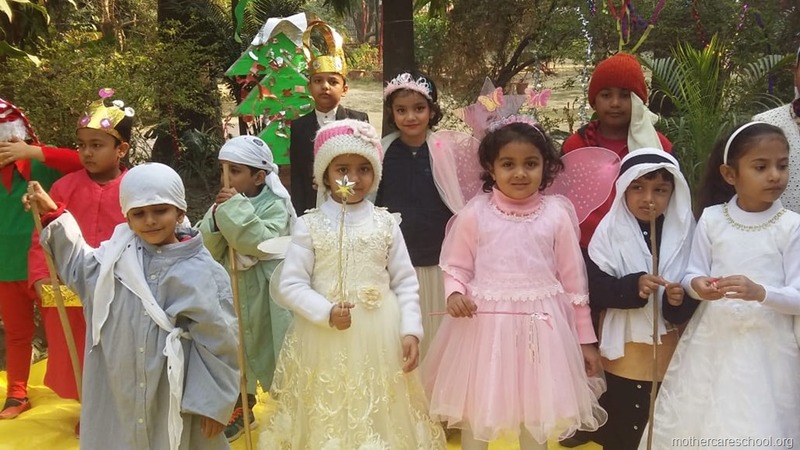 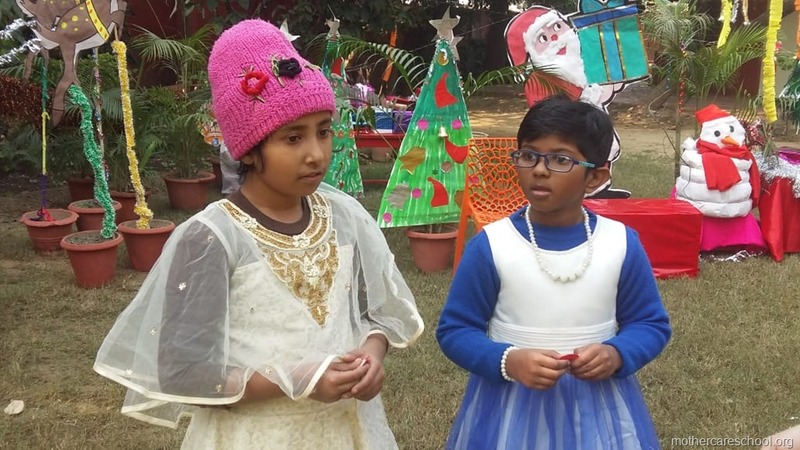 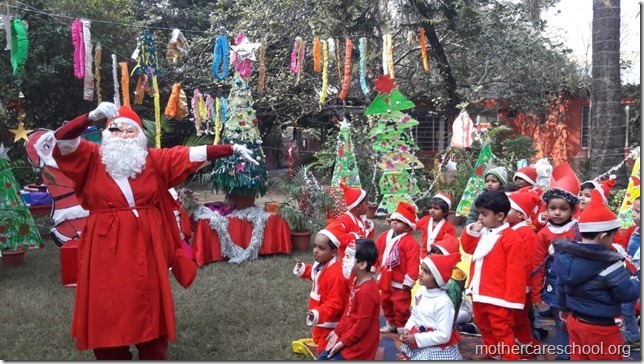 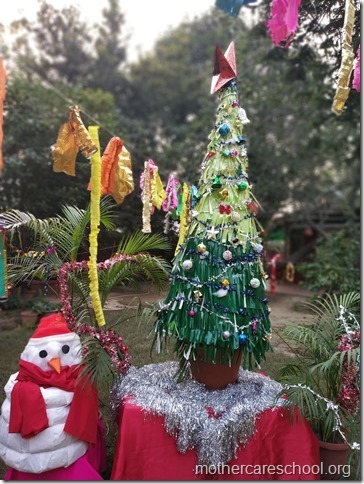 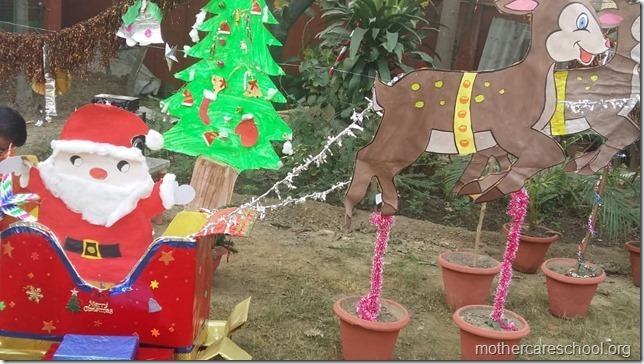 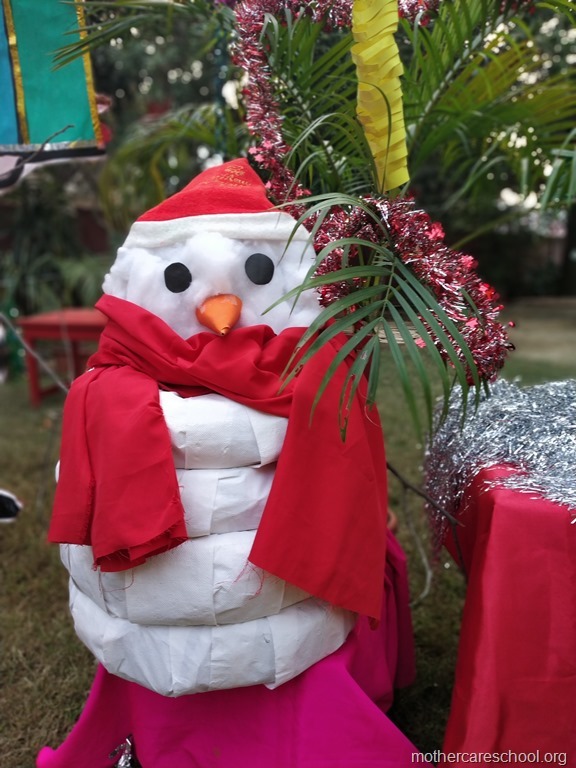 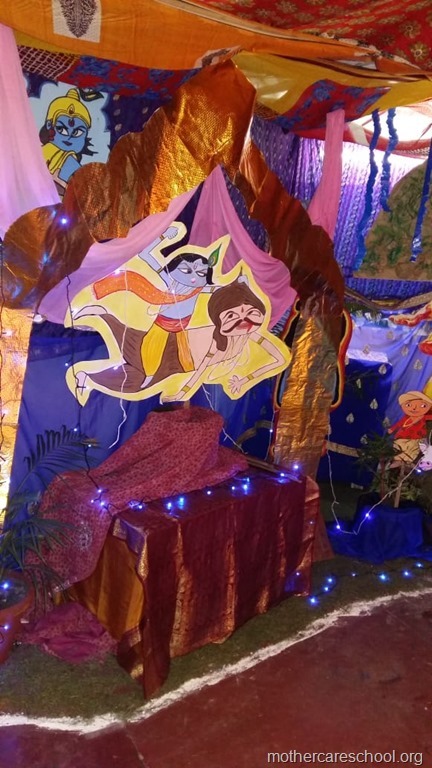 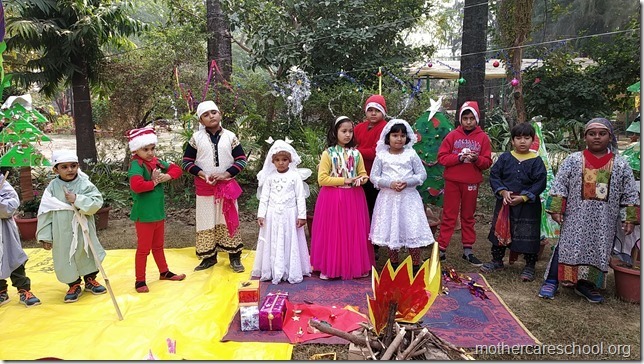 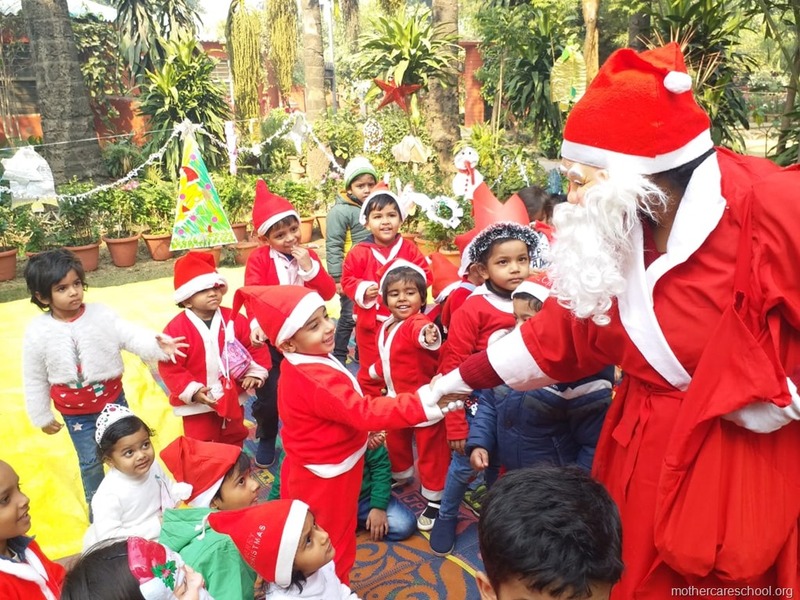 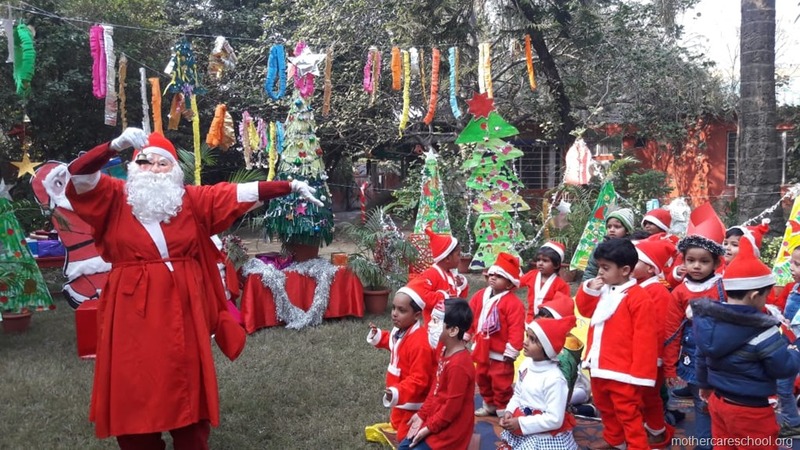 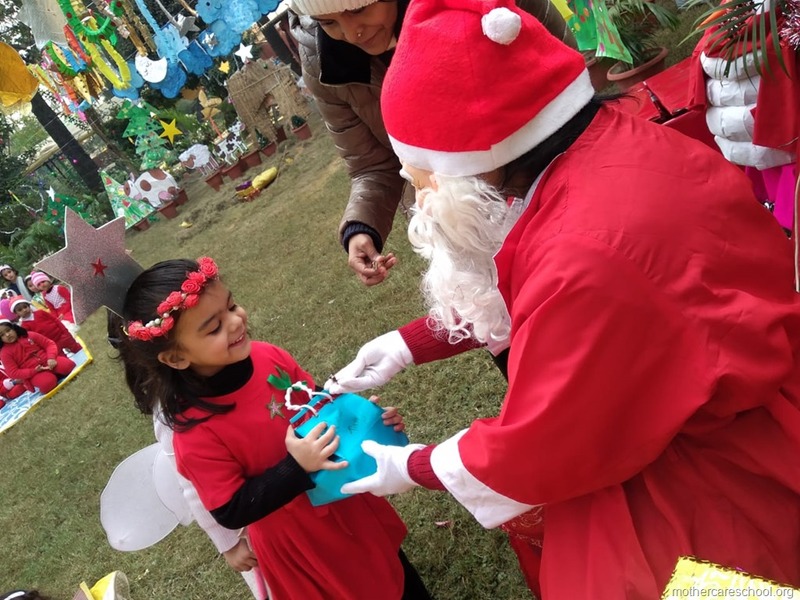 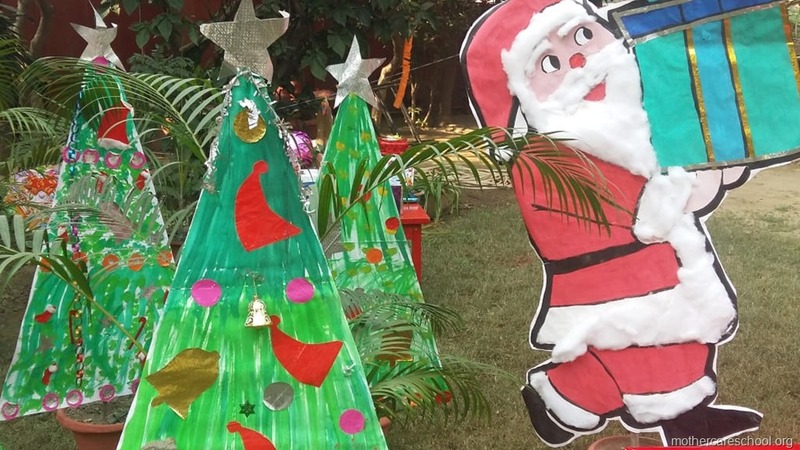 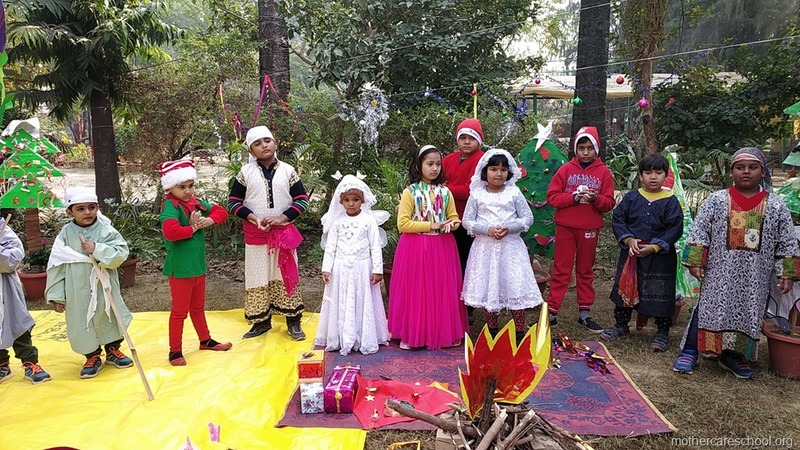 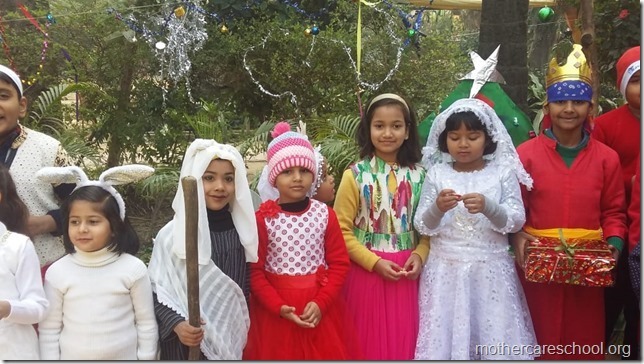 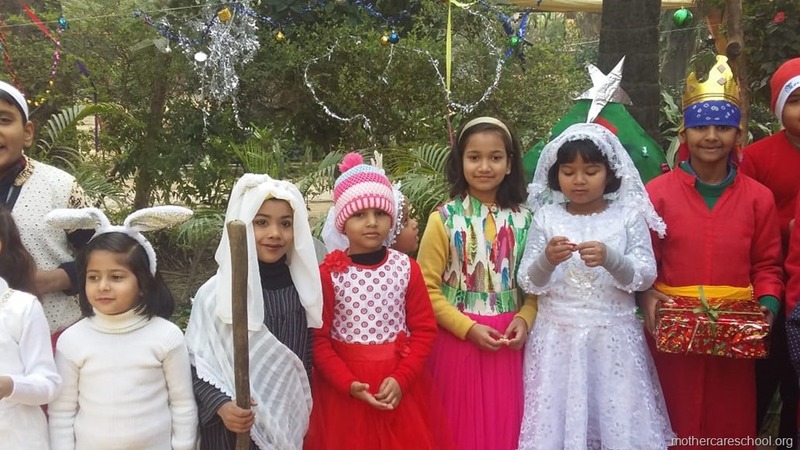 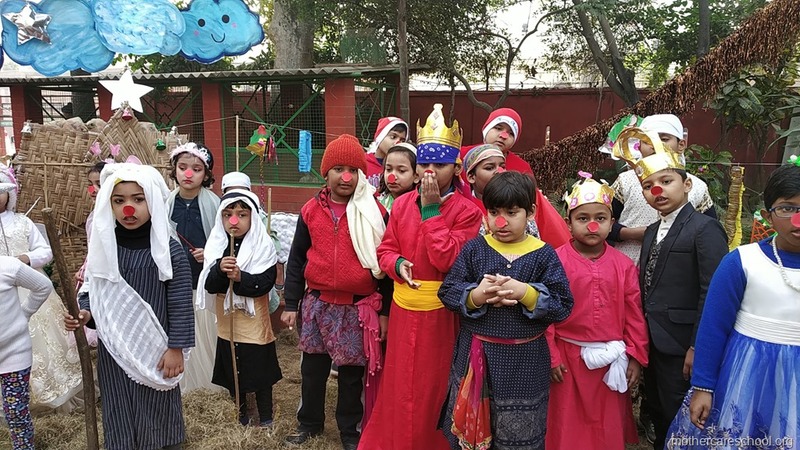 School all decked up for the Christmas Celebrations. Santa’s sleigh pulled by reindeers. 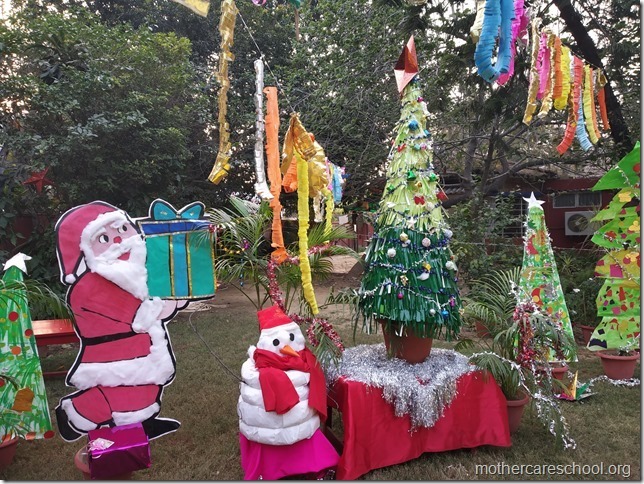 Christmas trees bedecked with stars, holly, snowflakes, stockings,bells, santas, candies, gifts galore. 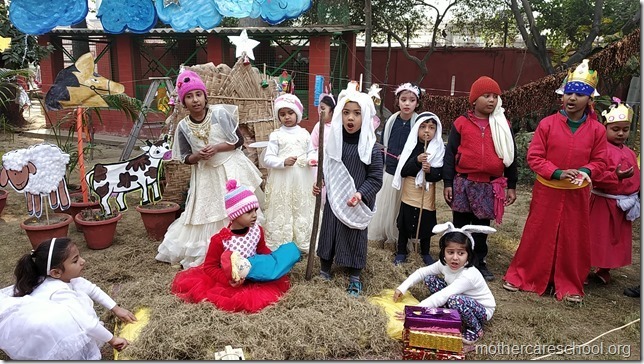 Children all excited and ready for the nativity scene story to unfold and be enacted. Ho ho ho….here comes the Santa…. Hey…Santa has got us candies too!! 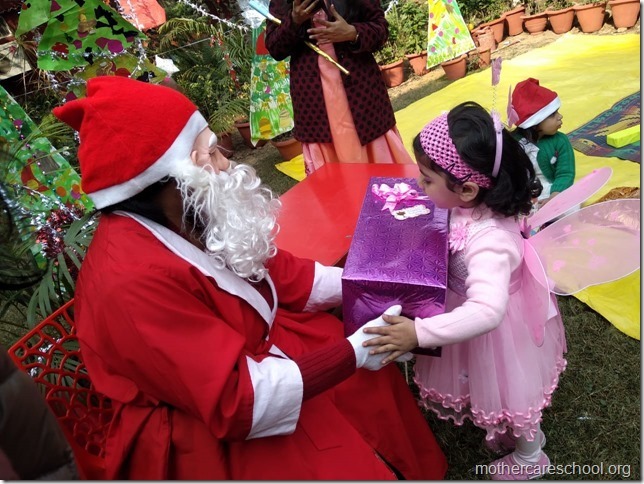 Wowww…gifts for each of us!!! 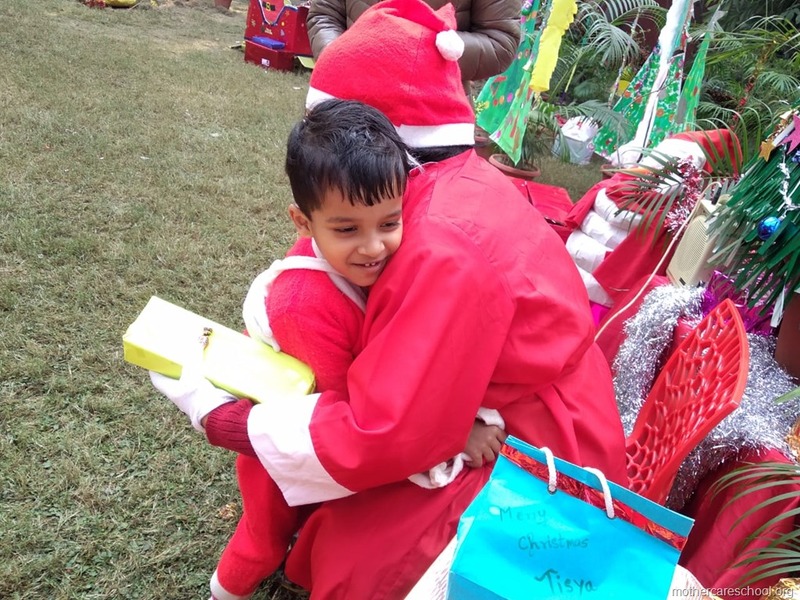 hugs and kisses from Santa…. 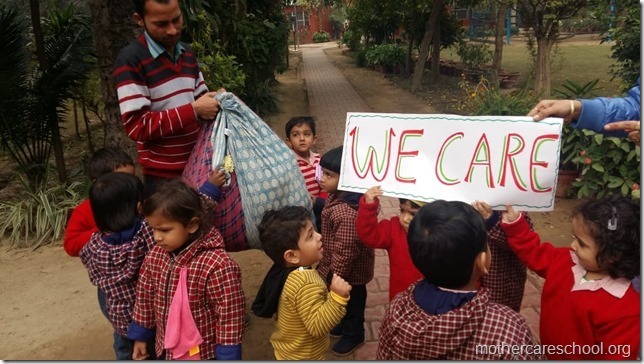 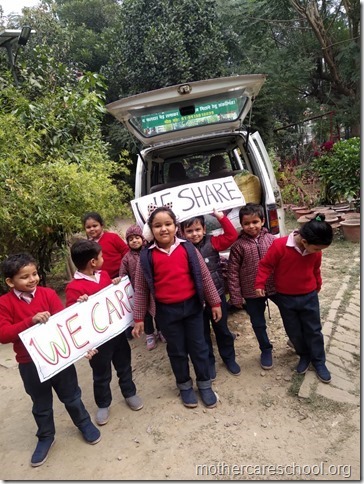 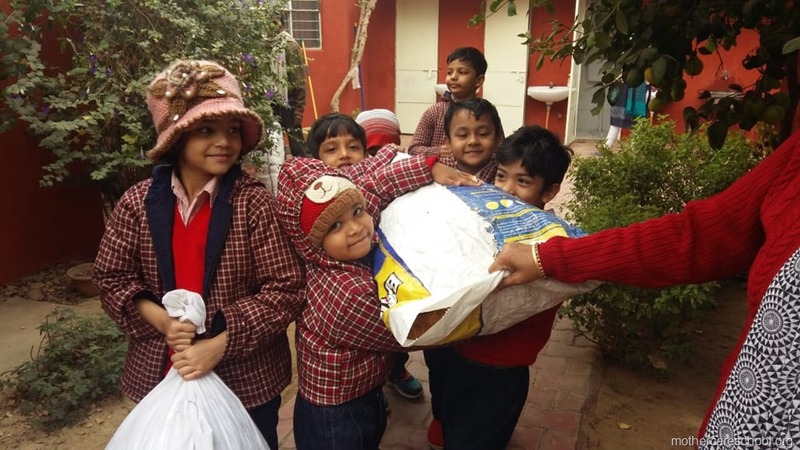 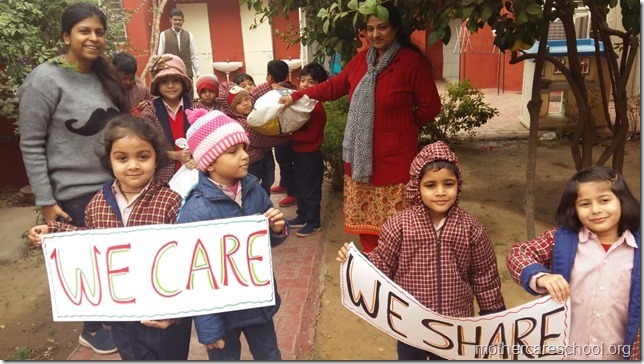 Children collected clothes, books, toys, shoes, for their under privileged friends. 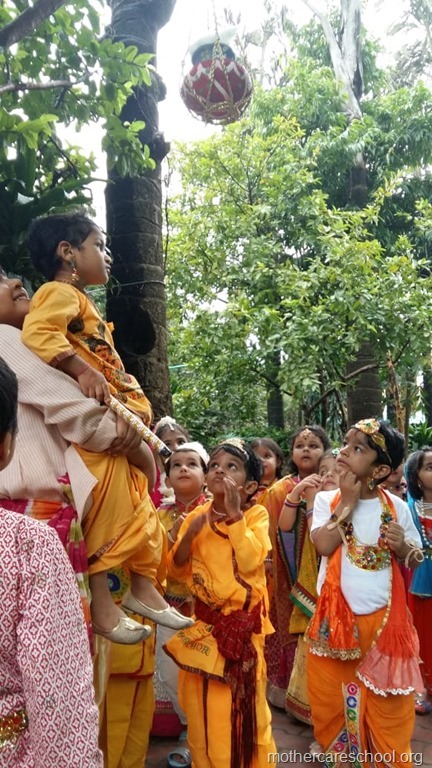 Hear Mr. Chandrabhushanji. More and more and more for our friends. 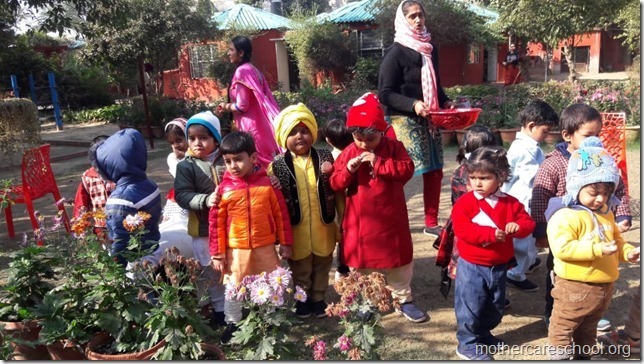 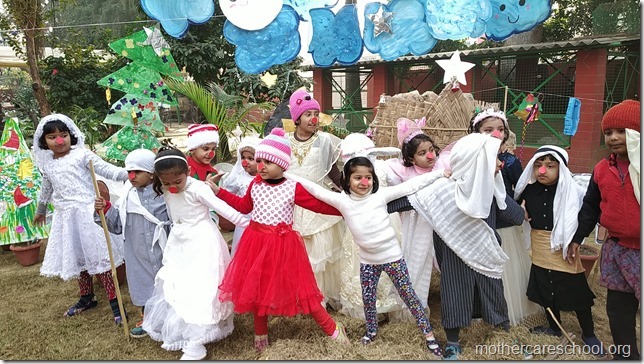 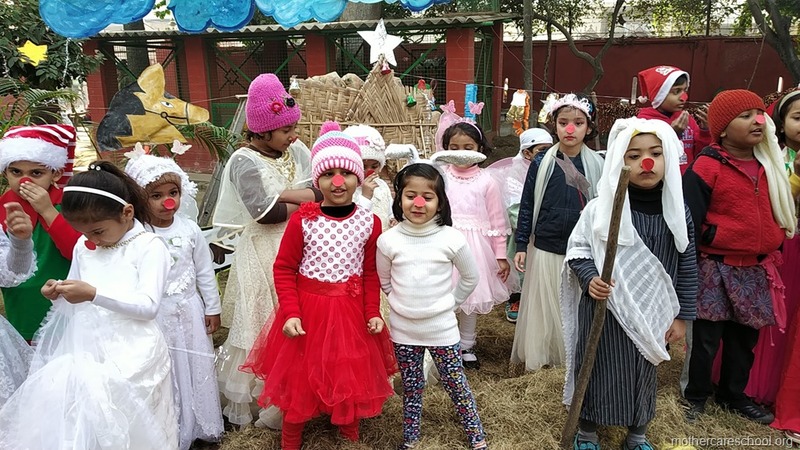 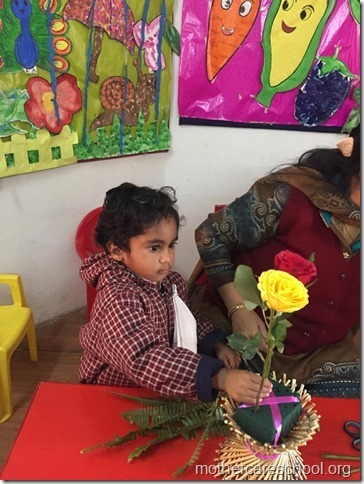 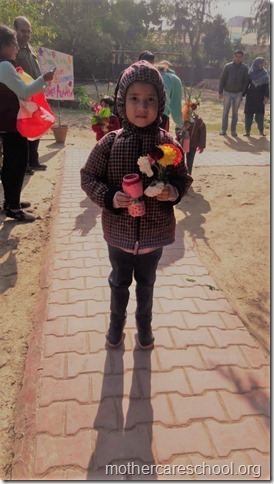 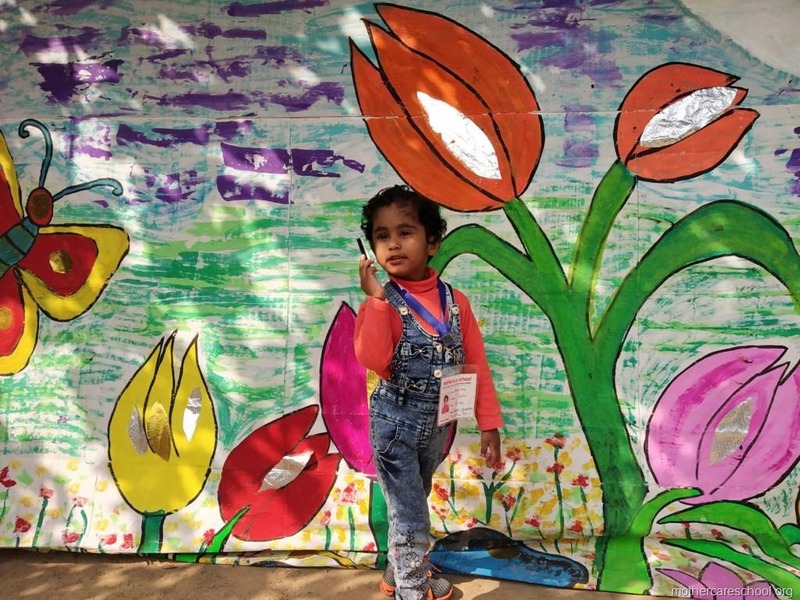 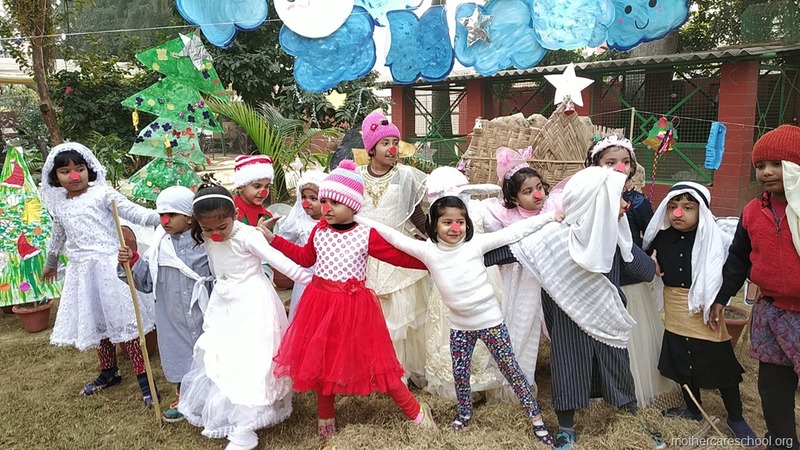 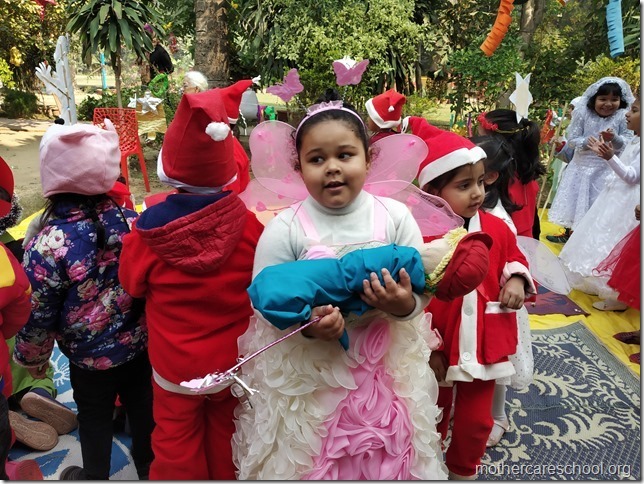 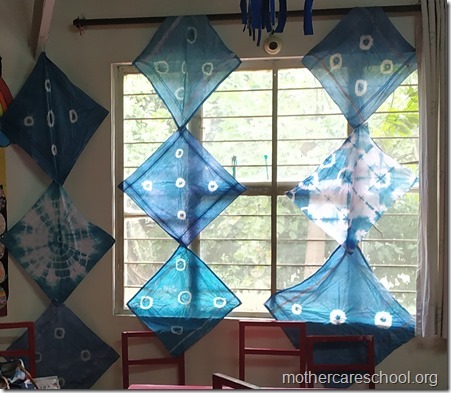 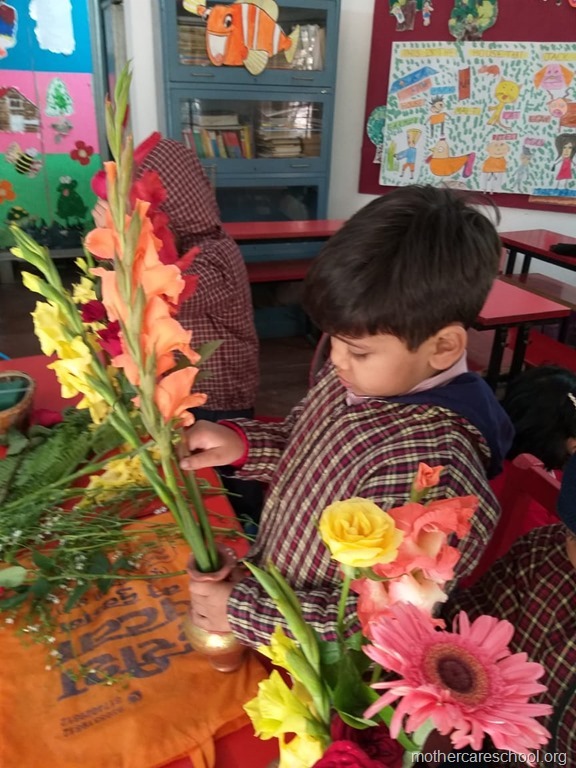 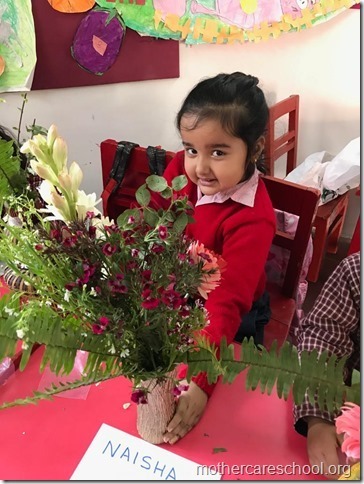 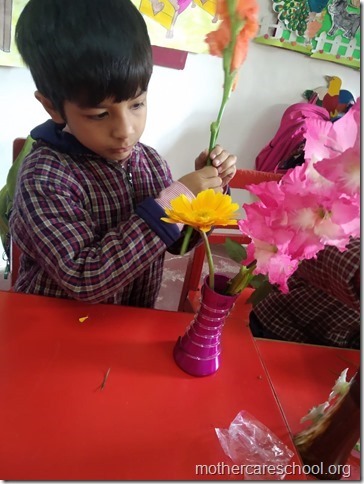 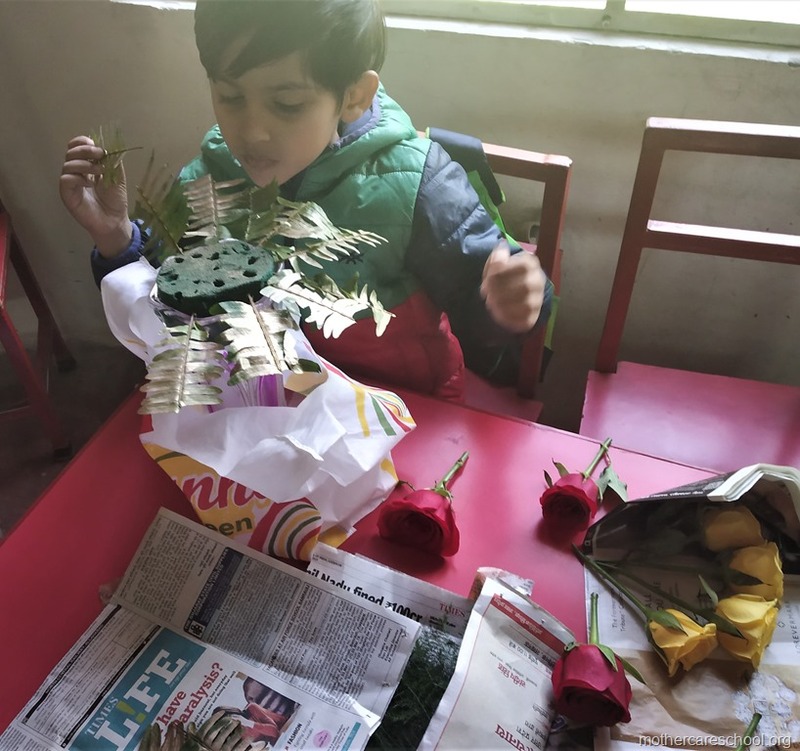 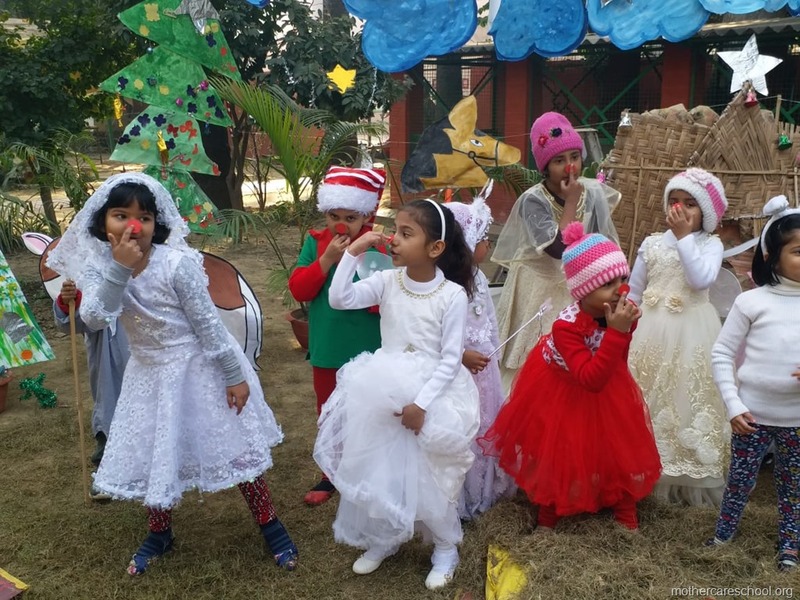 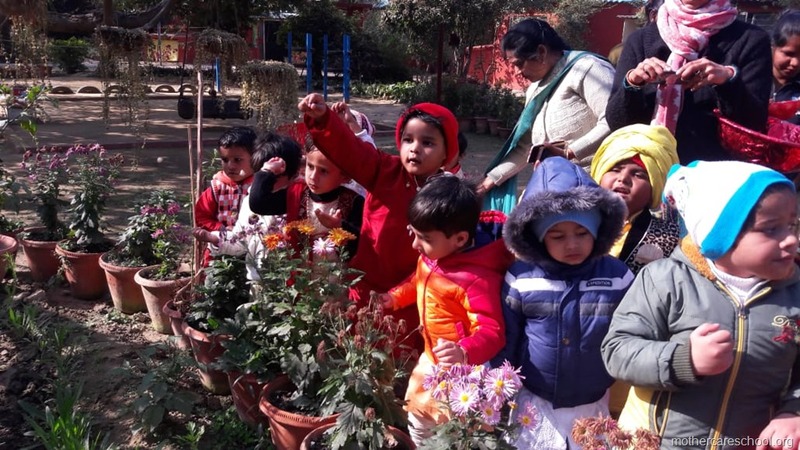 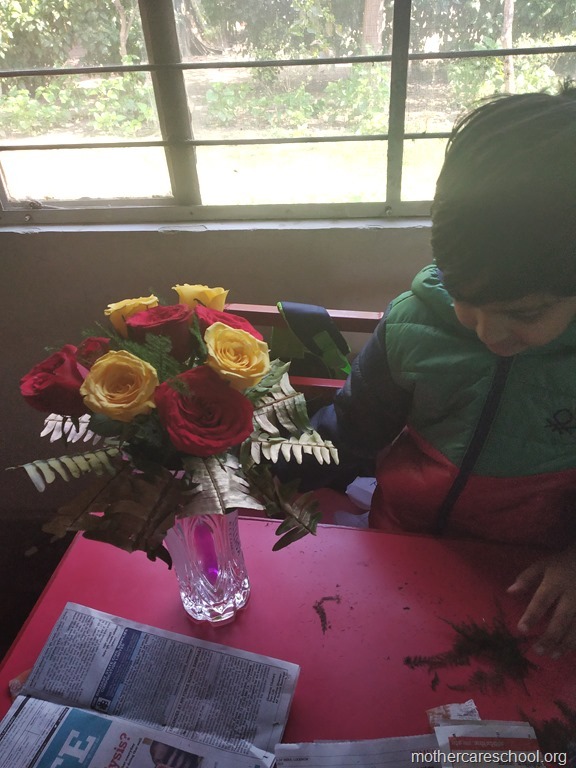 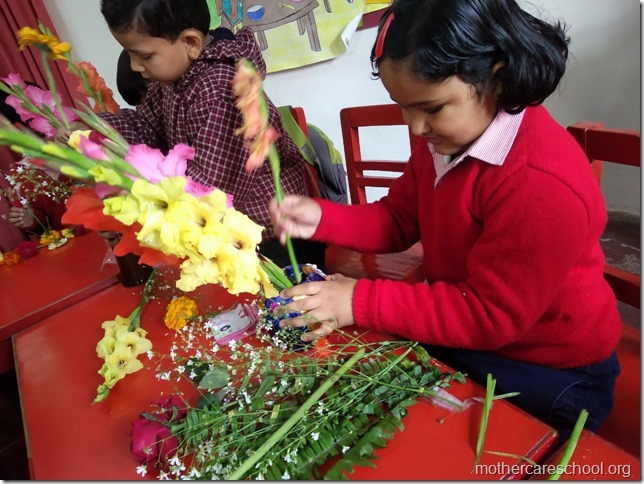 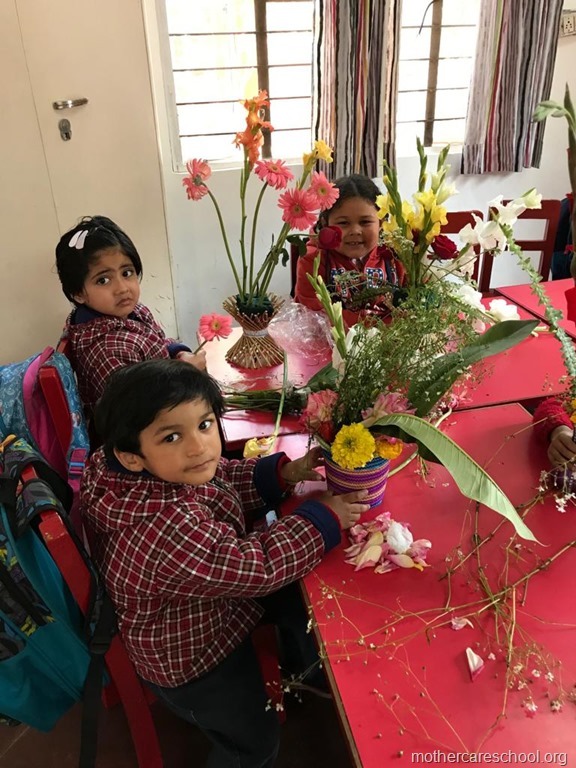 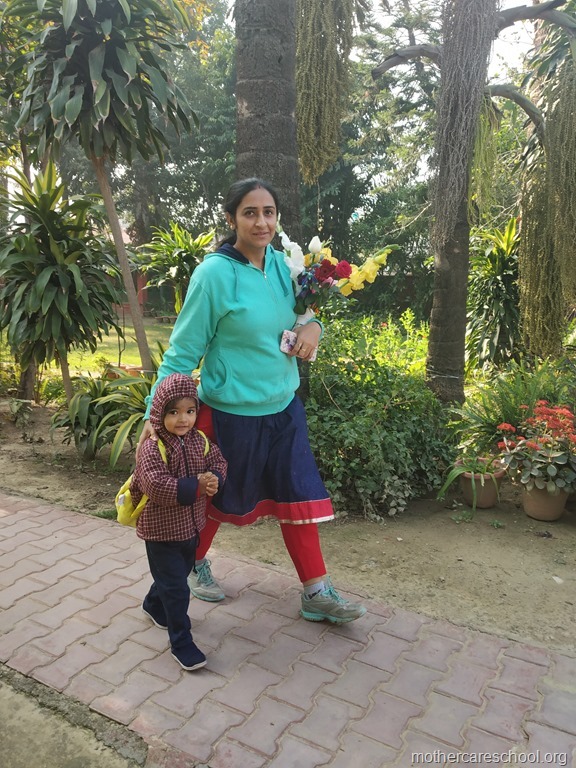 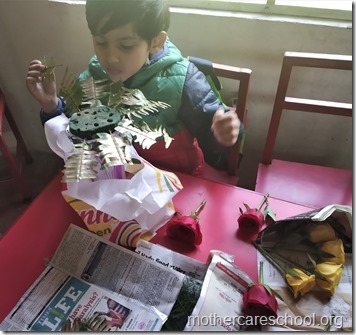 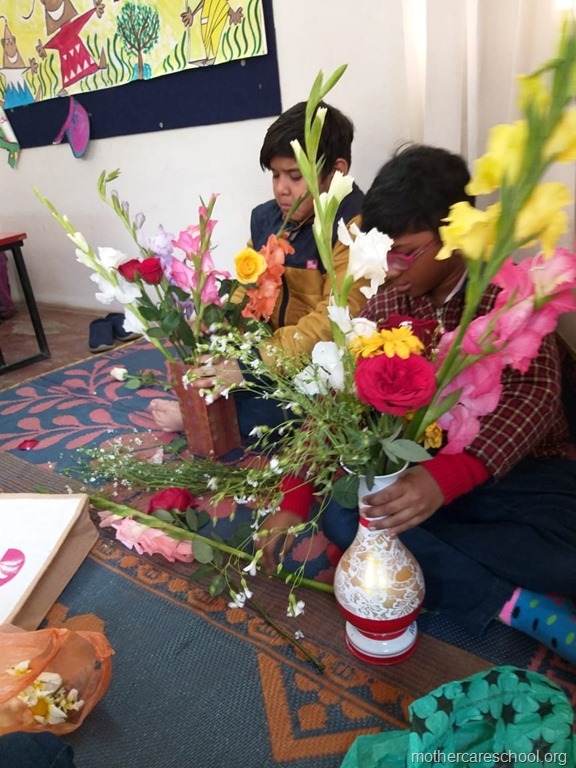 Winter blooms at Mothercare School. 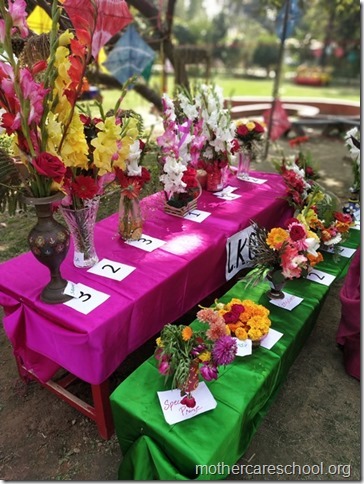 Entrance to the Mixed Age Group Class. 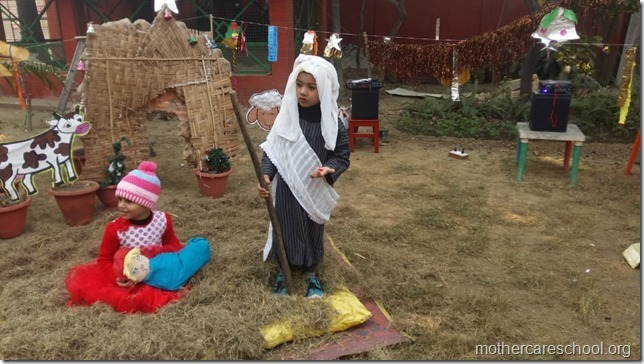 Steeped in honing up their dramatization skills. 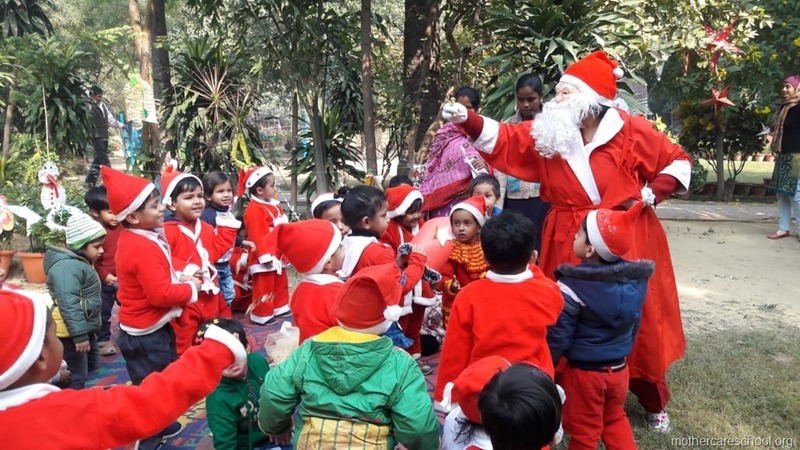 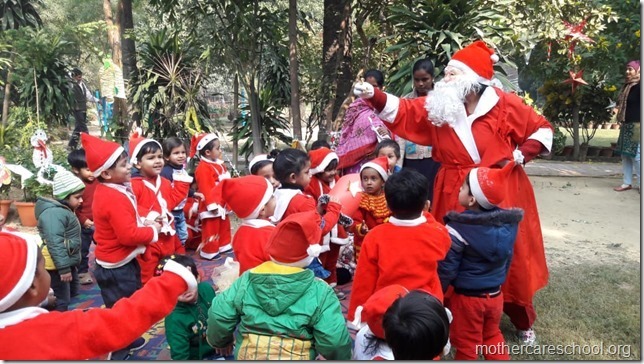 2nd December big day for Mothercare School Kids. Culmination of their dramatization workshop. 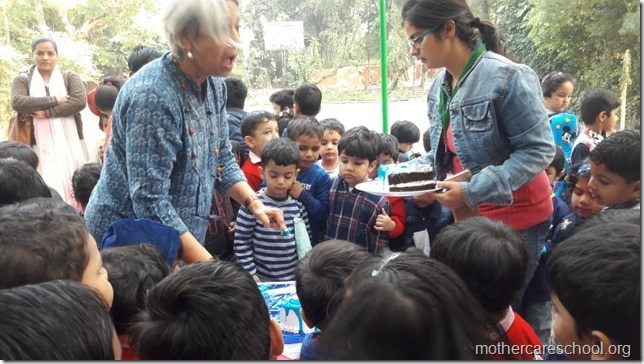 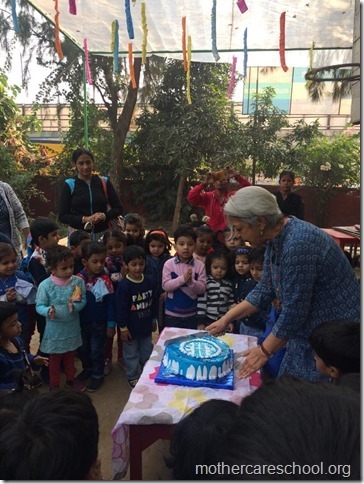 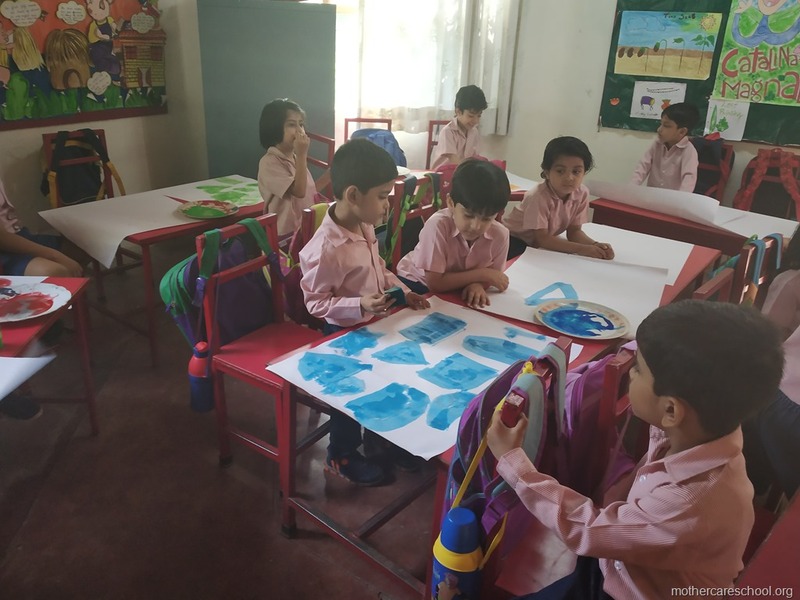 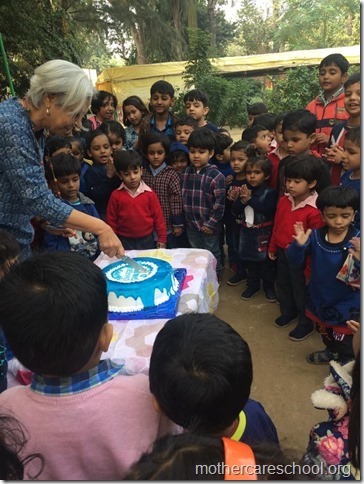 Universal Children’s Day Celebrated in Mothercare School as BLUE DAY. 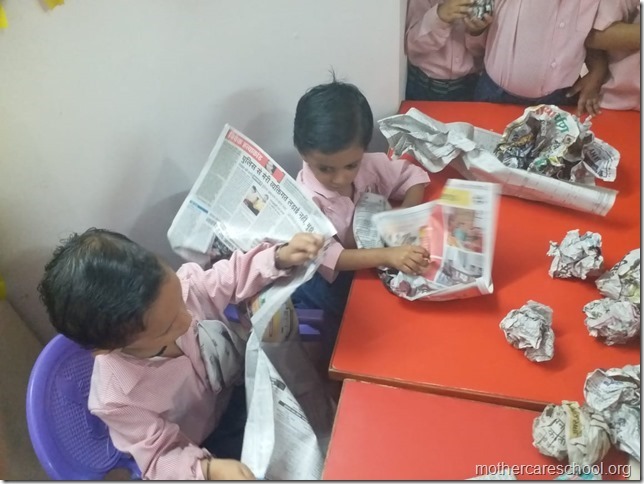 Tear, crumple, squeeze, wring….got it all! 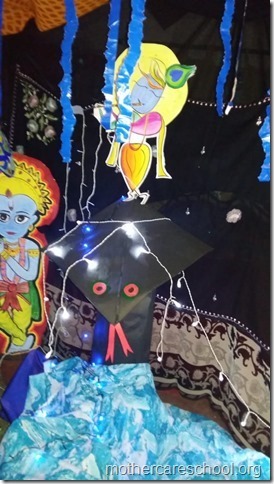 Stuffing ravan nice and proper. 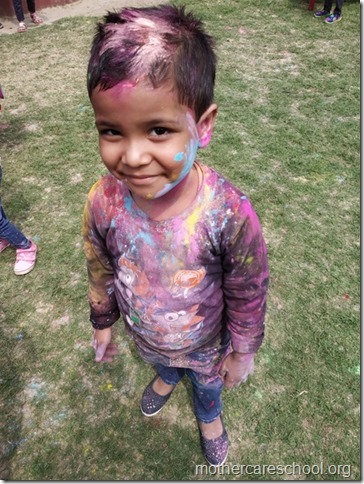 Ravan’s colourful attire in the making right from scatch…printing included. 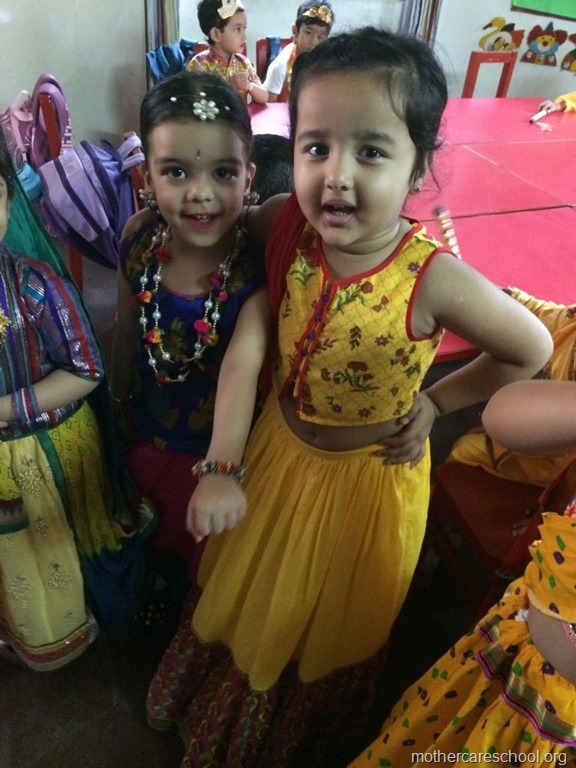 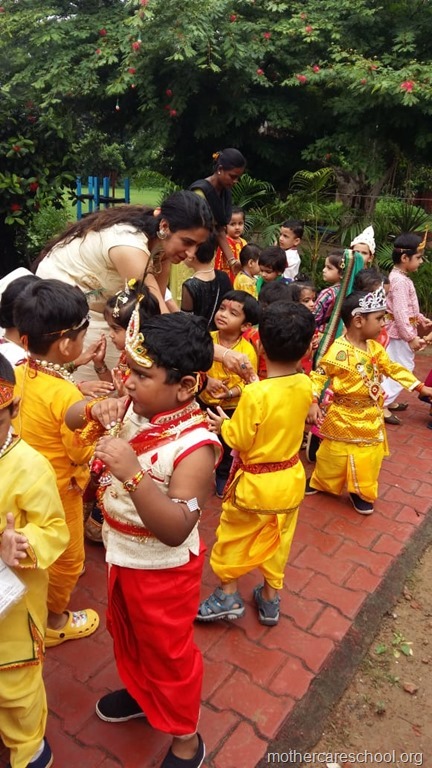 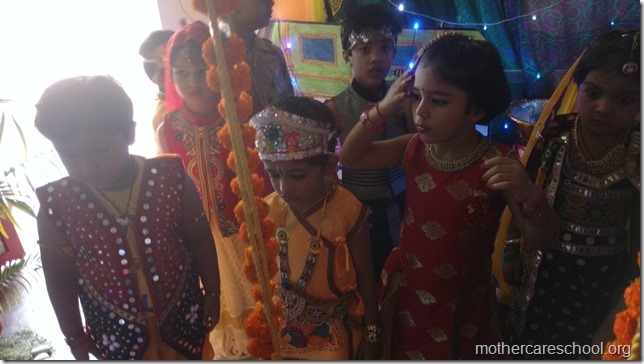 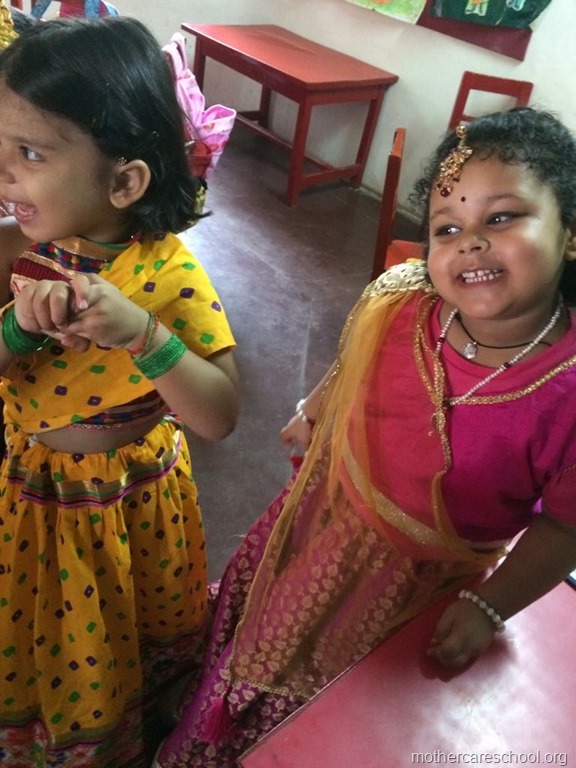 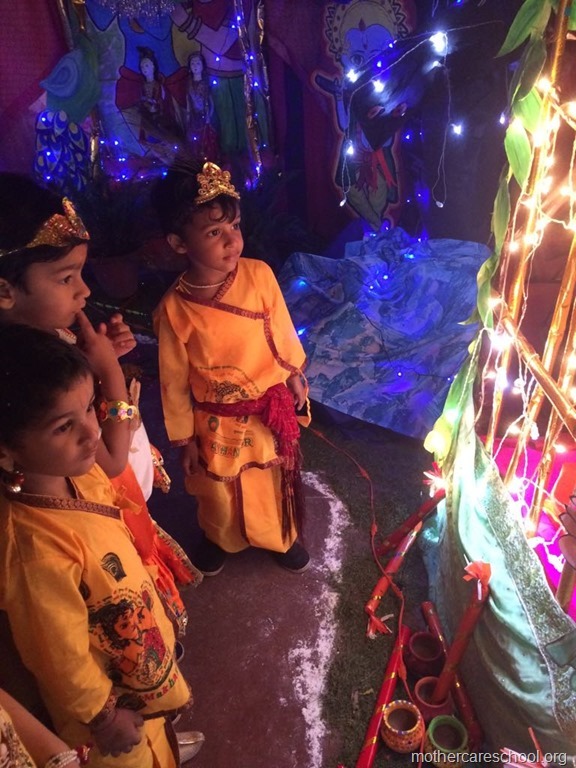 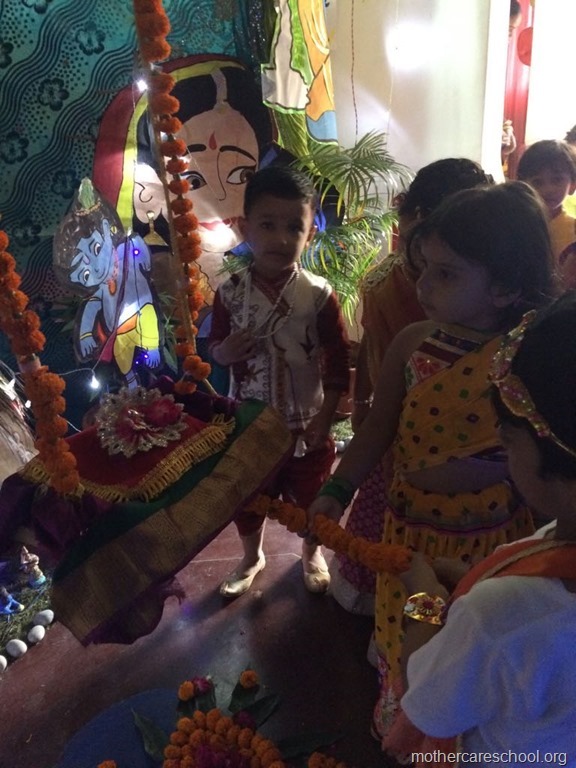 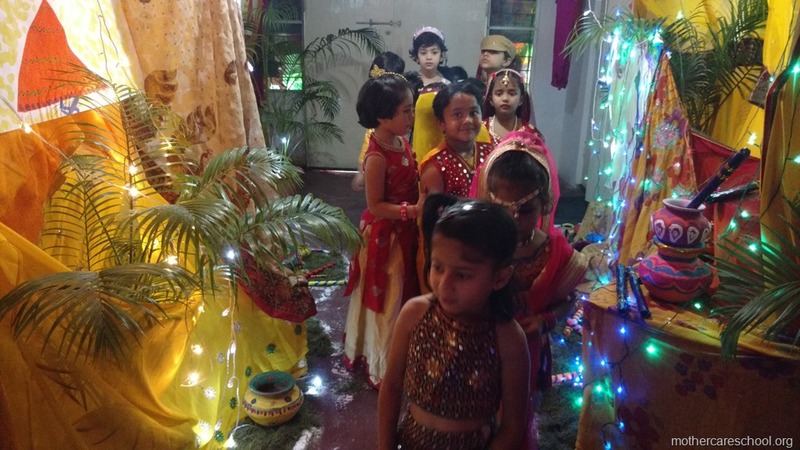 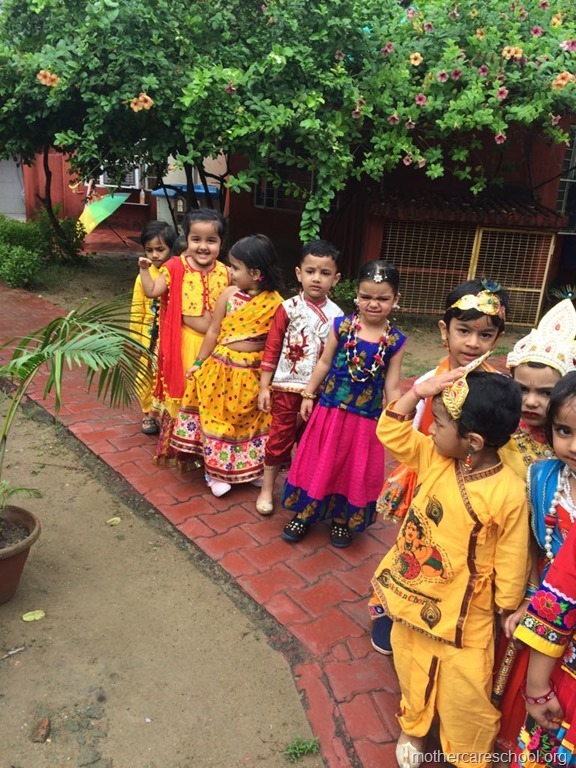 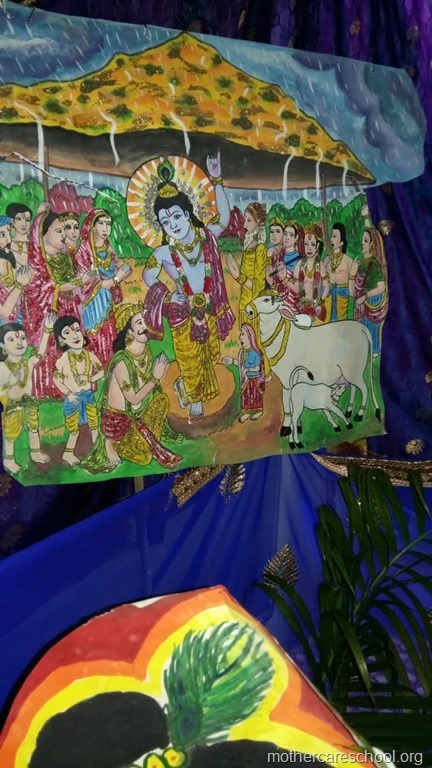 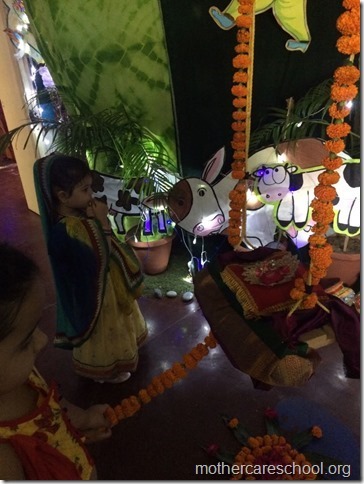 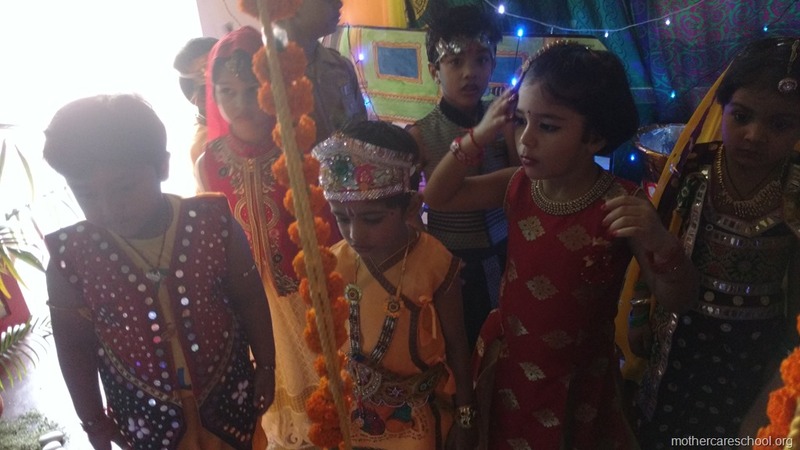 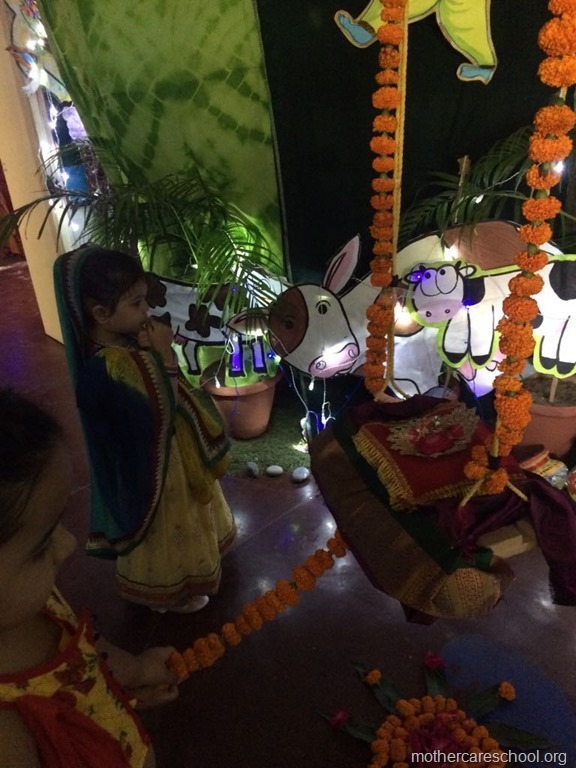 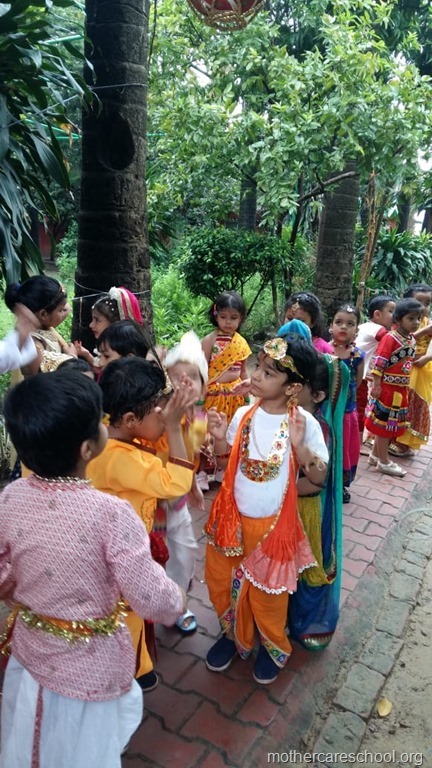 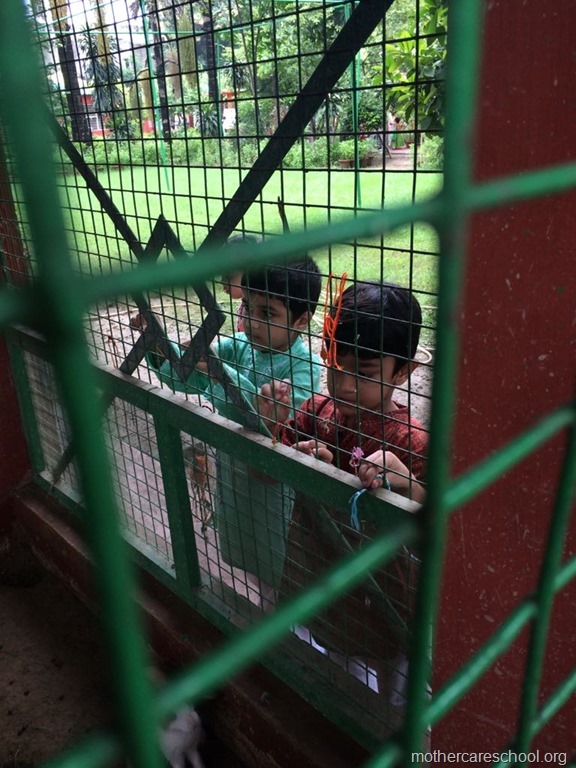 Kids enjoying the festivities of Janmashtmi. 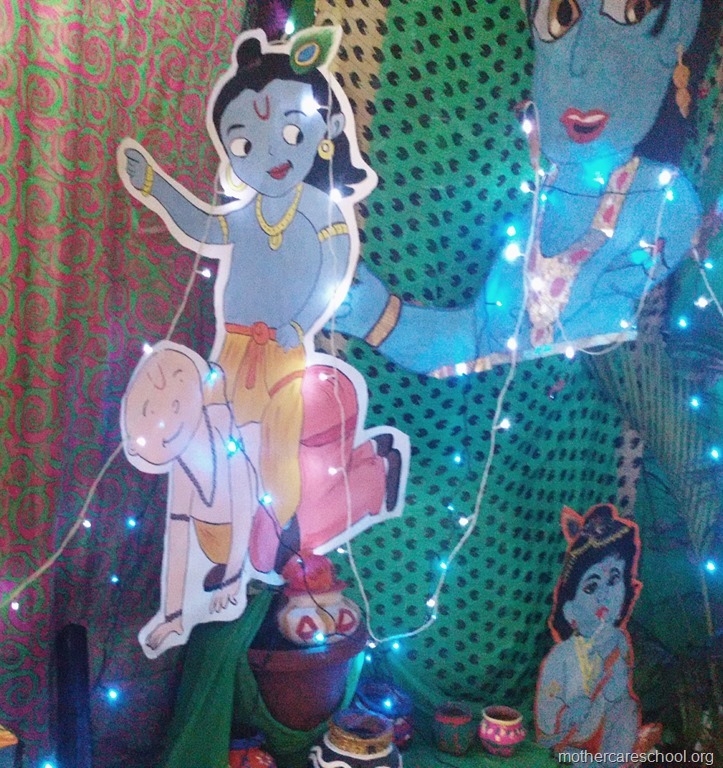 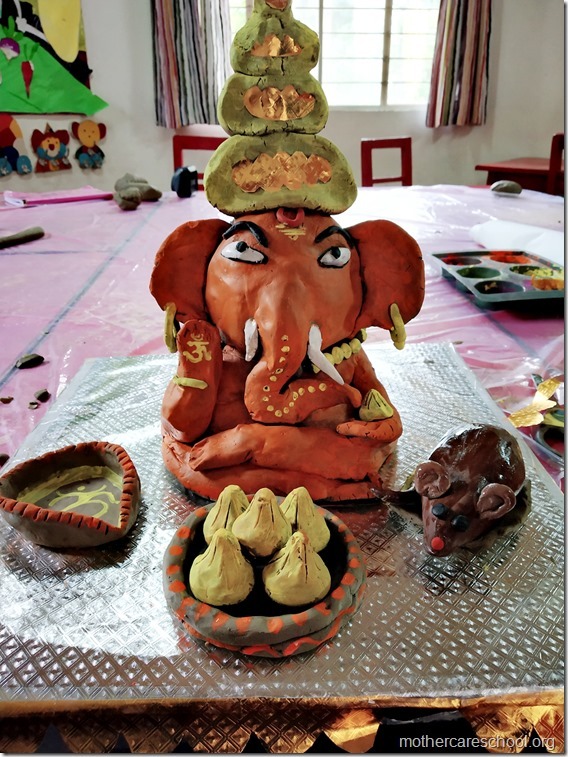 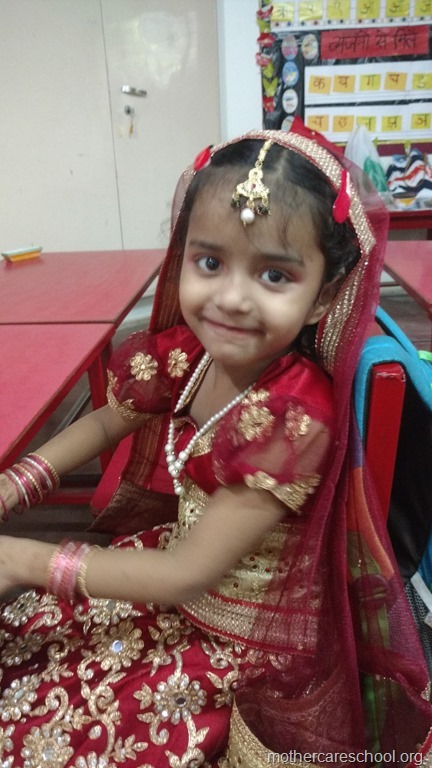 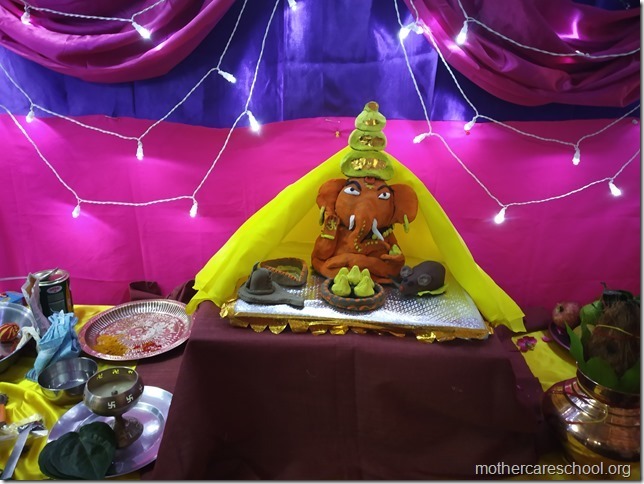 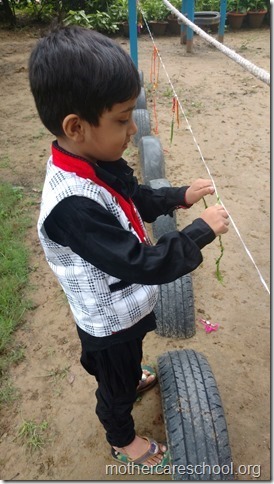 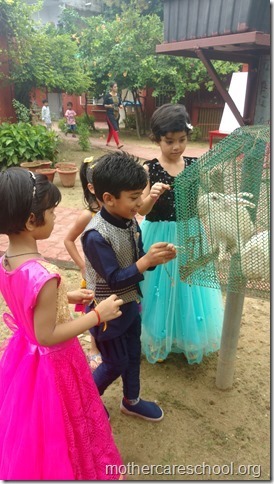 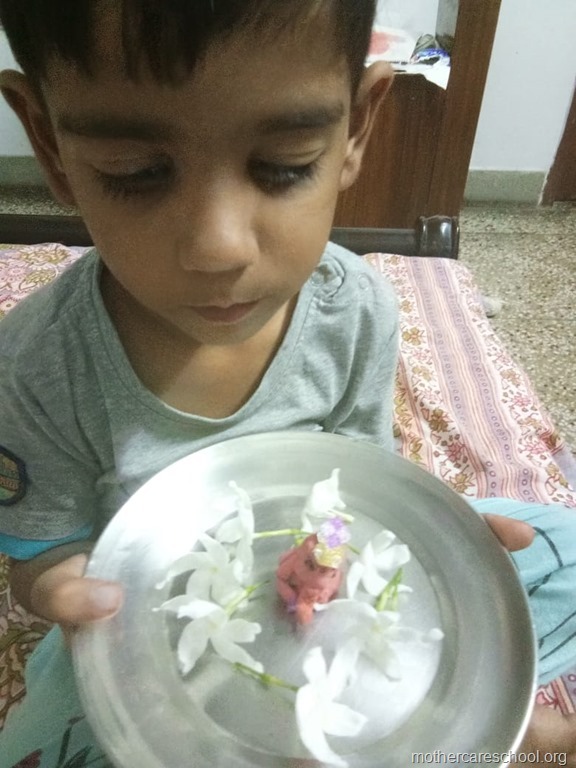 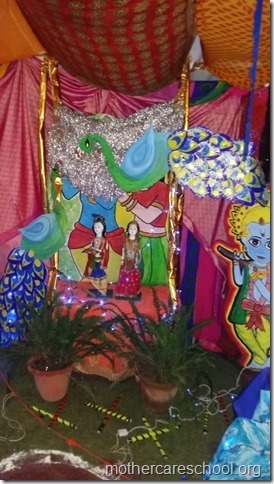 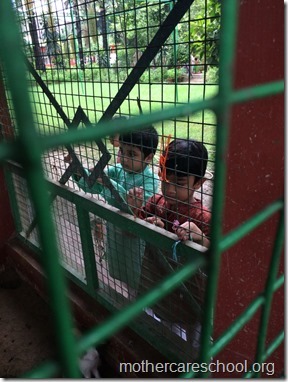 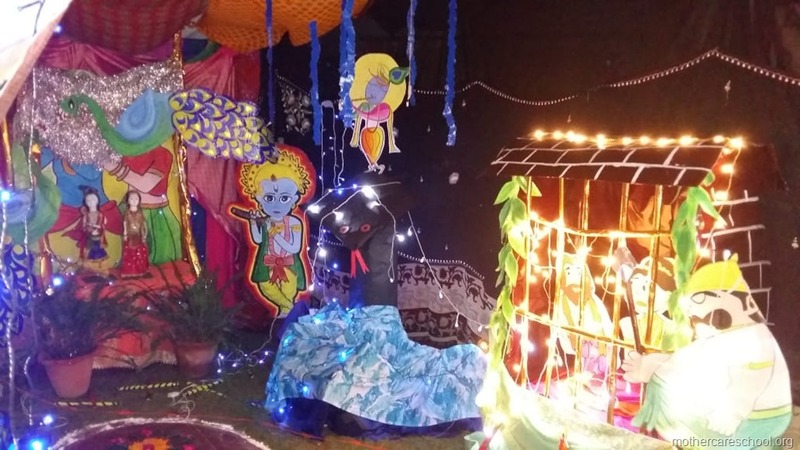 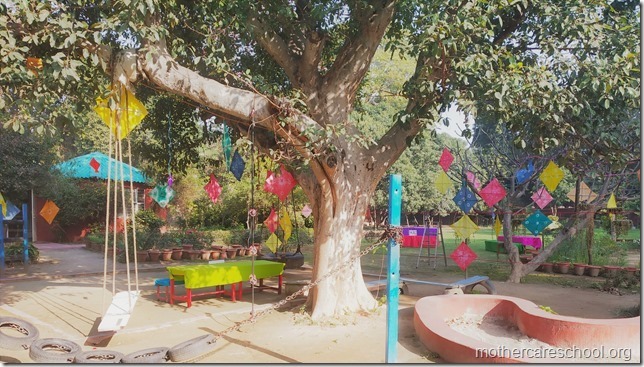 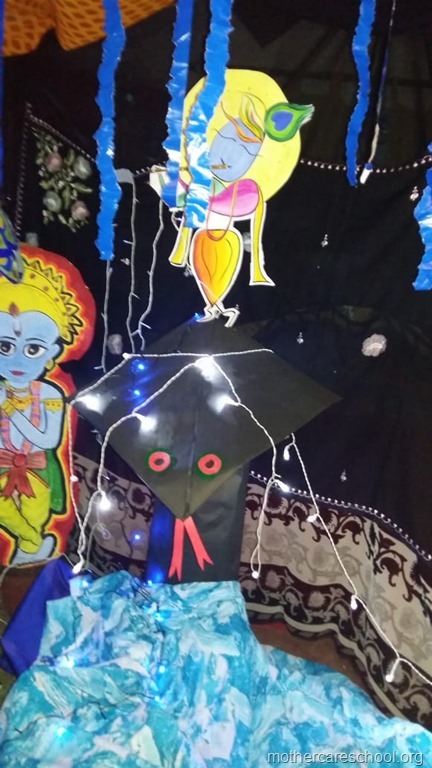 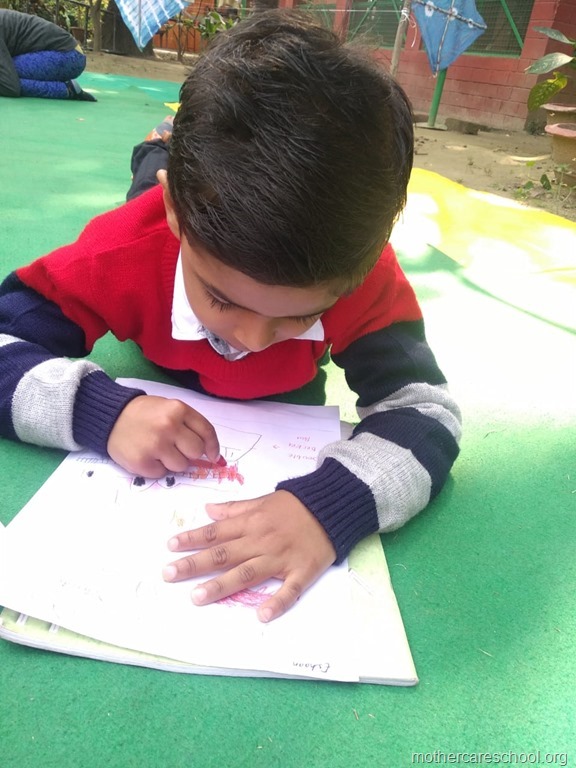 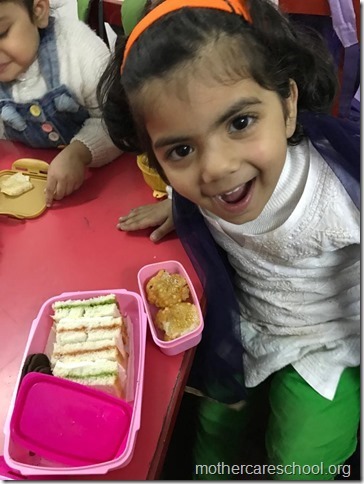 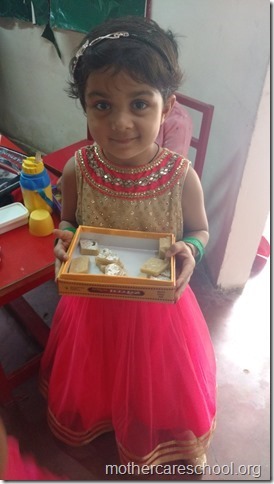 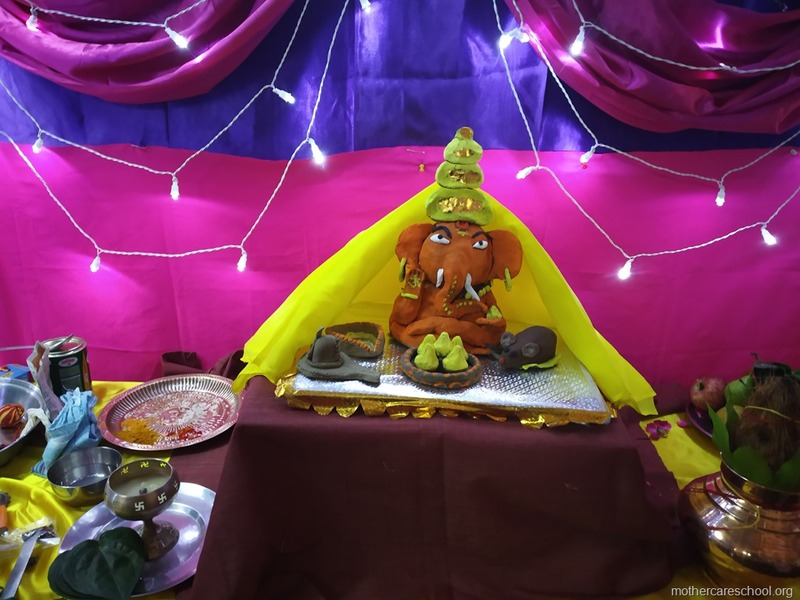 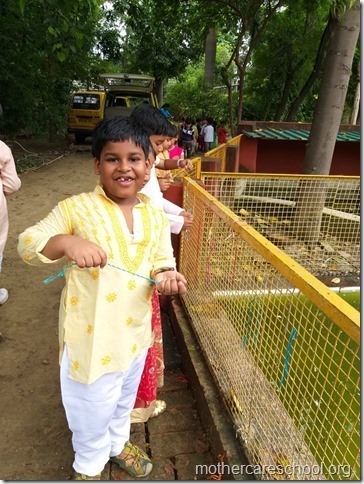 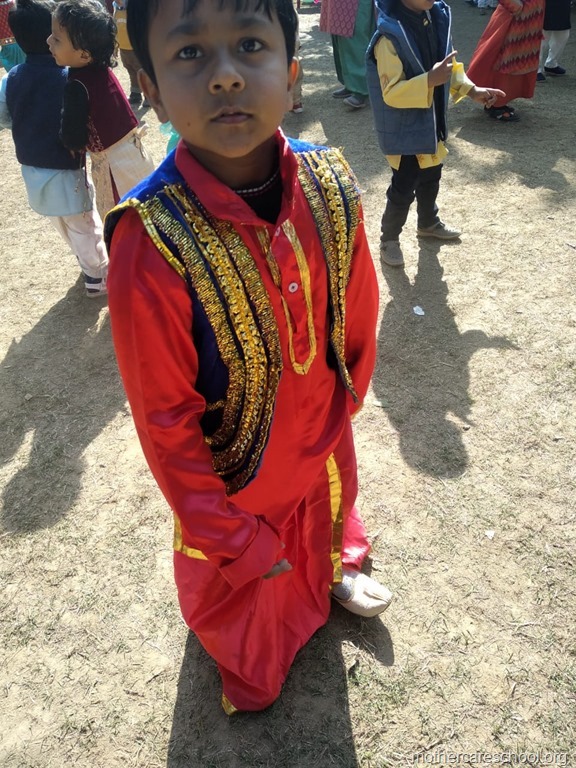 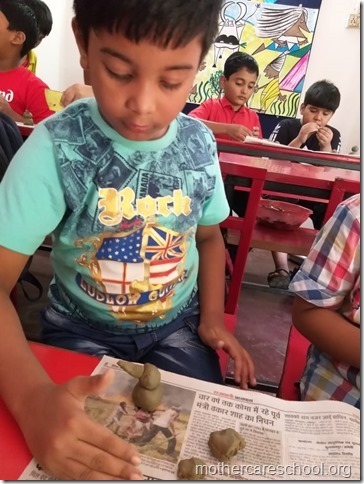 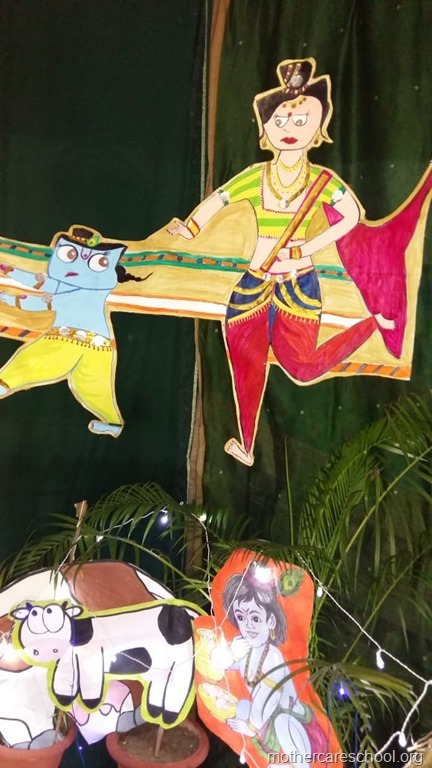 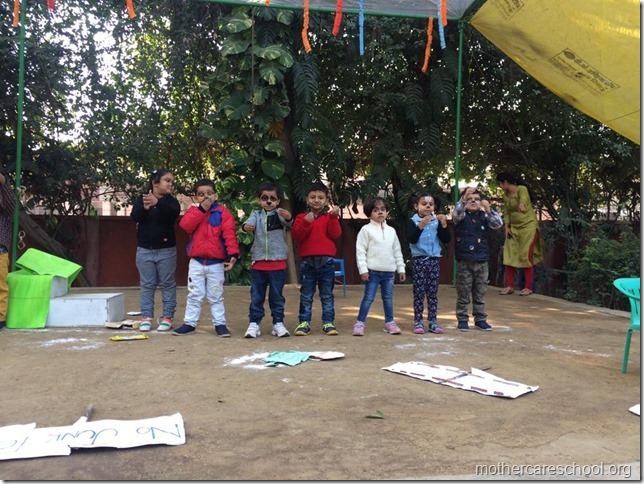 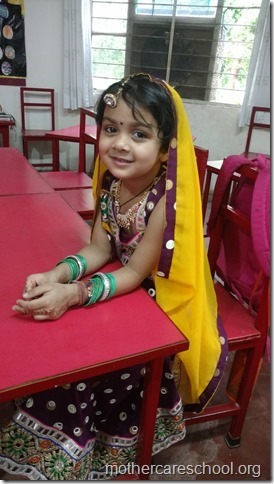 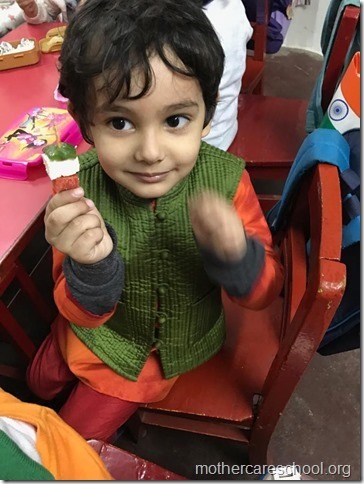 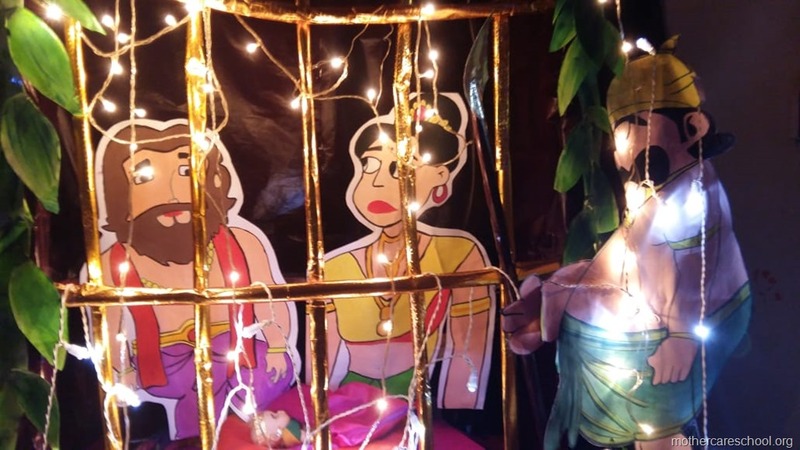 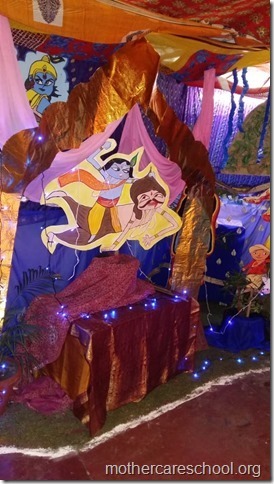 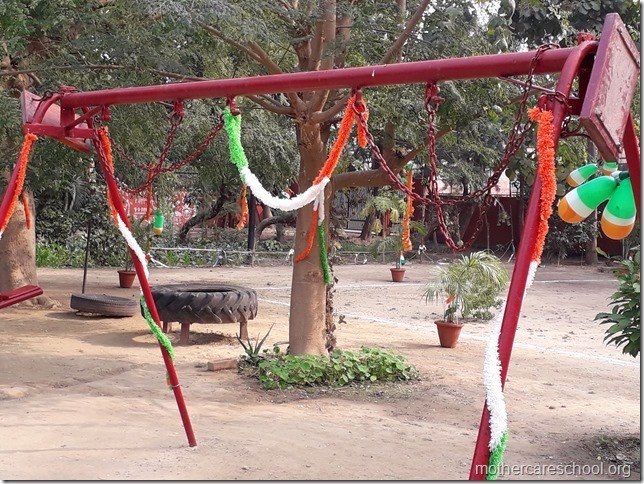 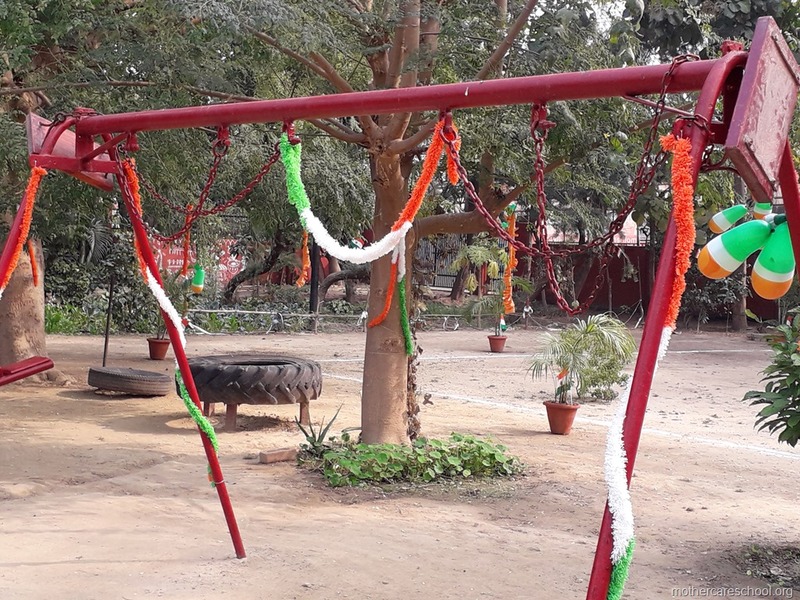 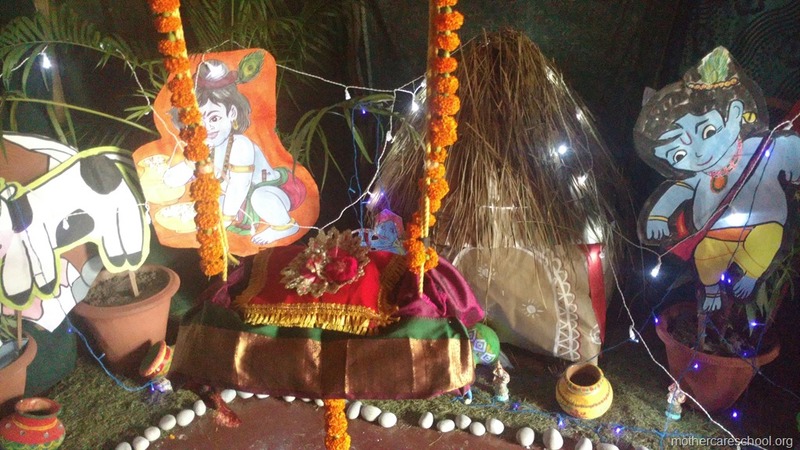 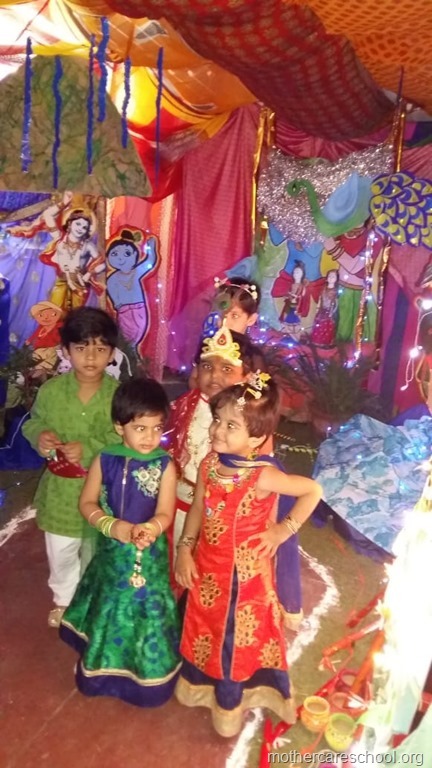 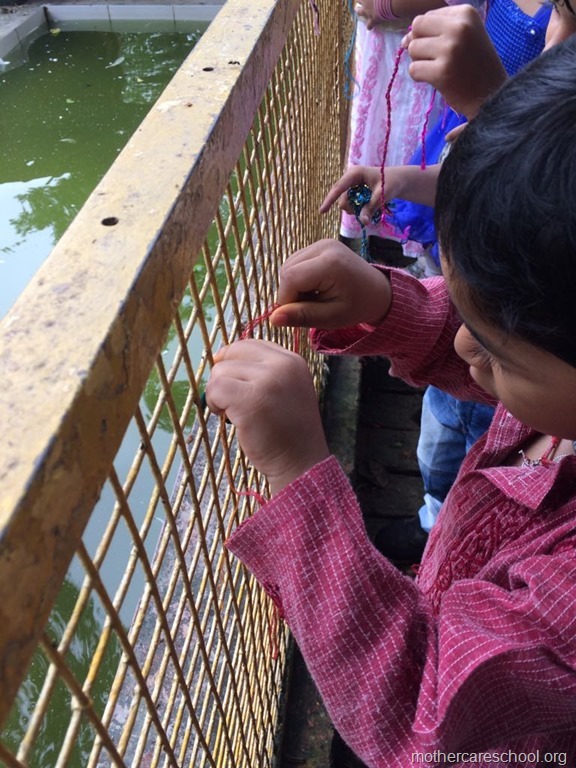 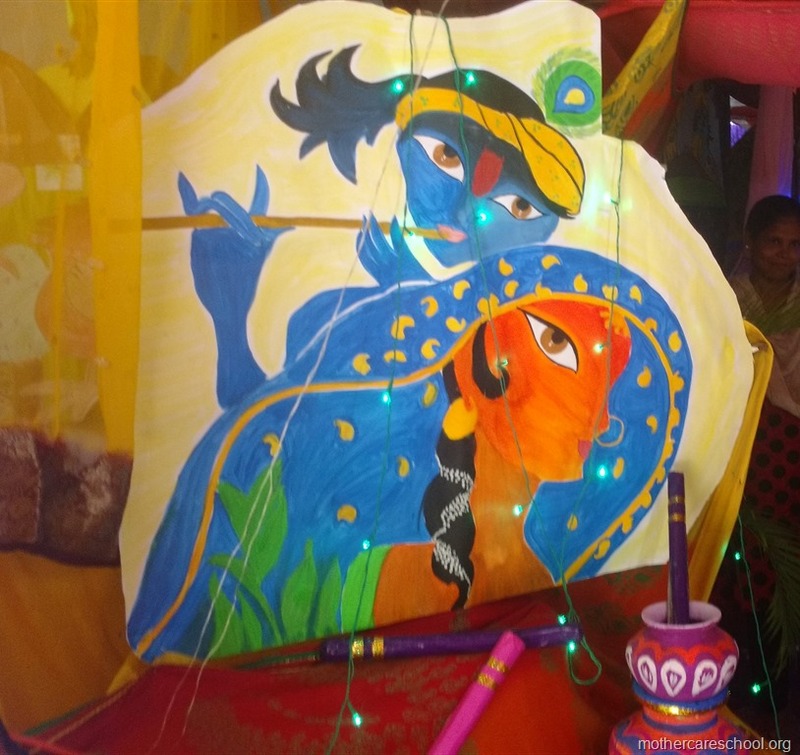 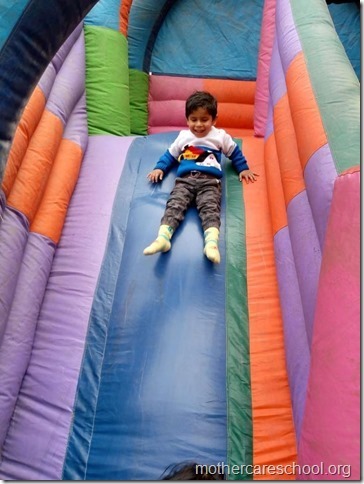 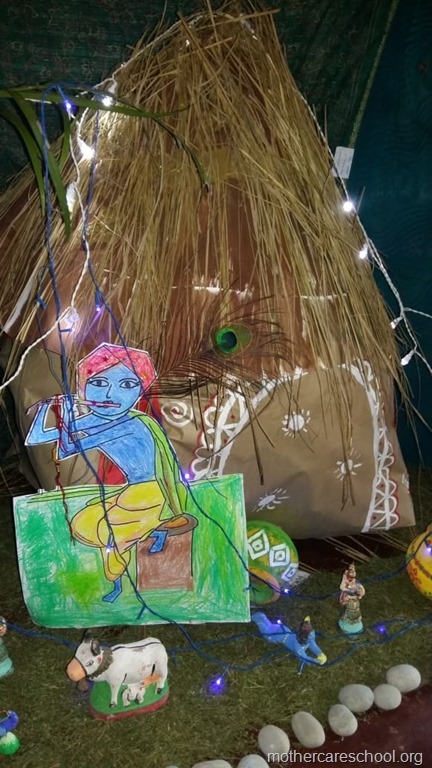 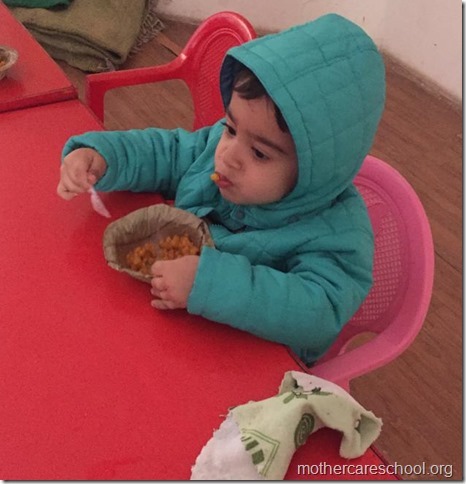 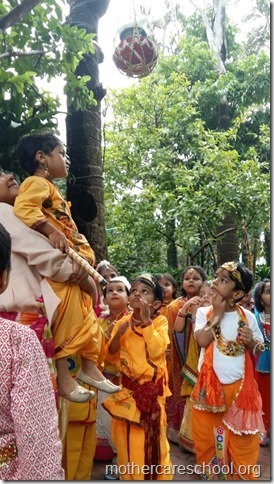 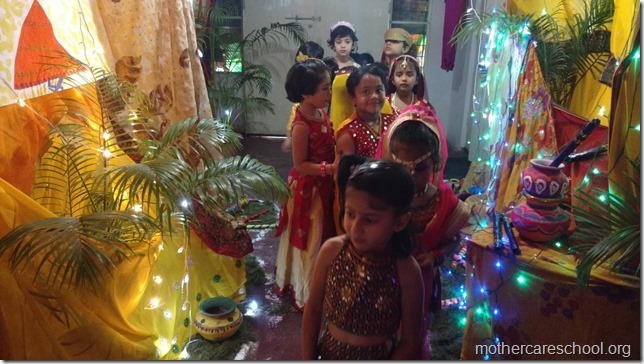 Take a look at our beautiful jhanki…..
Gokul Gaon ke chote chote gaon mein…. 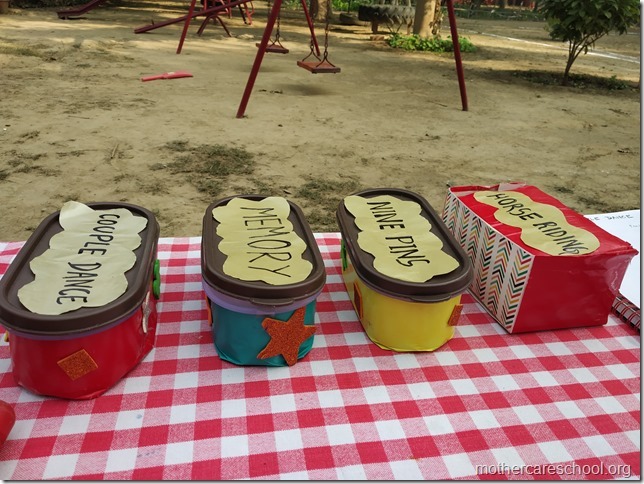 One more to go this August…….Ohhhh the month of August!!!!! 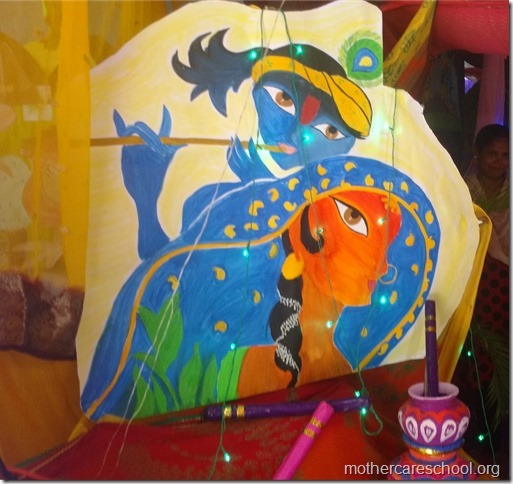 Matki's and bansuri's in the making for janamashtmi. 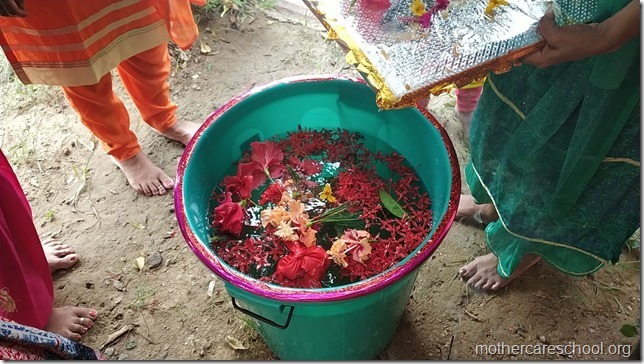 Janmashtmi Preparations. 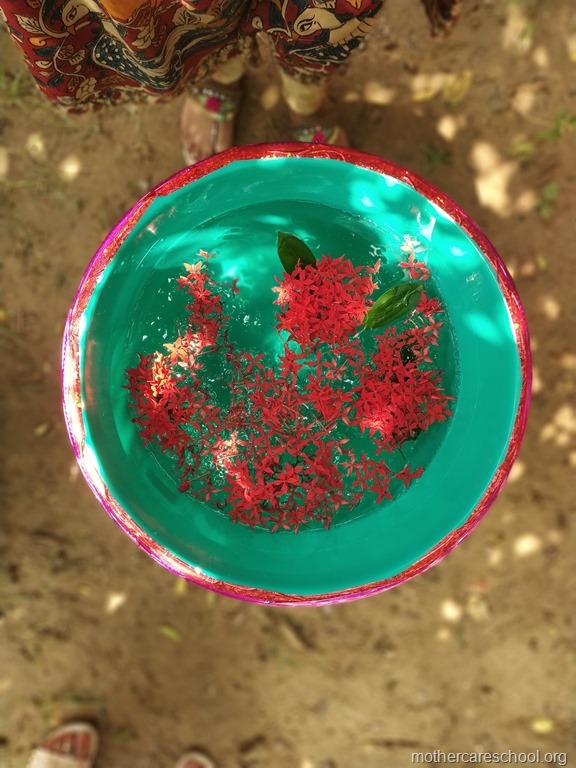 Mammas made panjiri. 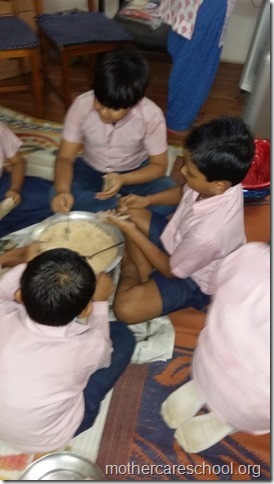 MAG seniors packaging the prasad. Like old times. Festival. 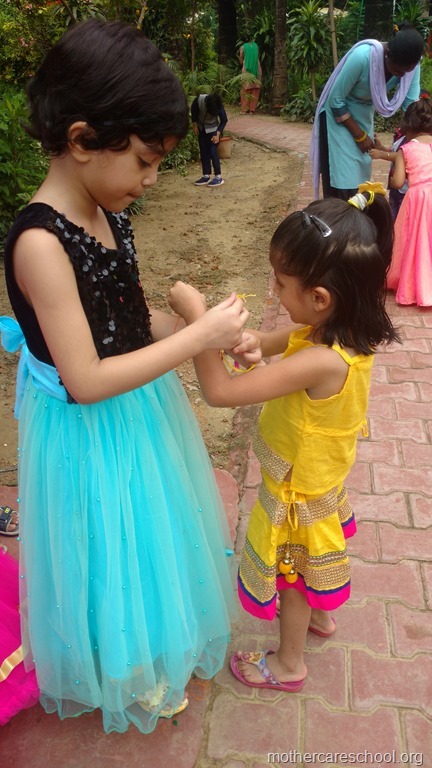 Celebrating together. 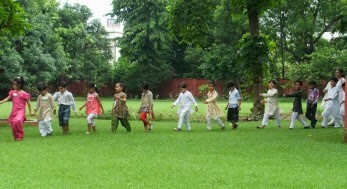 The old, the young, the kids all coming together to make the event a success. OUR TREEE’s and their meaning. 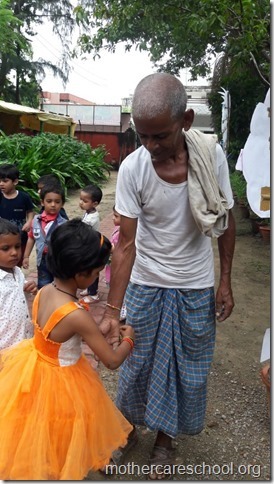 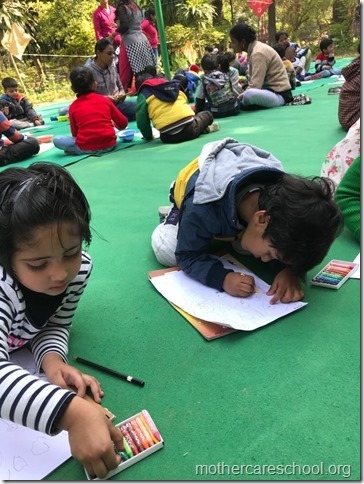 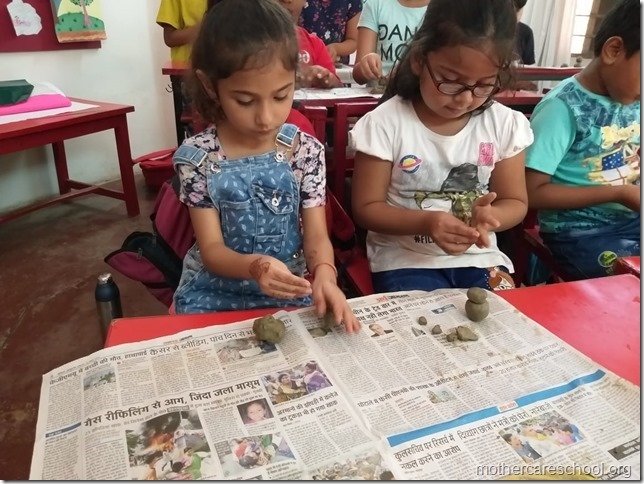 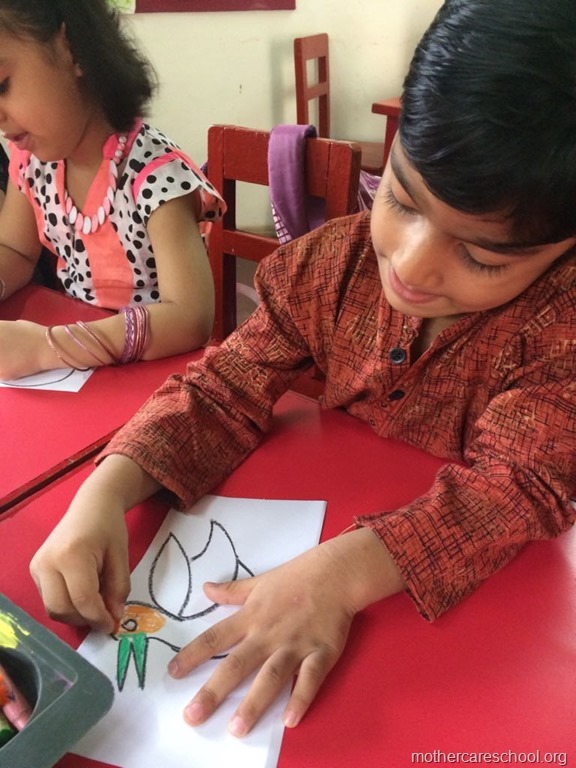 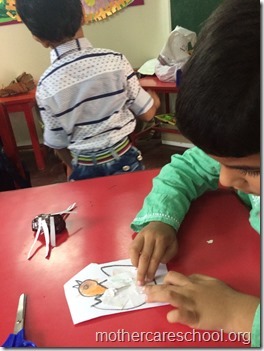 Children learning about moving together, appreciation, gratitude on rakhshabandhan. Some are learning, some understand some know this by heart and some recite. 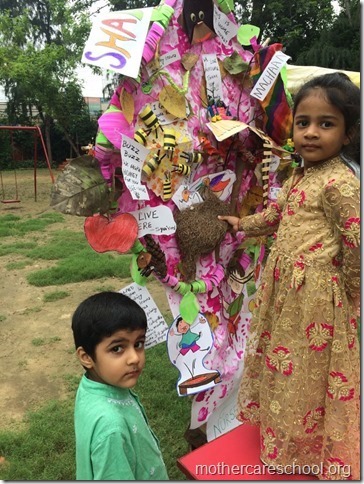 Playgroup kids involved with making of this Tree that’s Fun for birds, monkeys, butterflies, kids even their loving krishna. 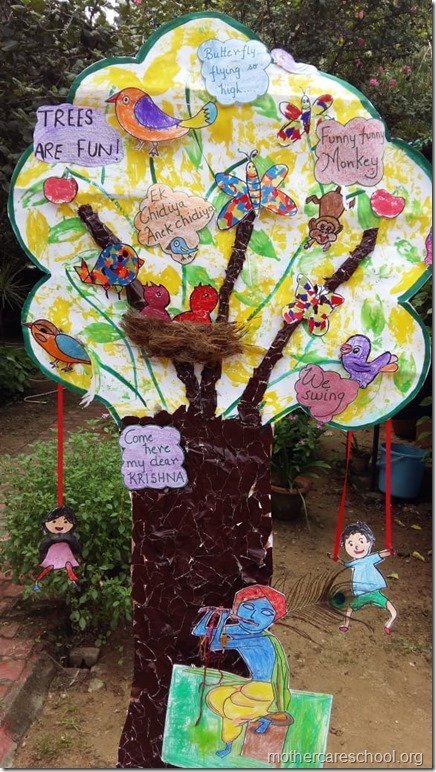 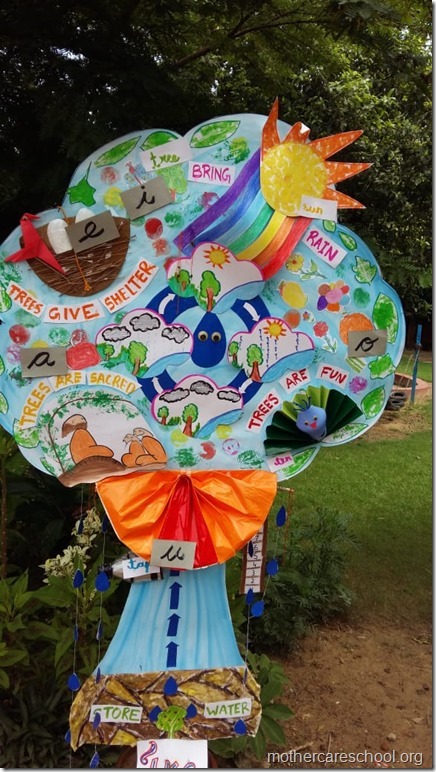 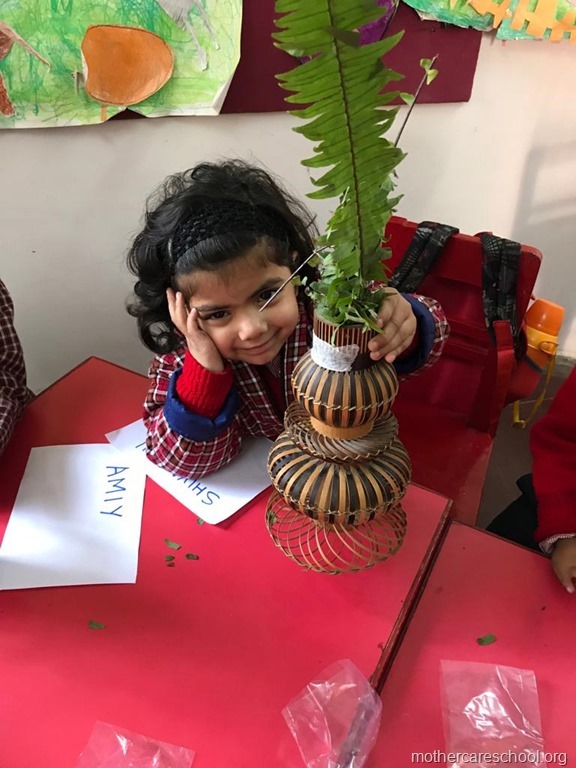 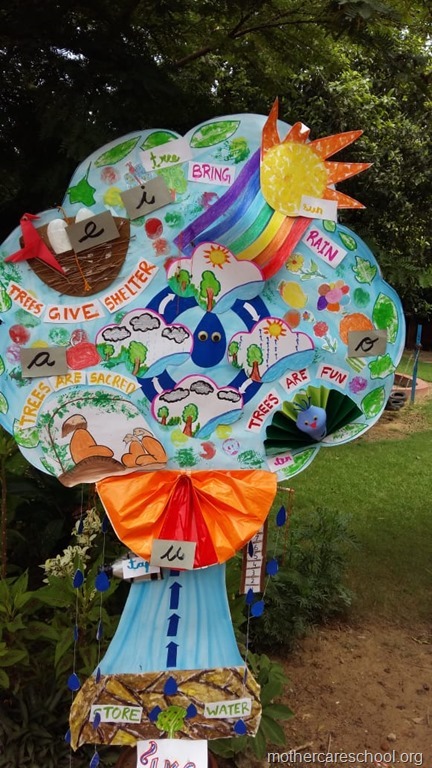 Nursery's tree depicts how trees provide shade and shelter to so many animals like bees, birds, spiders and snakes and even to us with a tree house. 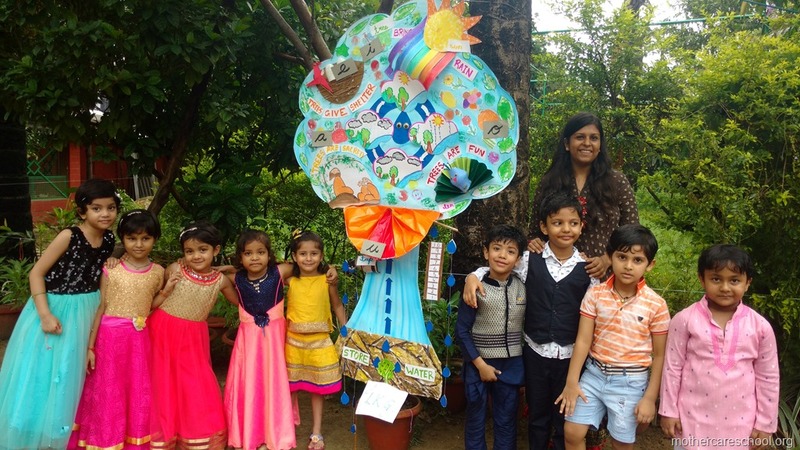 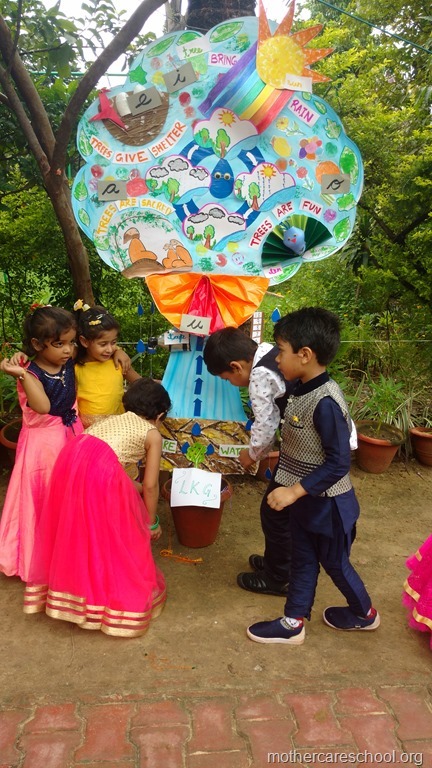 LKG's tree Explains the water cycle to all their school mates. MAG: Air pollution and trees our saviour. 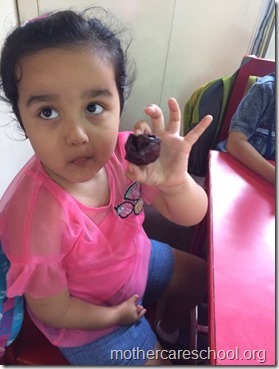 It doesn't end here….ohhh the month of August!!!! 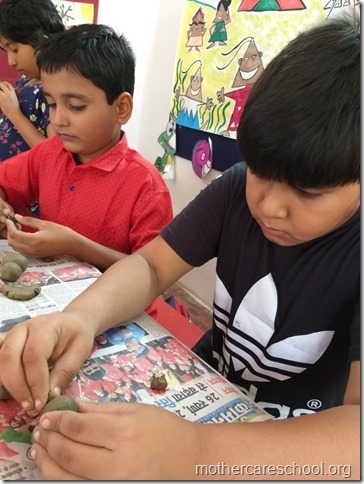 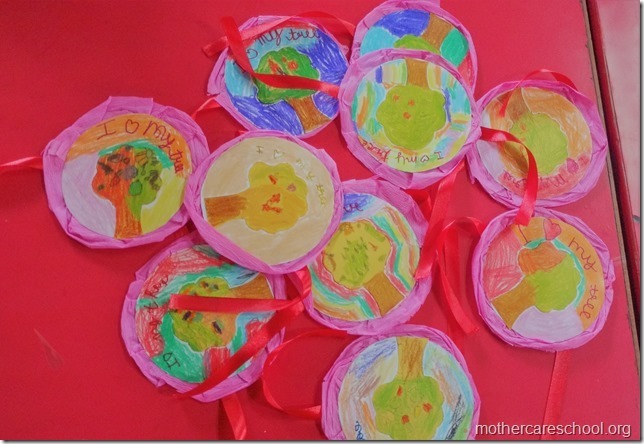 Colouring , paper crushing, tear and paste, cutting.....hand printing..
Our Big fat huge rakhis…. 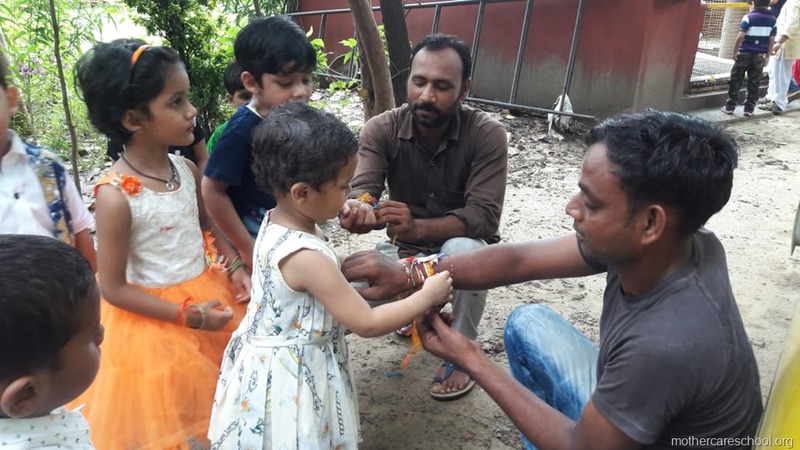 V made our own rakhi..i love my self...i take care of my self. 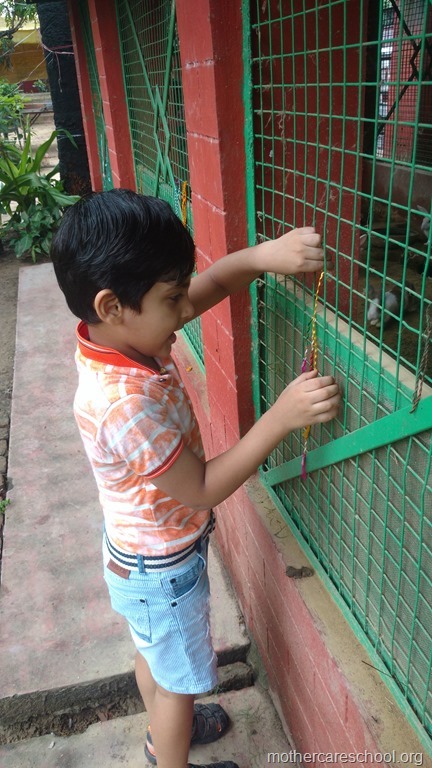 With handmade pom pom rakhis..
We love our rabbits and geese and daffy duck too…. 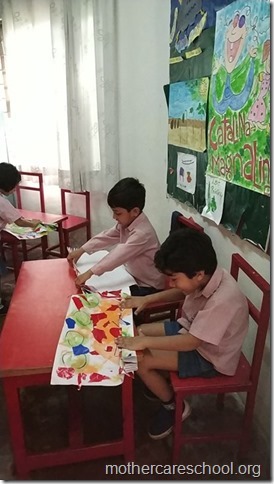 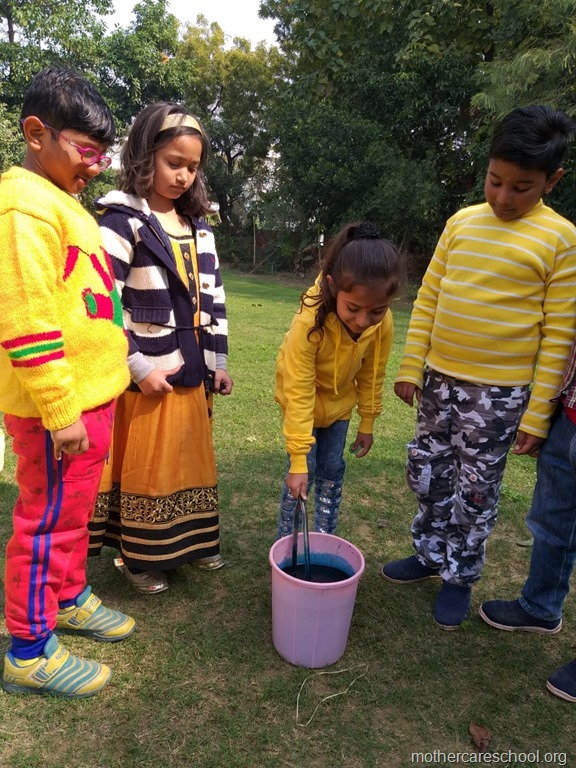 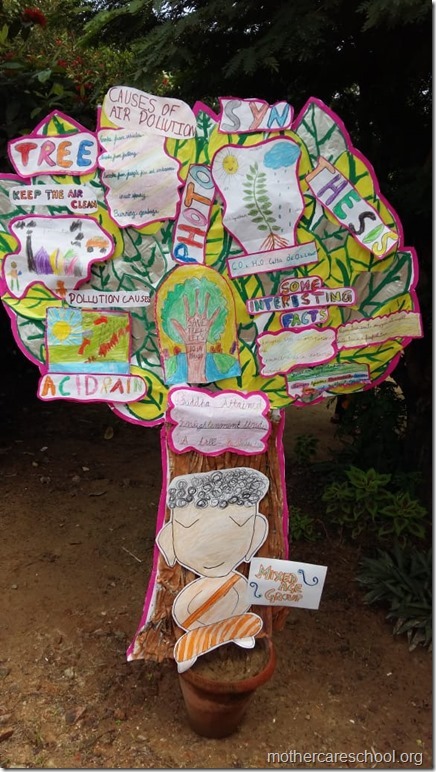 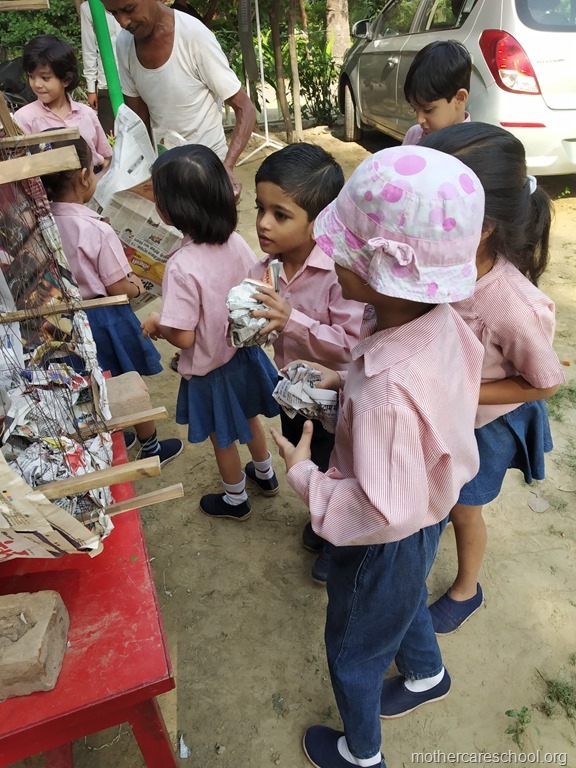 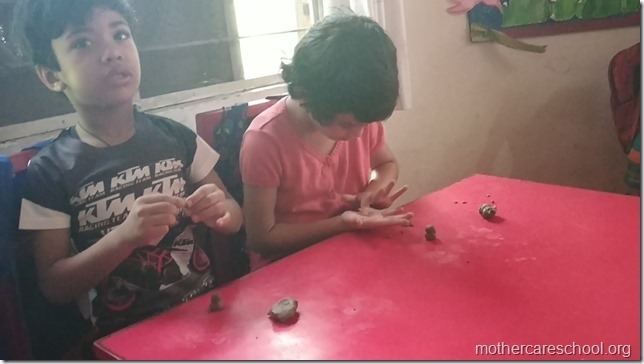 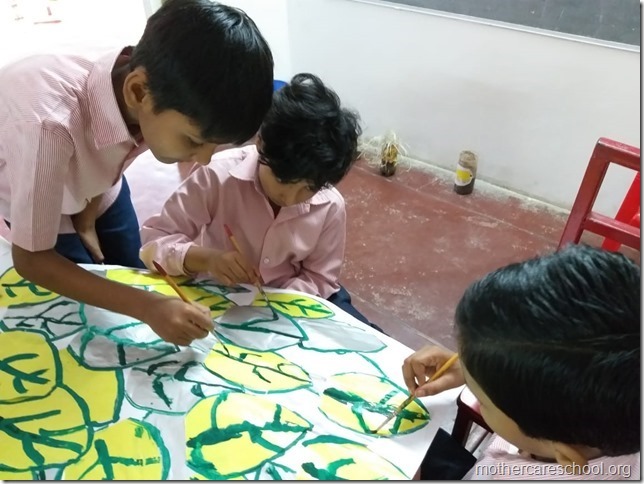 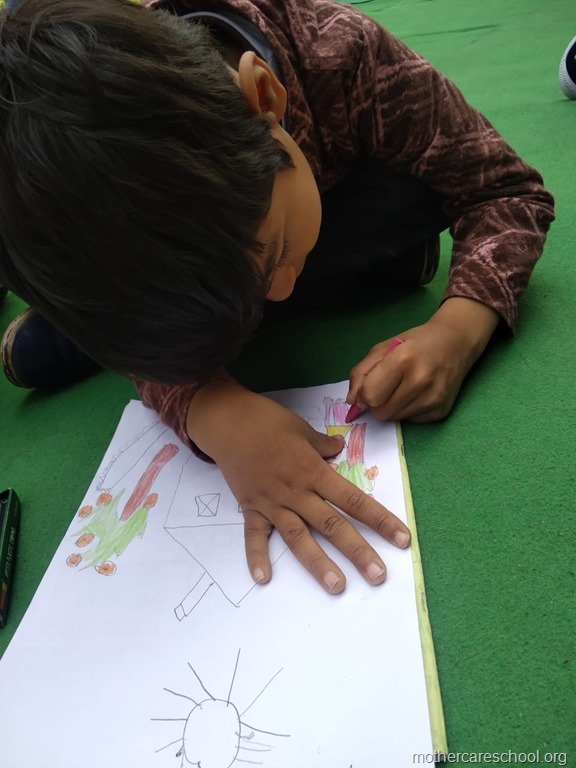 The mixed Age group kids understood what why and how of the water cycle, photosynthesis, air pollution and the role of trees in their lives through the group project on trees. 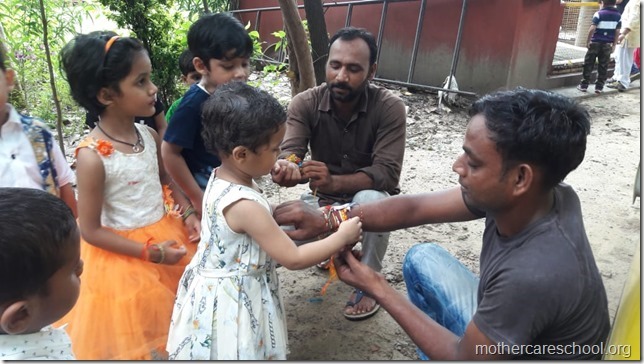 On rakshabandhan you see them sealing their relationship with gratitude. Joy of being. 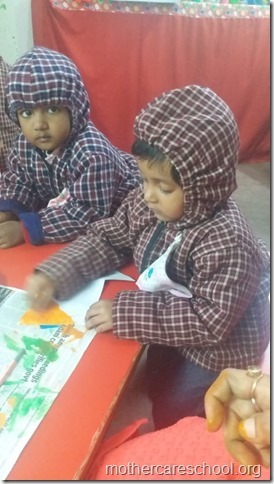 Joy of learning. 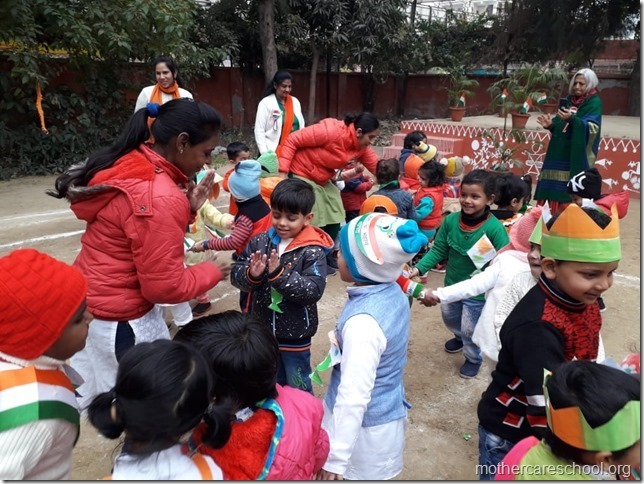 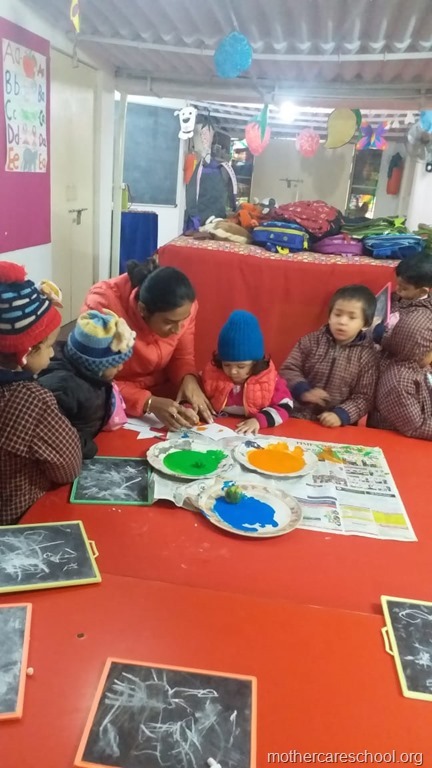 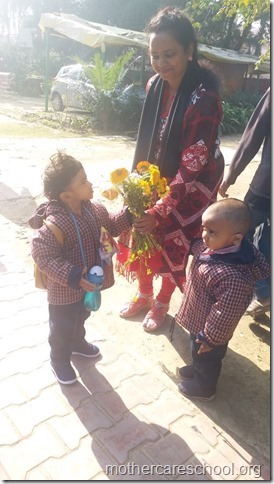 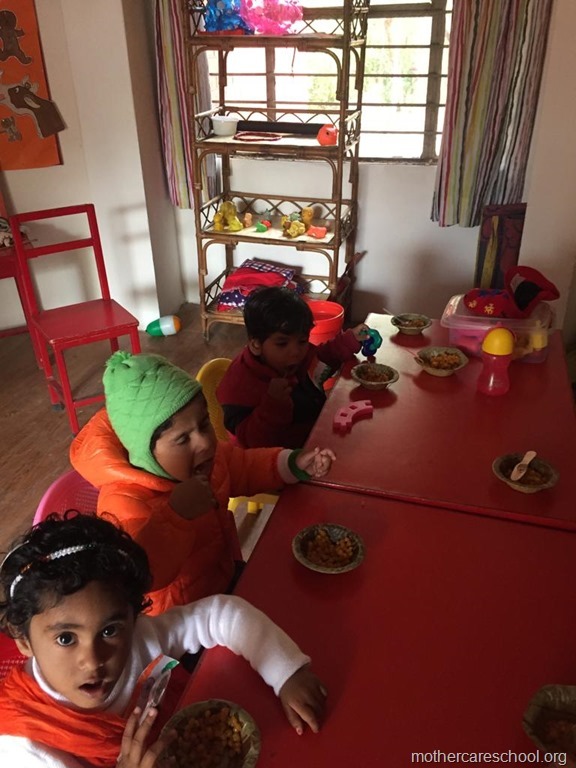 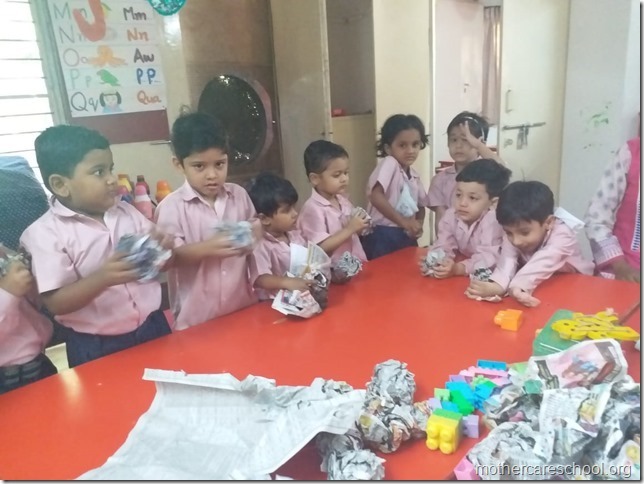 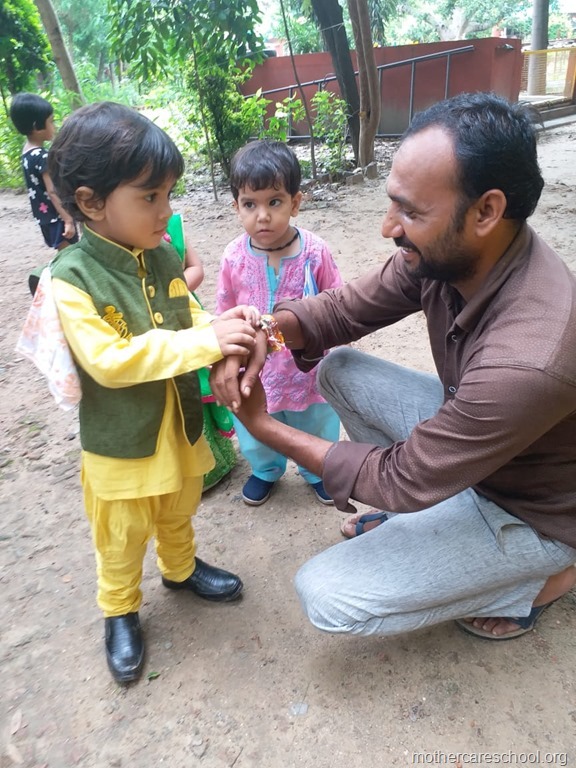 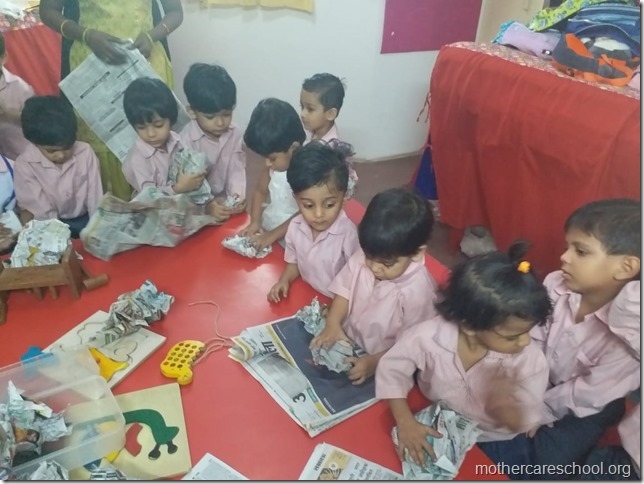 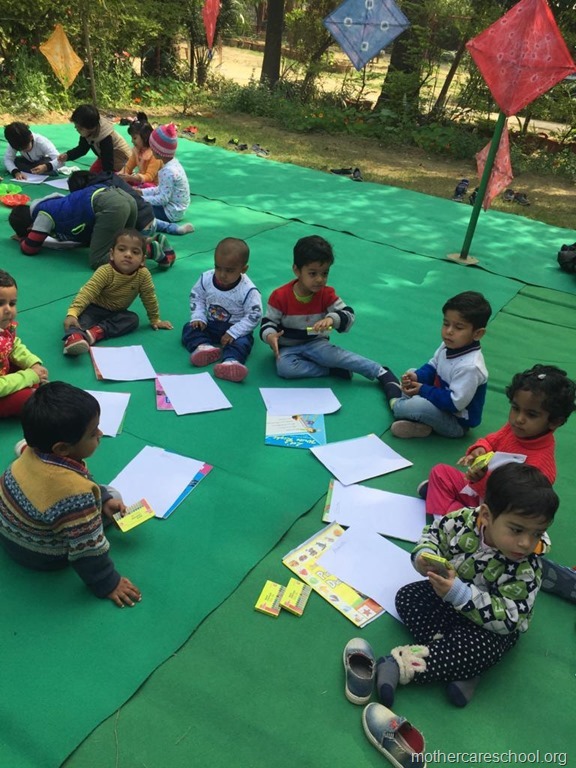 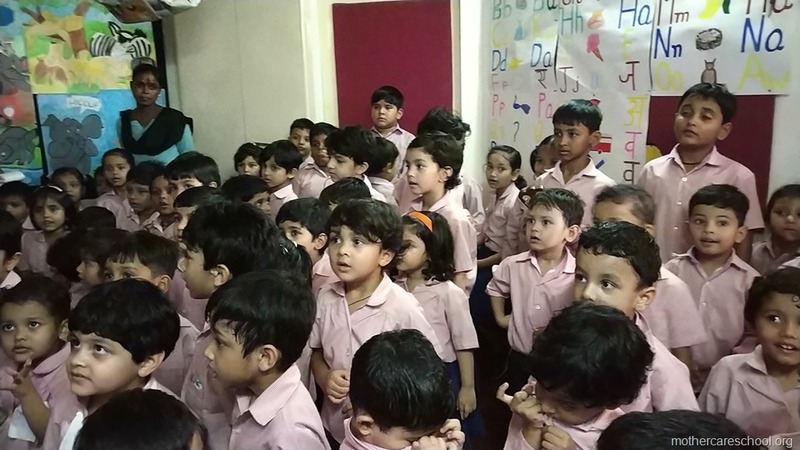 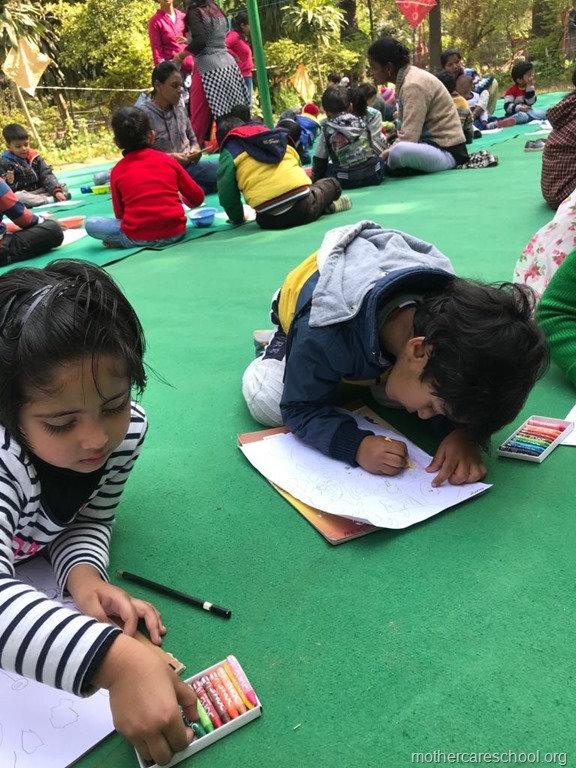 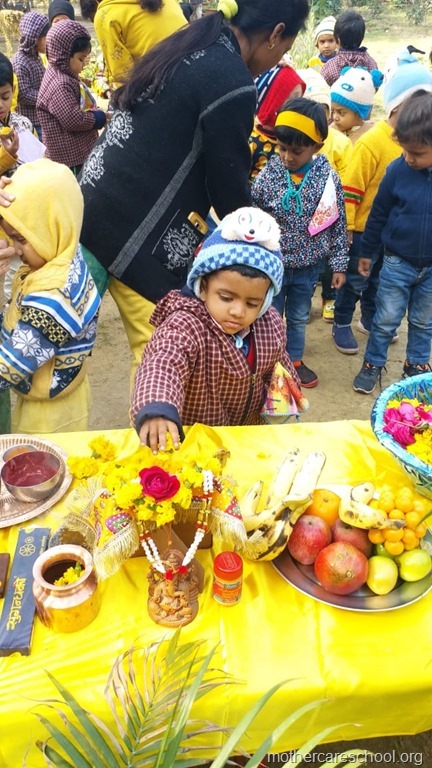 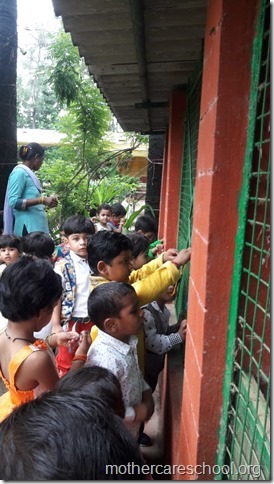 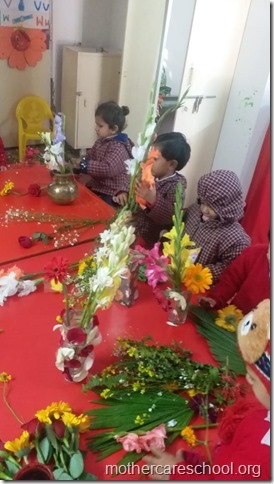 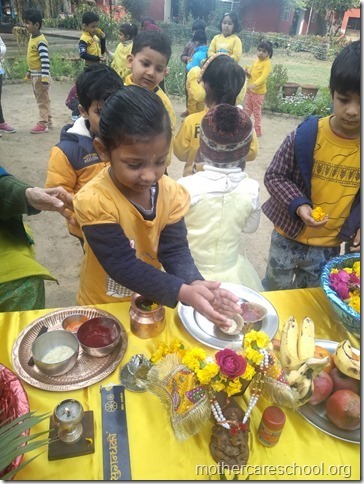 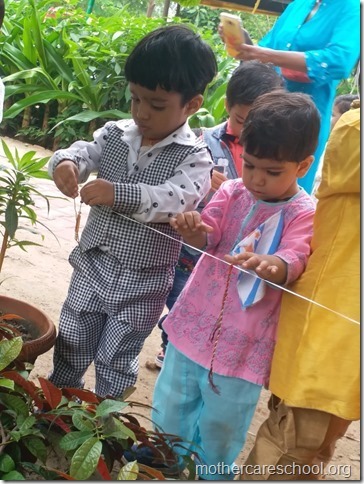 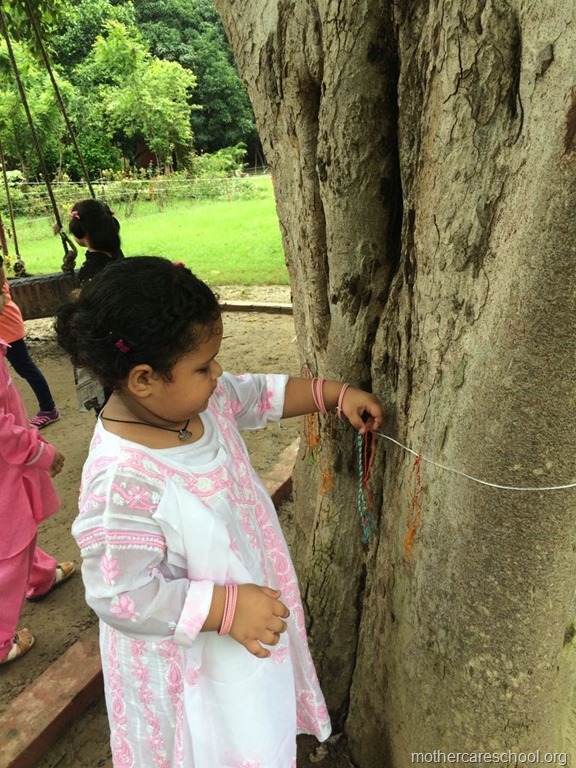 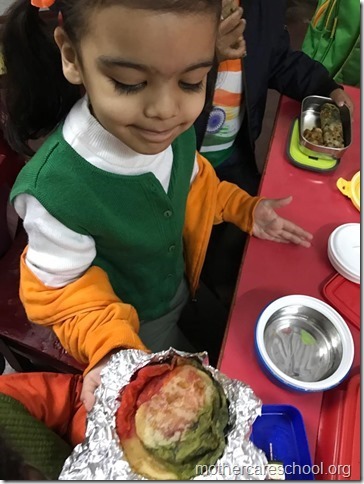 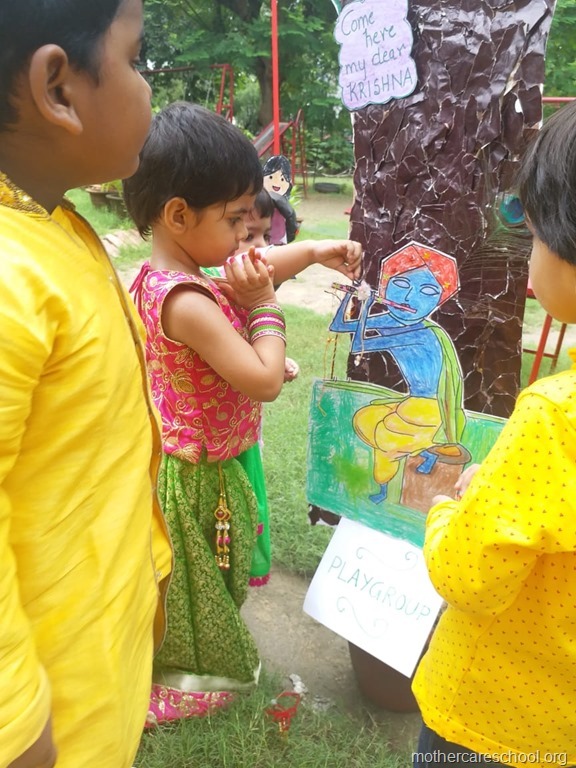 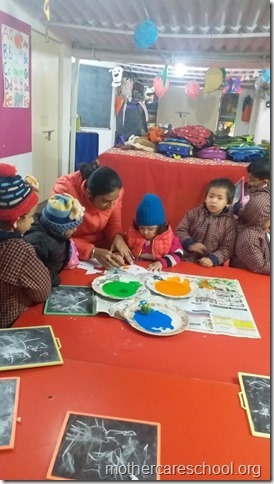 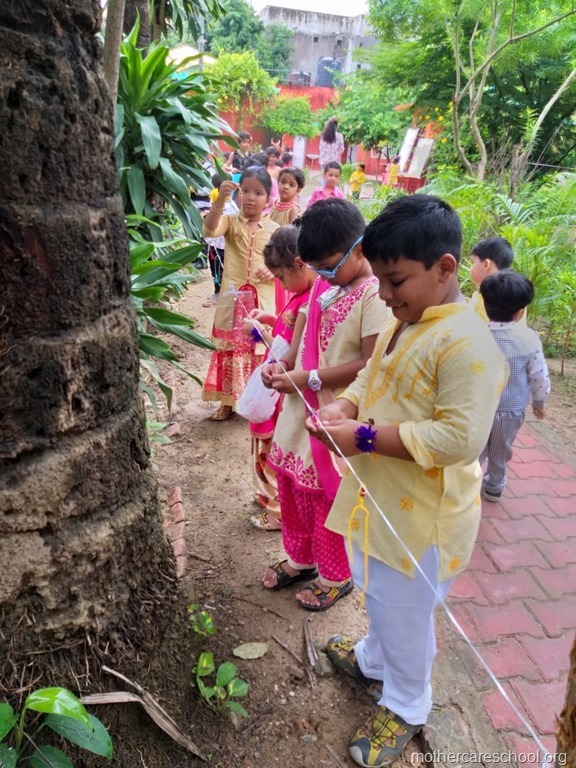 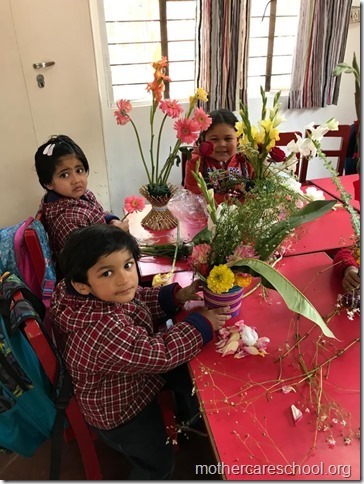 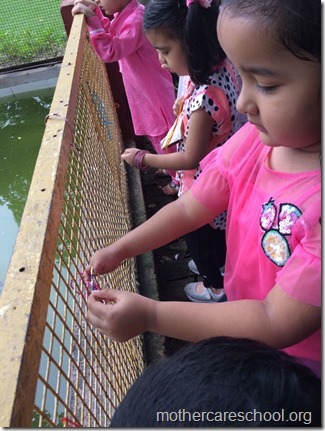 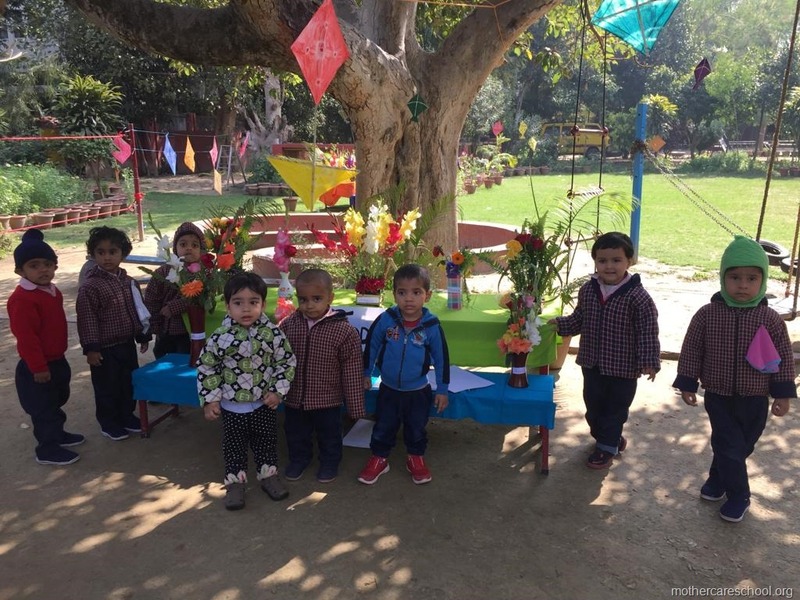 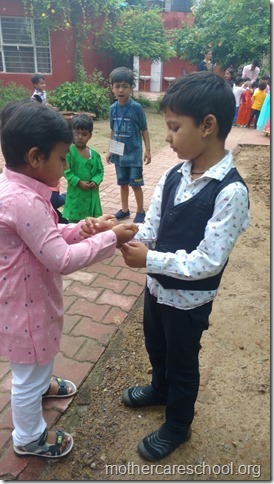 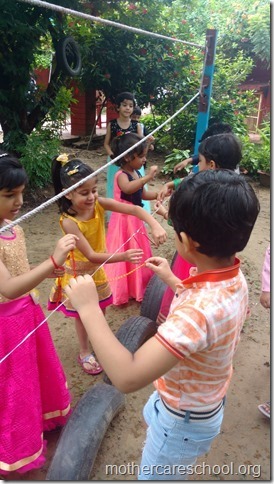 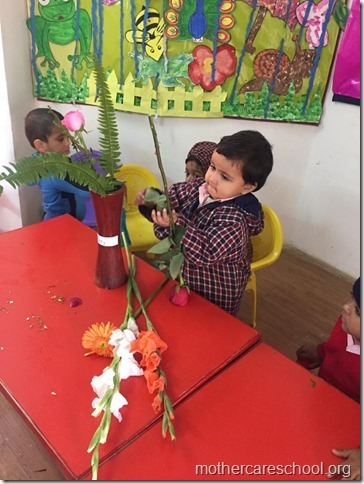 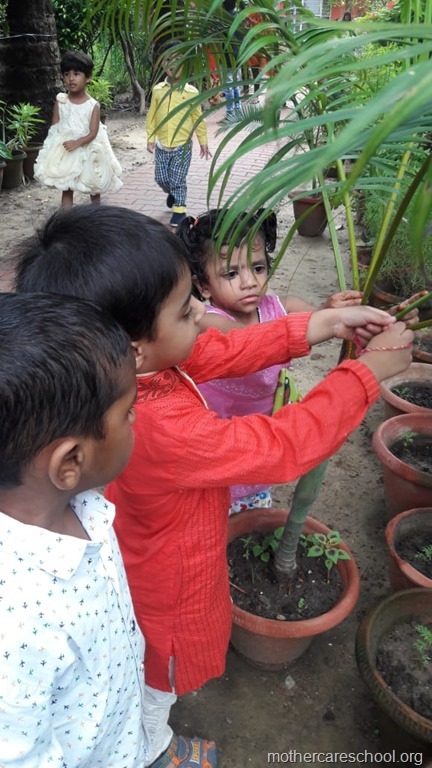 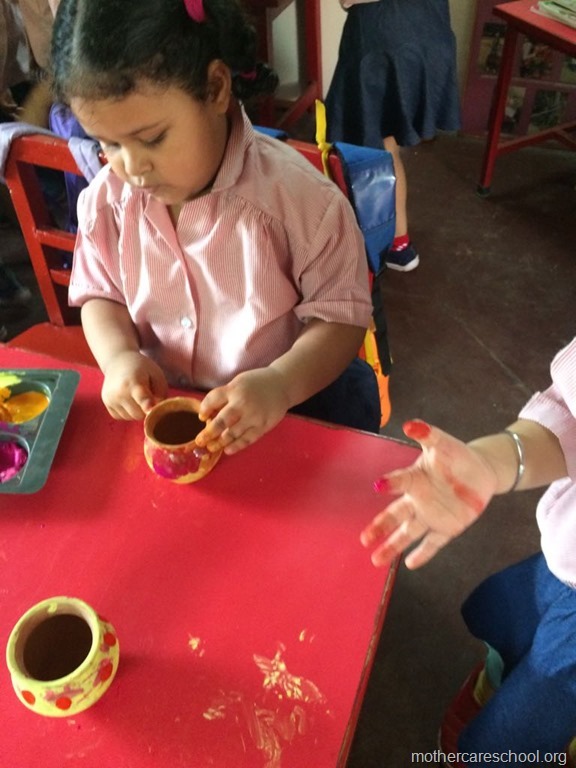 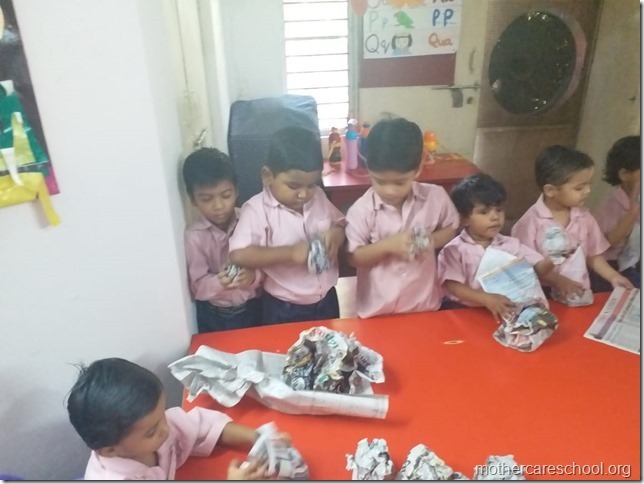 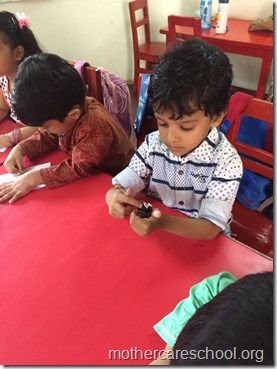 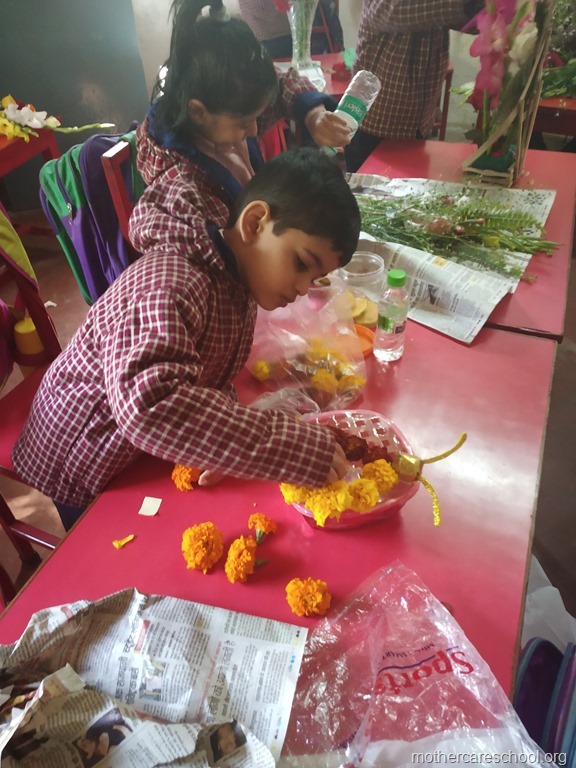 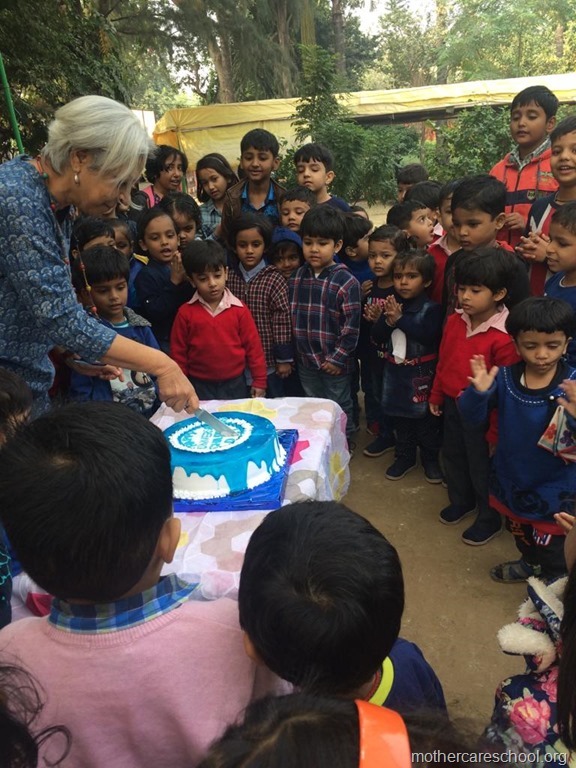 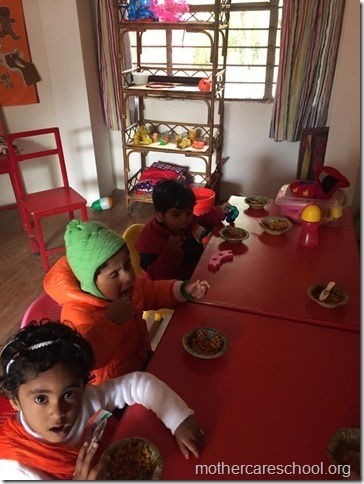 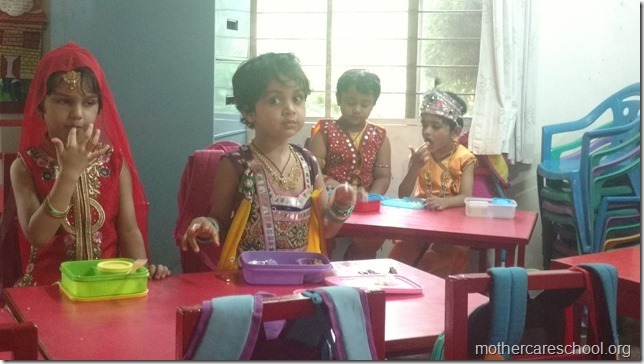 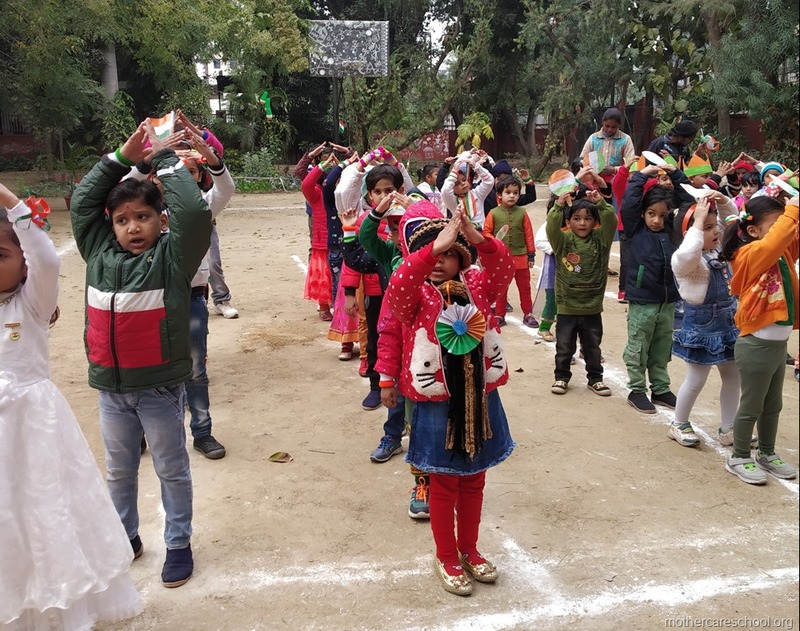 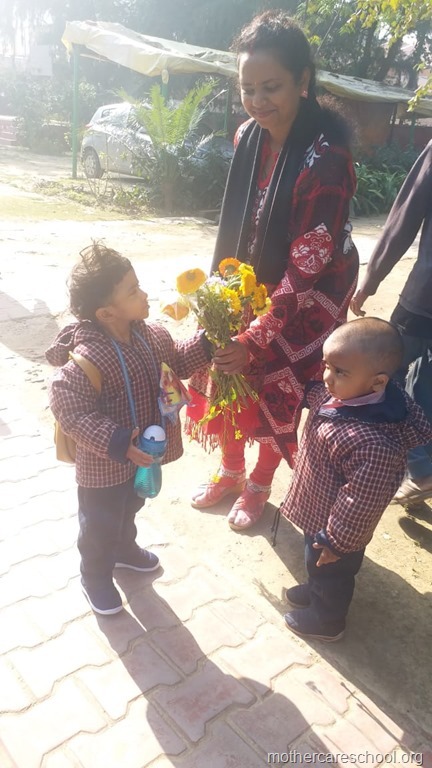 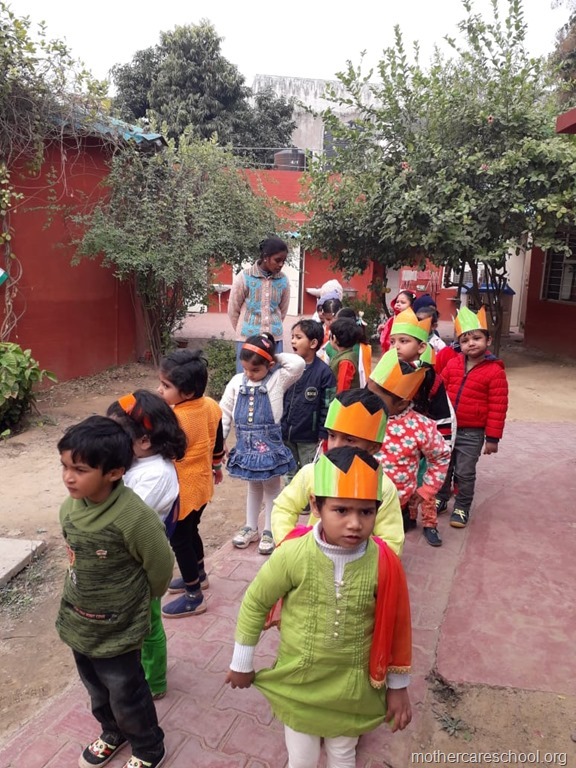 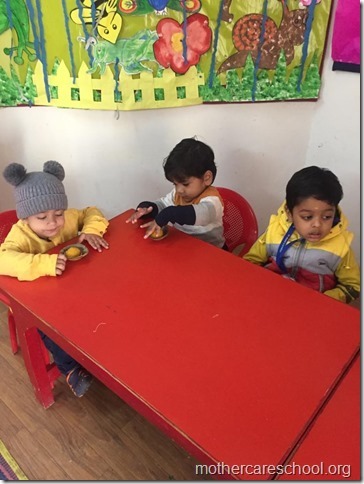 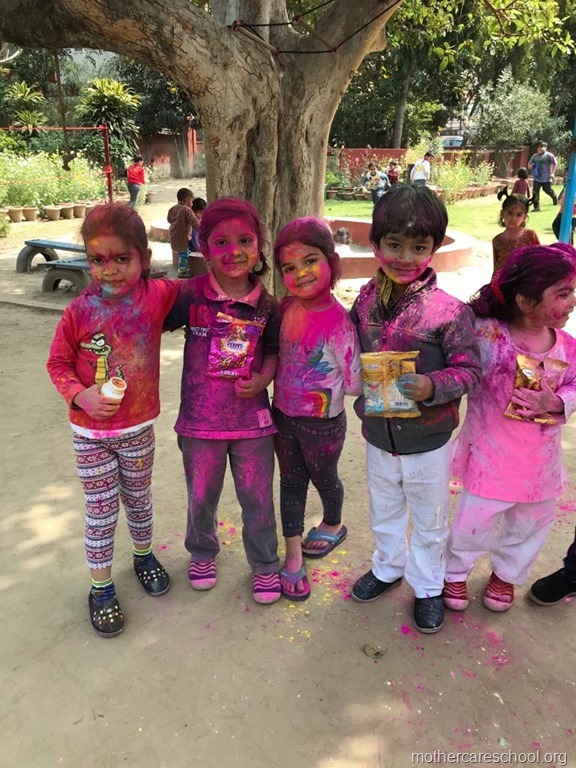 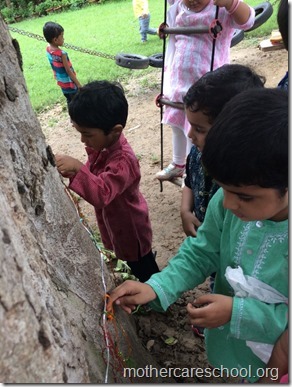 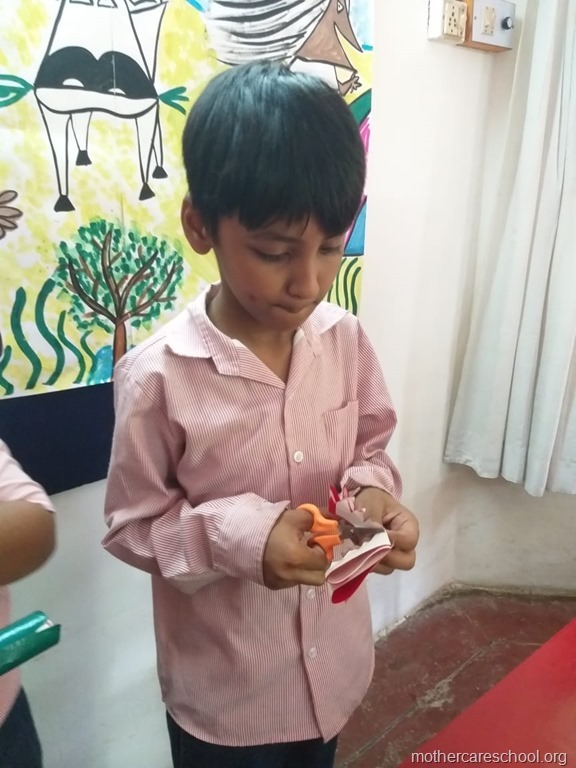 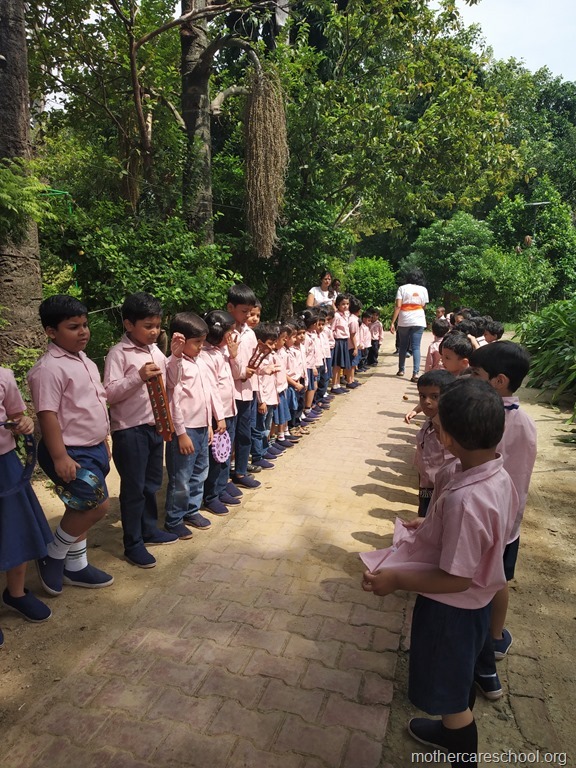 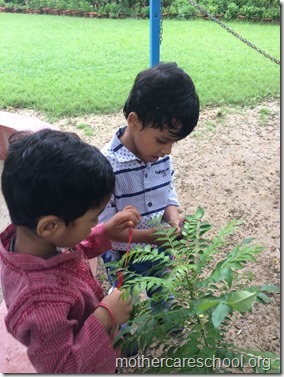 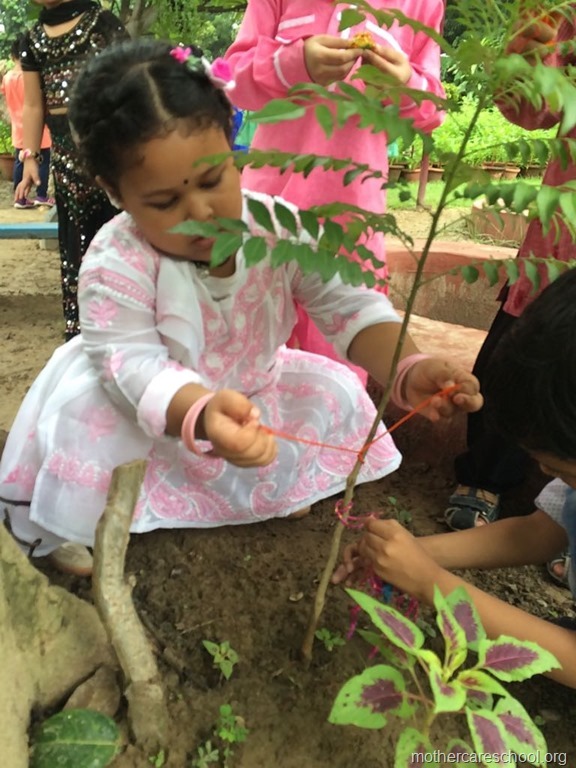 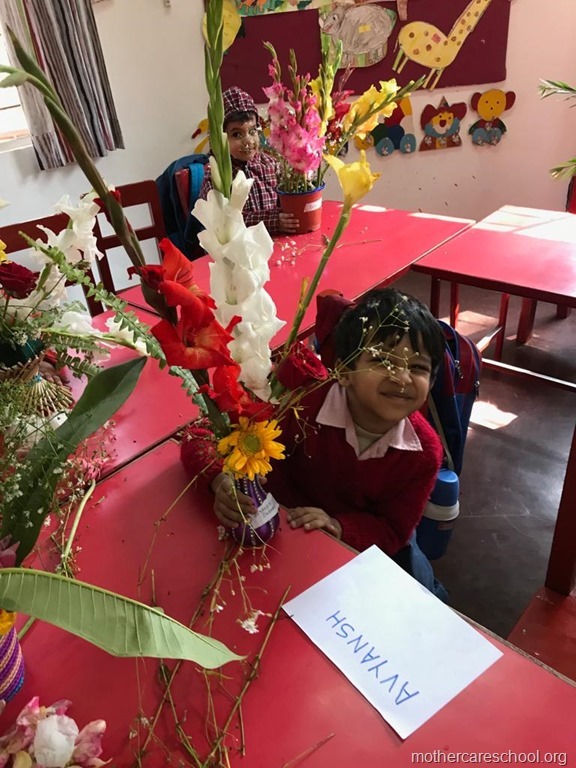 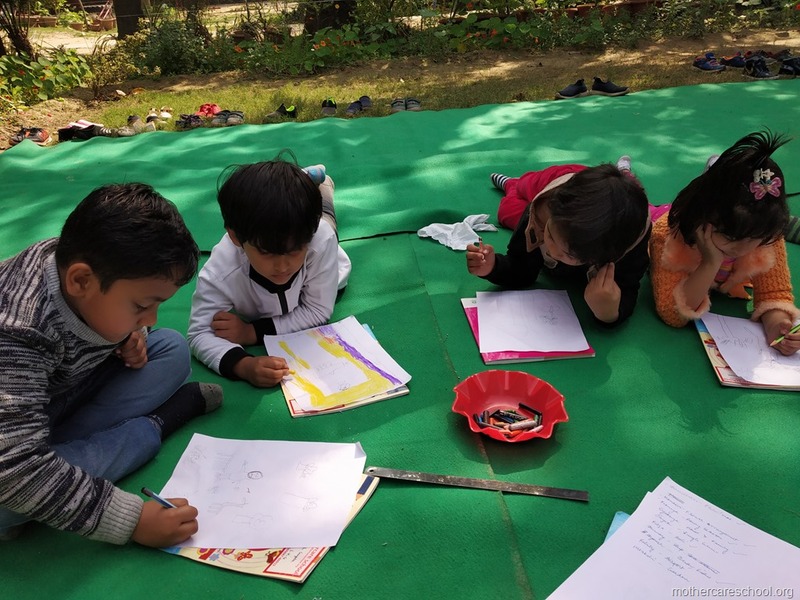 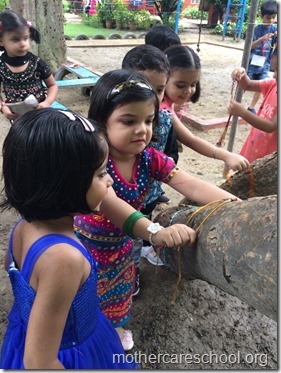 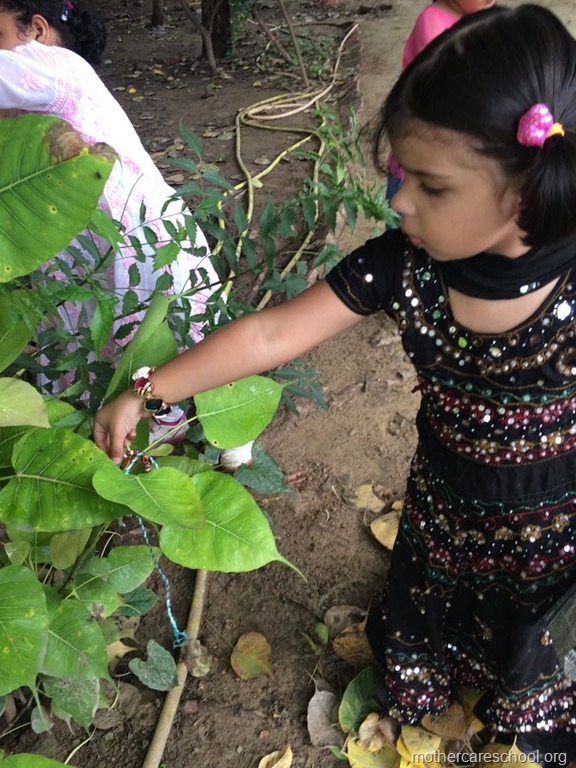 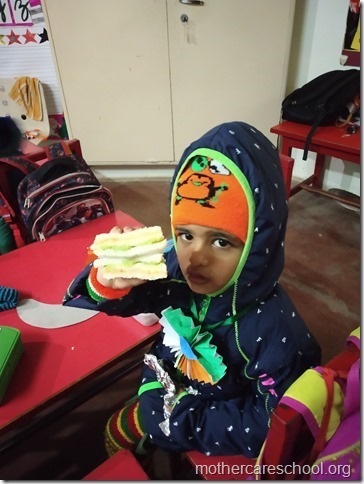 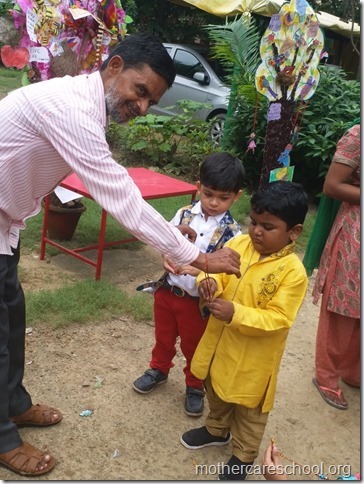 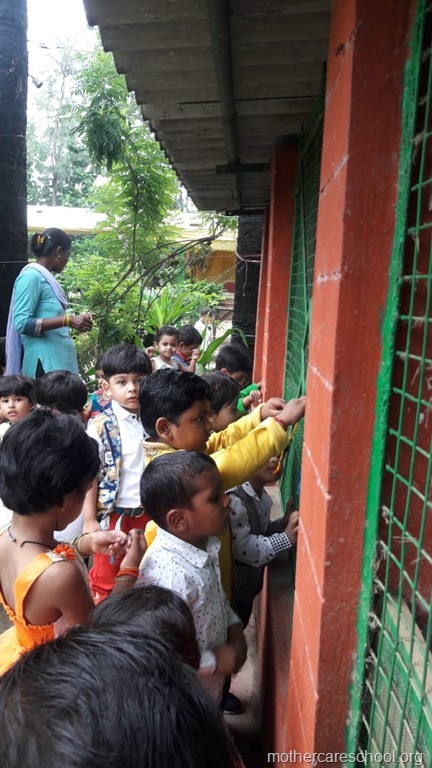 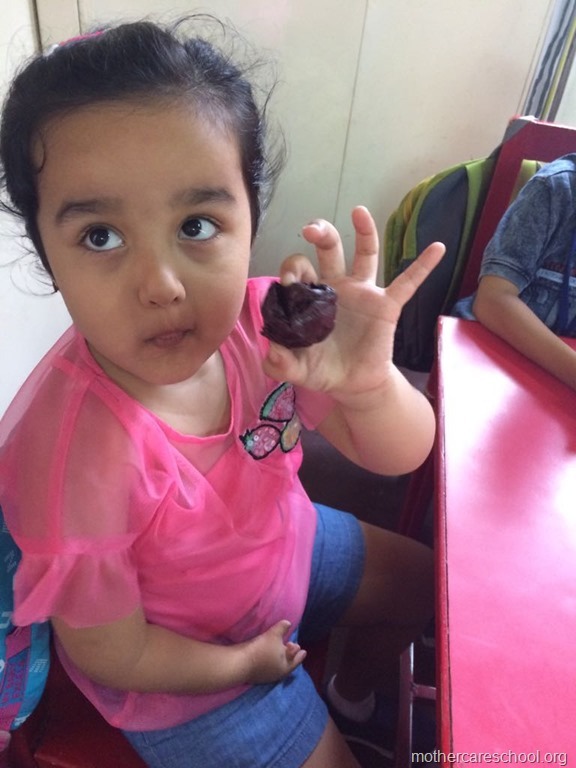 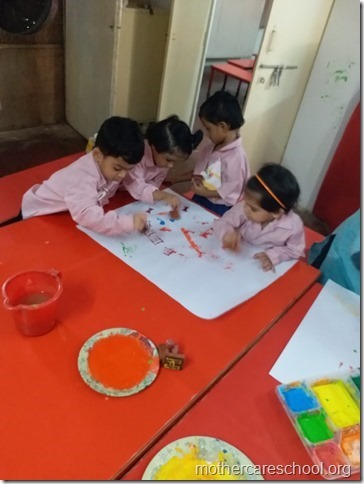 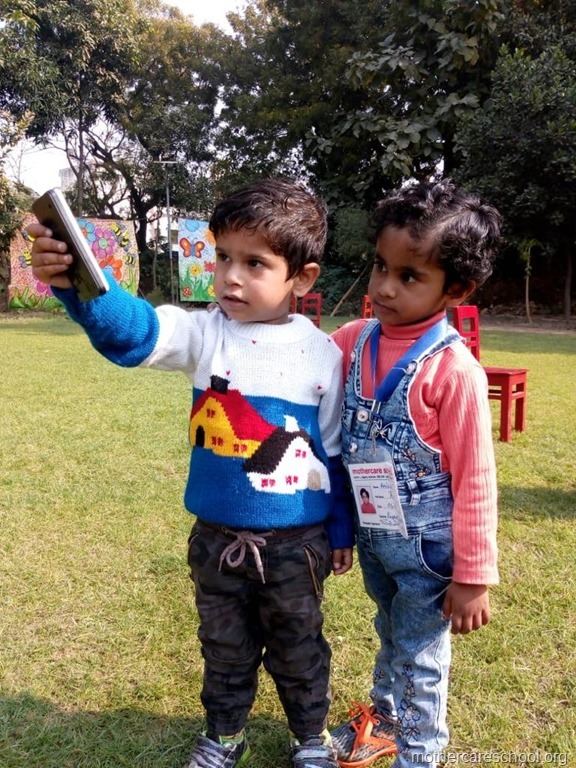 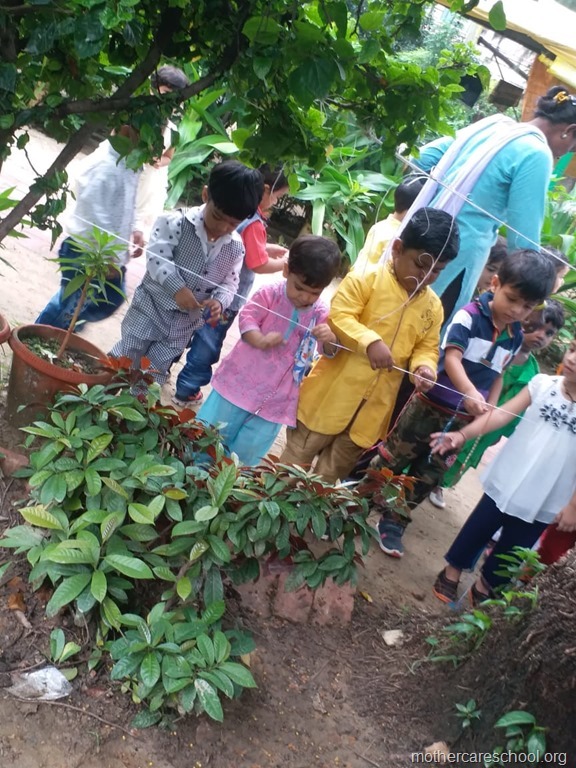 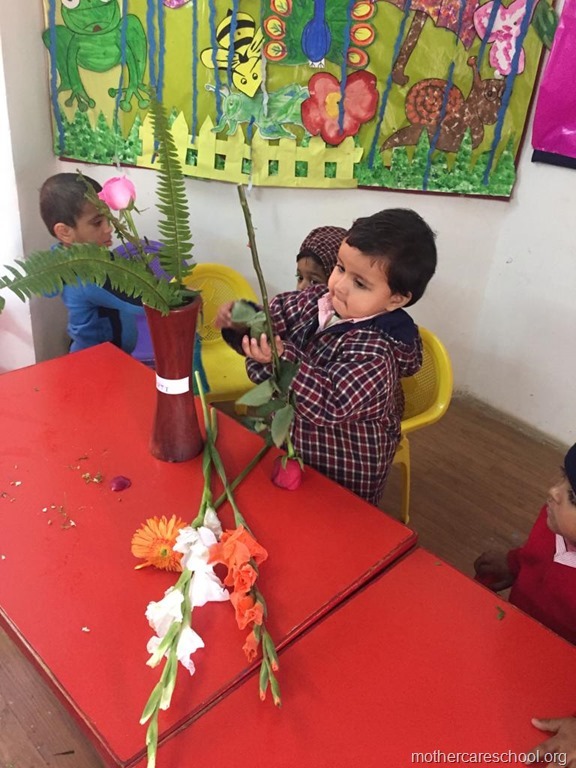 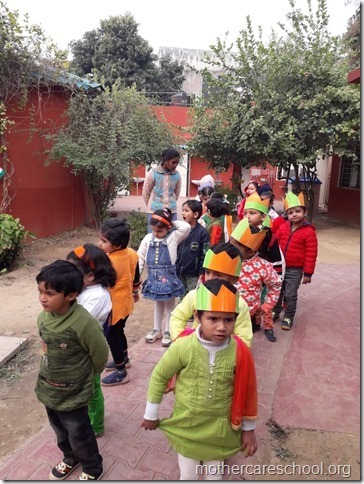 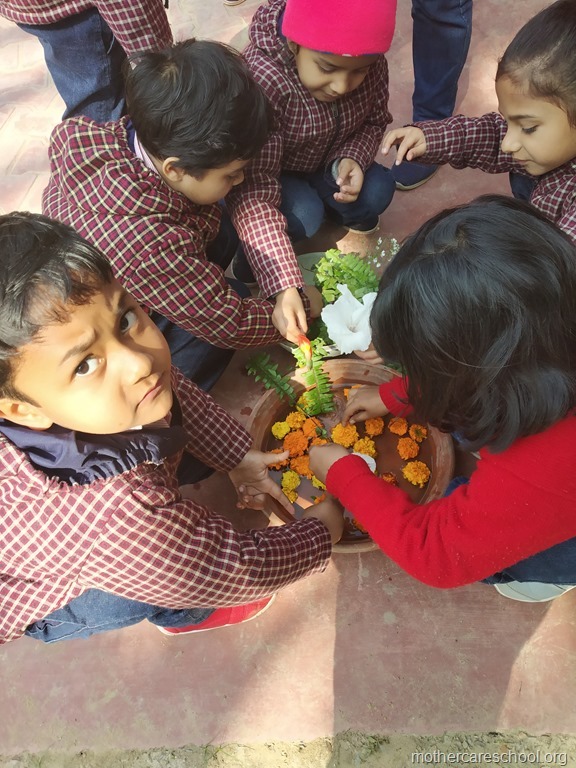 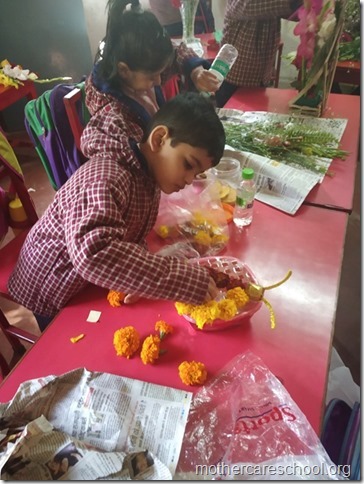 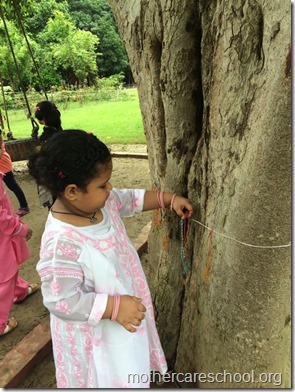 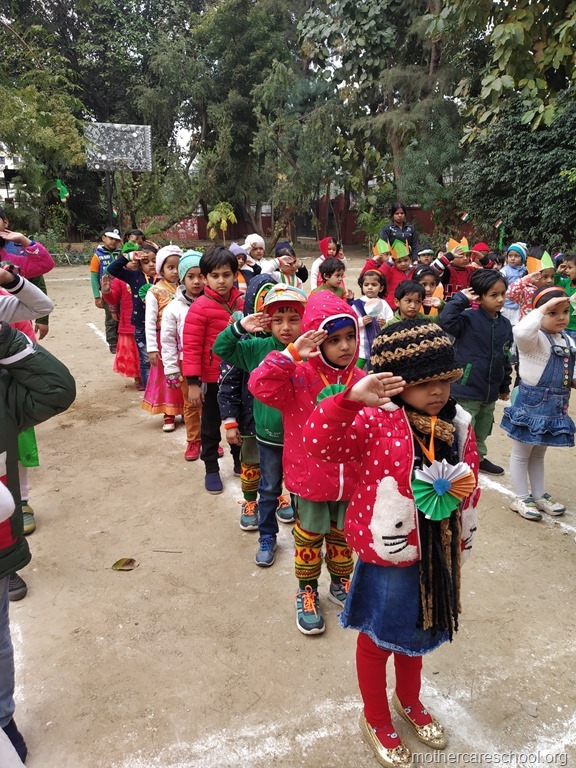 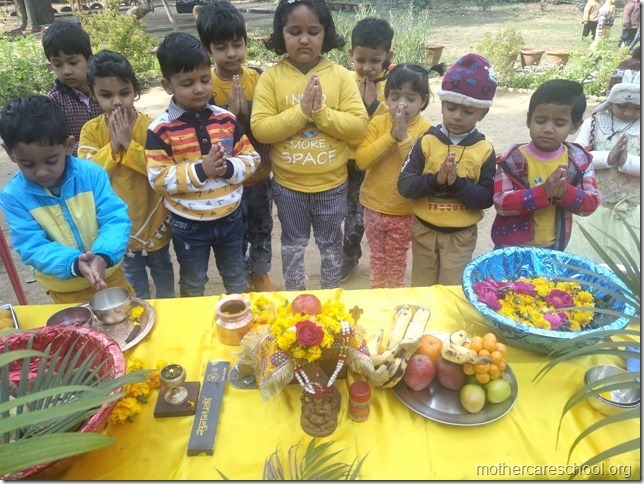 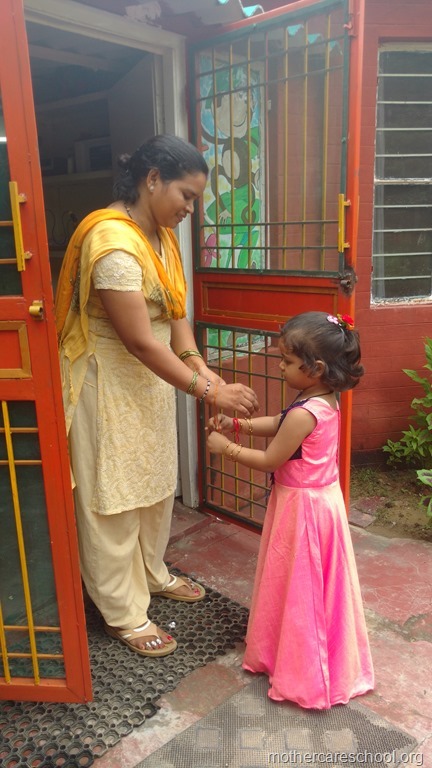 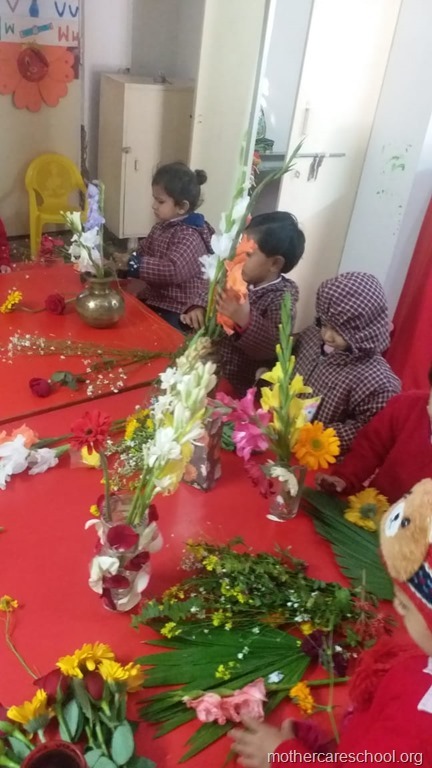 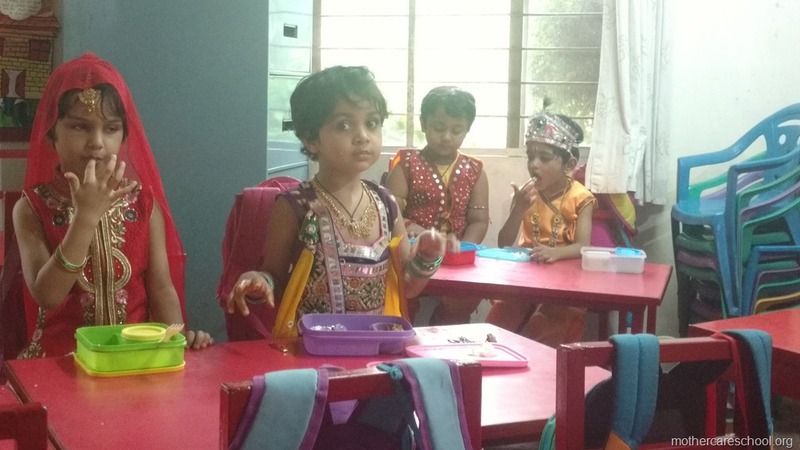 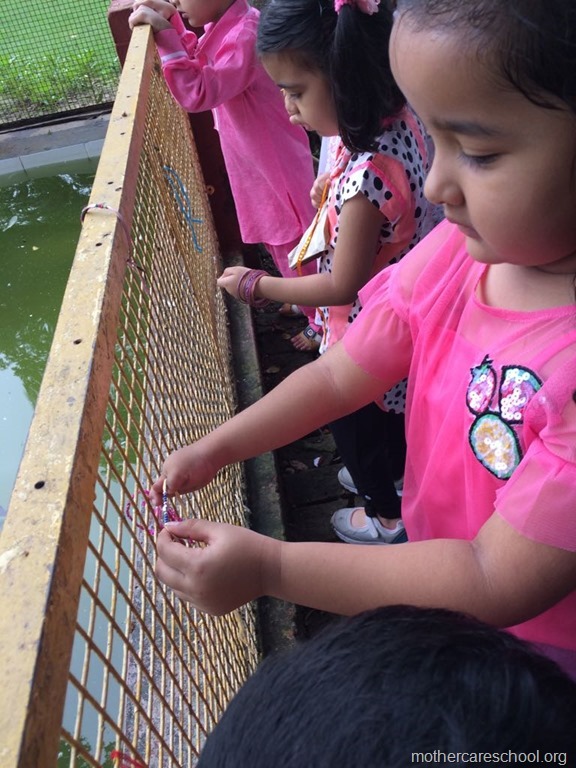 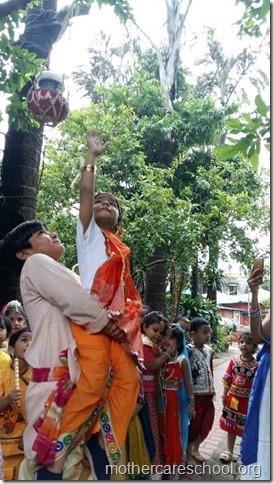 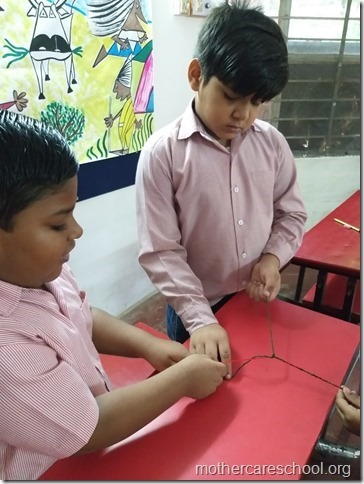 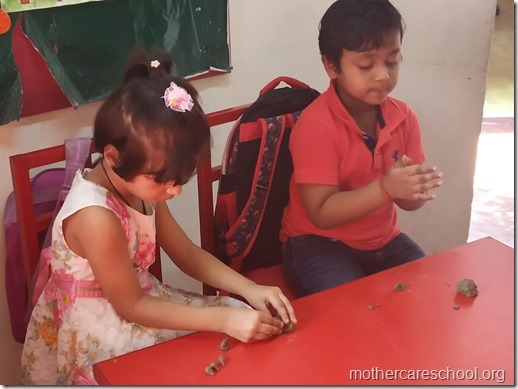 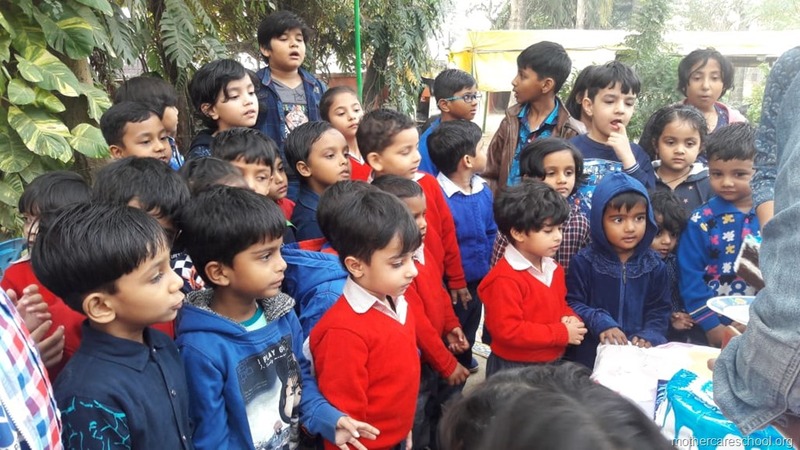 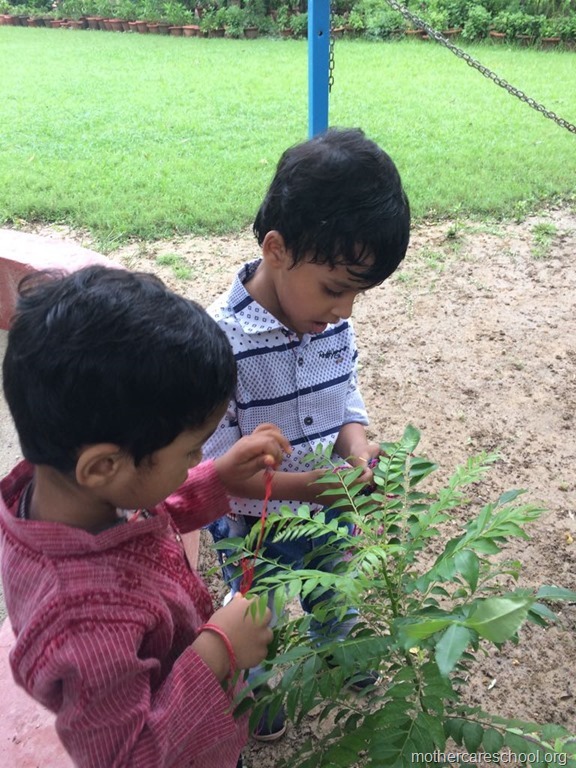 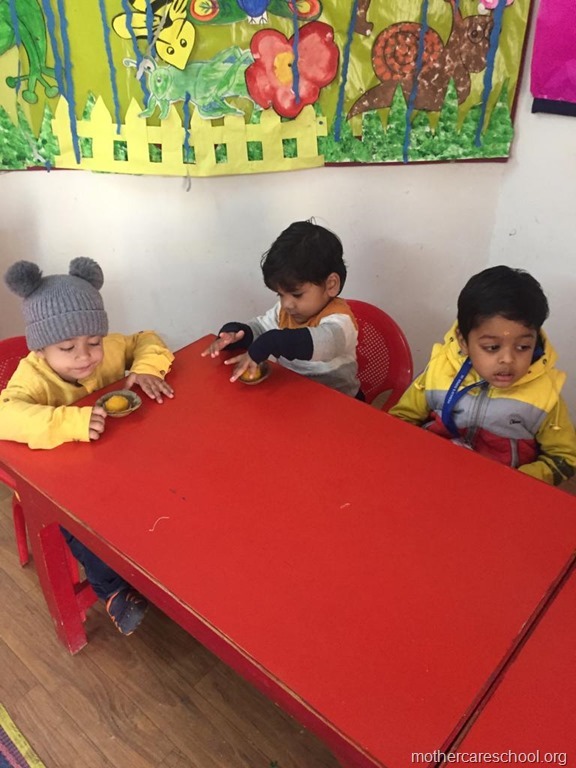 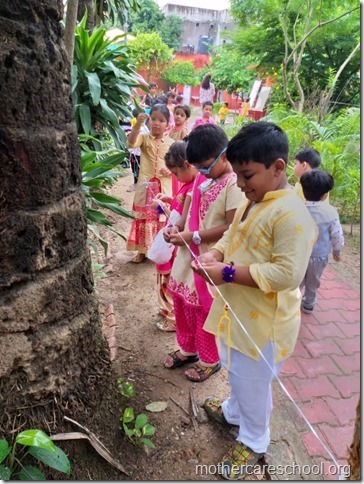 Playgroup children learning about gratitude to those who nurture and care for us like the teachers, ayahs, van bhayiyas, trees and plants and Moolchand mali bhaiya by tying rakhis. 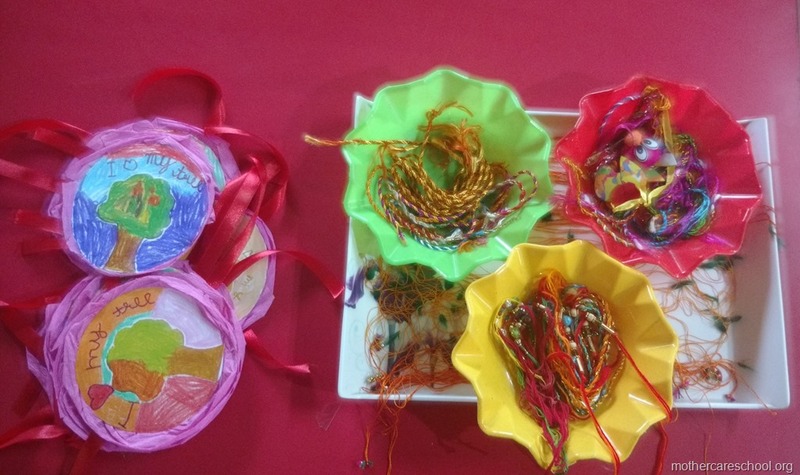 Pick and choose your favourite rakhi. 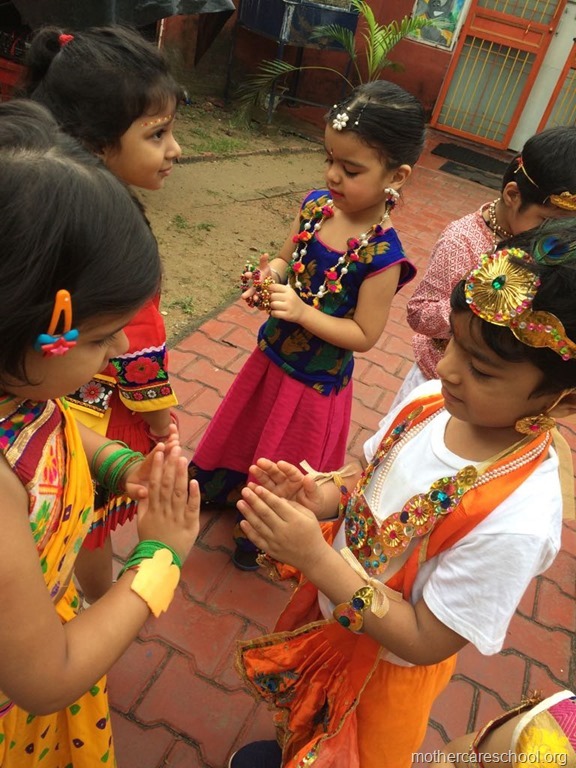 Appreciating and honouring each other. 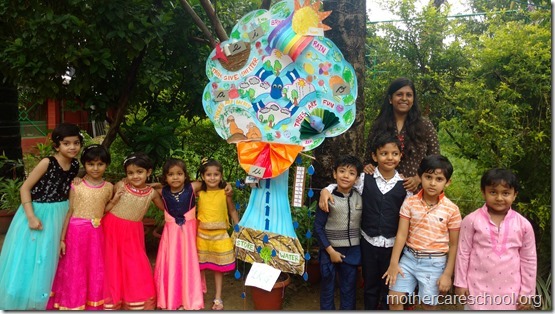 My tree made me understand the water cycle and the why what how of trees in my life. 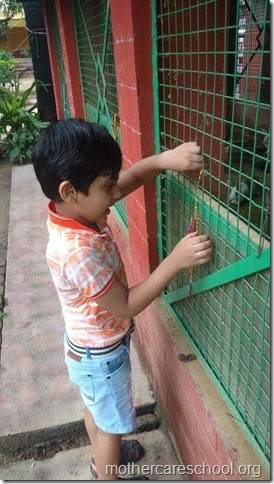 Vow to protect you bunny rabbits. 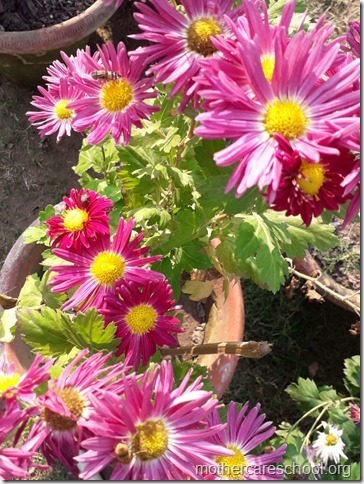 Love you too…..